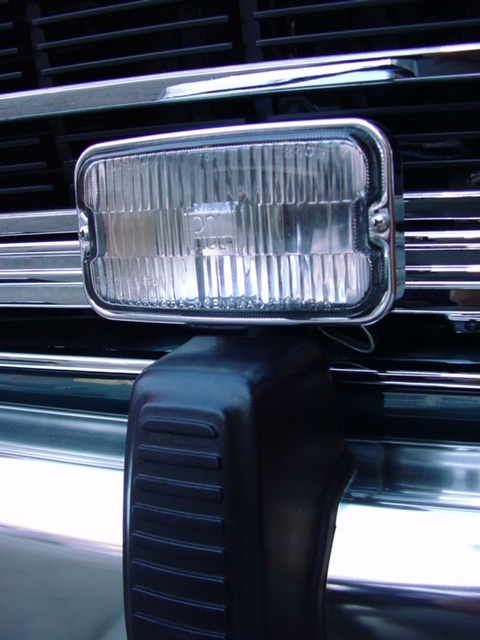 My name is Norbert and it has been my mission to produce the highest quality, full, professional, ground-up restorations of Grand Wagoneers in the world, for over 15 years. 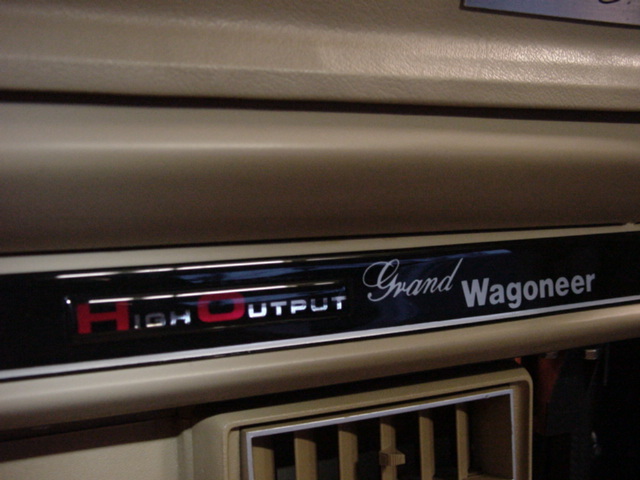 There are already plenty of Grand Wagoneer “retailers”, or used car dealers that have labeled themselves as “Grand Wagoneer specialists”, in the US, that clean up and detail 21-30 year old vehicles and call them recertified, refurbished or renewed. 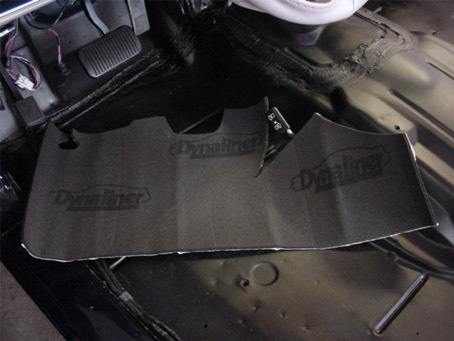 Regardless of the label that they use, all of these retailers and dealers have one thing in common….they are selling old, used cars with countless mechanical and cosmetic deficiencies that, more or less, look their age and are just fixing the obvious deficiencies and replacing some simple, inexpensive "wear" components. 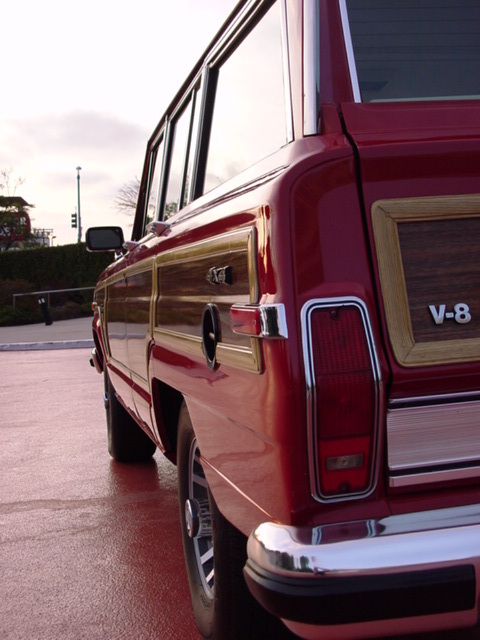 To build the best Grand Wagoneers in the world. Period. No cutting corners. No taking shortcuts. No expense or effort spared. No painstaking, difficult or unpleasant step skipped. 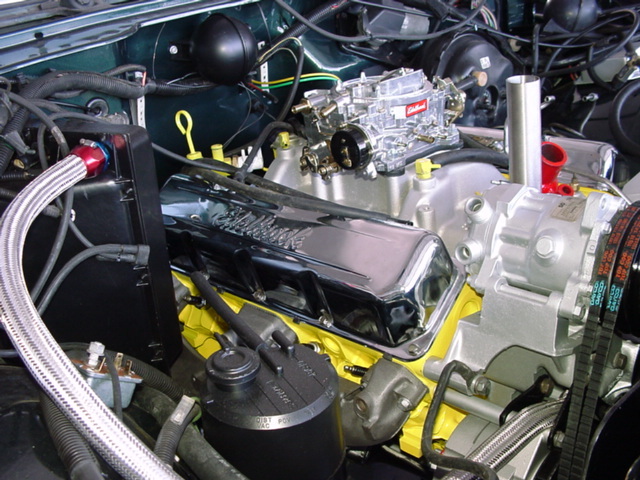 I realized 15 years ago that the only way to make vehicles that were designed over 50 years ago and built/assembled at least 21 years ago reliable, safe and perform more like a modern car, was to build only FULL, GROUND-UP, "NUT-and-BOLT" professional restorations that focus on correcting the original design flaws and modernizing the performance, safety and functionality of the Wagoneer to bring it into the modern age. The perfect marriage of Classic Aesthetics with Modern Performance & Functionality...expertly and meticulously hand-built in America. I pride myself as an obsessive perfectionist, an extremely experienced professional, and a true craftsmen engaging in a "labor of love." I constantly strive to improve my work, my cars and my service and have never felt compelled to consider "great" good enough. Therefore, you can rest assured that my current stable of Ultra Restorations is the finest I have ever produced. I always have several “woodies” of different color combinations, and in various stages of completion, available. 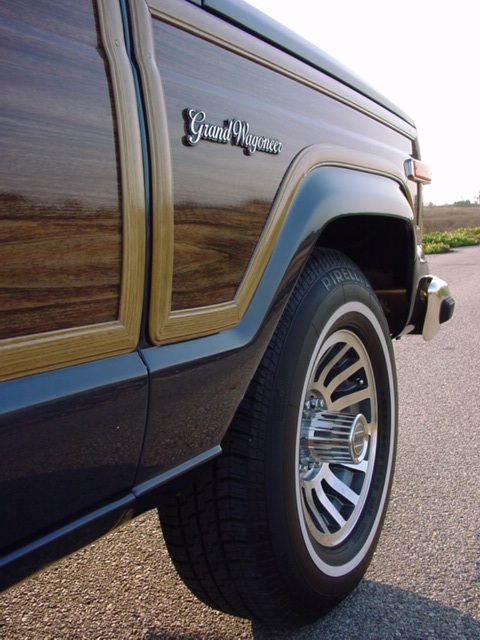 In the past four years I have focused on the 1991 model year Grand Wagoneers, due to their intrinsically higher value, scarcity, collectability, the multiple improvements over the pre ’89 model year Wagoneers, and the inherent status and pride of ownership that only a “Final Edition”, very limited production Grand Wagoneer offers. 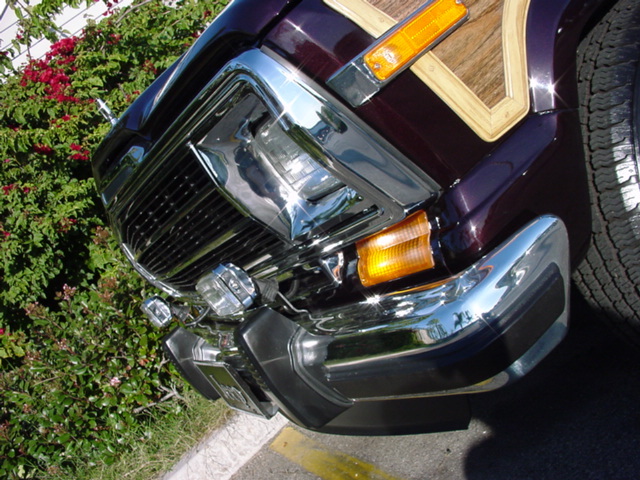 I begin each professional restoration with the finest, 100% rust free, clear-title "donor" Wagoneers available. Then, over the course of more than a year and a half, I, along with my small crew of highly experienced, hand-selected specialists, transform each of these “donor” vehicles into Grand Wagoneers that are as superior to a brand new factory Wagoneer as possible. Please understand that my small, highly specialized restoration shop is not a "volume" production shop. I am an expertly trained, highly skilled, and obsessively perfectionistic craftsman that specializes in late model (predominantly 1989-1991) Grand Wagoneers. Even though I work very long work days, seven days per week, due to the enormous amount of work performed and the quality of workmanship put into each of my vehicles, my crew and I can only produce a very limited number of Grand Wagoneers per year (usually 2-3) for highly selective clients. 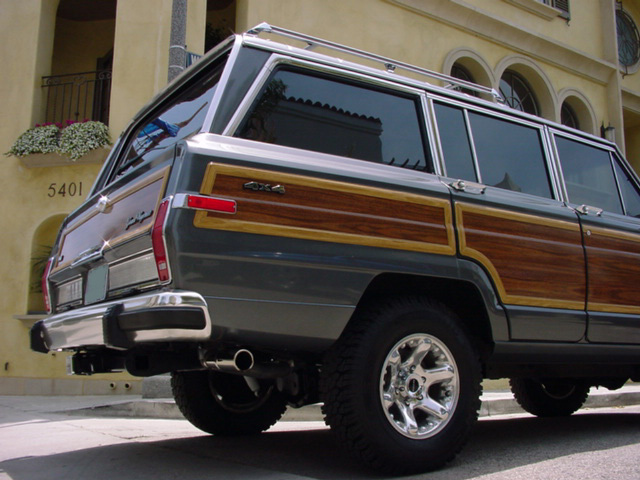 Therefore, you may have to wait a short while for your dream Wagoneer to be finished. Spending an average of 18-24 months on a full restoration (from location and purchase of a top quality donor to completion),quality, performance, durability and reliability are my sole focus. 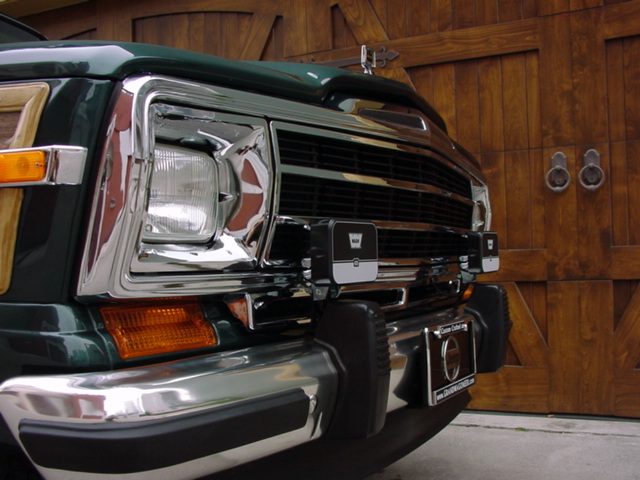 I have improved the quality of my restorations during each of my 15 years in the business, and the 1991 Jeep Grand Wagoneers that I currently have in inventory are the finest restorations that I (or likely, anyone else on earth) have ever created. My current collection of Jeeps were purpose-built to be the ULTIMATE DAILY DRIVER Grand Wagoneers. And, although some clients may simply want to place these works of art in a climate- controlled plastic bubble and preserve them for the next 30 years, these Jeeps are designed to be driven, used and enjoyed! You have heard it a thousand times before…”a picture speaks a thousand words”. 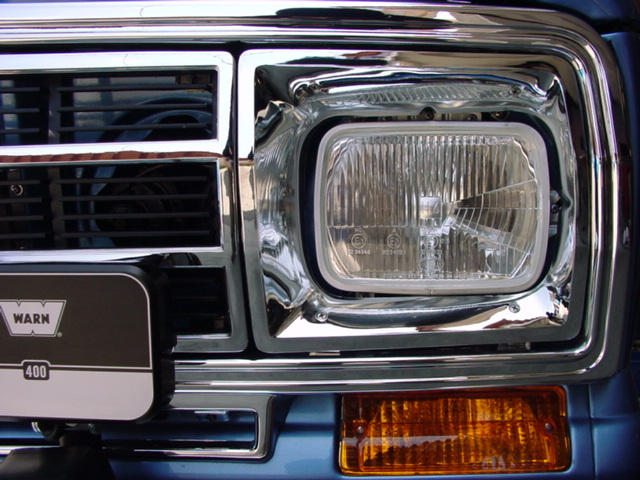 I apologize if my page takes a while to load if you have a slower internet connection, but I sincerely hope that the hundreds of detailed, close-up, high resolution photos on my site make you, as a potential Grand Wagoneer buyer and owner, more familiar with both the vehicle itself and with my work. 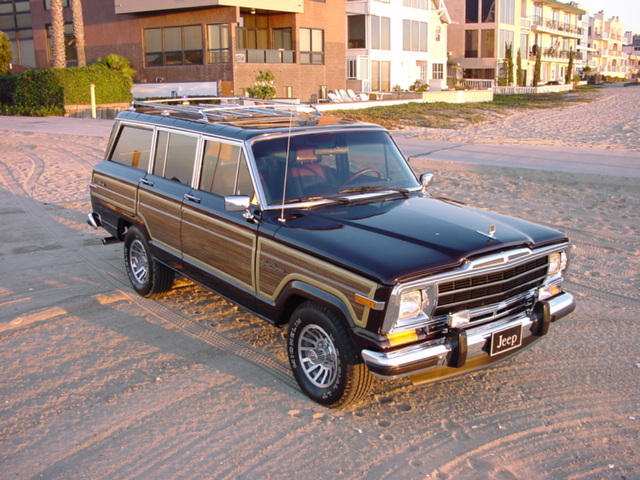 You love the LOOK of a pristine, perfect, brand new Grand Wagoneer and consider it to be one of the most beautiful and classy vehicles ever to grace the streets. Maybe it reminds you of the best things in America, and of the golden age of America’s past. 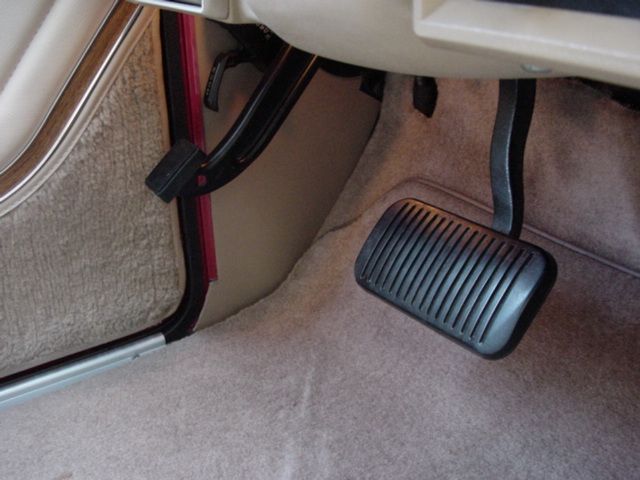 It may also bring back fond memories that transport you to a happier, simpler, more innocent time in your life every time you open the door and get behind the wheel. 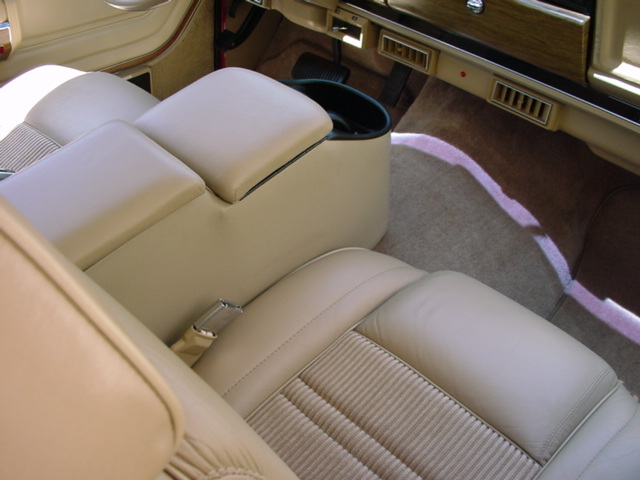 Maybe the unique driving position, the feel of the buttery soft leather steering wheel in your hand, the smell of the new interior and the lounger-like comfort of the seat and center armrest make you feel calm and immune to the hectic stresses of the outside world. You feel tranquil and at peace… even the madness of modern traffic and endless congestion cannot break the magical spell of the very special automobile you are so proud to call your own. The tactile experience and feelings these gorgeous automobiles provide are simply heaven. Now, to the bad part. Grand Wagoneers haven’t been produced for 21 years and the few that remain on America’s roads are either permanently scarred by rust, are abused and used up, look tattered and worn and have lost all but a shadow of their former glory. 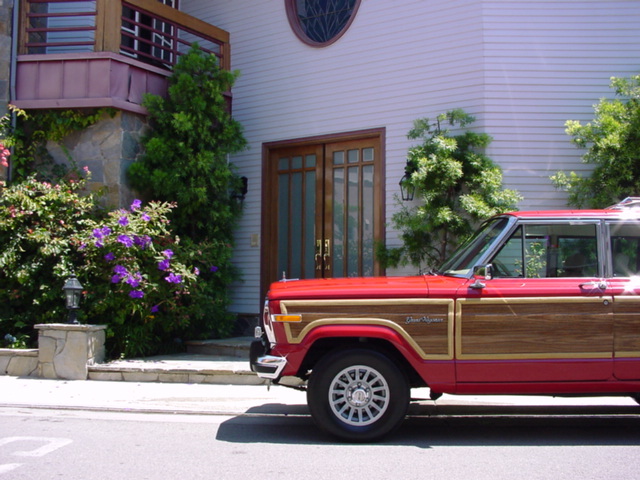 On top of that sad reality comes the fact that although, when new, the styling was heart-stoppingly beautiful, oozed class, was completely unique and distinctive, and is timeless in its elegance, the original factory Grand Wagoneer was woefully underpowered and under-equipped. 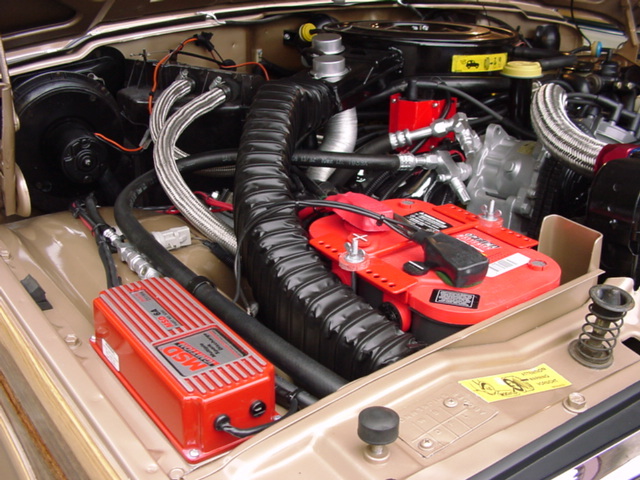 From the factory, even the newest and most modern 1989-1991 model year Wagoneers had huge 5.9 liter (360 cubic inch) displacement motors that only produced a paltry 140 horsepower and 273 foot pounds of torque. Talk about inefficiency! The suspensions were too soft with lots of body roll and unpleasant weight transfer that never gave the driver the confidence or ability to drive in a spirited, fun fashion. 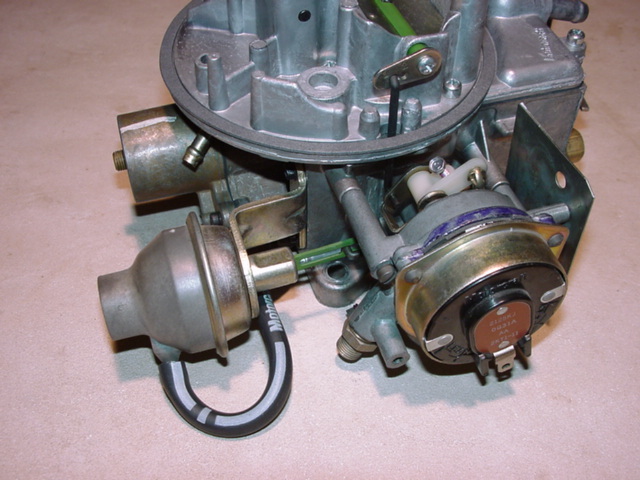 Brakes were also underperformers, not to mention the use of inefficient, dirty carburetion as the fuel delivery system. 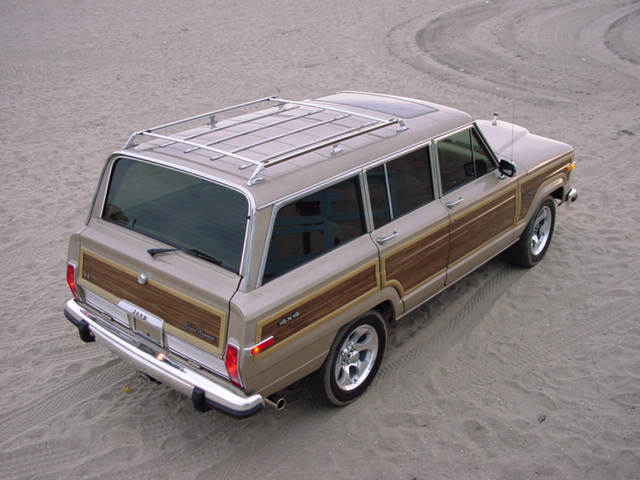 In addition, the original factory Grand Wagoneer, although quite “loaded” in its day, lacks many of the modern amenities that we take for granted, and really WANT, today. Well, you can now forget about those concerns! 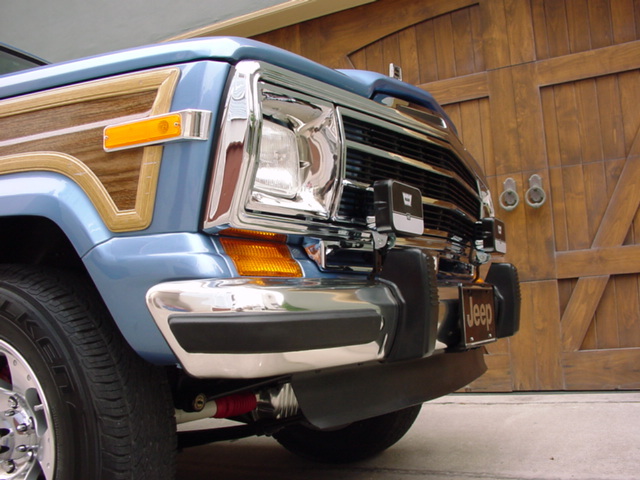 For those of you who have been looking for that perfect Grand Wagoneer, that not only looks SHOWROOM-NEW, but drives and performs significantly better than it did the day it rolled off of the assembly line, and is loaded with all of the modern bells and whistles you just cannot live without....your search is over. Offering vast improvements in performance, my full, frame-up Ultra Restorations will provide you with a distinctive, classy, and stunningly beautiful Grand Wagoneer that can “Stop on a Dime”, handles more like a sports coupe than an SUV, and, depending on the motor options you choose, has the ability to out-accelerate and out-pull all but the most powerful 2012 model year SUV’s!! 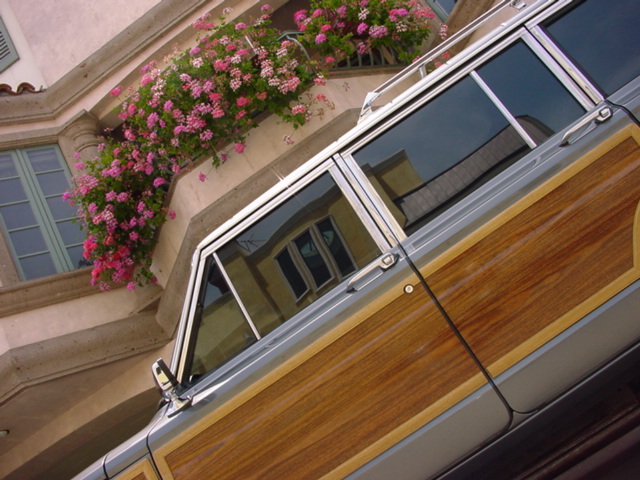 Furthermore, since the Grand Wagoneers I produce are Full, Frame-Up, "nut & bolt" RESTORATIONS where every mechanical component is replaced, upgraded, professionally rebuilt, adjusted, serviced and otherwise addressed, you don’t have to worry if your “woody” will make it to the movies or ball game and back without breaking down. I understand the pain that folks feel when they have a vehicle that they love, are attached to and want to keep, but they are constantly afraid that it could leave their family, children and even pets stranded at the side of the freeway at any time. Owning a classic, collectible vehicle is very rewarding....but not when it is in the mechanic's shop more than in your own garage! 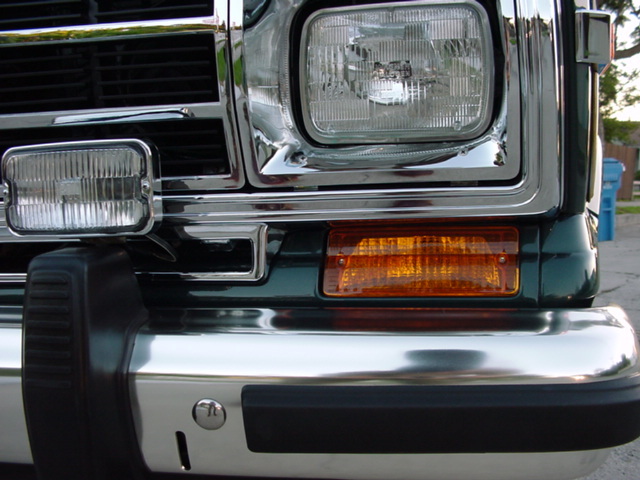 With my restorations, you will feel safe and know that your new Wagoneer is up to any task you throw at it and will take care of you as well as you take care of it. No more constant reliability concerns. And, you don’t have to give up all of the modern amenities and “goodies” that you have learned to love: ultra-high fidelity sound systems; touch screen navigation; full in-vehicle entertainment; full IPOD integration; Bluetooth connectivity; Color Rear View Camera for safe reversing; tire pressure and temperature monitoring systems; wireless Steering Wheel Remote; heated seats made of the finest imported Italian leather; modern HID headlights; modern super-bright reverse light visibility; keyless entry; dome light supervision; remote window operation; and even Remote Engine Start capability! You no longer have to give up the comfort, luxury and enjoyment of modern technology to be able to drive one of the most desirable, most beautiful vehicles ever made….even if it was last produced 21 years ago. 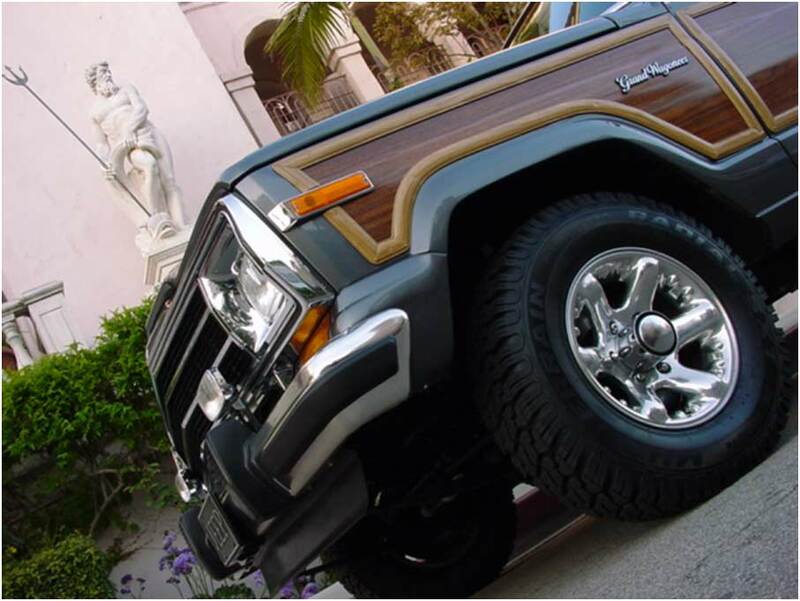 When driving your new, top-of-the-line GRANDWAGONEER.COM Wagoneer, you will find yourself surrounded by the sensations and smells of the finest quality materials, and the luxury of the most modern upgrades and amenities. More significantly, in this modern era of computer designed, robotically assembled, mass-produced cars, you will feel the pride of knowing that your beautiful restoration is something truly unique, a one-of-a-kind HAND MADE rolling work of art that has no equal. Anyone with $100-250k at their disposal can go out and purchase any of the high-end European luxury sedans, the Italian, German and US supercars, or the luxury performance SUVs that litter the automotive landscape today. Those vehicles, although very expensive, offer no real exclusivity other than the price. Anyone can buy one and there are plenty available (and the manufacturer can always make more). Even when there are “limited editions” many hundreds or thousands of each specific model are made in any given year. On top of that, the ostentatious nature and public image of such vehicles can expose you to as much ridicule and scorn, as admiration! Especially in today’s social and economic climate. The exact opposite is true of a fully restored, ultra-high quality, heavily upgraded and modernized 1991 Grand Wagoneer. 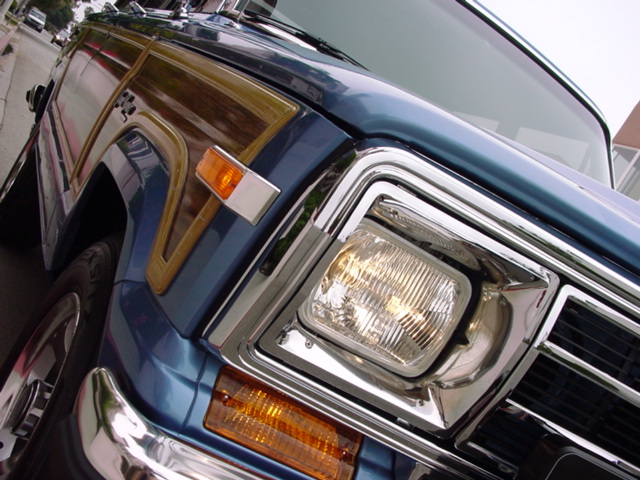 There have only been around two dozen Grand Wagoneers produced by my shop in the last decade, and only about 10 of those have been 1991 model years. Furthermore, there is no comparison between the full restorations that I completed 3-4 years ago and those that I am currently working on today. 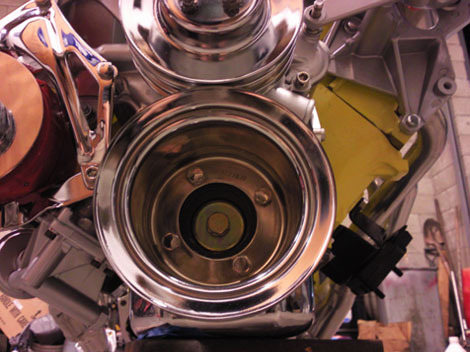 Every generation of restorations that I produce has seen significant enhancements, additional refinement, further upgrades and constantly improving materials and parts. The Jeeps I am currently completing are, by far, the finest that I, or very likely anyone else, have ever built. 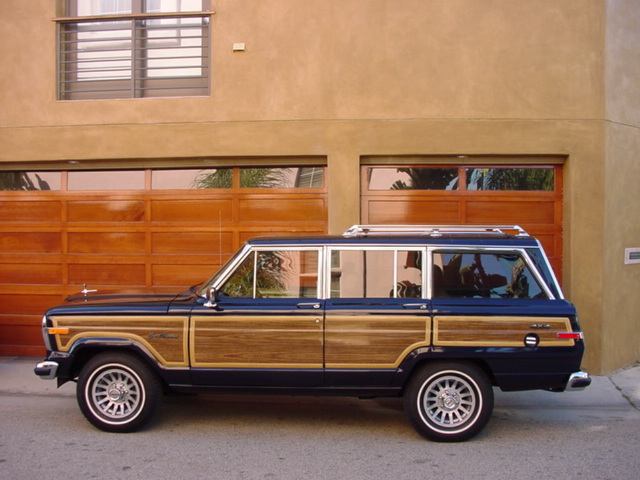 In addition, due to a dramatic disappearance of quality “donors” in the past four years (largely due to the deleterious and wasteful "cash for clunkers" tax-incentive program), along with the inherent scarcity of completely rust free, high quality 1991 model year Grand Wagoneers that also still have outstanding wood borders, these Jeeps become more rare, valuable and exclusive with every passing year. 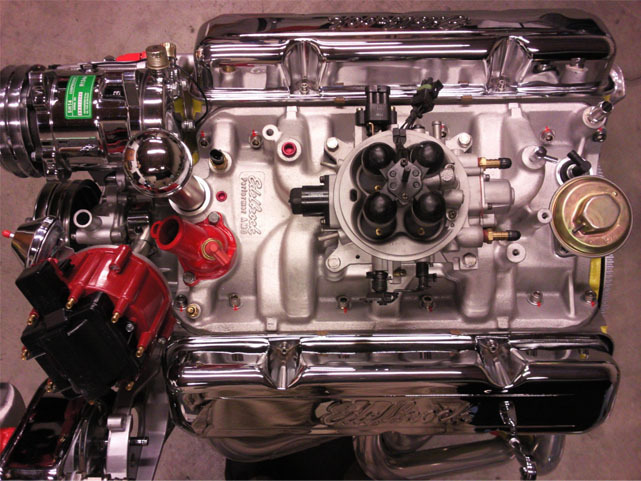 As an owner of one of these last full restorations, you will be a member of one of the most exclusive “automotive clubs” in the world…one of only a dozen or so people on earth that proudly own something that can never again be fully reproduced. And, unlike the derision often faced by owners of vehicles that fall into the “ostentatious display of wealth” category, you will be greeted with smiling faces, approving nods, and thumbs-up wherever you go. 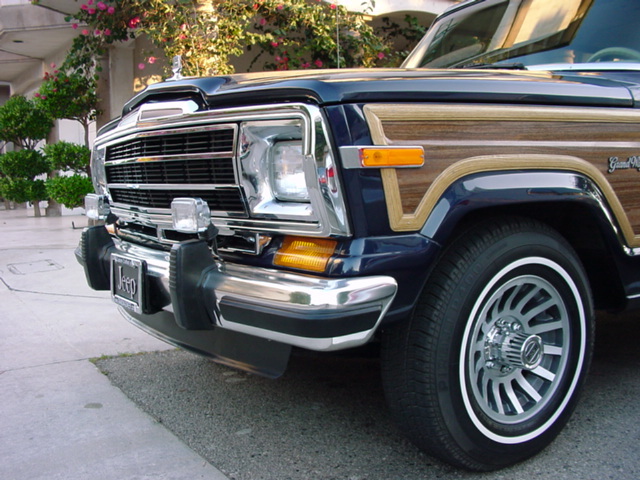 So many people in the US have fond memories of Grand Wagoneers and they are almost universally seen as a symbol of the “golden age” of the United States….something that we all long for today. 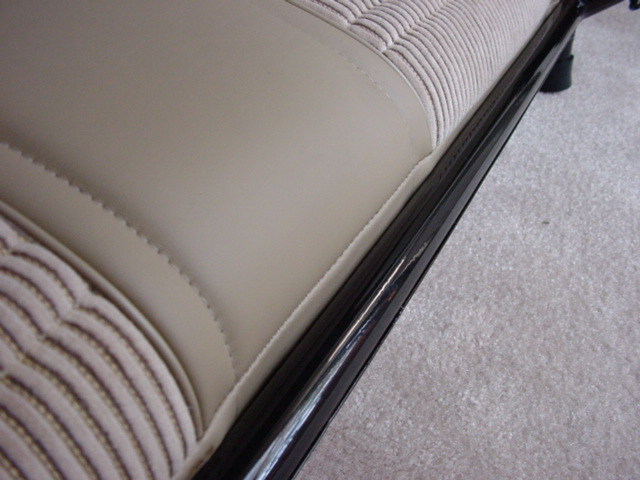 A hand crafted, ultra high quality, full Ultra Restoration is the ultimate in UNDERSTATED LUXURY and TRUE EXCLUSIVITY. 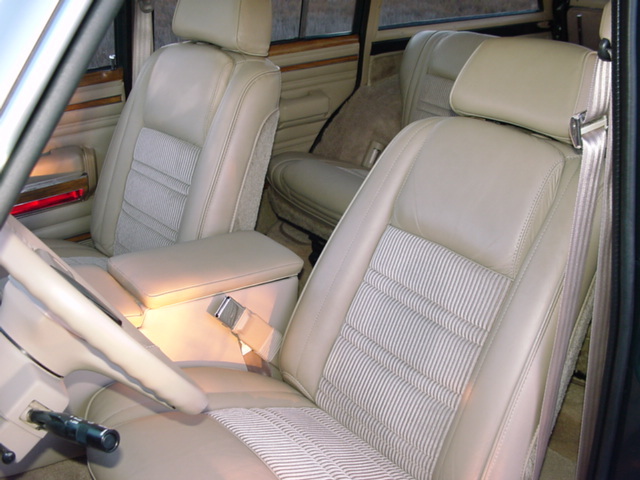 The 1991 model year was the final production run of the Grand Wagoneer. During this last partial production year (assembly line production of the Grand Wagoneer stopped around mid-year in 1991), only 1560 vehicles were produced. 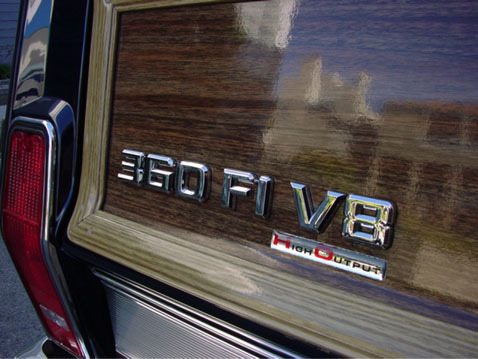 Compare that to an average annual production of around 17,500 Grand Wagoneers (FSJ) during the previous 15 years. 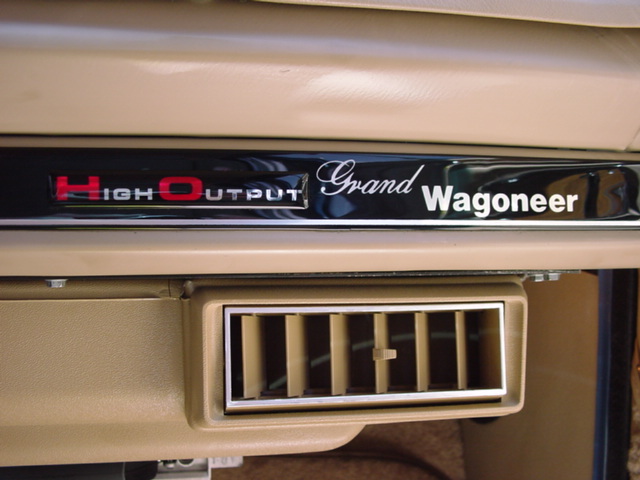 Put in another way, there were less than 1/10th (or a bit under 9%) of the Grand Wagoneers made in 1991 as were produced, on average, during the 15 preceding years. Therefore, in terms of production numbers alone, the '91 models are the most collectible and valuable woodies. 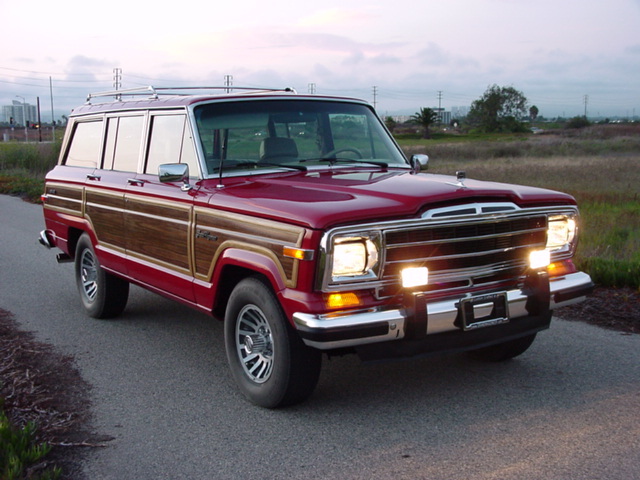 The 1991 Grand Wagoneers currently in my inventory have been meticulously cared for prior to my acquisition, and they all have clear titles and clean CarFax or Autocheck Reports. 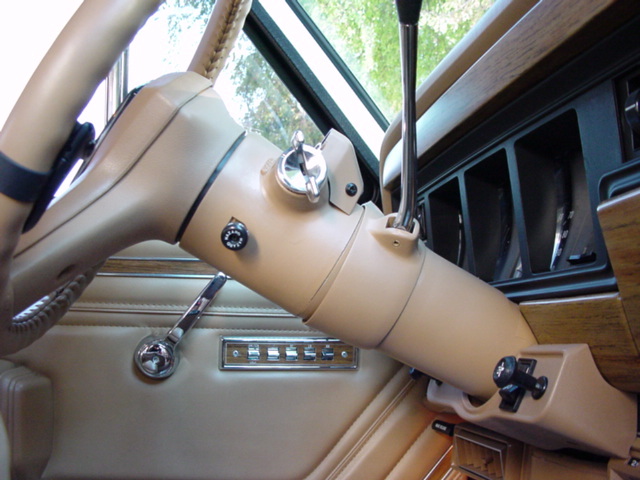 These timeless classic have all of the features and upgrades that were available to the Jeep customer in the 1989-1991 model years, including the upgraded Sanden air conditioning system, the trademark rear wiper assembly, the overhead console featuring outside temperature, compass, sunglass holder, garage door opener holder, the superior quality, better looking late-model wood trim borders, etc. (a complete list follows in the text below). All of these added features provide you with the perfect combination of the beautiful, classic Grand Wagoneer styling that you love with the added modern high tech conveniences and extra performance that make life just a little sweeter. And, with the additional power, vastly improved handling, better braking and firmer steering your daily commute can transform into a fun, exciting and memorable experience! 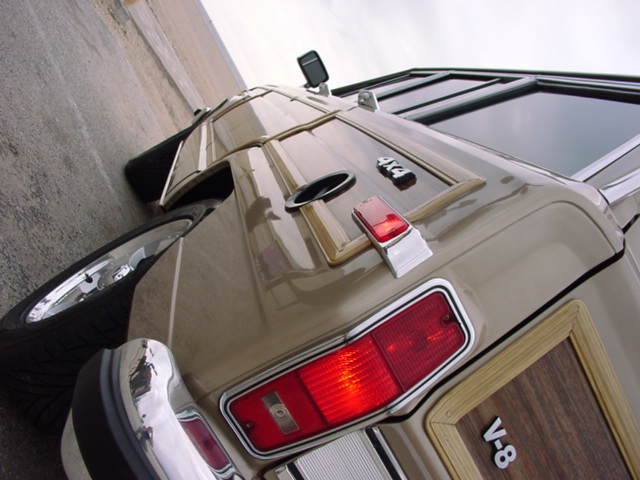 These Grand Wagoneers are NOT typical "USED" or “refurbished” Wagoneers! They were not only well maintained throughout their life spans by their previous owners, but they have just undergone a complete 18 to 24 MONTH RESTORATION which has effectively transformed them to Jeeps that are in much better than "factory new" cosmetic and mechanical condition. 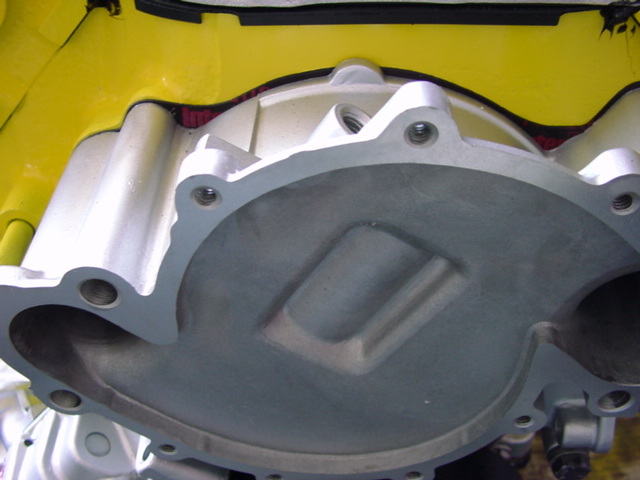 Every major mechanical component is new, has been professionally rebuilt, and has been adjusted, serviced and resealed. 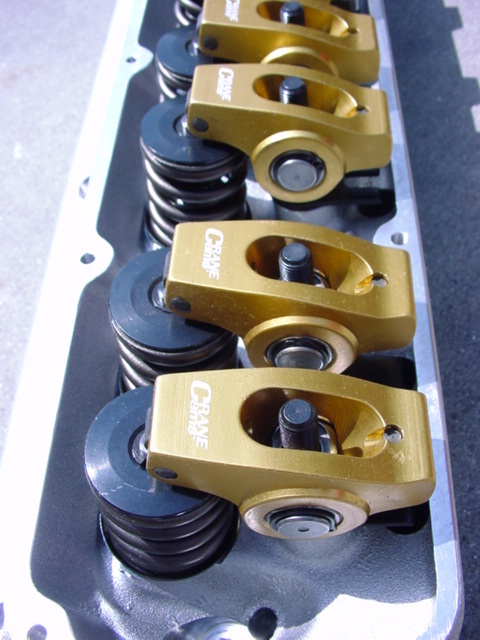 Only the highest quality components are used and countless mechanical systems are upgraded in terms of performance and durability. 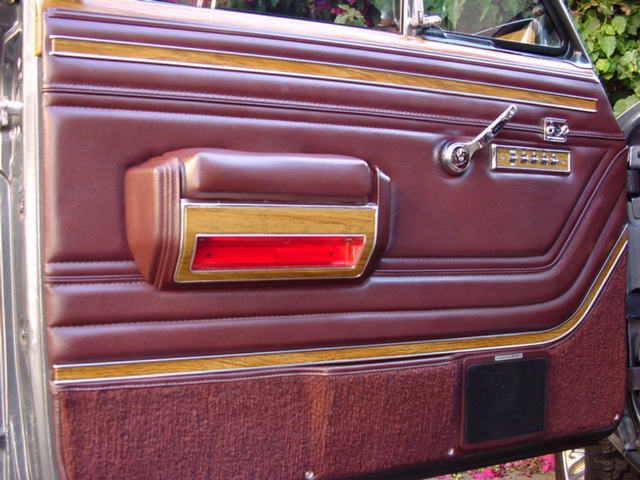 Every square inch of their exteriors is new or professionally restored. 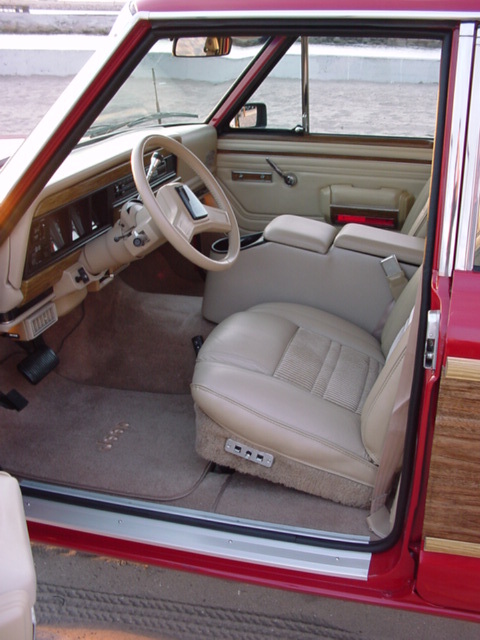 And, the interiors are absolutely stunning (all components either professionally restored or brand new using OEM or better quality materials). In fact, there is not an inch of the exterior or interior of our wagons that has not been expertly restored (not just detailed or “renewed”)! As I just mentioned, prior to receiving my full, professional ground-up restoration, all of these vehicles were already well maintained and in very nice original condition. Any of them could have been sold by one of the high-end retailers/used car dealers on the web after just a thorough detail job and 1 or 2 week’s worth of work in replacement of some mechanical "wear" components (tires, shocks, brakes, etc). But my business model is not to be a volume dealer who counts on quick turnover to make a fast profit. I do the same ultra high-end, super extensive, expertly performed full restorations on every Jeep that comes through my doors. I don't just replace what is necessary at this moment, or what is obviously deficient right now. 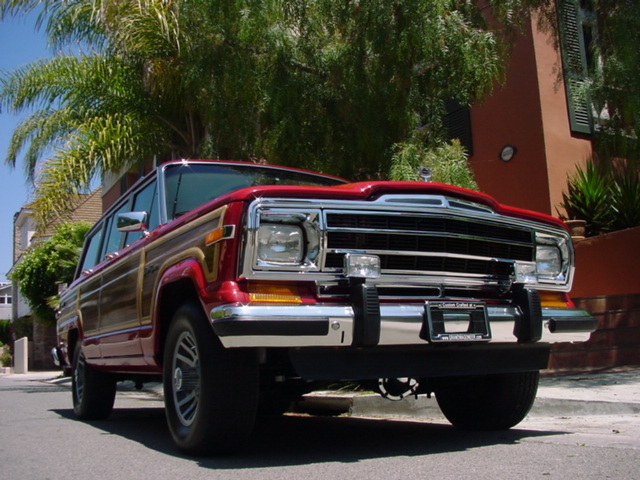 Every Grand Wagoneer in existence is at least 21 years old, and I believe that all of the work that I do will become necessary at some point in the near future in order for my clients to be able to continue to use their wonderful Grand Wagoneers as daily drivers and in order to keep them trouble-free, dependable and safe. My mission is to produce TRUE and COMPLETE, ultra-high quality, professional restorations that culminate in a woody that is, in countless ways, superior to a factory new Grand Wagoneer. I am absolutely uncompromising in my selection criteria when purchasing the "donor" Jeeps that I hand-pick to perform a restoration on. 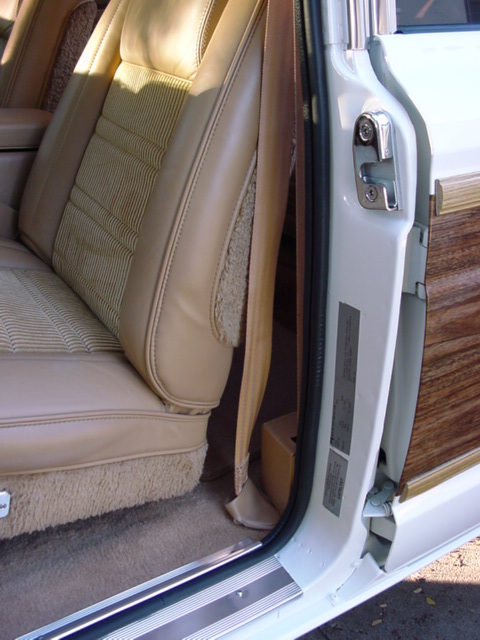 My screening process is extremely rigorous and I only purchase woodies that are 100% rust free, have excellent woodgrain border trim (the only part of the vehicle that I cannot replace and must painstakingly restore), are free of compromising frame damage, have clean titles, and have been properly maintained since new. Many of them are one or two owner vehicles with full records and very low original miles. And, as you already know, they are all from the superior, late model, most evolved 1989-1991 model years. I believe in starting with the best possible Jeep and then transforming it into a better vehicle than the factory was ever able to produce. When spending over a year and a half of labor time (average 20 months) and expending an enormous amount of effort, resources and money on a full, professional restoration at this quality level, it does not make sense to attempt to save 4-6 thousand dollars only to end up with a sub-par or less than ideal donor. 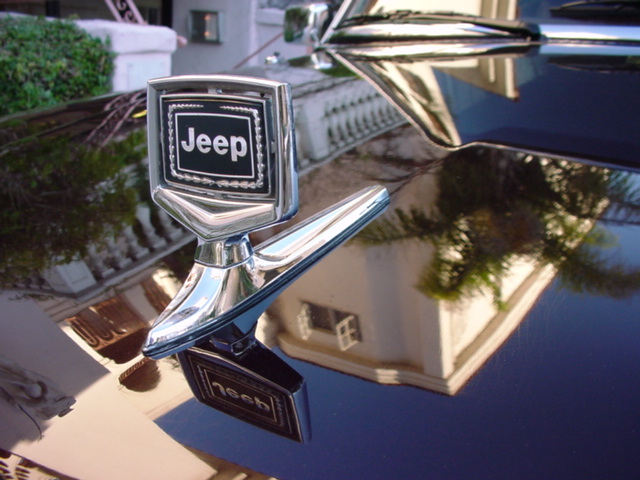 The quality of the Jeep you start with will always be reflected in the quality of the finished, fully restored product. As already mentioned, these Jeeps all received a TRUE ground-up restoration. 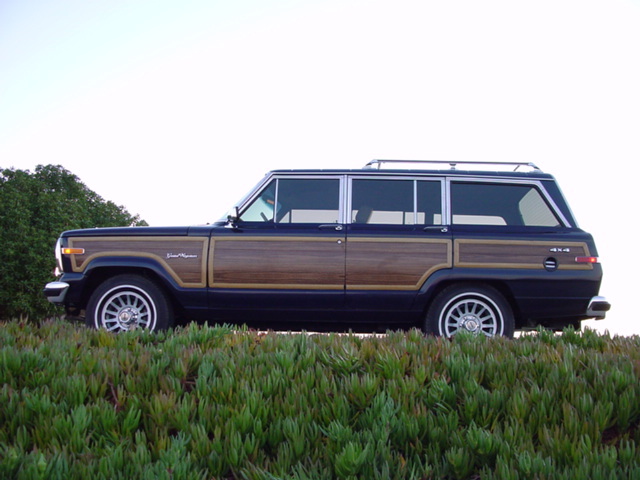 Although there are several retailers of Grand Wagoneers on the web, none that I have ever seen or heard of does a complete restoration, and certainly nothing even remotely close to my quality standards. 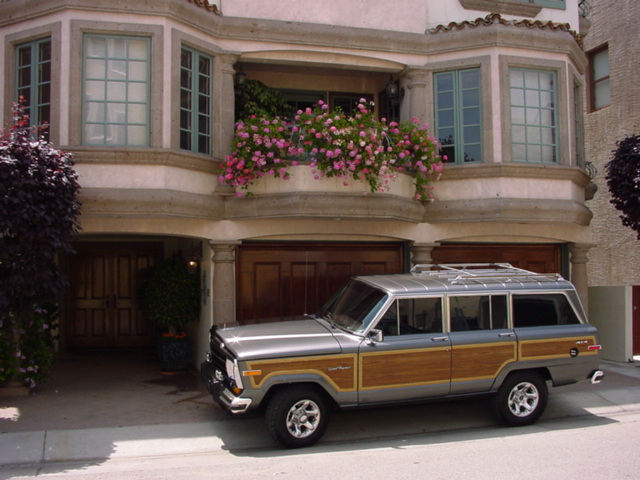 The restoration of my Jeeps included everything that was necessary to make them look the way they did when they were new and just manufactured, and, to drive, perform and handle better than any new Grand Wagoneer ever did. None of the small but unbelievably time consuming and expensive details necessary to achieve this goal are overlooked. 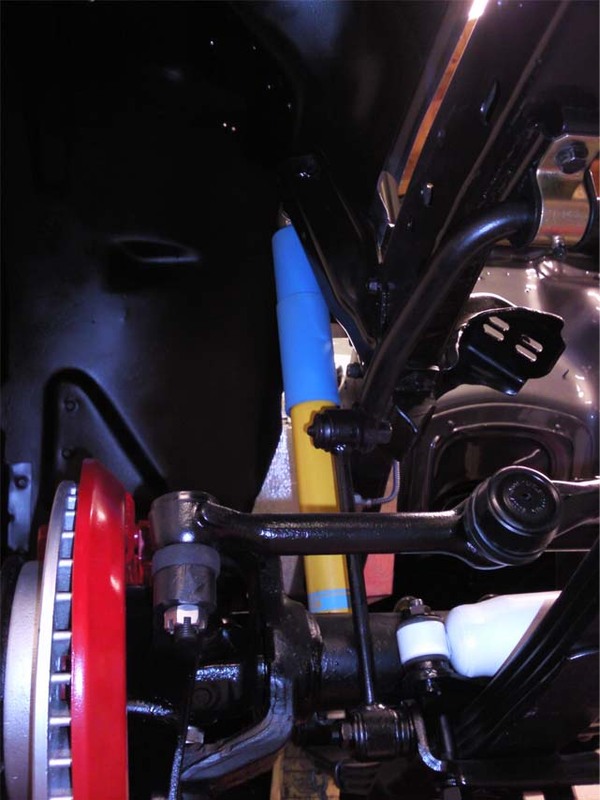 A description of the work that is completed on my Jeeps is provided in the following text and pictures. The restoration of these beautiful woodies was a labor of true love, and I sincerely hope that they will make their new owners as happy to own and drive them as it made me to have the privilege of restoring them. When you take delivery of your brand new, full, frame-up restoration, every inch of the exterior will be flawless. 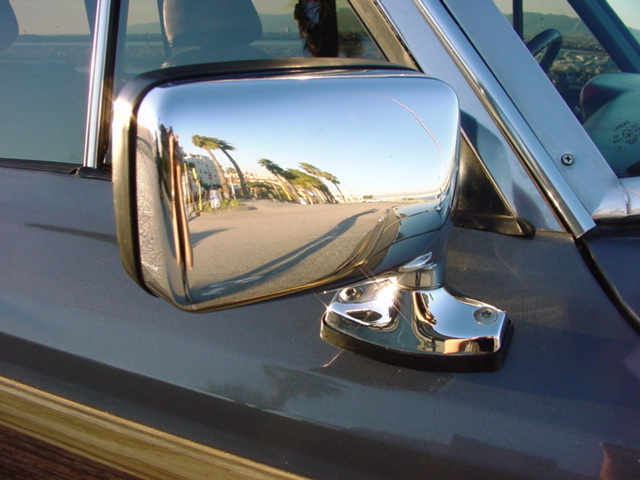 The body is completely straight and dent-less and without dings, scratches or occlusions. There is absolutely no rust. 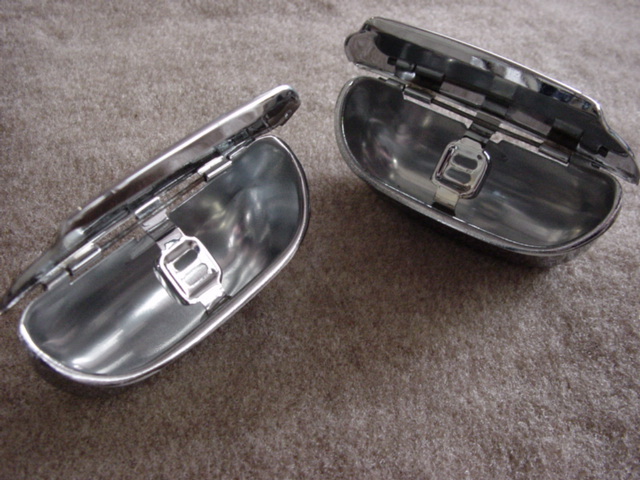 The chrome and stainless steel is straight, clear and shiny. The paint is liquid-like in its luster and reflectivity (the digital photos don't do it justice). The anodized aluminum is stunning. 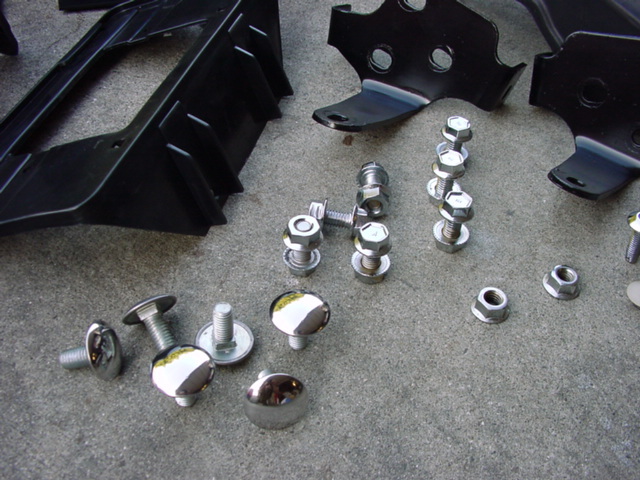 In addition, almost all of the trim components, the multi-part grill assembly, the emblems, the seals, the weather-stripping, wiper components, bumpers, turn signal assemblies, side marker lenses and bases, bumper impact strips, hood ornaments, key switch, wheels, etc. are all new. 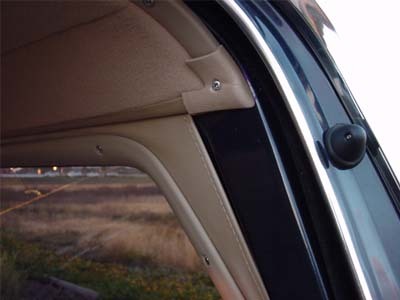 It is important to note that many of the exterior, body and trim components necessary to perform a full restoration are no longer available anywhere, at any price. I started accumulating these rare parts many years ago and am still able to produce Grand Wagoneers with brand new factory components! 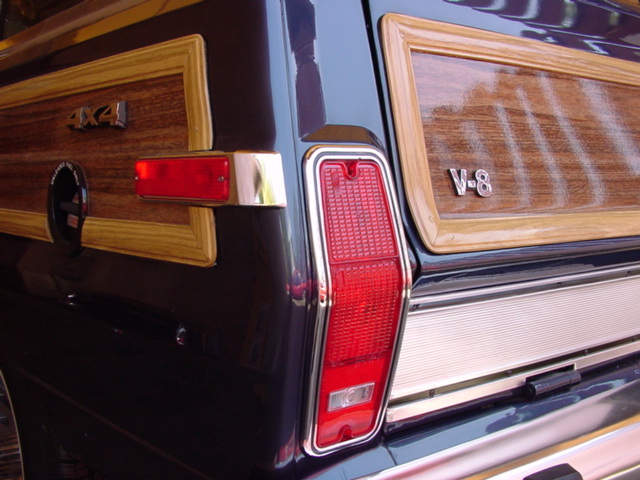 Besides the beautiful wood, one of the best features of these Woodies is their PAINT. Although I always try to find donors where the original paint is in exceptional shape for a 21+ year old vehicle, and only shows slight, if any, clear coat deterioration, they all suffer from having had defective original factory paint that would eventually suffer full clear coat separation. 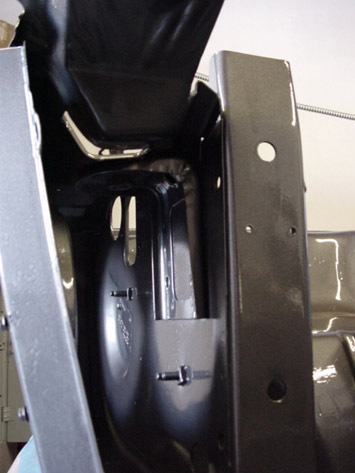 Therefore, the original paint and clear is removed, the whole Jeep is re-primed/sealed and the highest quality paint system is applied in multiple coats. The paint is then 5 stage color sanded by hand, compounded, polished, glazed, sealed and, finally, liquid waxed. 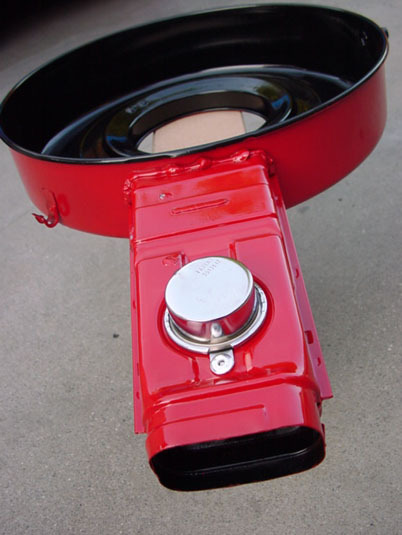 The expert POST paint finish work alone can take several full weeks. The final result is worth all of the long days, arduous and backbreaking labor and commitment: Wagoneers that look impeccably clean, glisteningly shiny with even better paint quality, depth and gloss than when they were brand new……Paint that is as smooth and reflective as a sheet of glass. Again, my Ultra Restorations are also, very importantly 100% rust-free. The frame and all body panels (interior and exterior) are spotless. I am a firm believer that you can never completely get rid of rust. 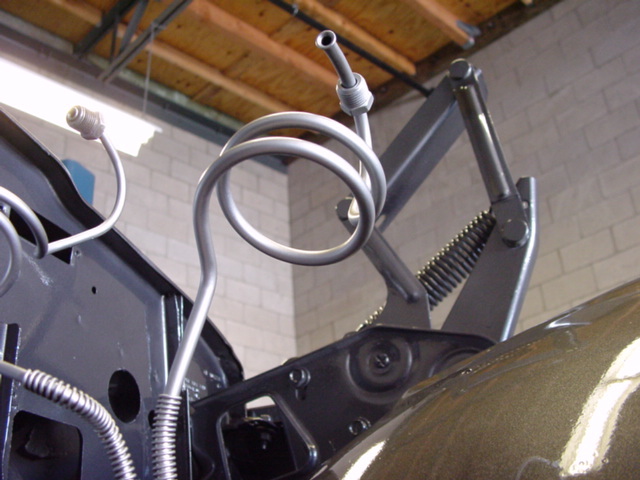 My many years as a Jeep mechanic and as a body/paint man, made me realize that it doesn't make any sense to spend many tens of thousands of dollars and almost two years of time restoring a vehicle, trying to make it better than new, only to have a rust problem that you can NEVER solve. Any previous rust will eventually return and will ruin the value and appearance of the vehicle within several months or, if you are lucky, years. 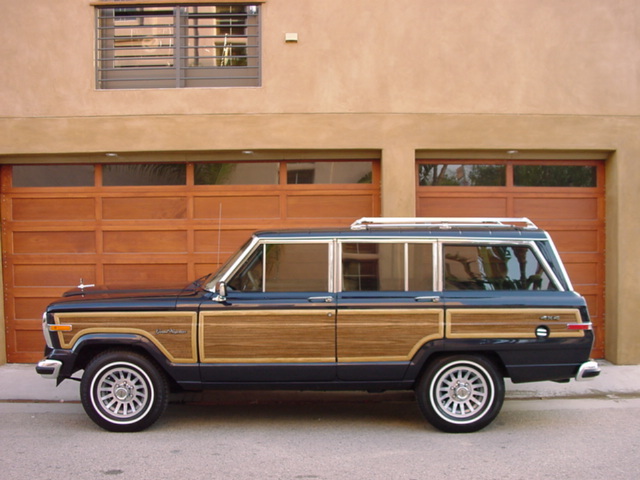 By buying a Jeep with rust, you are essentially ruining the long term collectability and resale value of your Grand Wagoneer. To avoid this problem, I buy Jeeps from areas where they are NEVER exposed to salt and which have been properly stored, garaged/covered, and maintained throughout their life. These primarily one and two owner vehicles were cared for and maintained as only cars with long-term owners usually are: with absolute attention to detail and love. 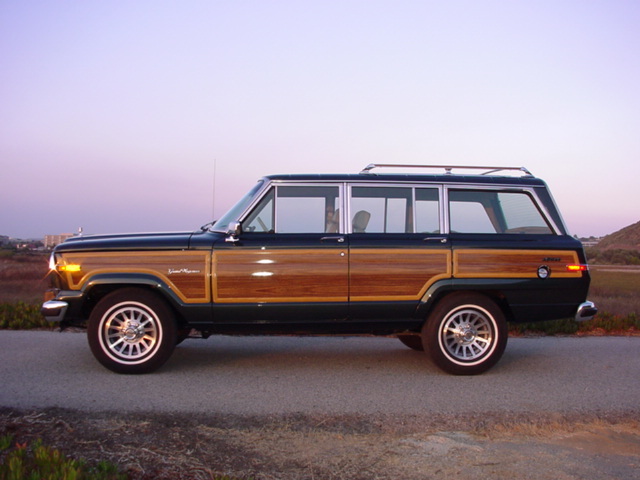 I must also reiterate that all Wagoneers from 1986 onward were clear coated with a defective clear coat system by Jeep. 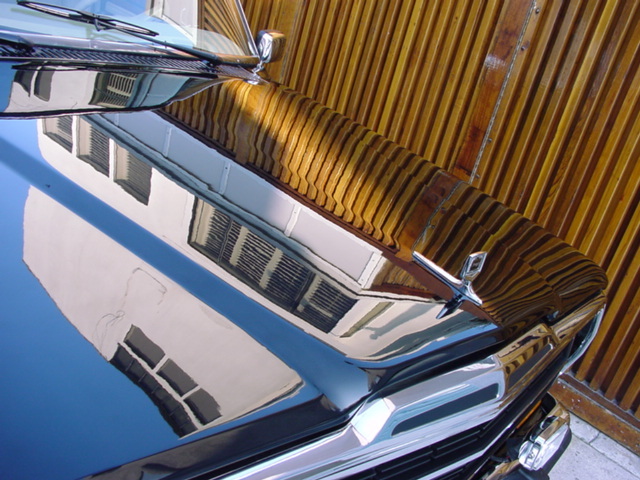 The original clear coat eventually cracks, fades and starts peeling off (starting with the hood and the roof, due to the direct sun and UV exposure and exposure to the most dynamic temperature changes ) between 4-7 years of when the vehicle was new. 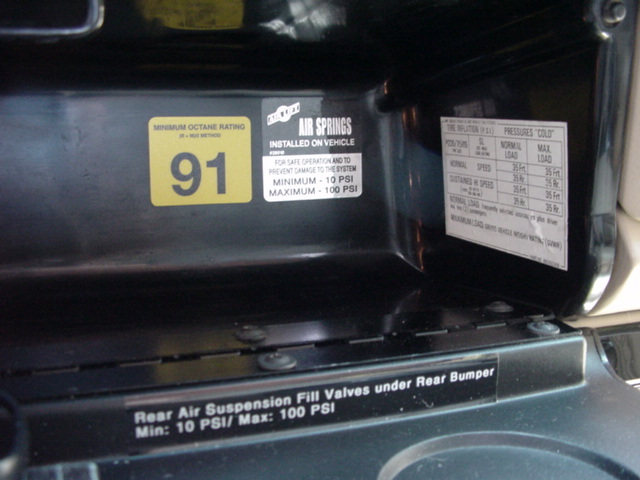 Informed Jeep owners were able to get Jeep to pay for a complete repaint under a factory recall, but that expired about 15 years ago, and many of the "factory" recall repaint work was very poor in quality of workmanship and quality of materials used. In short, any Wagoneer that you buy today either looks like the paint is starting to peel off, or it has been repainted. 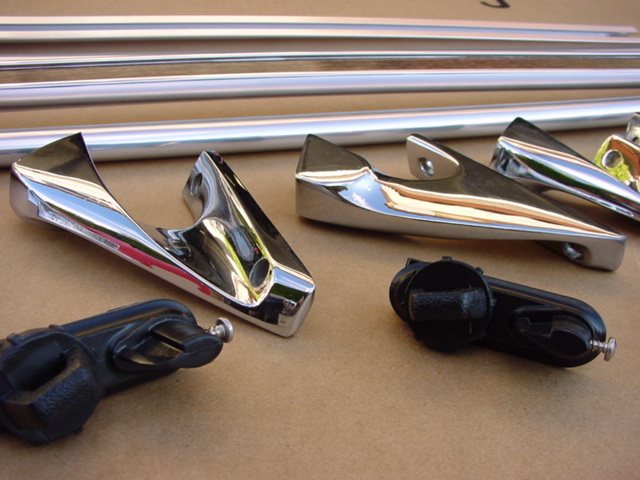 It is the quality of this paint job, and the quality of paint materials used, that is crucial. 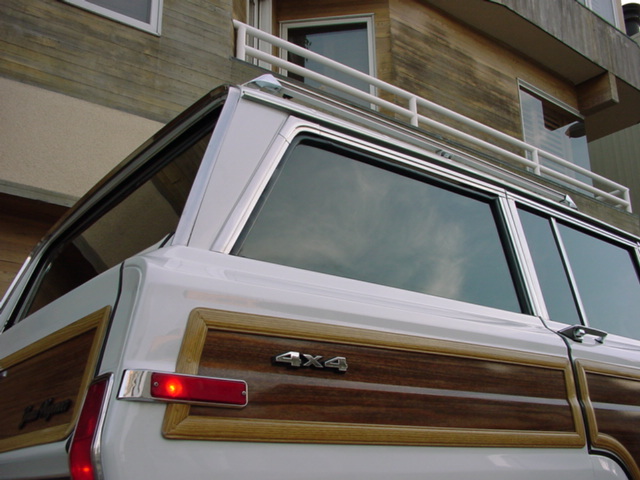 To properly paint a Wagoneer, the old paint and clear must be stripped off before repainting, so that the deteriorating clear under the new coat of paint does not further expand/contract and loosen, causing the new paint on top to split and crack. 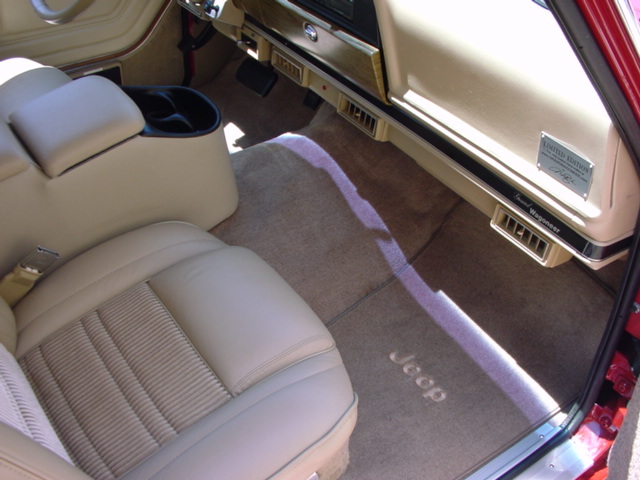 Also, unless ALL of the body components, trim and weather-stripping, every piece of the interior, all wiring and all of the components in the engine bay are removed, you end up with ugly over spray and lots of areas of partial coverage and “dry” paint, which ruins the value of your Jeep and looks awful. Therefore, a proper paint job is extremely time consuming, labor intensive, and consequently, very expensive. 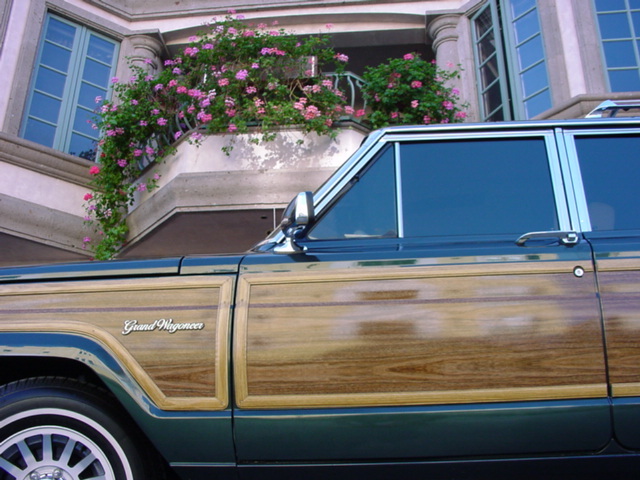 Therefore, not one of the Grand Wagoneers that I have seen in my life was painted correctly and to a high quality standard. This is simply because the owners (or used car dealers) do not want to spend the money necessary to have a truly high quality job, that will last, completed. My ultra high-end restorations receive the finest paint work, using the highest quality materials (in my professional opinion), that can be had anywhere, at any price. 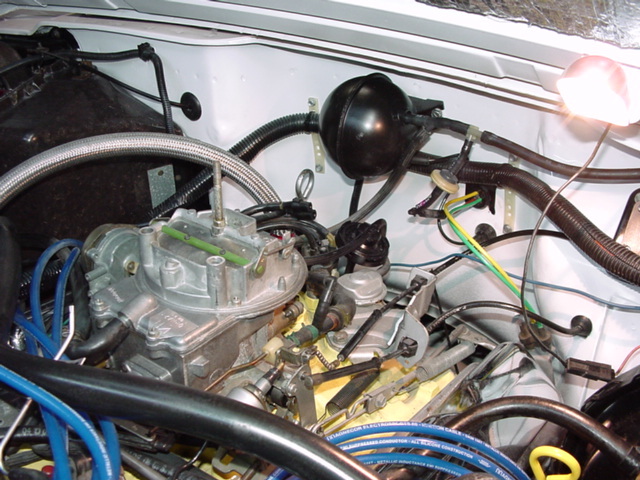 Every individual body component, trim piece, weather strip seal, interior component, wiring harness , and body rubber, as well as every single piece of the motor and engine bay (down to the last bolt), was removed prior to painting. After the complete strip down to a bare, empty metal body and chassis, and following several weeks of body prep, priming and sealing, my Jeeps receive the most expert application of what is, arguably, the best paint and clearcoat that money can buy. But even then, the work is only half done! 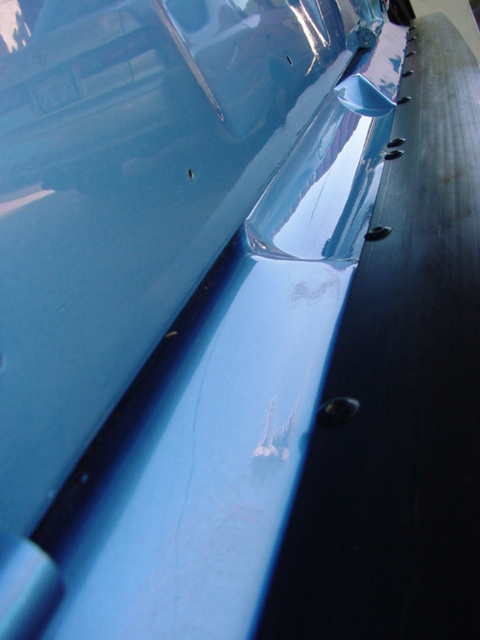 The true difference between very good and truly exceptional paint is the post-paint finish work. 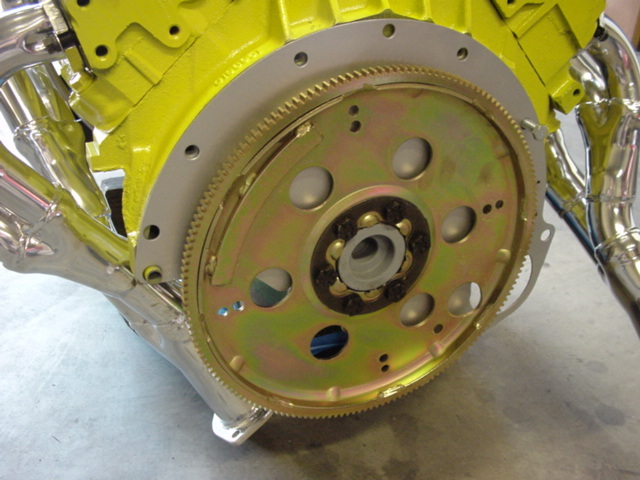 The finish work that is done after the paint is applied is just as important, and actually takes more time, effort and skill, than the prep and paint work stages. 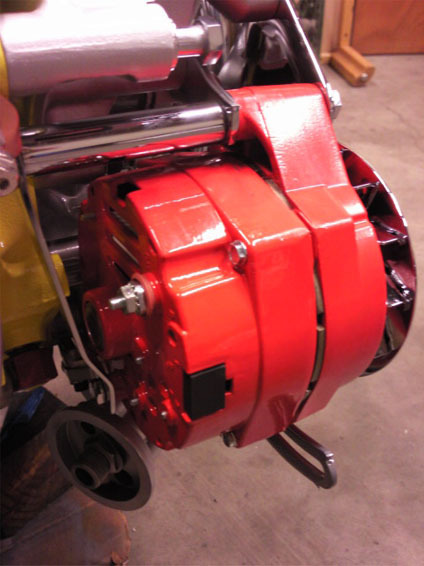 All new paint has minor imperfections, areas of dryness, dust nibs, small runs, some "orange peel" and various occlusions. 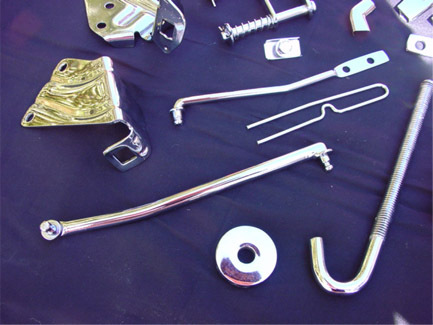 The most expensive, time consuming, and labor intensive part of high quality paint work consists of proper multi-stage color sanding, compounding, polishing, waxing, glazing and sealing. It is this finish work and the experience and expertise with which it is performed that distinguishes average from spectacular, better-than-factory quality paint. These Jeeps were painted PROPERLY. 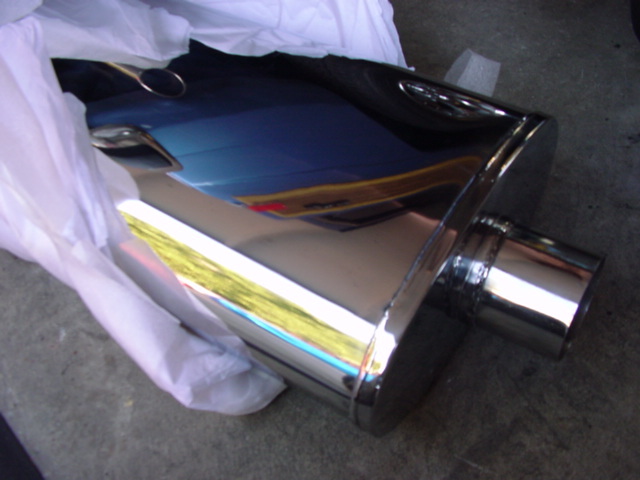 Awesome gloss, deep shine, smooth as glass and ABSOLUTELY NO OVERSPRAY….not a spec. 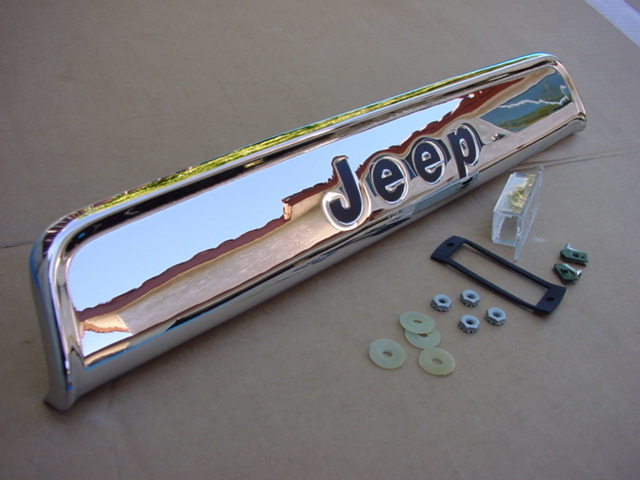 From the exterior, to the engine bay, to the door jambs, to the interior exposed metal, and even the sheet metal inside your doors and quarter panels and under your carpet that you will never see, your new Jeep will look substantially better than as if it just came out of the factory paint production facility. 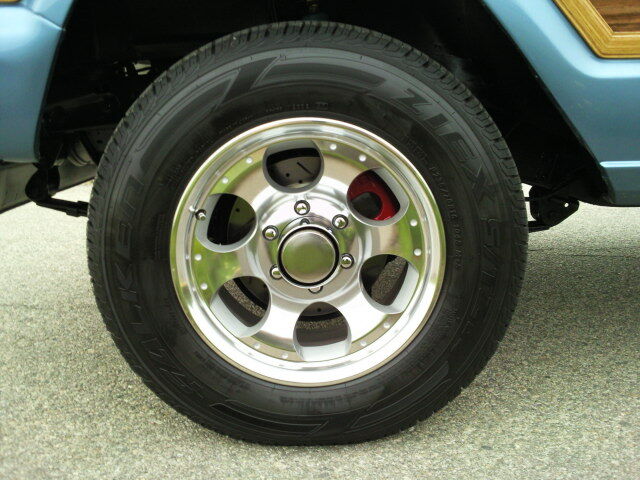 The tires I select not only provide incredible stopping power, traction, and wet and dry handling, but are also extremely rigid, quiet and SAFE. In addition to being properly and beautifully repainted, all of the exterior rubbers and seals were replaced with new factory pieces. 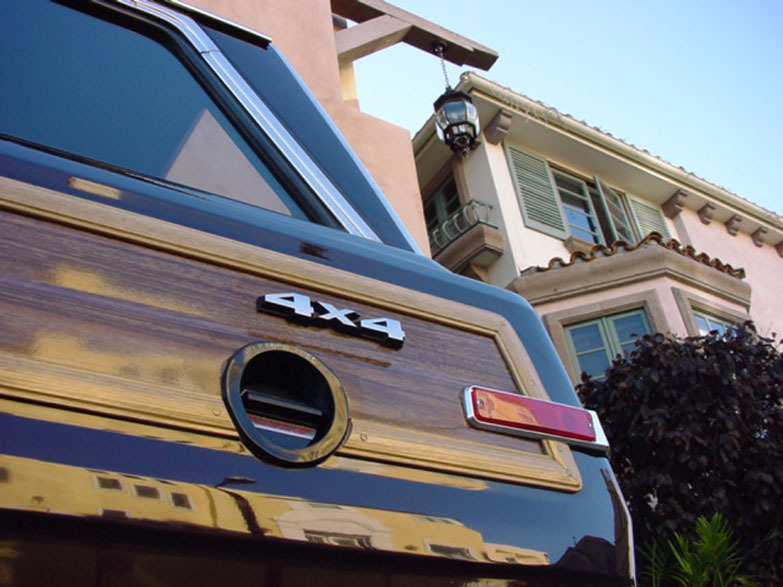 These Wagoneers look stunning, and as good as brand new, from every angle. These Grand Wagoneers don't just look like brand new Jeeps...they also drive like brand new Jeeps. 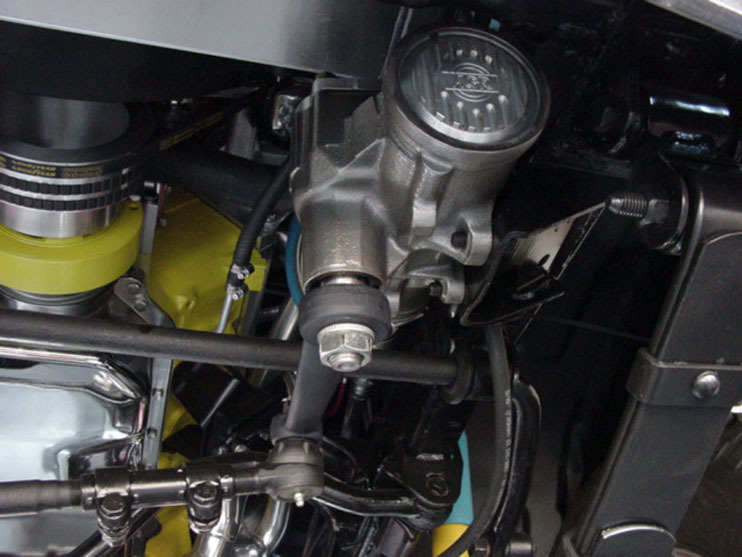 In fact, due to the dozens of mechanical upgrades and high performance options offered, they drive much better and offer superior performance, acceleration, torque, handling and braking to an original, new Wagoneer. 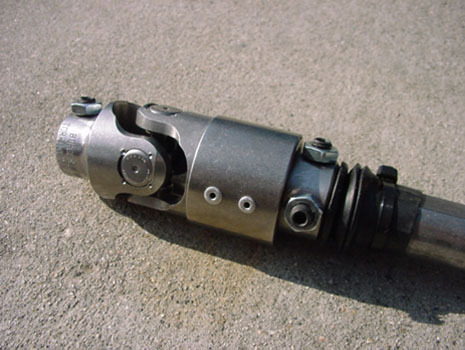 That is because all of the drive train components, as well as all ancillary mechanical components are brand new, have been rebuilt or are fully adjusted, serviced and resealed. 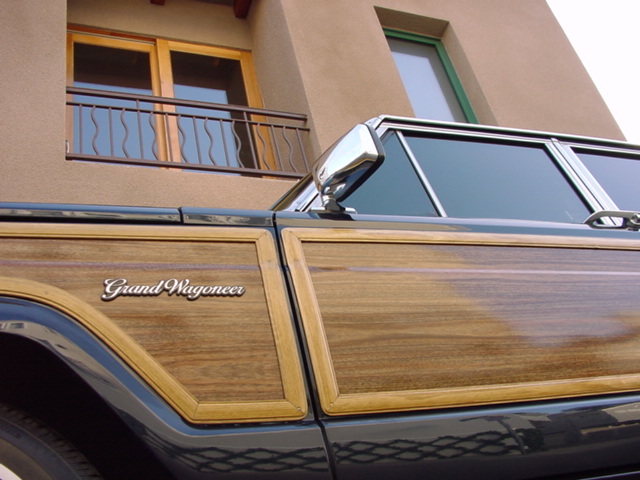 Nothing is neglected or forgotten, and you can feel comfortable knowing that specialist trained mechanics, some with well over a decade of experience on nothing but Grand Wagoneers have worked on your Woody. 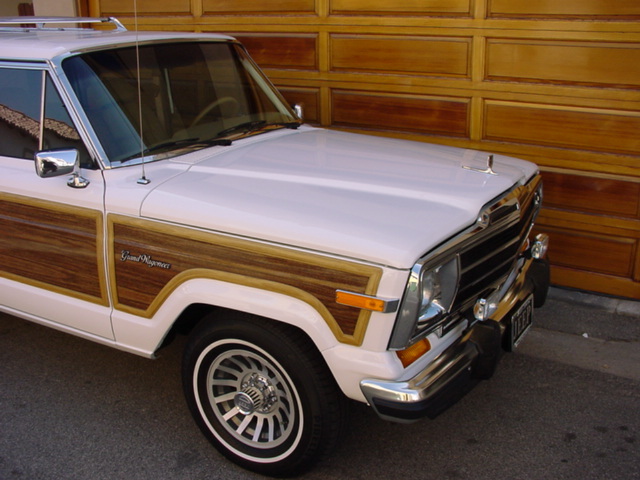 As a Jeep mechanic specializing in Grand Wagoneers, and later as the owner of the best Grand Wagoneer restoration shop in the United States, I have likely had the opportunity to personally examine between 500-700 “woodies” in my professional life, including many that had been "reconditioned" by some of the Wagoneer specialty retailers on the web. With that experience as a basis, I can confidently say that nothing I have ever seen comes remotely close to the depth, detail and quality of my restorations. 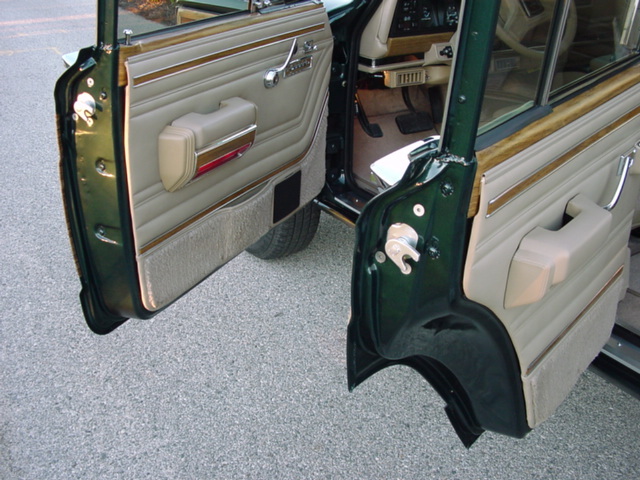 You will not find better, more durable or more beautiful Grand Wagoneers anywhere in the world. Nothing you see in the photo below is used, worn, or 21+ years old. 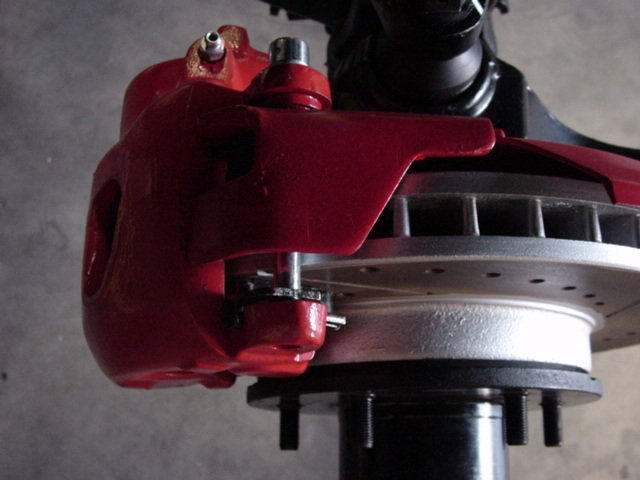 Only the best quality new components and lots of custom made improvements over the original design. 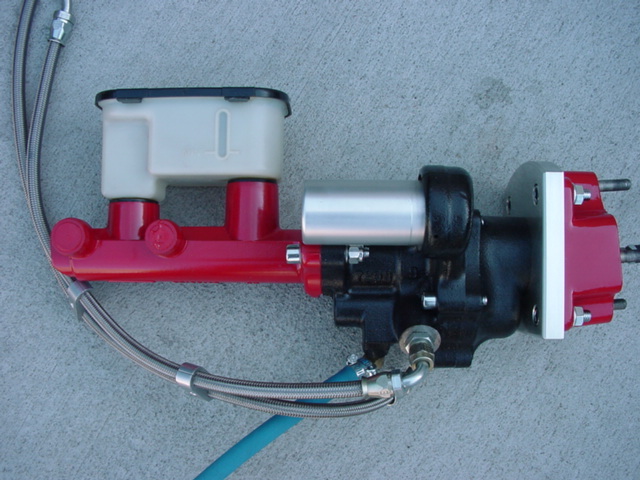 Not only do I offer three types of computerized fuel injection systems to my clients. 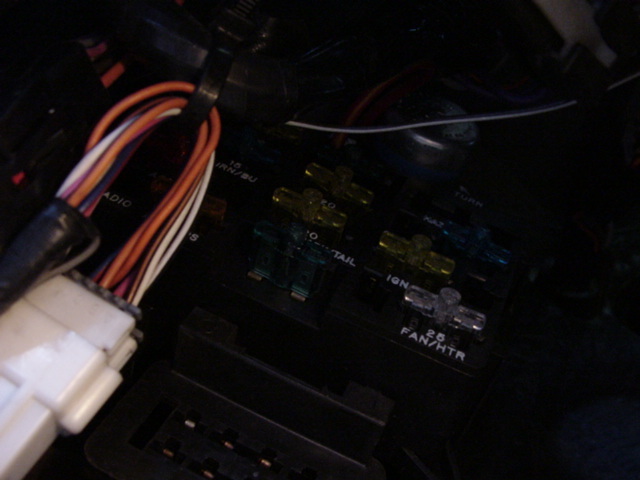 Far more importantly, I install them expertly and correctly. 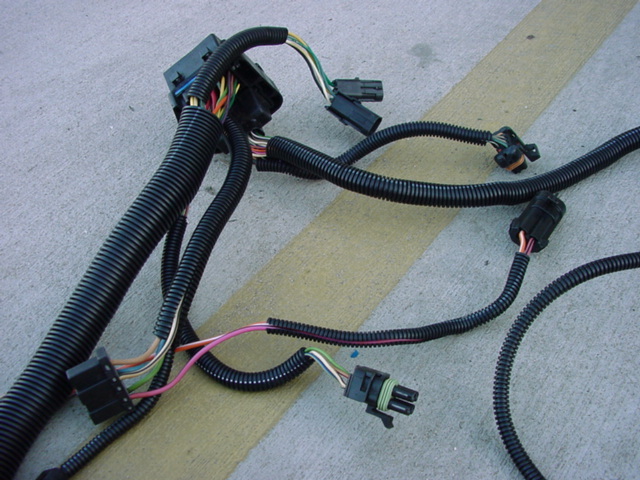 Any mechanic can rip out your factory fuel management system, vacuum system, carburetor, fuel lines, etc. 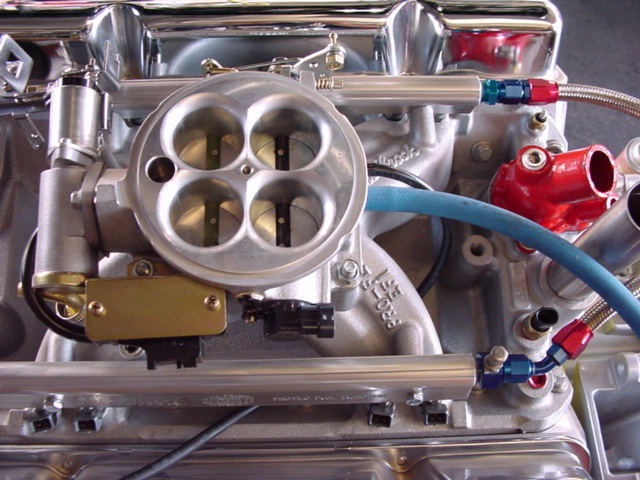 and bolt a throttle body injection system to your motor. 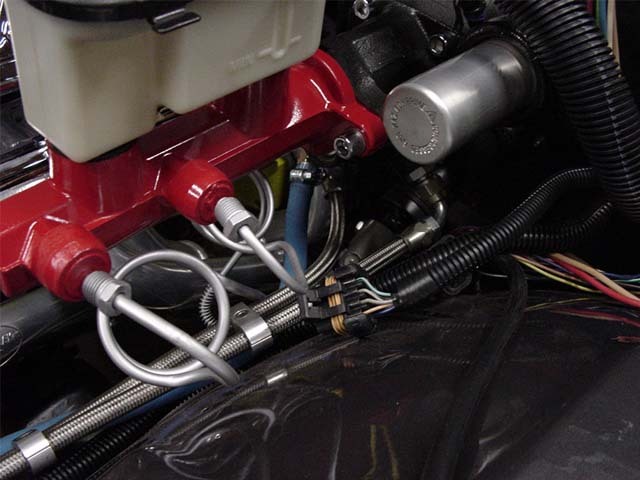 Unfortunately, getting that new fuel injection system to run reliably and cleanly, and to perform optimally, takes a lot more than simple installation of the components. 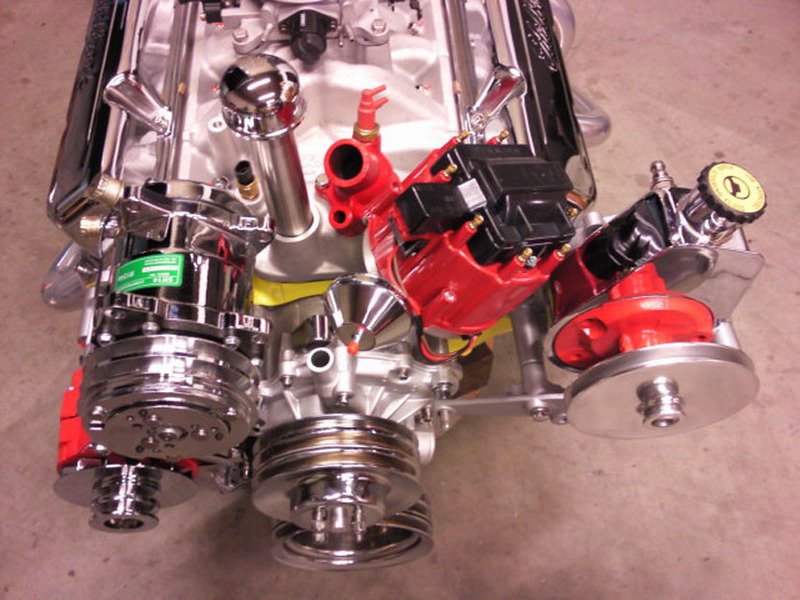 It took me 3 years of trying different systems, modifying them, customizing the vacuum, ignition, fuel pump and sensor systems, changing and installing other necessary parts, and choosing the correct complimentary components before I could really say that I could produce reliable, great running, fully functional Fuel Injection systems. 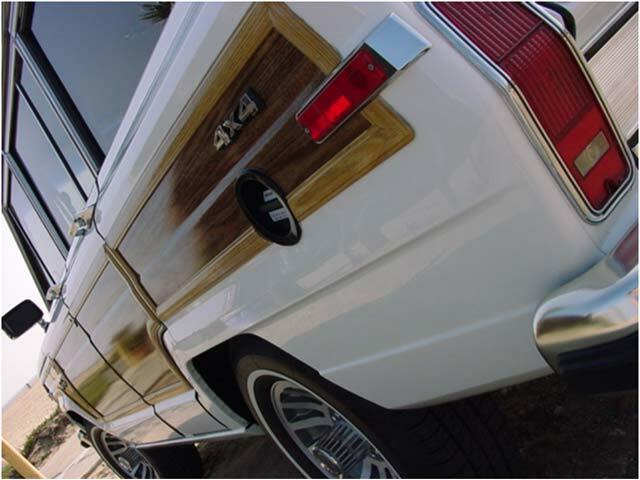 The single most important step of the entire fuel injection conversion process is the custom tuning of each individual Grand Wagoneer. 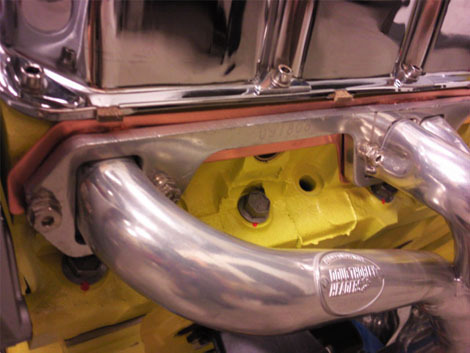 With lots of specialty, even custom made & in-house fabricated, testing and tuning equipment at my disposal (as well as the experience, training and skill to properly use it) I custom-program each restoration that leaves my shop for optimal performance, power, responsiveness and clean emissions. This computerized tuning process can take up to three weeks!! 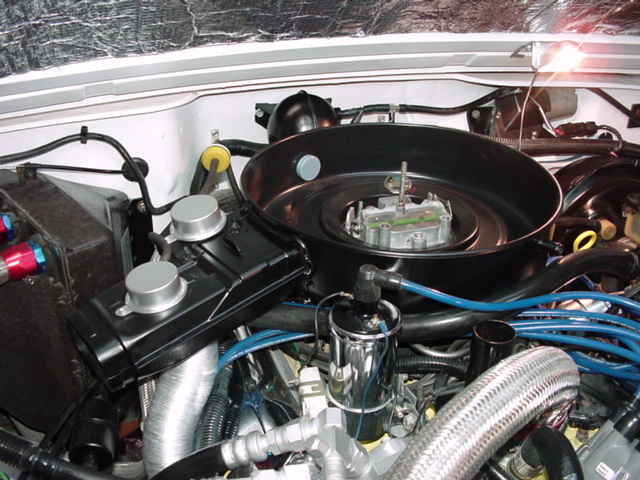 It is incredible how much cleaner my restorations run than an all-new Grand Wagoneer using the factory Motorcraft carburetor. 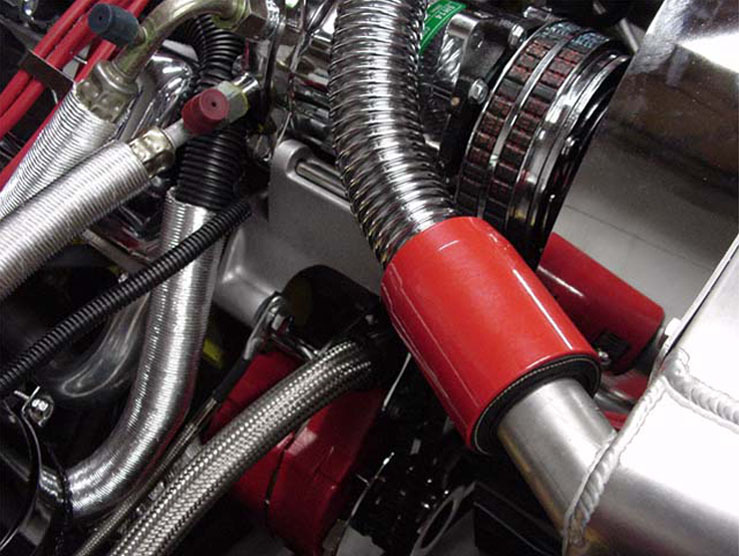 Due to the replacement of the entire, fuel, engine management, ignition, exhaust and vacuum systems with upgraded modern components, many of the past full fuel injection conversion restorations that I have tested, showed virtually zero emissions in several exhaust gas categories. 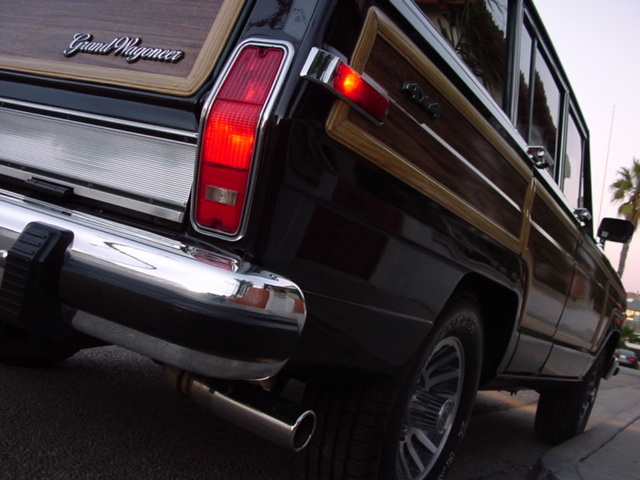 If you are ecologically minded, you can rest assured that any Grand Wagoneer that you purchase from www.grandwagoneer.com will be among the cleanest running, lowest polluting Wagoneers ever to grace the streets. It was always a priority to me that my “woodys” are not only drop-dead gorgeous, but they also had to be clean, “GREEN” and environmentally responsible. 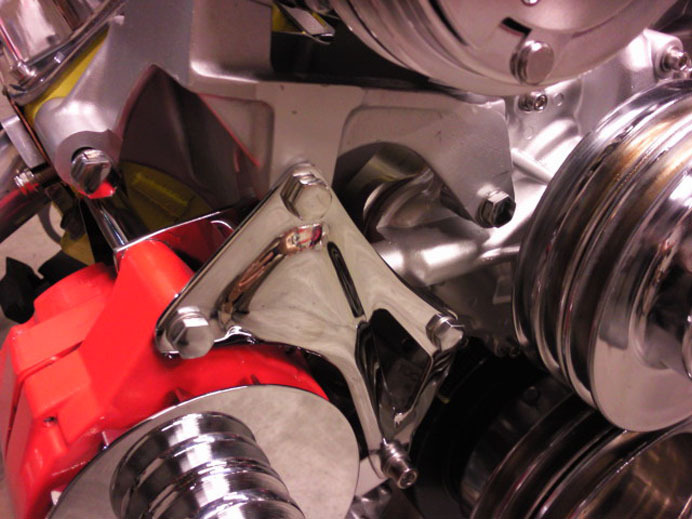 Even the mechanical and electrical parts that you will never see once the Jeep is assembled are new and of the highest quality. And don't try to compare this paint work with anything that the factory ever produced! The photo below shows 14 components that I custom make "in-house" and that are not available for purchase anywhere. 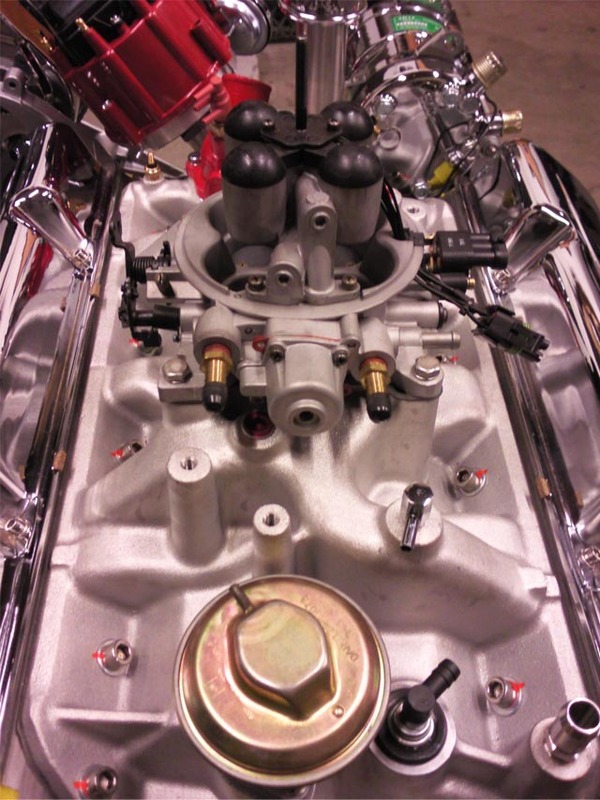 In the photo below, you see a stock-style restoration that employs a fully rebuilt 2BBL Motorcraft carburetor, an oil filled ignition coil, along with all of the original factory emission equipment and the vacuum controlled engine management system. 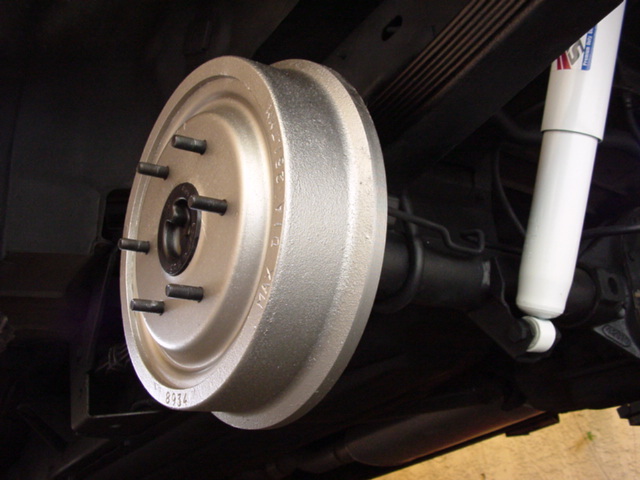 Age, or Time often wears a vehicle, and degrades it's cosmetic and mechanical components, just as much as mileage. 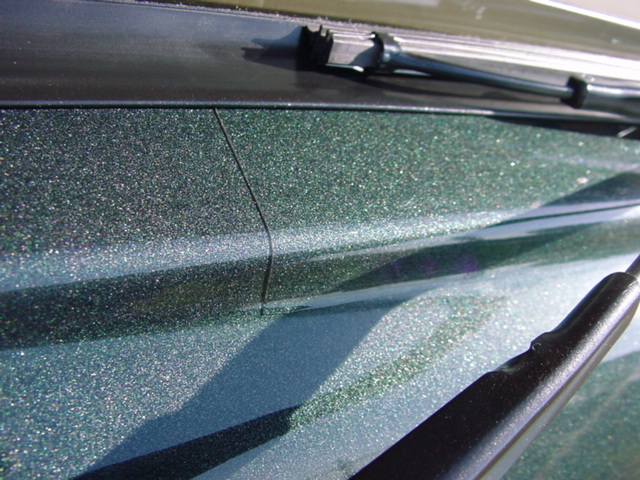 Sun and UV exposure, oxidation, temperature changes, weather patterns, bird droppings, environmental fallout, minor accidents, scratches, dings, road chips, and air pollution damage and deteriorate the paint, chrome, aluminum, vinyl, carpet, leather, interior plastic, rubber seals, woodgrain, and glass of the exterior. 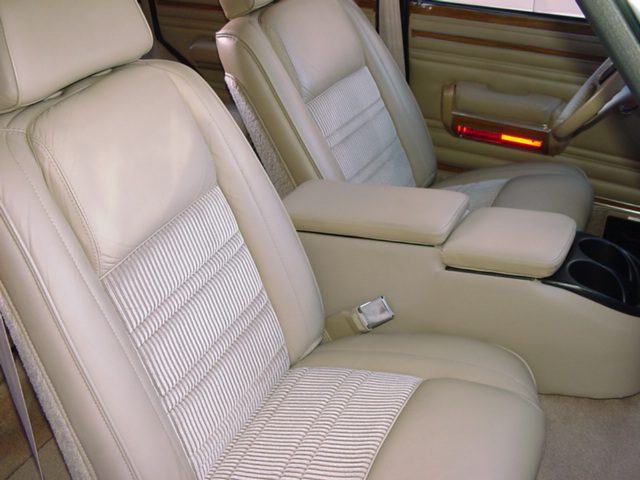 Many of these elements, especially water damage, sunlight, UV rays, changing temperature and moisture accumulation do irreparable damage to the leather, carpet, headliner, and plastic components of the interior. 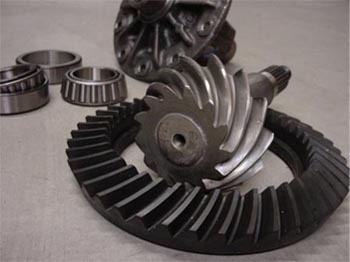 Mechanically, age causes all of the lubricant and oil seals to dry up and shrink, and hoses, belts and gaskets to dry, crack, swell and fail. 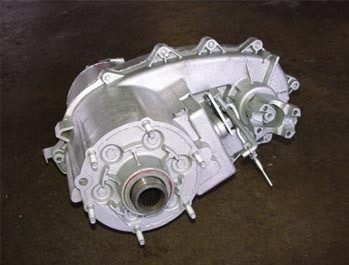 Internal mechanical components in the motor, transmission, transfer case, auxiliary motor components and rear and front differentials suffer from moisture accumulation, internal corrosion, rusting, pitting, and the acidosis of the lubricants in these systems. 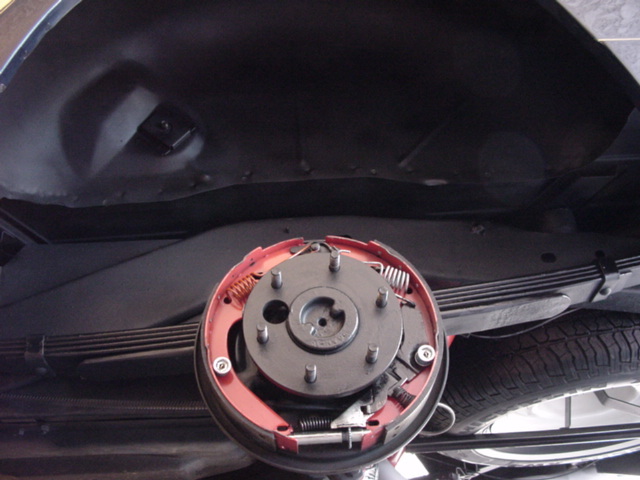 You may also know, either from personal experience, or from speaking to mechanics and auto dealers, that long term storage, infrequent use and inactivity can often cause more problems and damage than when a vehicle is regularly driven and properly maintained, serviced and cared for. 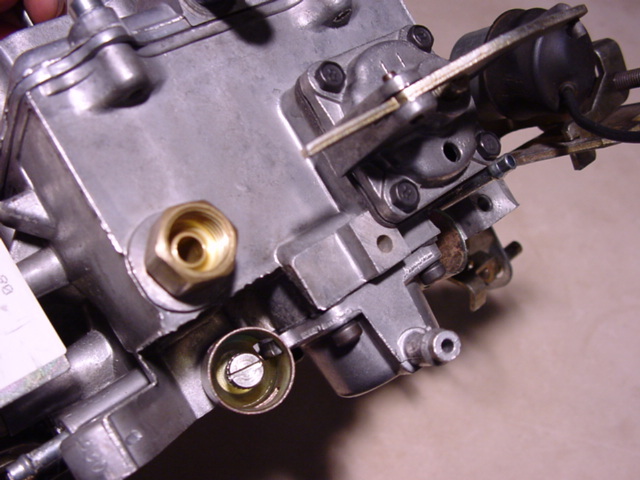 Dealers refer to this syndrome as “lot rot”…the damage that occurs to a vehicle when it sits idle: dried up oil and fluid seals; internal condensation in the motor, carburetor, transmission, transfer case, differentials, etc leading to rust formation and pitting of the moving parts; oxidation and degradation of oils and gasoline causing them to lose their protective and lubricating properties and causing fuel to become gelatinized and gum up the fuel system, etc. 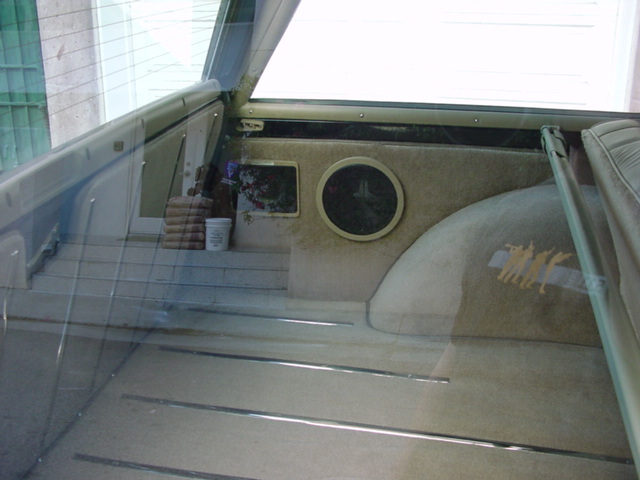 And, if the vehicle is also exposed to sunlight, there will also be: fading paint and exterior trim; UV degraded tires and rubber seals; fading, hardening, drying and cracking of interior leather, plastic, vinyl and carpet; and, deteriorating clear coat. I mention all of this to make two important points. 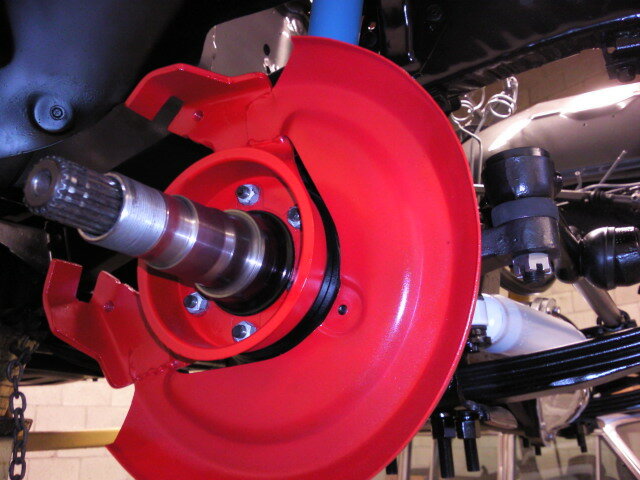 2) If professionally completed (by experienced and skilled specialists) with the highest quality parts and materials, a fully restored Jeep with all new mechanical and cosmetic components will, in every case, be superior in appearance, quality, reliability and service life to a low mileage, at least 19 year old, original vehicle. 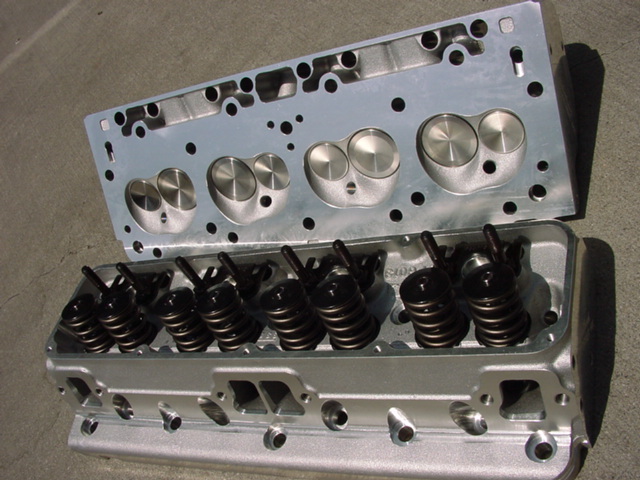 Better than factory spec 360 V8 ENGINE with all new internal motor components, including high performance PISTONS, RINGS, machined and balanced CRANKSHAFT, custom ground PERFORMANCE CAMSHAFT, DOUBLE ROLLER TIMING CHAIN AND GEAR, BEARINGS, RINGS, VALVE STEMS, VALVES, PUSHRODS, Gaskets, Seals and ASSEMBLY HARDWARE. 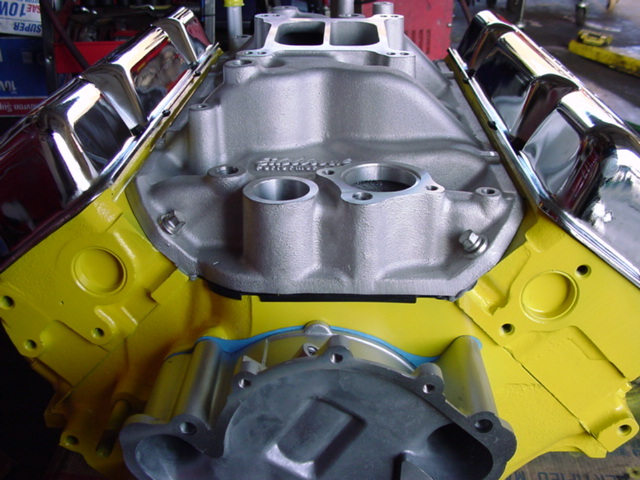 The entire engine block and rotating assembly are sand blasted, high-temp dust-coat zinc primed and professionally custom refinished and repainted! 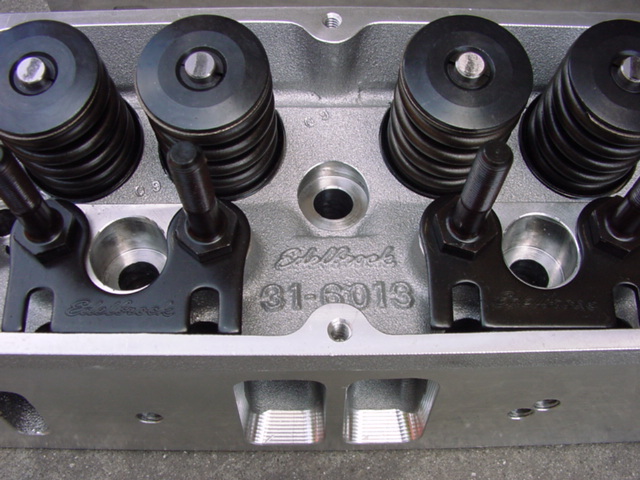 Professionally machined CYLINDER HEADS with all new valves, guides, seals, stems, springs, lifters and freeze plugs. Surfaced, ported and honed. 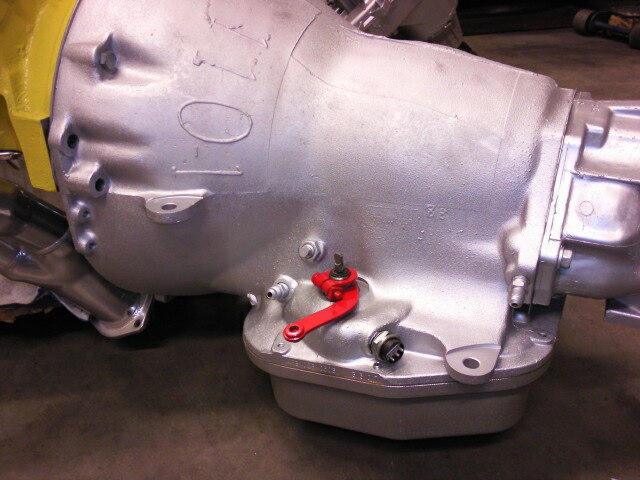 Fully disassembled, serviced, adjusted, and resealed TRANSFER CASE with new internal components including new VISCOUS COUPLERS (no longer available and very expensive). Case sand blasted and refinished. 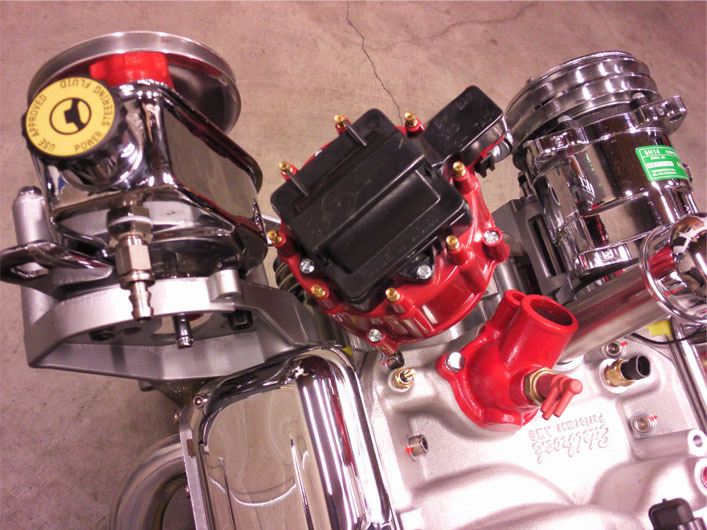 Professionally rebuilt, bushed, sleeved and jetted CARBURETOR, fully tuned and adjusted (unless vehicle fully upgraded to Electronic Fuel Injection). 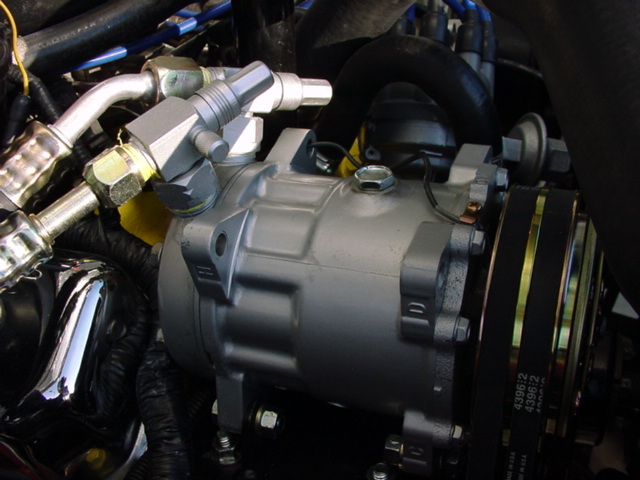 FULL A/C SERVICE, evacuation, pressure testing, and refrigerant recharge . Full conversion to R-134. 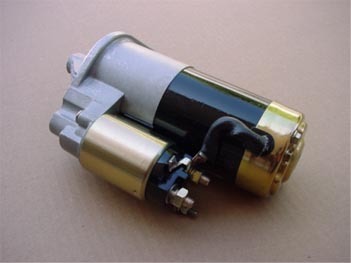 All new TUNE UP PARTS: DISTRIBUTOR CAP, IGNITION ROTOR, SPARK PLUGS, AIR FILTER, OIL FILTER, FUEL FILTER, PCV VALVE etc. 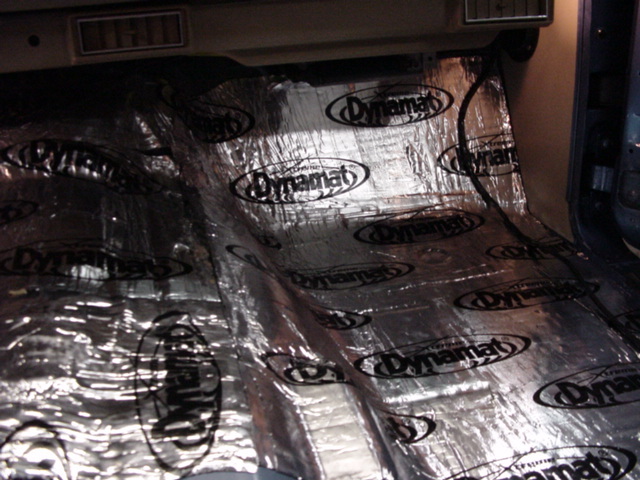 New custom made heat-reflective and super clean HOOD INSULATION. 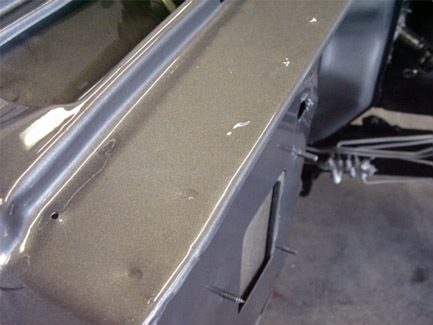 This upgraded, cleaner insulation is important to prevent splitting of hood paint due to excess heat and expansion and contraction of metal and paint due to temperature changes. New SECONDARY FUEL FILTER. 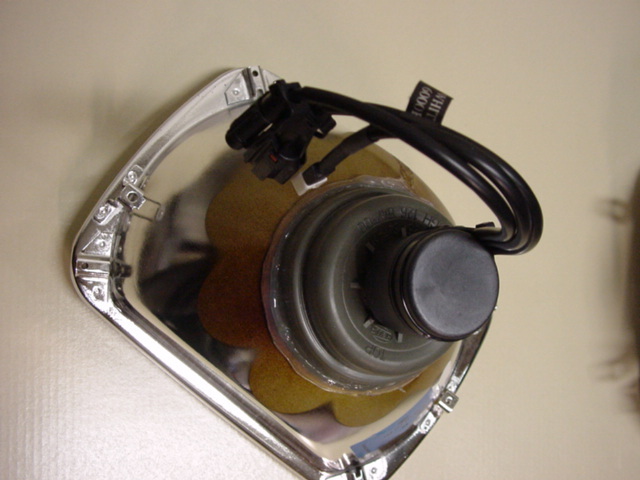 Transparent housing, replaceable filter element. 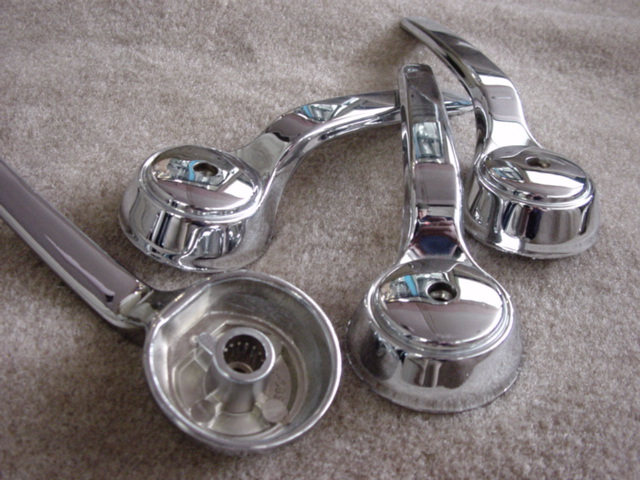 All electrical terminals and connectors mechanically and chemically cleaned. 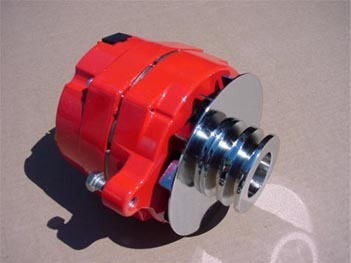 Then, high grade Di-Electric Grease is applied and a chemical anti corrosion treatment is applied to all connectors and terminals to permanently seal out moisture and keep electrical connections corrosion free. 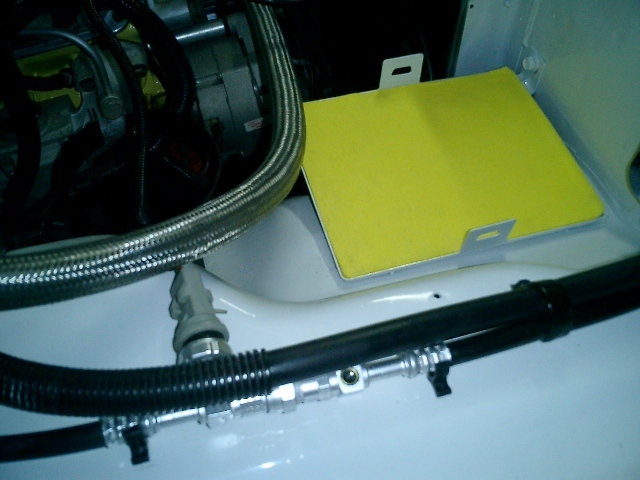 It is also important to note that there are well over 100 components that I build, machine, make or modify in-house. 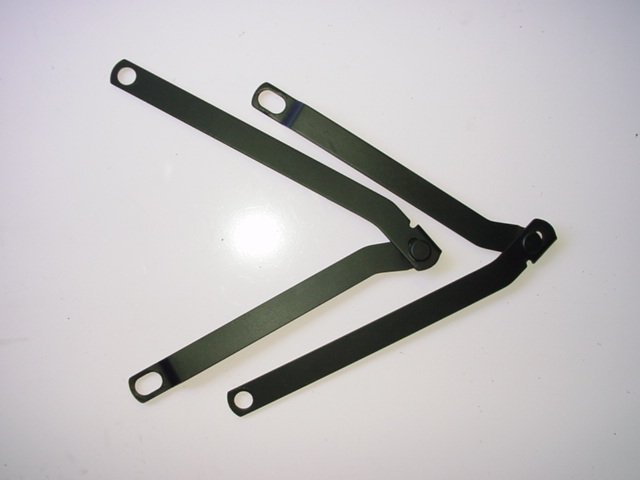 These superior-to-stock, and often critical, mechanical parts are not available anywhere else at any price. 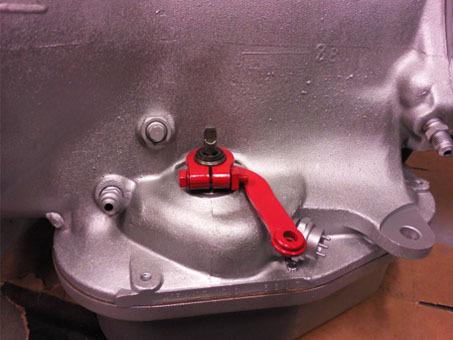 In addition, almost all of the new “off the shelf” performance and replacement mechanical parts and components used in my restorations are modified or improved in some way prior to installation. This massive extra effort and expense ensures that the original weaknesses of the factory design are addressed and result in the world’s best, most capable and most durable Grand Wagoneers. As I mentioned previously, my current inventory of Ultimate Daily Driver Grand Wagoneers have received a much higher grade mechanical restoration than the previous list demonstrates. 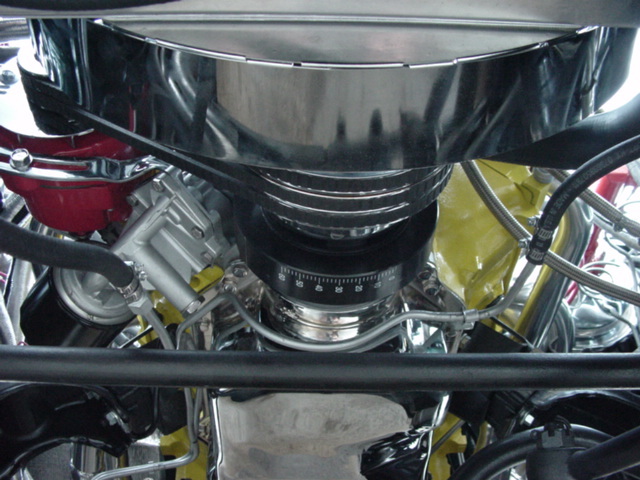 All of the super Wagoneers that I am currently completing have several dozen additional mechanical and performance upgrades above and beyond what is listed on this site. If you are interested in receiving a “Specification and Build Sheet” on any of my current inventory, please use the link at the bottom of this page to send your request. 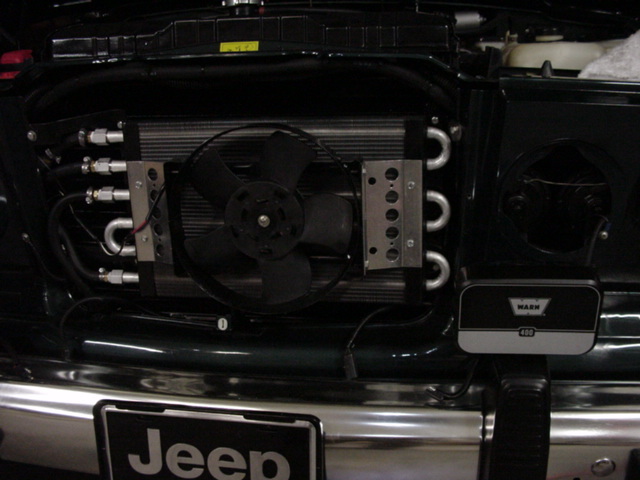 All of the motor components are brand new, making the engine compartments look so clean that you would almost believe that these Jeeps have never been driven. 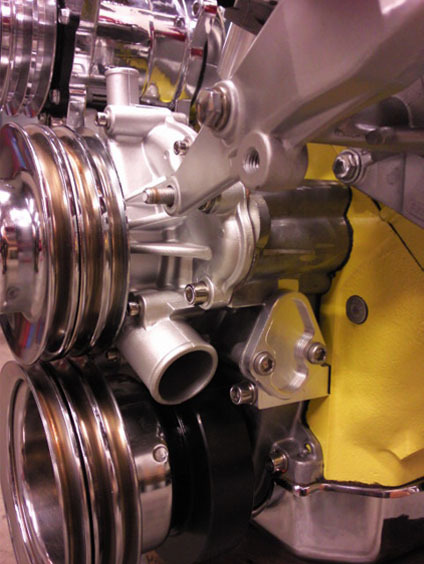 Every part and component you see in the photo below is an upgrade in quality over original, factory-style parts. In this one photo alone you also see almost a dozen parts that I have custom fabricated or modified to further improve (almost nothing you see is available “off the shelf”, or anywhere else, at any price). 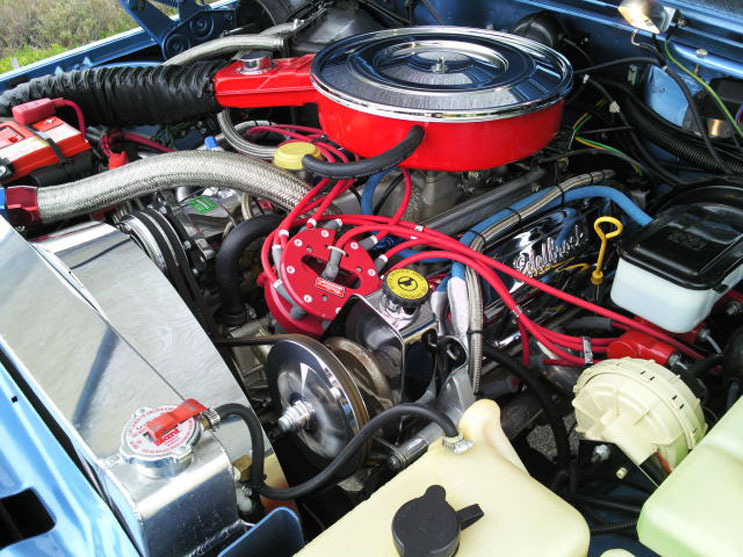 The parts that I hand select and install, and the upgrades that I offer, are the result of close to 24 years of experience in working on Grand Wagoneers and over 14 years of experience in producing the finest restorations of these magnificent vehicles, on earth. 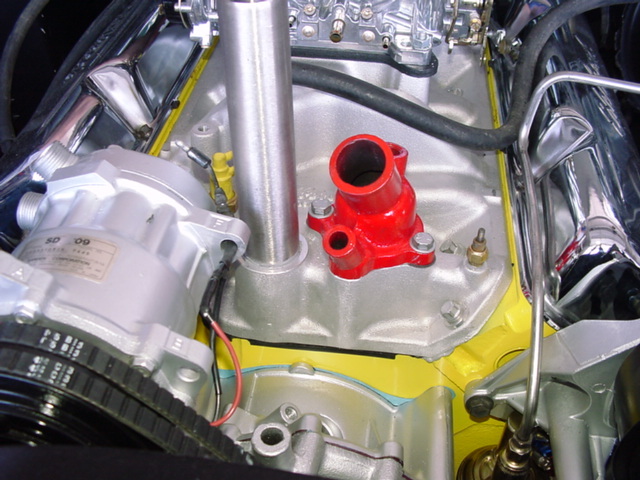 One of my rebuilt factory Motorcraft carburators. 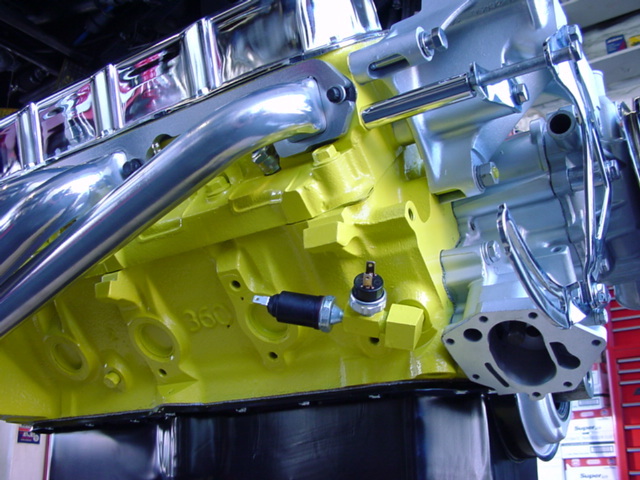 A custom engine modification that I offer on some of my highest output motor builds that addresses the insufficient oil supply to the number 7 and 8 cylinders resulting from the poor original block lubrication configuration. 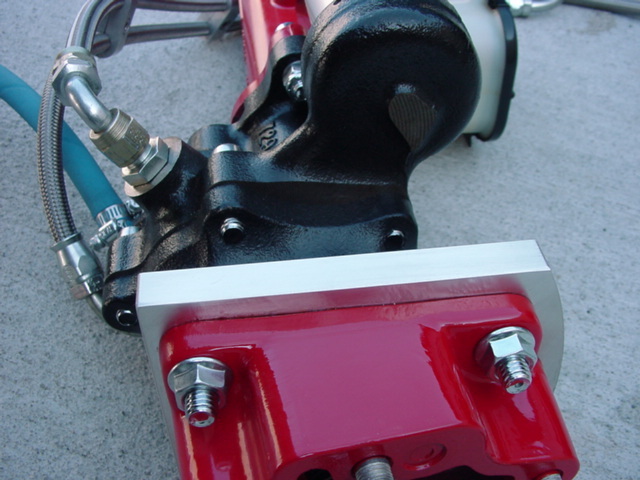 The ultimate in stopping power.....all new, ultra high output hydraulic brake systems! 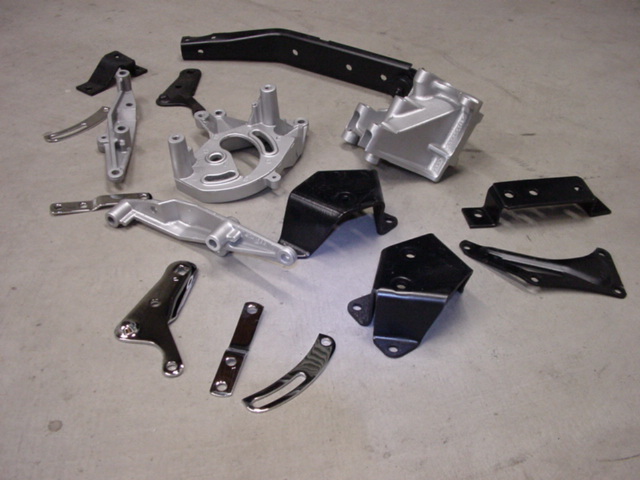 Here you see some of the custom made chrome brackets, throttle plates, linkages, etc. that is installed on every restoration. 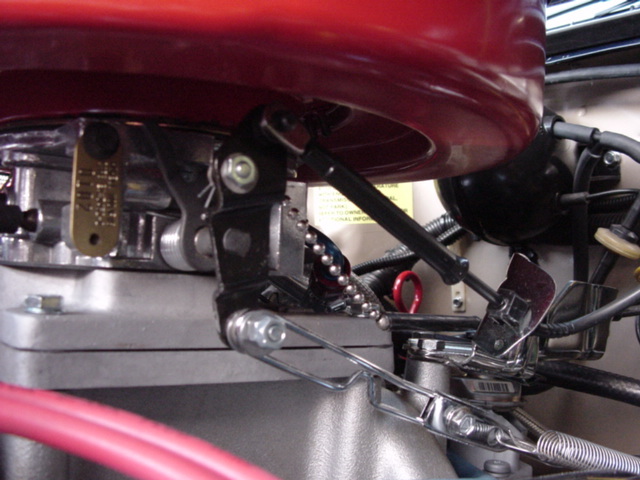 You also see the new throttle and cruise control cables, the new ball chain, the new vacuum components, new spring and all new hardware. No component or part that you see in this photo is “used”. 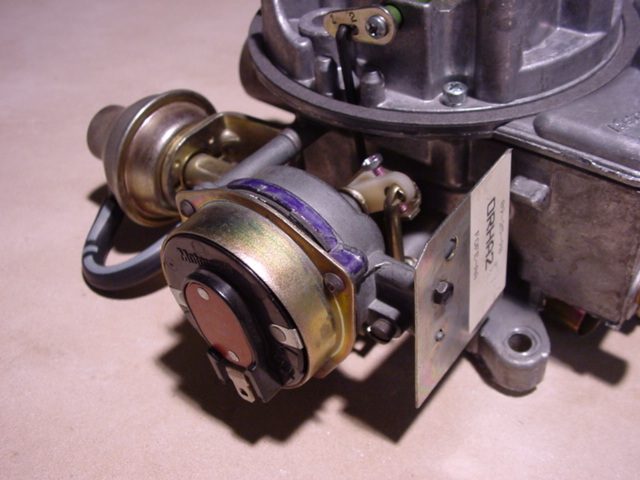 A stock-style air cleaner assembly for the factory carburetor with all of the vacuum switches and emissions control valves necessary for the carbureted system. 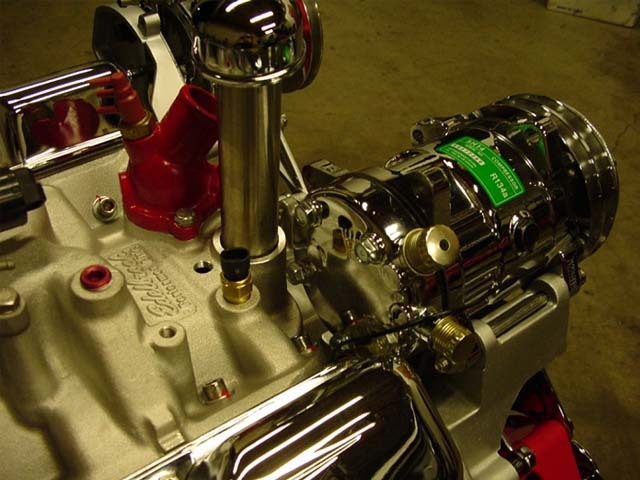 My TBI and Direct Port Fuel Injection systems dramatically simplify the unbelievably convoluted original vacuum system making my restorations more reliable and immune to the incessant vacuum problems experienced with the original engine management system’s design. 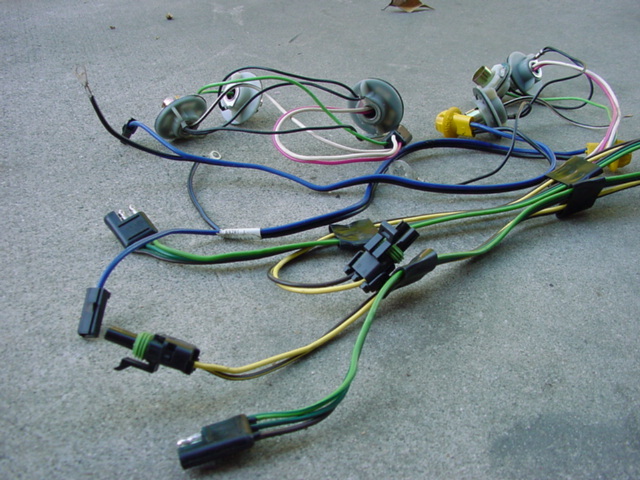 Wiring and electrical component protection is one of my top priorities. Intermittent electrical failures, bad grounds and loss of current carrying capacity are all symptoms of wiring that has deteriorated inside it’s insulation or has been damaged externally by heat. 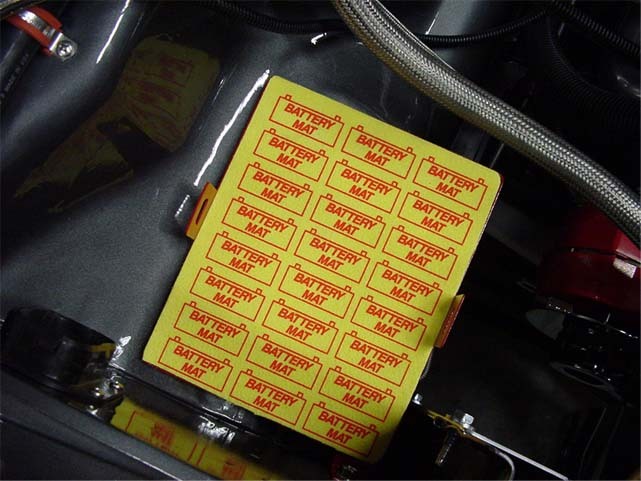 Years of expansion and contraction, burned, brittle and cracked insulation and melted or fused wires cause a variety of problems that are often almost impossible to track down and address. 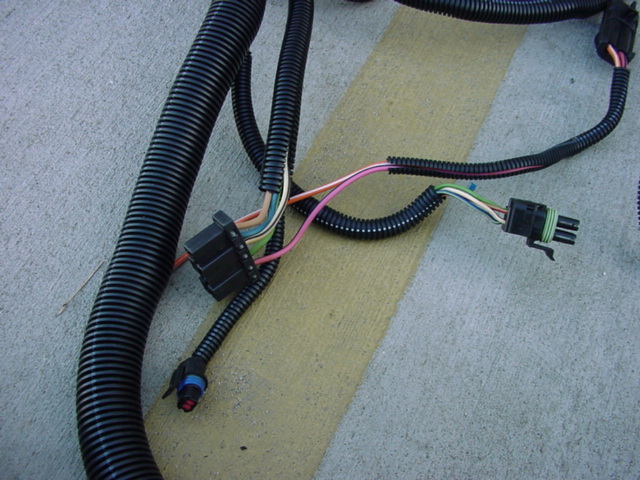 Therefore, I spend several days just installing and applying the highest grade ultra-high temperature protective wire loom, ceramic wiring sleeves and ceramic heat barriers that shield and protect all of the new electrical wiring, harnesses and connectors installed on my restorations from the damage that usually occurs from the extremely high underhood and exhaust temperatures. 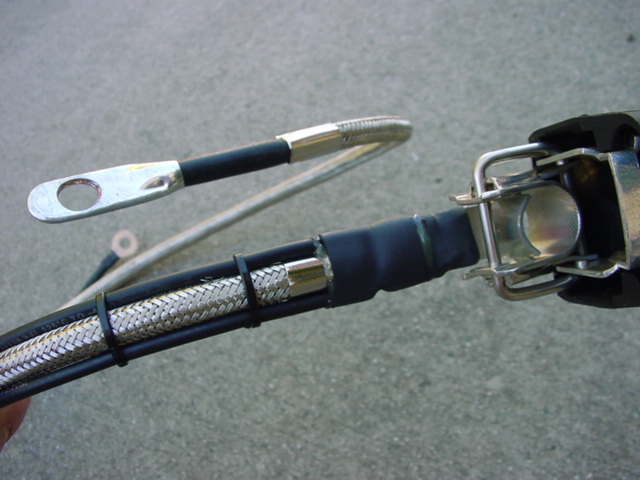 In addition, the highest grade, super-high temp crosslink insulated electrical wire, the finest brazed one-piece electrical crimps, the best fully sealed Delco “weatherpack” waterproof wire connectors and the finest adhesive lined high temperature shrink tubing is used in all of my wiring and electrical work. 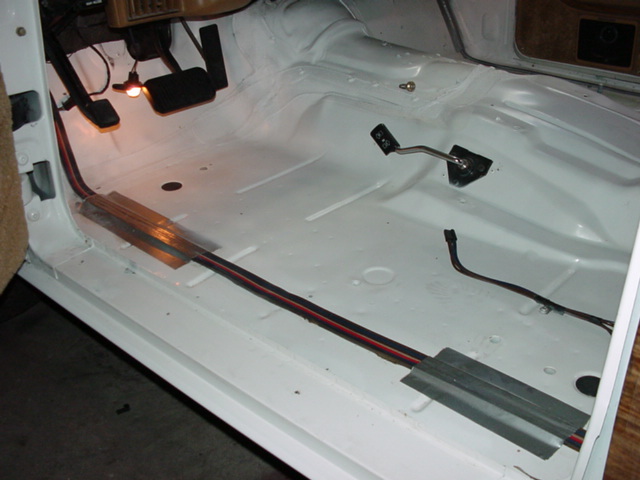 Countless hours of additional labor are devoted to nothing other than wiring and electrical protection! 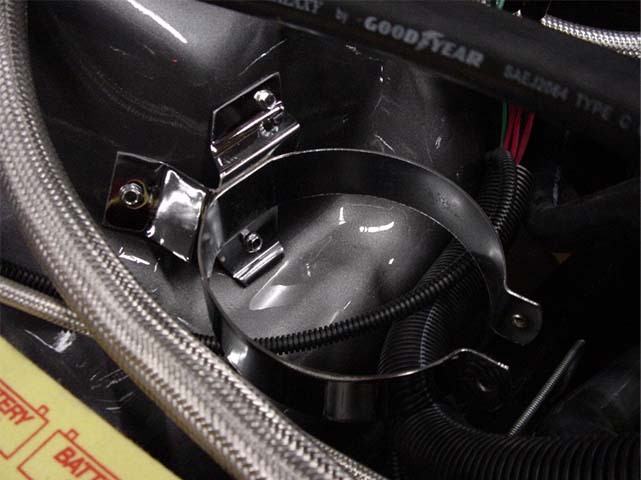 Below you see the early stages of a fuel injection system’s primary wire loom that has been installed through the firewall (and through my custom installed 2400 degree ceramic heat shield), insulated by a high temperature one piece grommet, covered in high temp black split loom and then encased with corrugated ceramic heat shield tubing. 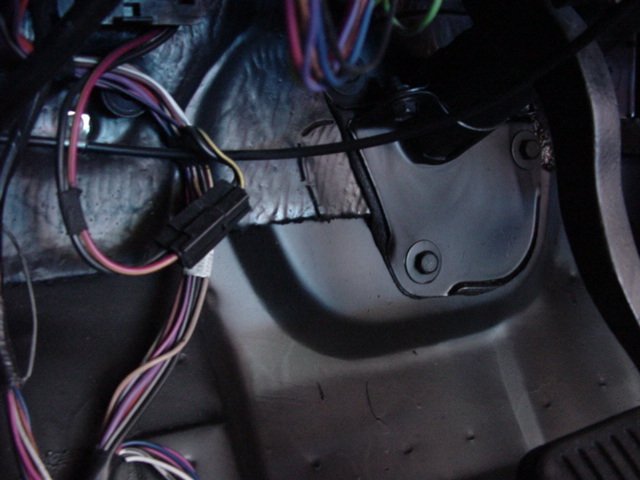 Later, an additional ceramic fiber woven heat sleeve will cover and protect the entire wiring stalk. 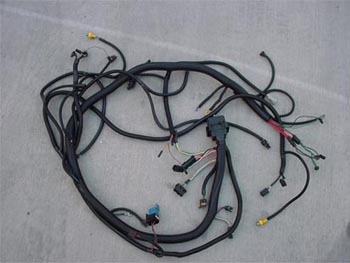 This wiring harness is so critical to proper performance and long-term reliability, that every additional protective and shielding measure is taken to protect it from years of radiant heat. 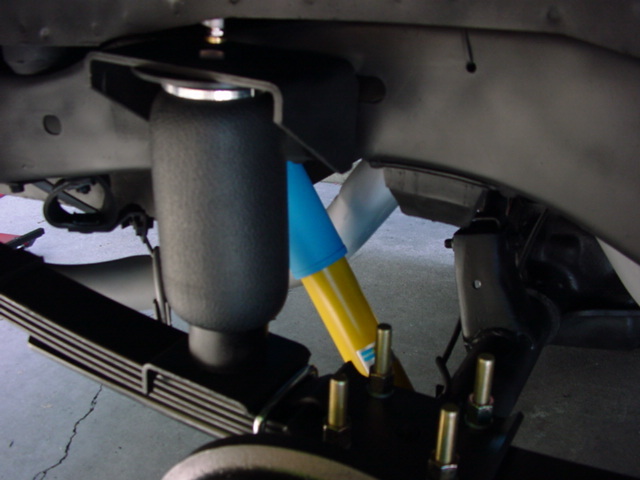 I offer two stages of Air Suspension upgrades. 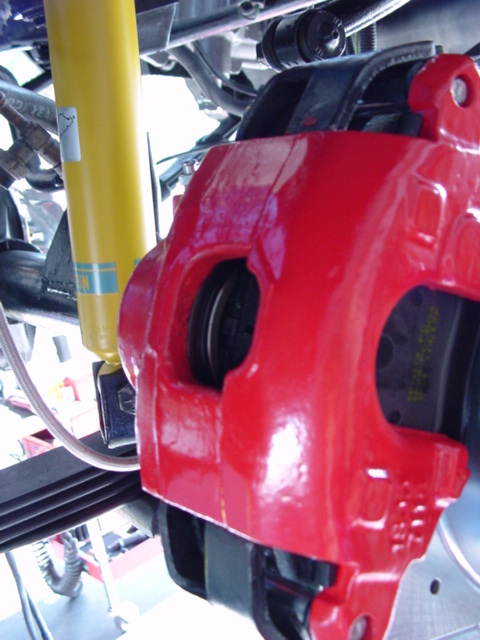 The one you see here is my most versatile auxiliary air shock system that is mounted using a custom U-bolt endplate, new cad plated axel retainer U-bolts and a frame mounted upper bracket. 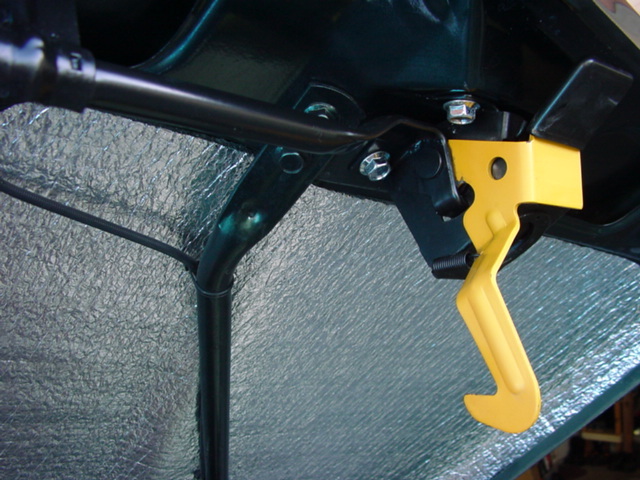 This system leaves the high performance rear shocks in place and enables the driver to “re-tension” the new leaf springs depending on load conditions, whether or not you are towing something, and whether you are carrying something heavy in the cargo bay. 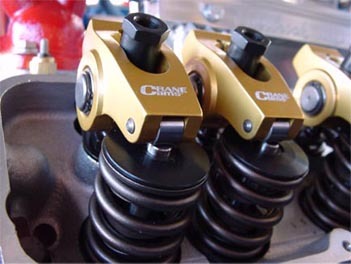 It not only ensures correct suspension geometry during different driving conditions, which dramatically improves handling and safety, but it also allows you to custom tune the suspension stiffness, amount of body roll and body dip, and lets you adjust the rear axels’ ride height. 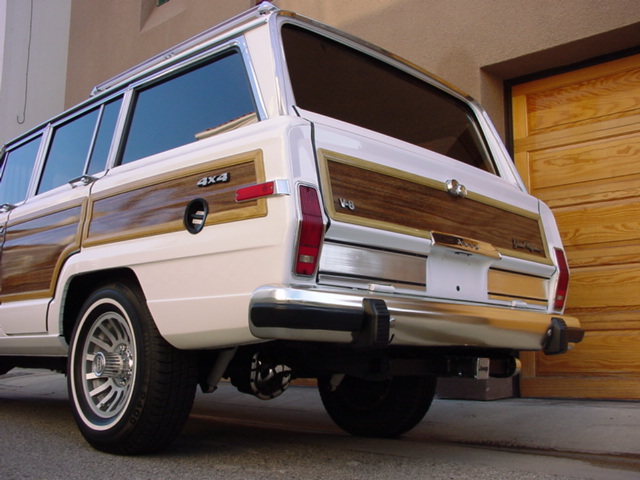 My Jeeps will never suffer from the “saggin’ wagon” syndrome that you have seen on so many older Grand Wagoneers where the rear springs have collapsed and flattened out, leaving the rear end lower than the front and leaving the left side lower than the right. 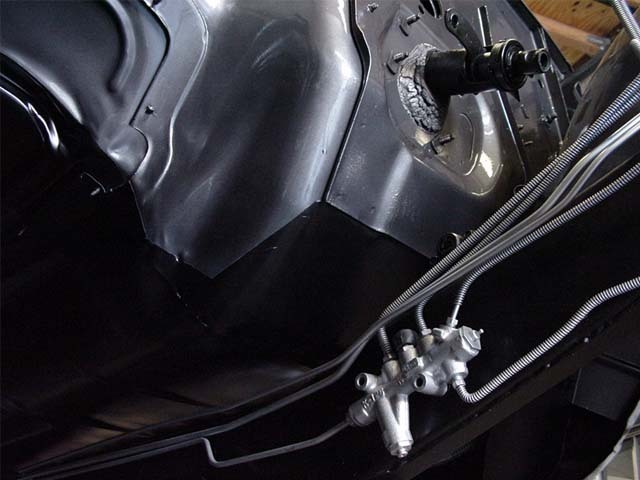 The underbodies, chassis and frames of my restorations are restored just as meticulously and to the same expert grade as the body and exterior. 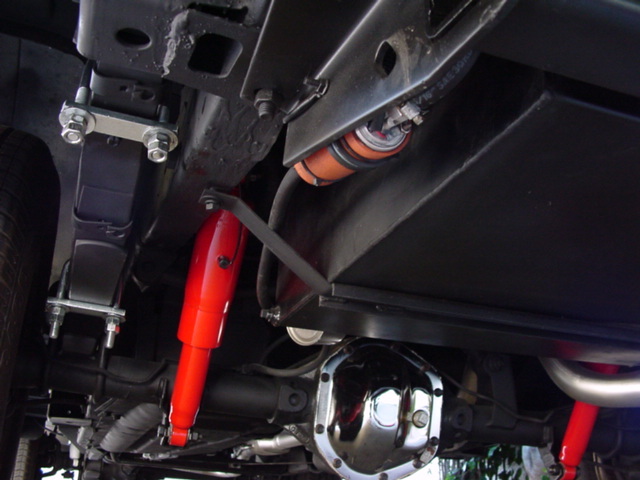 Besides just being spotless and clean, the entire frame, suspension, steering components and underbody sheet metal are specially prepared in a four step procedure to have much better corrosion resistance than the new factory Jeeps did. In the final stage, two grades of the best quality epoxy are applied in 3-4 coats, sealing out air and water and giving the bottom half of your amazing restoration ultra durable, extremely long lasting protection against the elements. 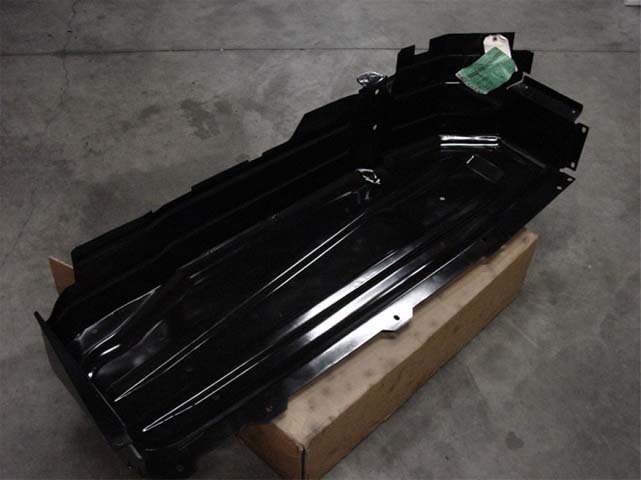 These weeks of extra work may not be immediately evident or appreciated, but they are absolutely critical to protecting your long term investment and in ensuring that your Grand Wagoneer’s irreplaceable body, frame and chassis is still in fantastic shape in 10 or 20 years. 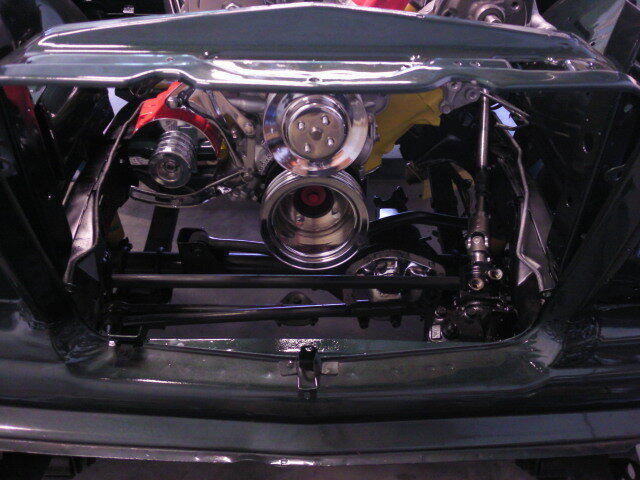 Front axel and front suspension is installed….now it’s time for the brand new super-motor to be dropped in! 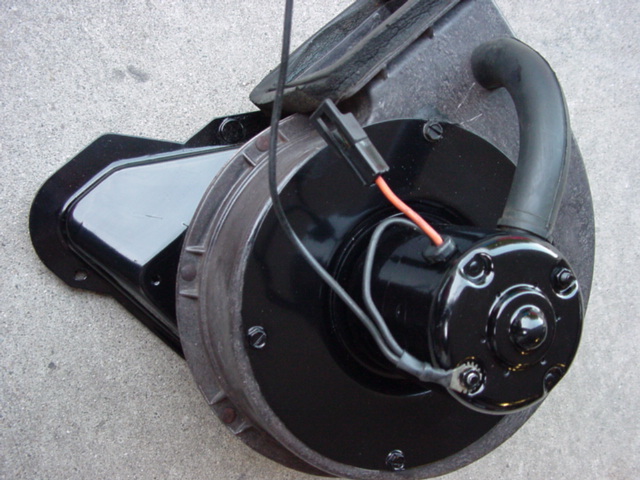 A professionally rebuilt and properly adjusted rear differential with upgraded heat dissipating aluminum cover, all new hardware, new fuel tank skid plate, new fuel hoses and hardware and an absolutely spotless, completely rust free and four layer epoxy coated and sealed underbody. 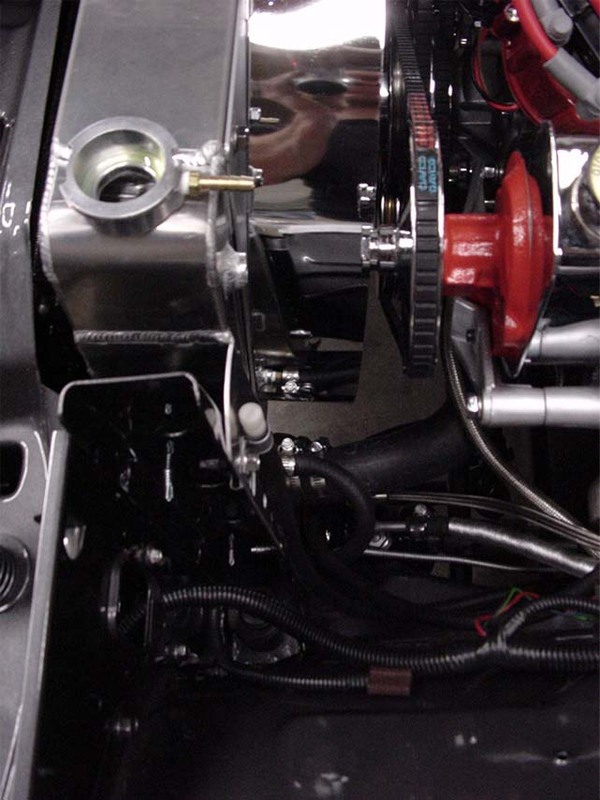 Some of what you see below is my custom modified radiator assembly, my custom fabricated chrome radiator shroud, a new, fully chromed oil pan and engine pulley set, a high output performance alternator, and my custom modified and expertly set up oil pump pickup and assembly. 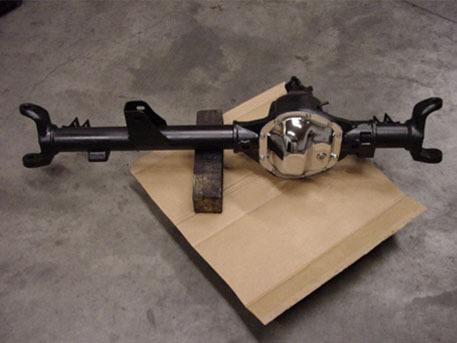 Below we have a new, upgraded U-Joint performance steering shaft that is about to be installed. 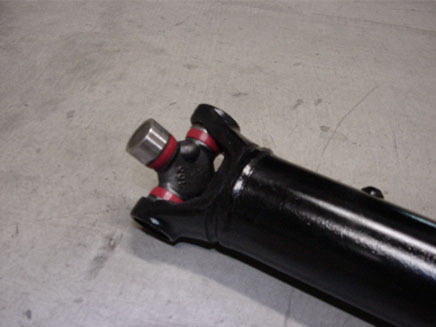 These superior shafts eliminate the soft and failure prone rubber steering coupler disc that contributes to the loose, “floaty” steering wheel feeling of a factory Grand Wagoneer. 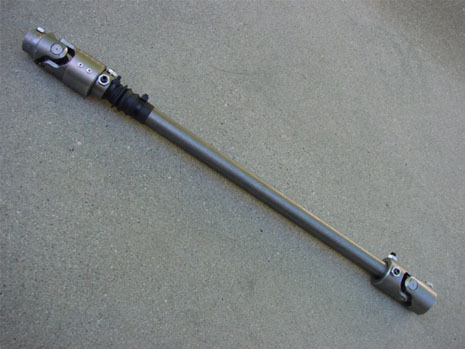 Installation of this shaft, along with a new, tight, properly adjusted high performance steering gear box, all new suspension components, new tie rods, all new bearings, new end links, all new suspension bushings, performance tires, etc. 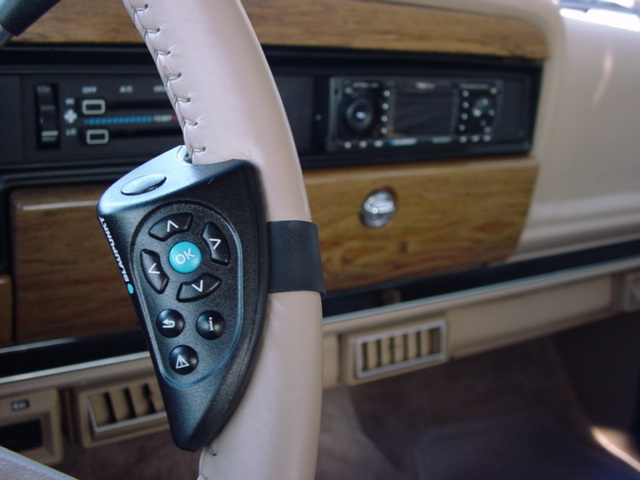 create the crisp, responsive and “tight” steering that allows my fully restored Wagoneers to respond and handle more like a 2010 sports-SUV than a decades old used truck. 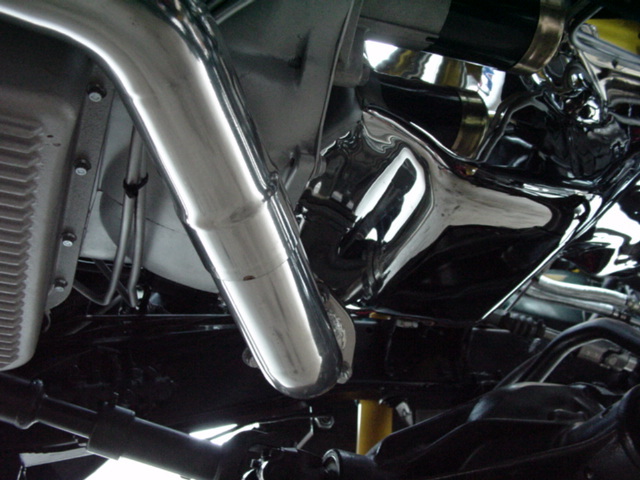 The gorgeous new Y-pipe of the ceramic coated performance exhaust system, a fully restored front drive shaft with all new high performance U-joints, and my all aluminum, finned, high capacity transmission pan. It is always a tragedy when one looks at a Wagoneer that, upon cursory inspection seems to be in good condition, only to discover that all of the drivetrain and ancillary mechanical components have oil leaks. This is not only a problem because it stains your driveway and makes your underbody filthy, but also very dangerous. 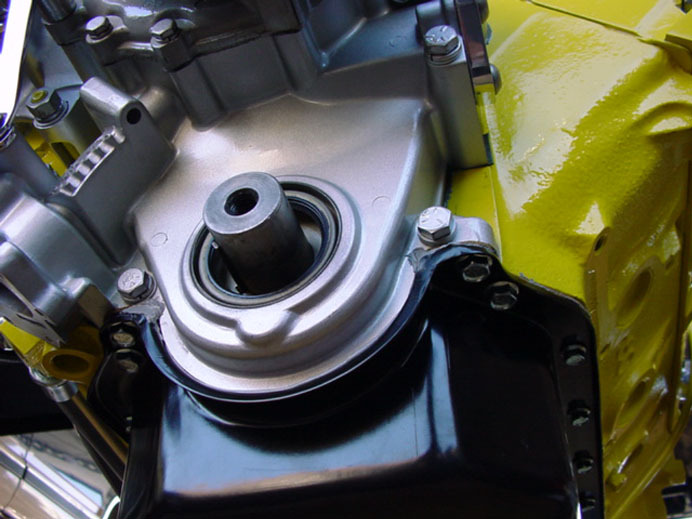 Oil leaks in the transmission, motor, power steering, cooling system, differentials or transfer case are the most common reason for these components to fail. 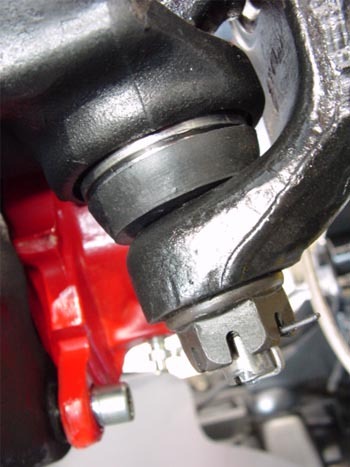 In fact, Jeep mechanics know that about 70-90% of the failures in these components result from oil leaks that cause the component to run dry and lose internal lubrication and cooling without the driver being aware. 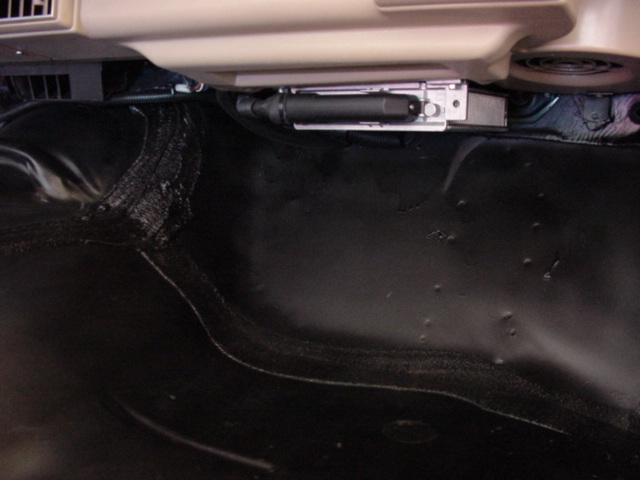 Leaks are also very labor intensive and costly to fix. 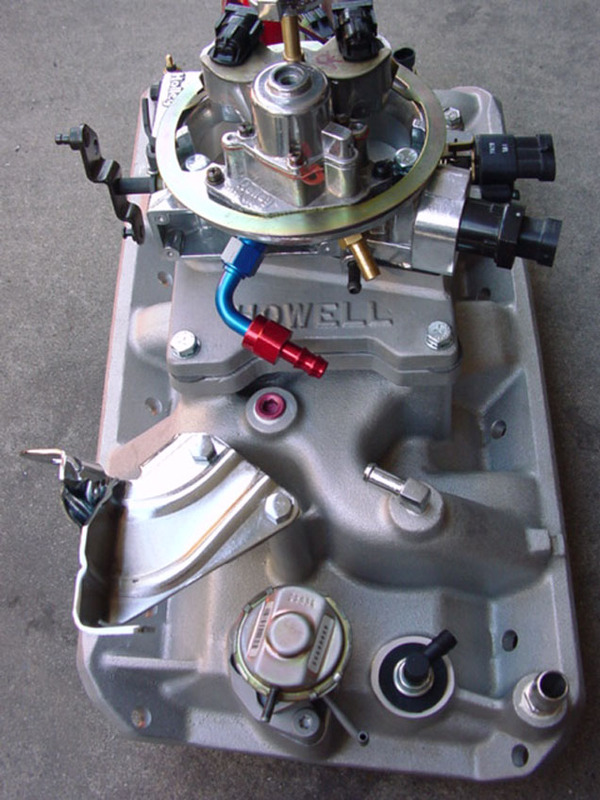 Since the entire motor, motor components (water pump, power steering pump, fuel pump, etc), transmission and torque converter are brand new, and both differentials as well as the transfer case etc., have all been disassembled, adjusted, serviced and resealed, these Jeeps will be clean, reliable and safe for many, many years. 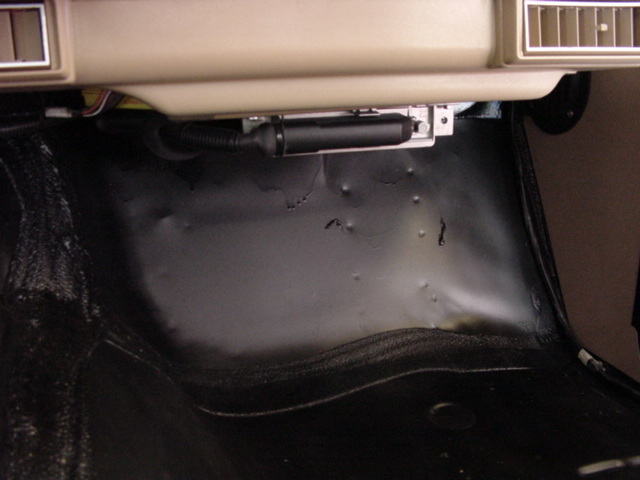 And, you will save yourself (literally) a few thousand dollars just on the common leak repairs that you would have when purchasing the typical original-condition, low mileage, used Grand Wagoneer. In the photo above you can also see the brand new performance ceramic EXHAUST, a brand new high performance power steering gear box (eliminating the loose, “floaty” steering that plagues all stock Grand Wagoneers), the all new suspension components, bushings, leaf springs and tie rods, the all aluminum radiator, aluminum engine pulley set, brand new custom chrome oil pan, and the German-made Bilstein custom-valved performance shock. 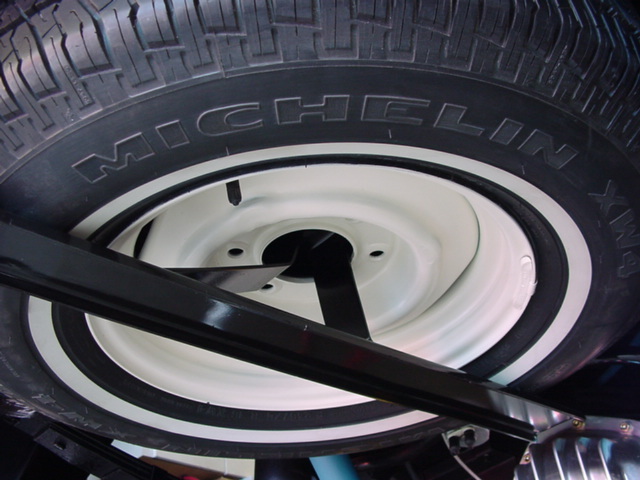 Below, you can see that along with the fully restored bracket, even the spare tire is new and the factory steel white spare tire wheel has been fully restored to AS-NEW condition! 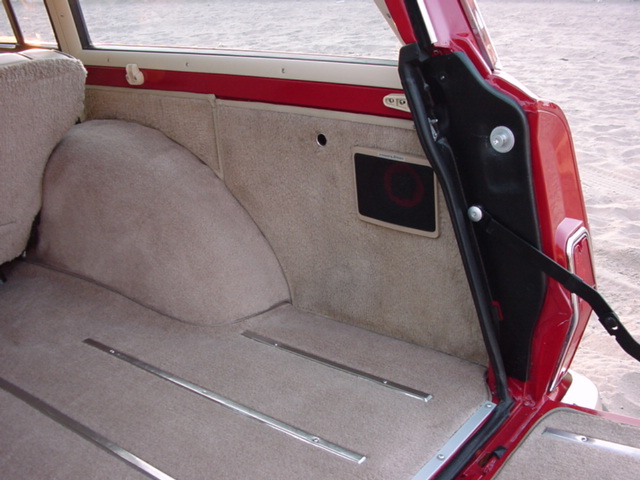 Undoubtedly, one of the finest features of all of our Jeeps is the interior. These interiors were, as already stated, in great condition when they were purchased as donors. Now, after months of restoration they look new. 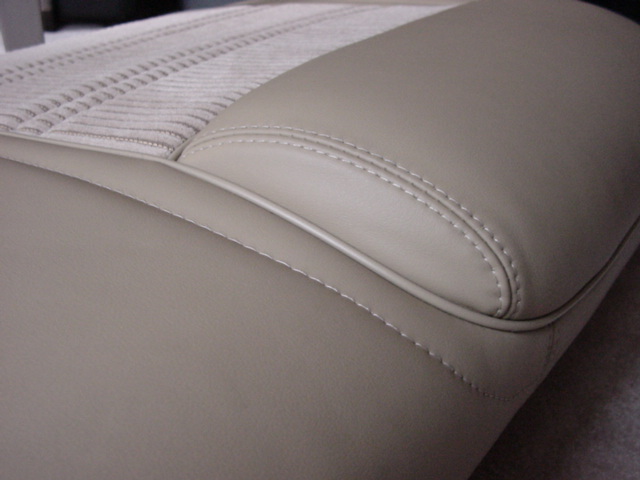 The leather is the highest grade available…supple, strong, pliable and soft with a luxurious, buttery “hand”. Out of the best quality full hides, I carefully hand select only the finest, most durable and unblemished portions of the hide. Often, more than half of even a high quality hide is thrown away because it does not meet my quality standards. 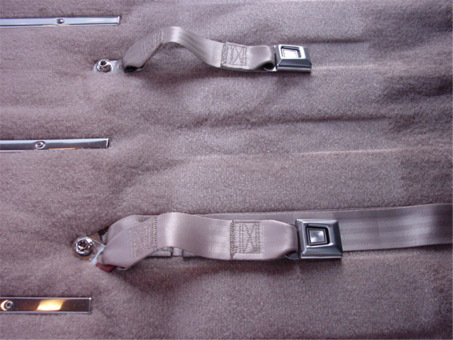 The cloth seat centers are made of brand new, ultra durable, factory, OEM "Cumberland chord" fabric. 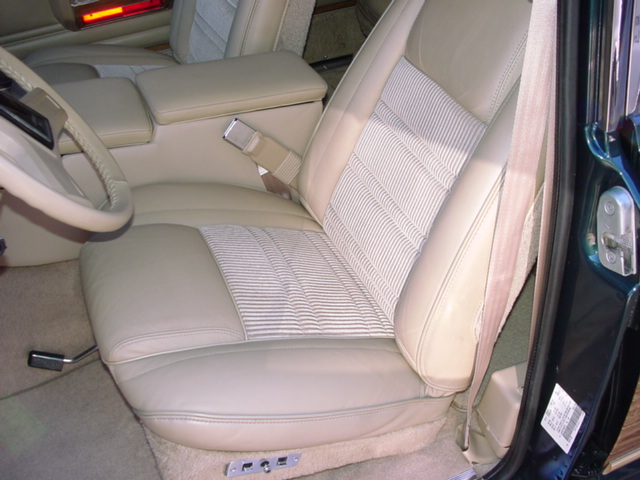 Therefore, the seat centers are bright, spotless, and have no discoloration, staining or matting like what you find on any used cloth centers that have been deep cleaned/renewed and not replaced. 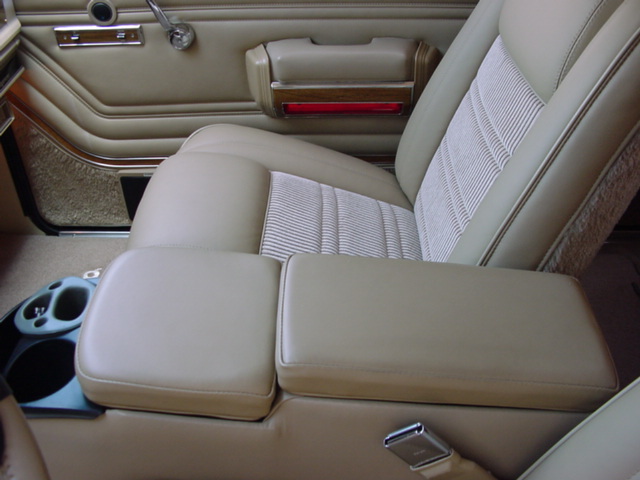 The luxurious, durable and elegant looking Cumberland chord seat material was discontinued long ago in the two interior colors used on 1989-1991 Grand Wagoneers, and is no longer available anywhere. 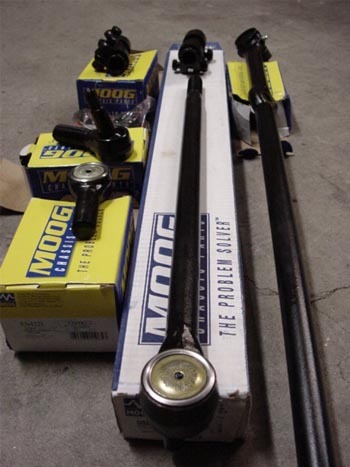 Luckily I had the foresight to purchase the last two large commercial rolls from Chrysler Jeep’s factory supplier and the biggest East Coast wholesaler in 2002-2003. 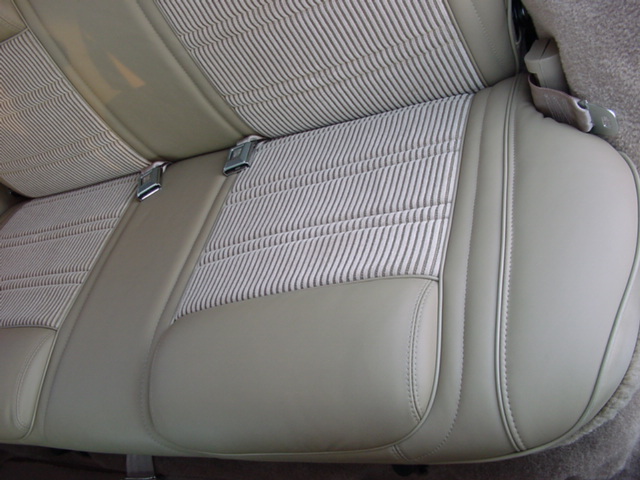 Therefore, I am in the unique position to be able to replace this impossible to find factory original material when performing our interior restorations. 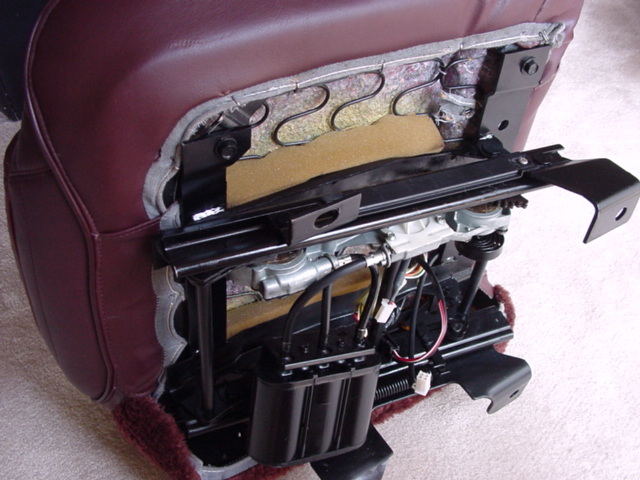 The seats and rear bench are completely disassembled and all components and materials are replaced or restored. The frames are stripped, painted and sealed with a much better epoxy finish. 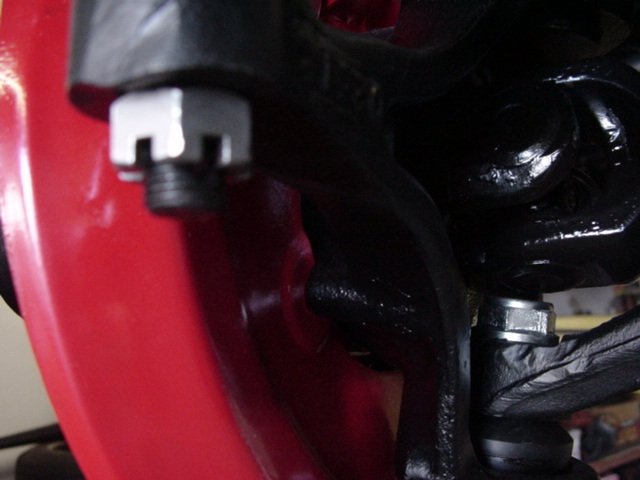 The springs and tracks are cleaned and lubricated. 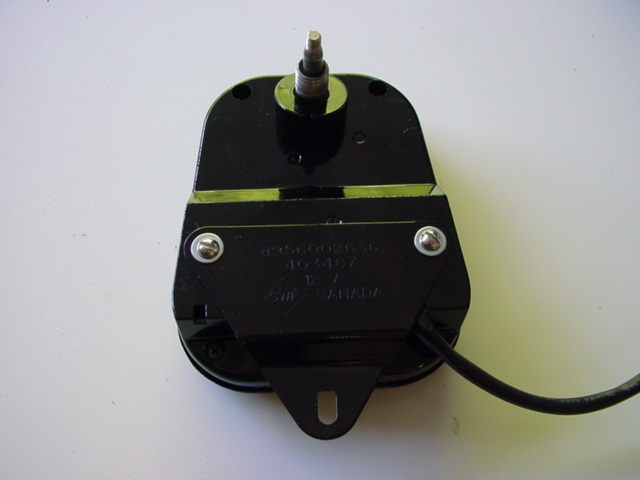 The electrical components are disassembled, cleaned, and sealed with dielectric grease. 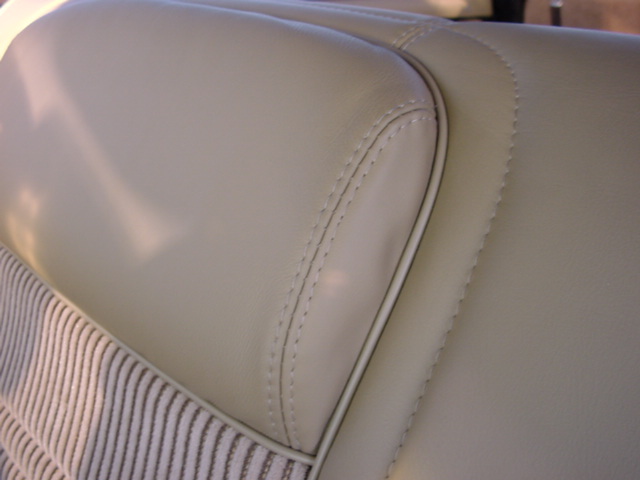 More importantly, we don’t just install one or two new panels of non-matching, inferior leather like so many other shops do. 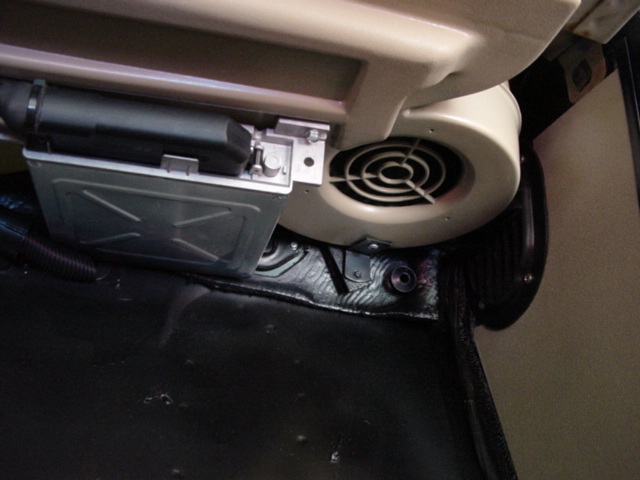 We replace the entire seating surface including the FOAM CORE of the seat. 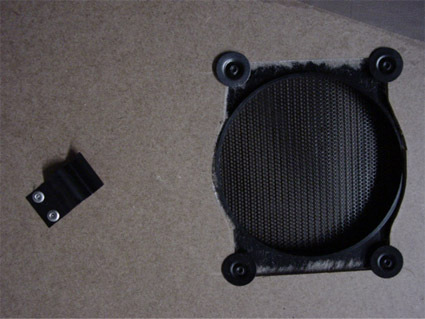 After almost 20 years, the factory foam is compressed, deteriorated and spongy. 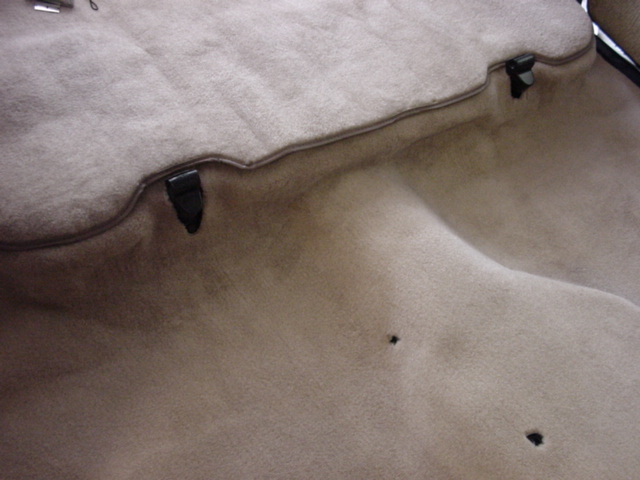 We custom cut and shape new foam, in several layers, and even include very expensive higher density foam on the outside seat bolsters in order to minimize the compression that usually happens immediately due to getting in and out of the front seats. 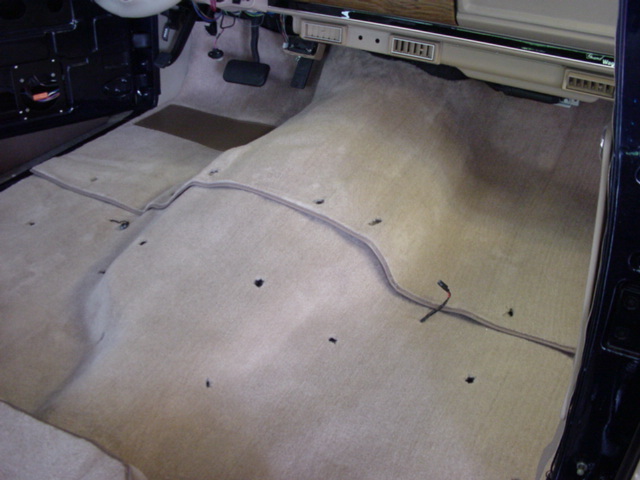 Then, the entire seat cover (leather and Cumberland cord) is custom cut and trimmed and receive a fully sewn webbed foam backing to increase durability and softness. 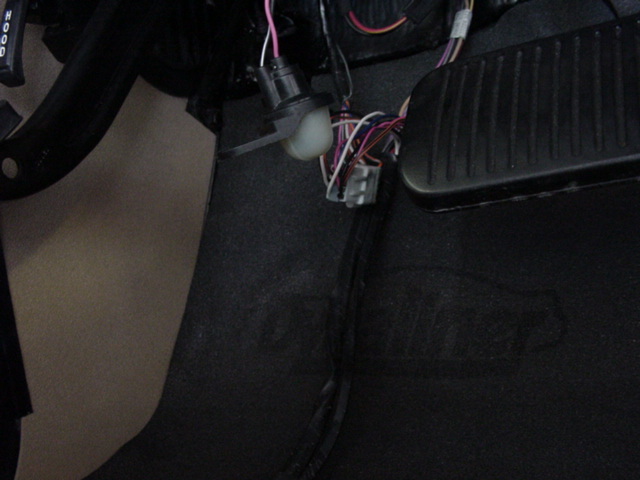 Then the new seat cover is installed with all new hardware and is adjusted and contoured to fit perfectly. Our upgraded , ultra-luxurious padded steering wheel leather feels so nice that it makes you never want to take your hands off the wheel. 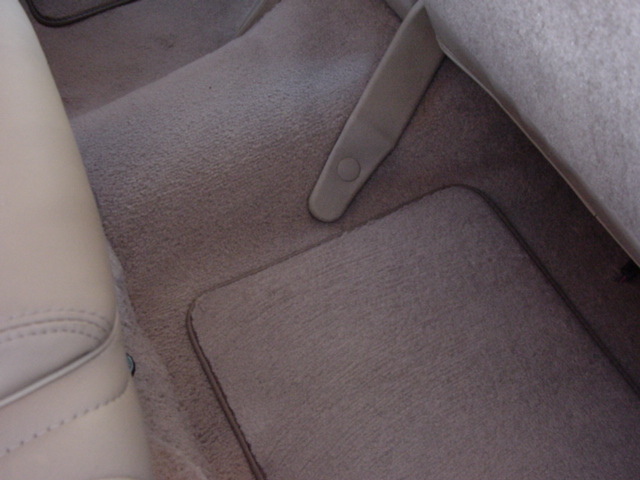 The upgraded, cut-pile carpet looks like it has never had a pair of feet on it…. because it hasn’t. 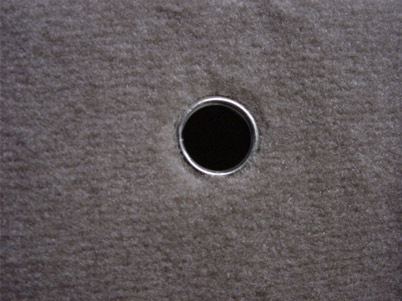 We install custom molded, high quality, color matched carpeting that is vacuum and heat molded to fit the floor pan perfectly. 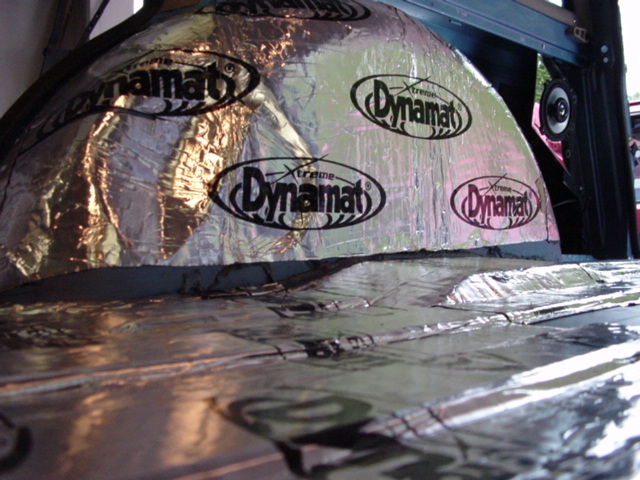 We also install several layers of the highest quality heat and sound attenuating insulation available. 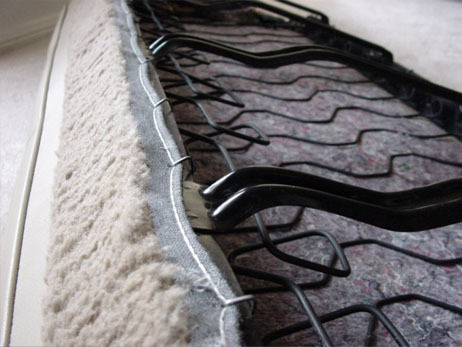 The carpet itself has better than factory insulative backing to add heft, improve fit, and to enhance durability and noise/vibration reduction. 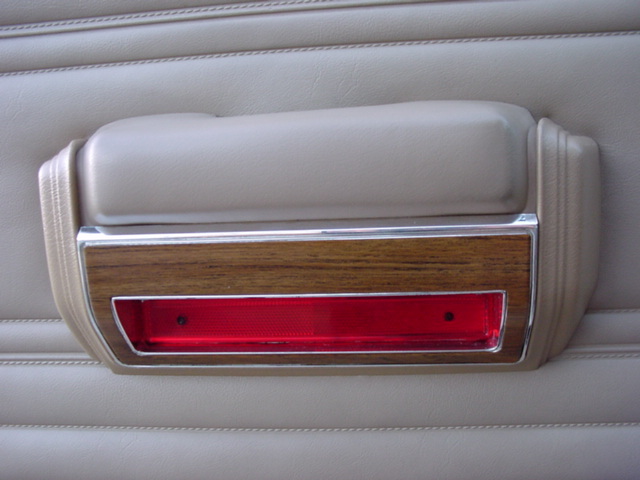 All of the interior plastic and vinyl trim pieces have been restored to like-brand new condition. 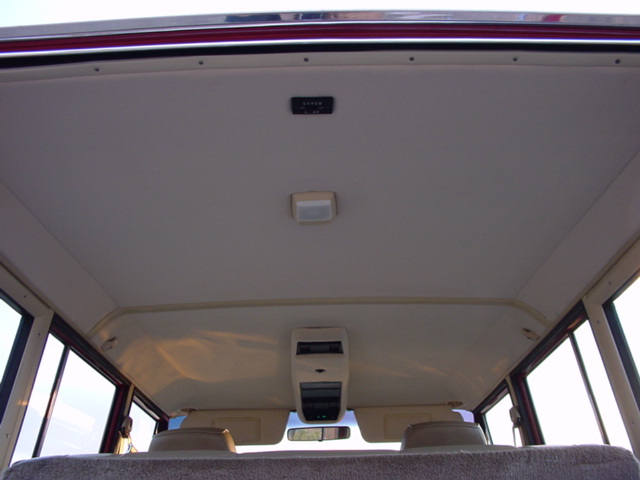 The headliner, sun visors and overhead console materials are brand new, using better-than-factory materials with superior foam and adhesive that will prevent the all too common headliner sagging that plagued factory Wagoneers. 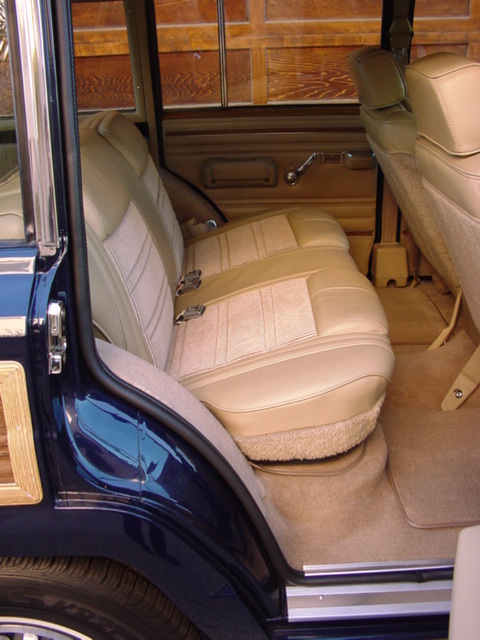 I have included a complete list of the most important items of the interior work that are done in the COSMETIC RESTORATION section of this website, for your perusal. These close-ups showcase the new interiors. Please excuse the fact that the carpet fibers are not combed straight in all the photos (any discoloration or distortion in the carpeting is due to fibers being combed in different directions). Even all of the areas that you DON'T SEE are fully restored! 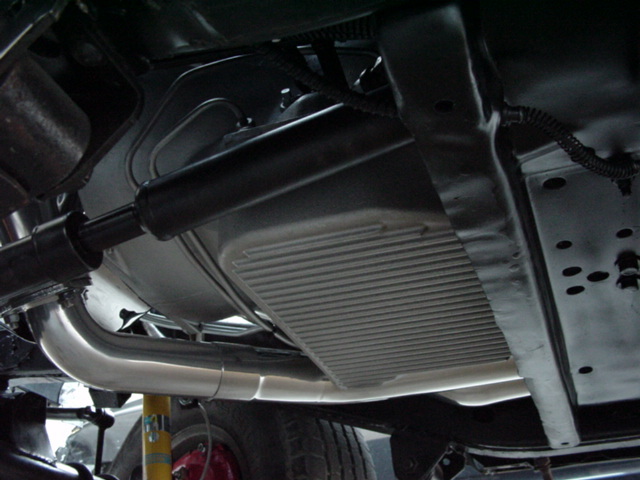 Our Jeeps don't just look good on casual observation....anywhere you look, inside the body panels, under the carpet, anywhere on the underbody and engine bay, under the seats, looks spotless and amazing. These are TRUE, Full, Professional frame-up restorations! 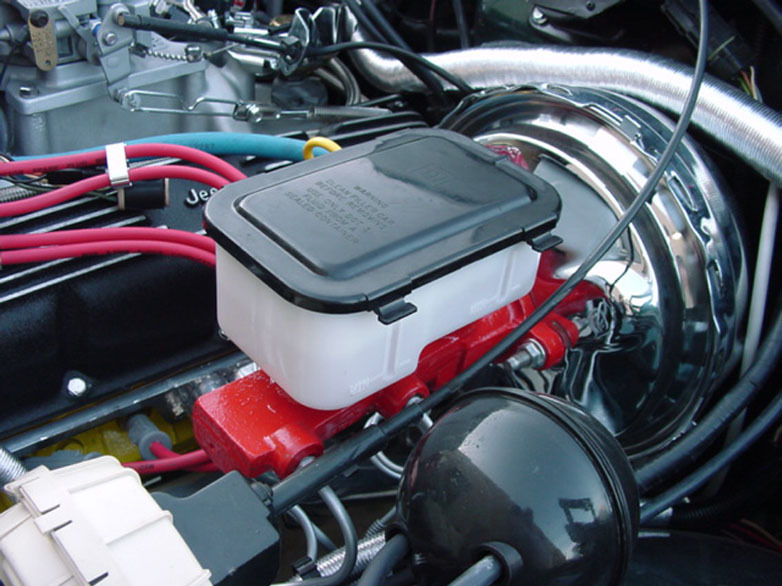 This focus on restoration and repair of all of the “invisible” areas that can cause reliability issues extends to every square inch of the body, exterior, mechanical systems, interior and electrical components. 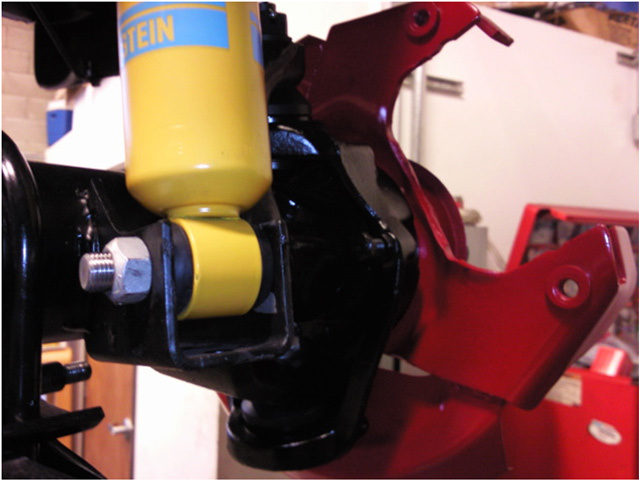 My restorations are truly complete and every part of the Jeep is comprehensively addressed….not just those things that a client notices in photos taken from 6 feet away! 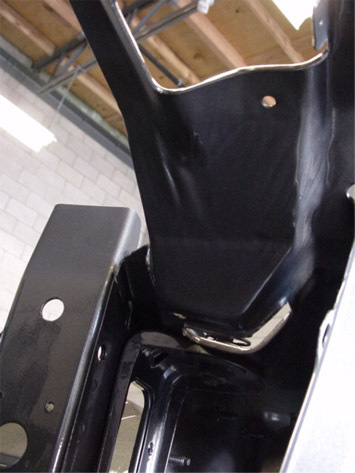 That includes the "invisible" factory seat frames which are disassembled, stripped and epoxy coated, lubricated and reassembled. 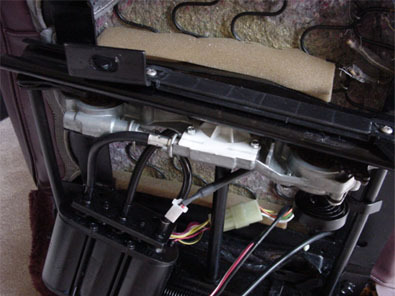 All electrical connections and wiring are inspected, rewired, replaced or completely cleaned and then dielectric grease coated, reassembled and thoroughly tested before being mounted to the newly upholstered seat. 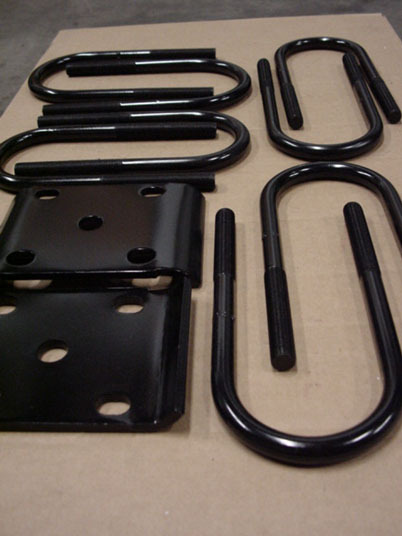 Below is a sequence of photos showing the various restoration stages for a REAR BENCH Assembly. 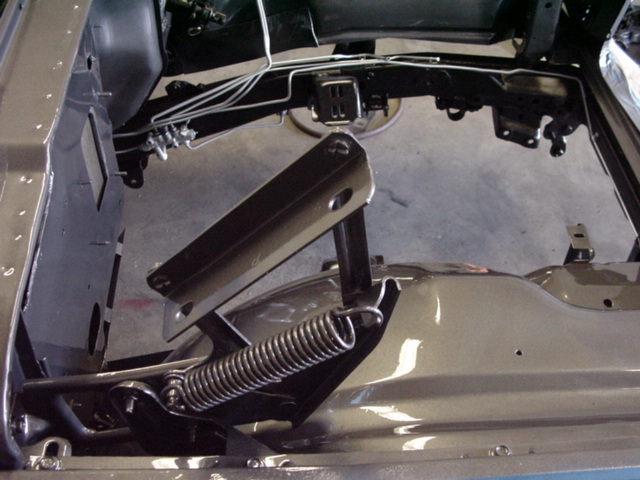 The entire frame is stripped and either powder coated or epoxy coated, the springs are tightened and adjusted, the jute backing, insulation and foam are replaced, all new hardware is installed, including new chrome assembly bolts and screws, the rubber bumpers are replaced. 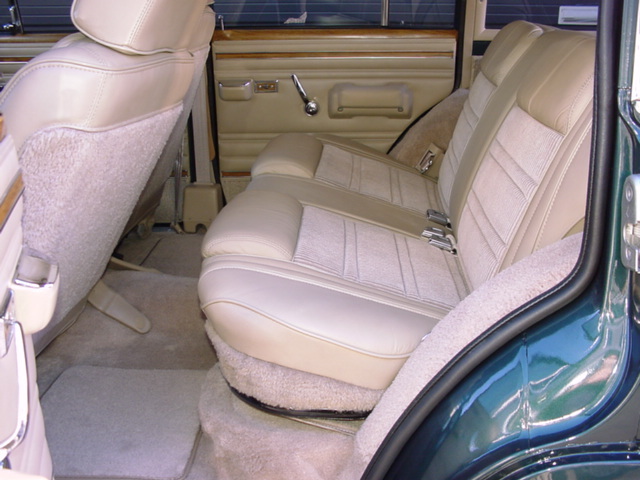 At the same time, the expertly crafted new custom seat cover assembly is made using the highest grade automotive upholstery leather and the only remaining factory “Cumberland Cord” cloth seat insert material in the original, factory colors. 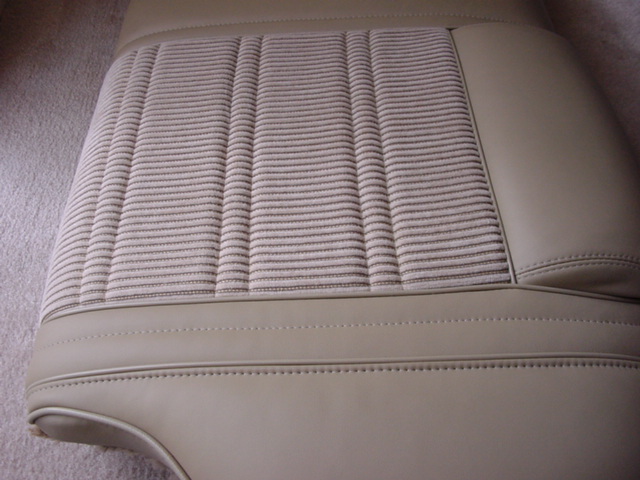 These seat covers receive fully stitched high quality net foam backing and are a three layer construction. 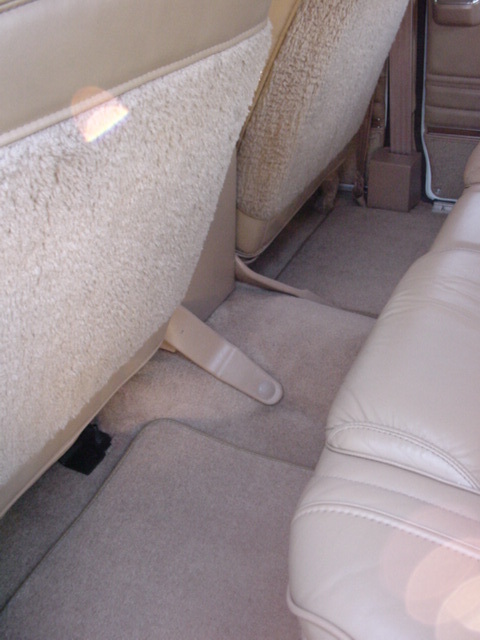 The leather is not only ultra-high grade, but also is a perfect color match for the remaining interior trim and carpet. 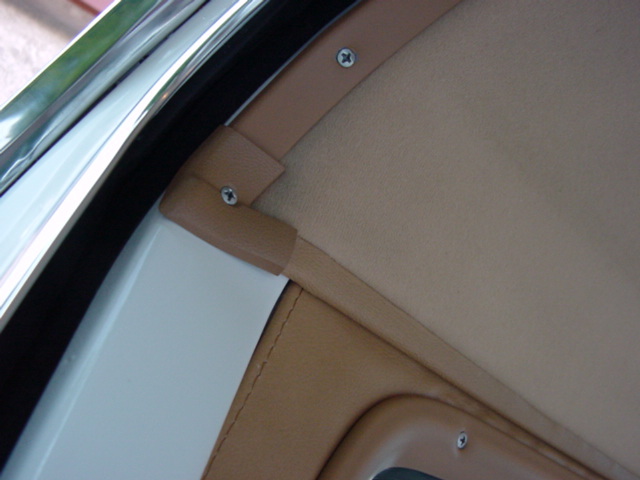 And, above all, the craftsmanship, attention to detail and precision cutting, shaping and sewing of the new seat cover assemblies is the highest quality workmanship that you will find in the automotive industry. Highest quality materials, including the very durable factory Cumberland cord cloth seat centers, and flawless fit and finish! 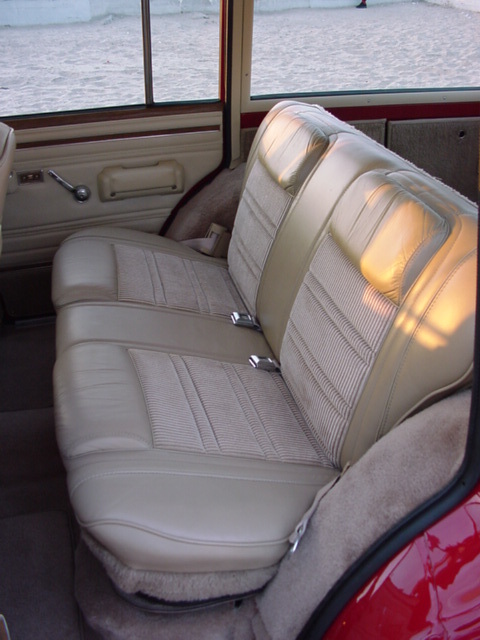 Not only are these seats completely restored and just like new again, but they are also uniquely comfortable compared to most modern cars and SUVs. 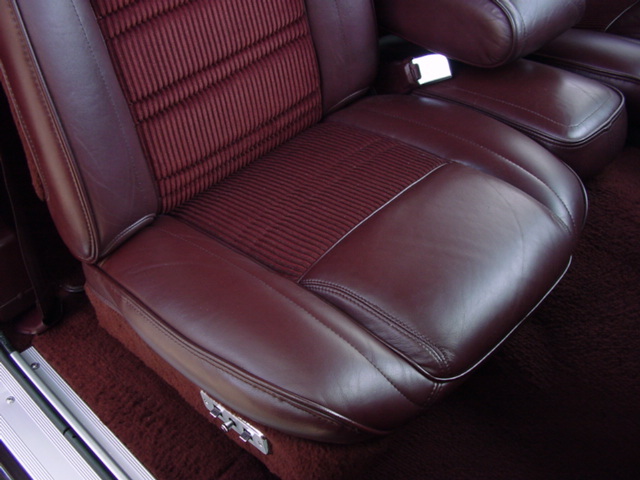 With the addition of the custom, matching leather upholstered center consoles that we build in-house, it's almost like sitting in your favorite lazy-boy, or on a super comfortable couch at home. 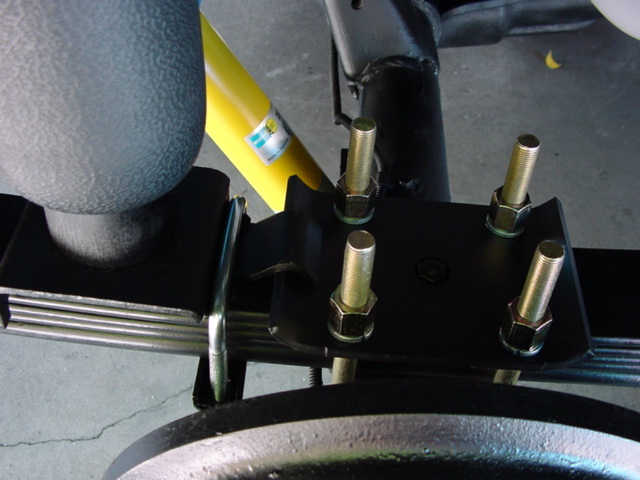 I even add custom made, plasma cut epoxy coated steel seat spacers (in the exact shape of the original frame legs) to the front mounts, so that the factory seats can recline further than is normally possible. 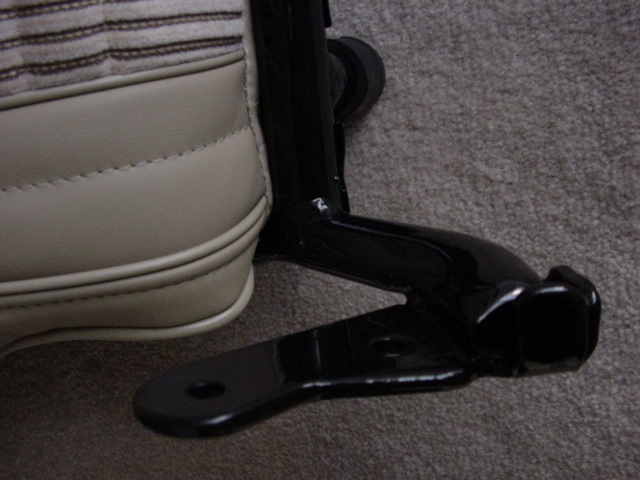 These little extras take the already comfortable factory designed front seating to a whole new level! 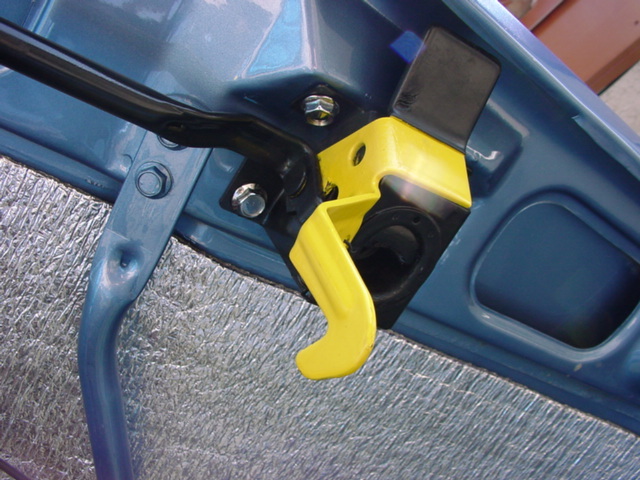 One of my custom seat-frame mounts for a dry chemical fire extinguisher. My extinguishers are mounted in a way that they are invisible from outside or inside the vehicle and are completely unobtrusive. 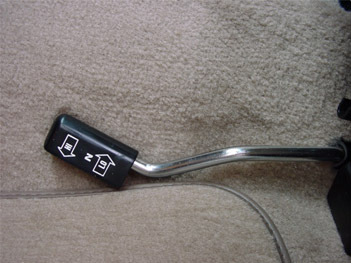 Yet, in an emergency, they are quickly and easily accessible (with a swift lift of the white release lever), from the driver’s position, or from the passenger’s side. 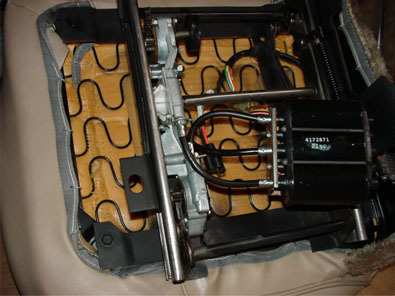 Note: The rear bench quickly and easily folds forward, or is completely removable by one person (no bolts or screws to undo). 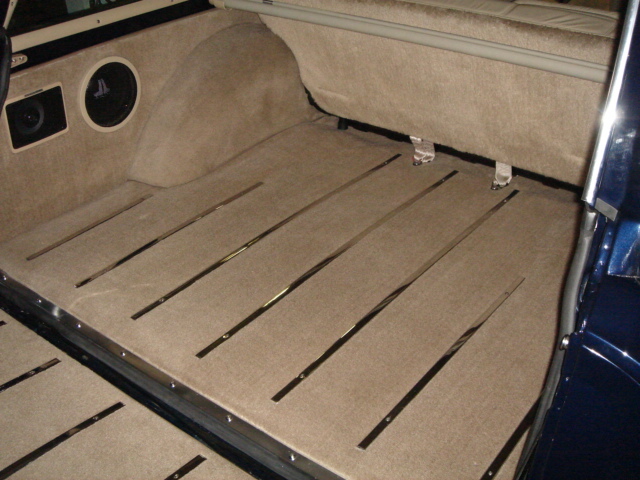 With the bench folded forward or removed you have a 7+ foot HUGE cargo area! 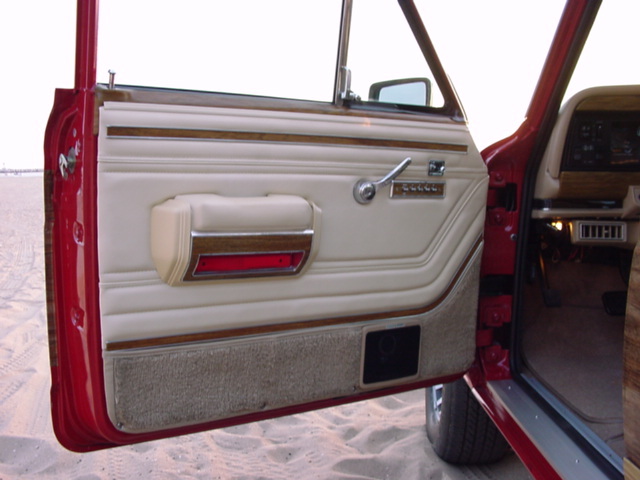 The door panels and all interior plastic and vinyl trim is spotless and in perfect condition. Nothing is cracked, scratched or broken…and everything works like new. 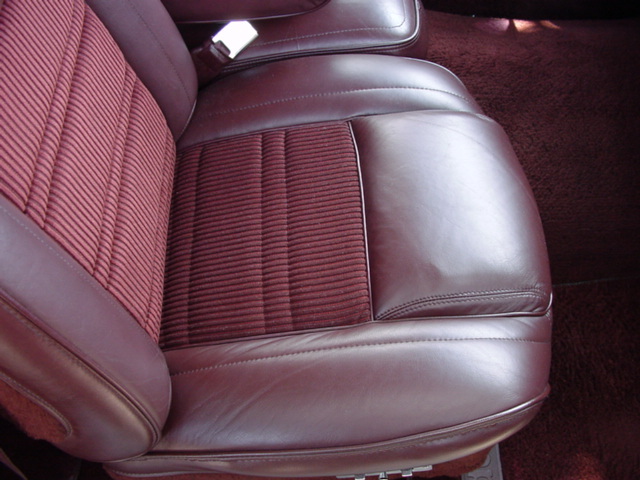 Very importantly, our Jeeps have brand new, ultra soft, slightly thicker, more padded, steering wheel leather for an almost decadent luxury driving experience and “feel”. 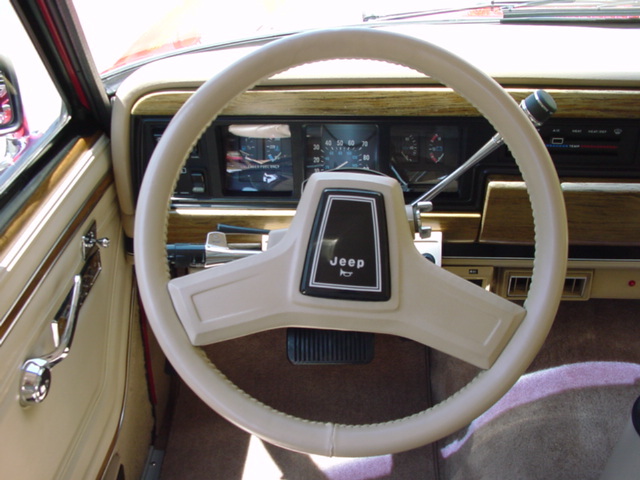 You know from the first time that your hands touch the wheel that you are in a "new" grandwagoneer.com Jeep! 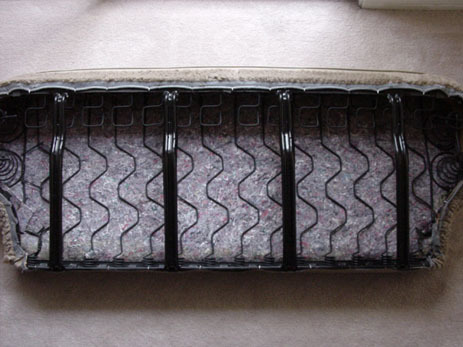 Beautiful, spotless and odor-free….new, cut pile, high quality, color matched carpeting, front and back (Please note that any color distortion is caused by the digital camera and flash and is due to the carpet "nap", or hairs facing different directions). 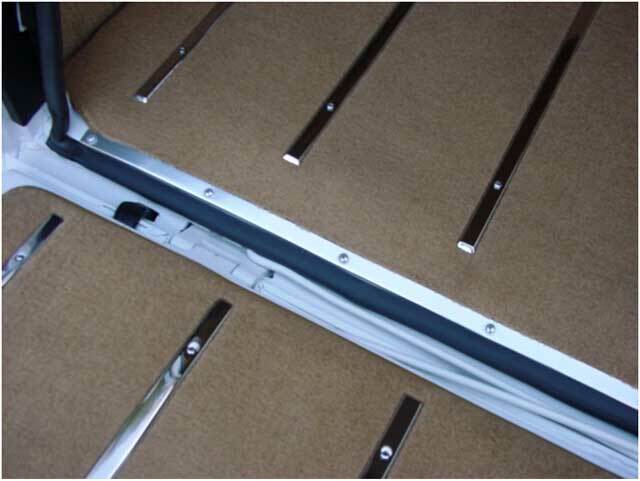 In the three photos below you see our stunning new polished stainless steel cargo and tailgate slide rail and carpet retainer upgrade, along with my custom made rear carpet retainer strips, improved tailgate wire insulation and all new chromed steel and stainless steel hardware. 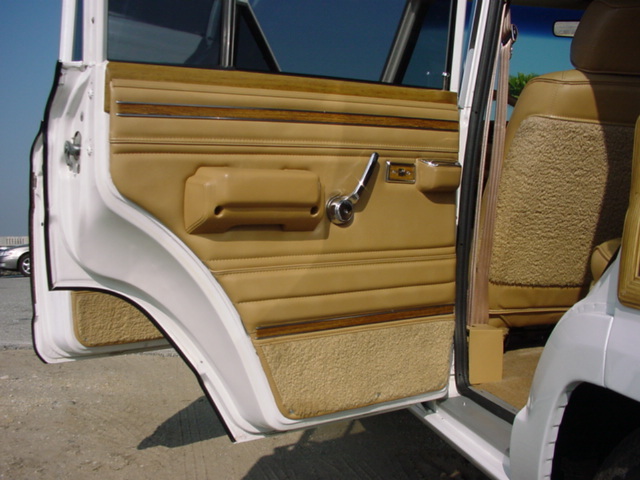 All four door panels and all interior trim are always stunning and pristine! The new carpeting, refinished polished stainless steel cargo and tailgate slide rails, refinished speaker covers, fully restored interior window trim frames, restored tailgate plastic cover pieces, the new tailgate seals, the new custom striker bolts, the new rubber bumpers, the refinished tailgate arms, the new anodized carpet hold down, the new stainless steel screws and fasteners, the fully restored and refinished upper tailgate trim etc. make the tailgate area (like every other area) of our Jeeps look stunning. 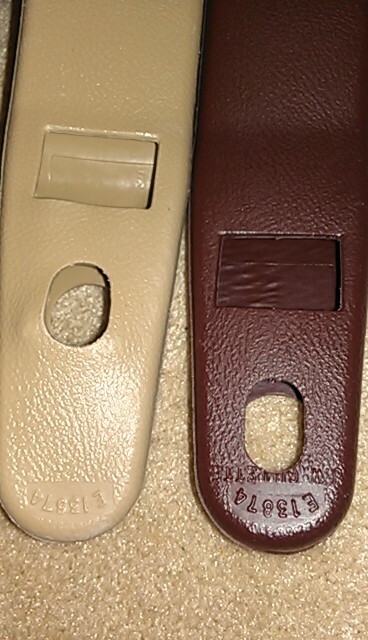 Below you can see the new, higher quality custom cut and factory color matched kick panels. 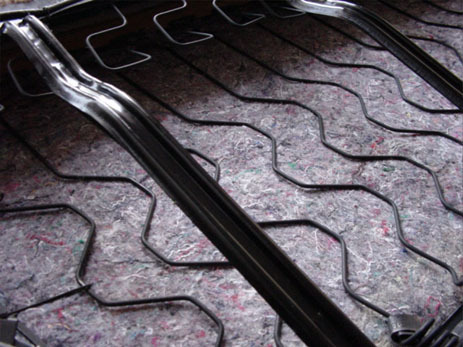 These kick panels will never warp or deteriorate like the factory pieces did. 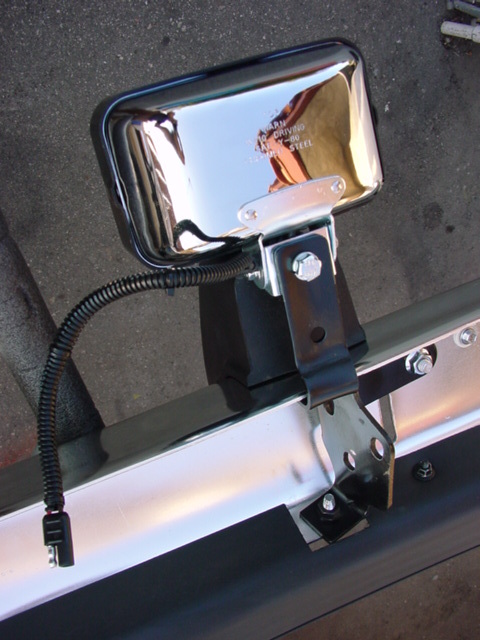 You can also see the refinished pedal and emergency brake levers, the new hood release lever, the new factory pedal pads, and the refinished kick plate retention strip. Here are a few close-ups of my custom made center armrest and storage consoles. 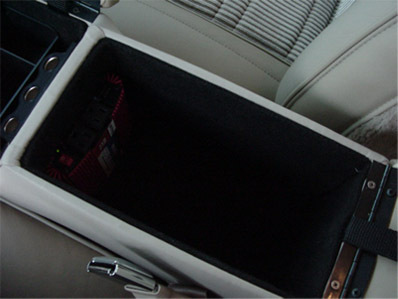 From the factory the Grand Wagoneer had almost zero storage space…just a tiny glove box that is a quarter or less of the volume of the average glove box in a modern vehicle. 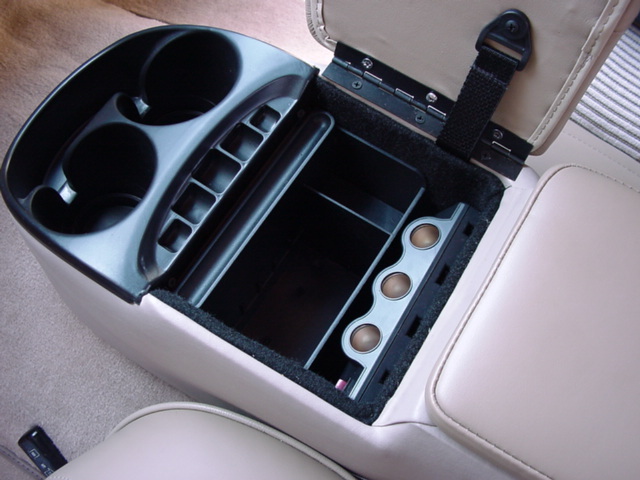 My custom designed and in-house built consoles not only provide a huge additional volume of storage space, but also neatly compartmentalize and organize the things that most folks have in their cars: loose change, a pen, sunglasses, their cell phone, the Jeep’s manual or maintenance records, their coffee cups, CDs, etc. 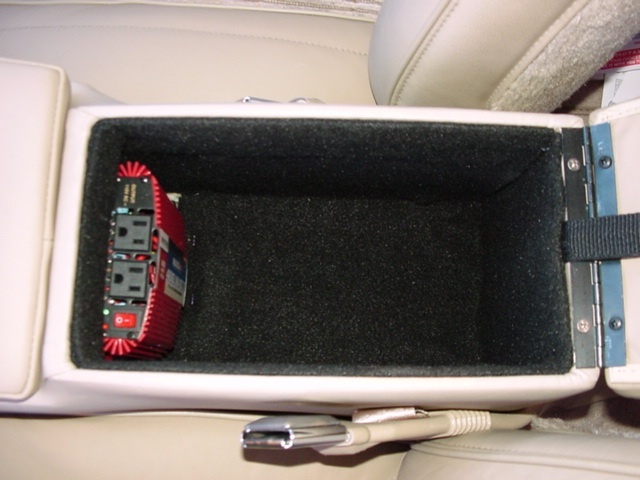 As an added feature, my consoles contain a recessed three outlet cigarette charger assembly that allows you to charge your cell phone, ipod, or camera while those items stay neatly and SECURELY hidden and enclosed inside the console….no cables and wires dangling from the dash and no tip-off to thieves that there is something valuable in your Jeep that is worth breaking in for. The huge rear compartment is big enough to store a full sized laptop, a full sized notebook, lots of documents or paperwork, or any number of items that you don’t want rolling around on the floor of your Jeep. 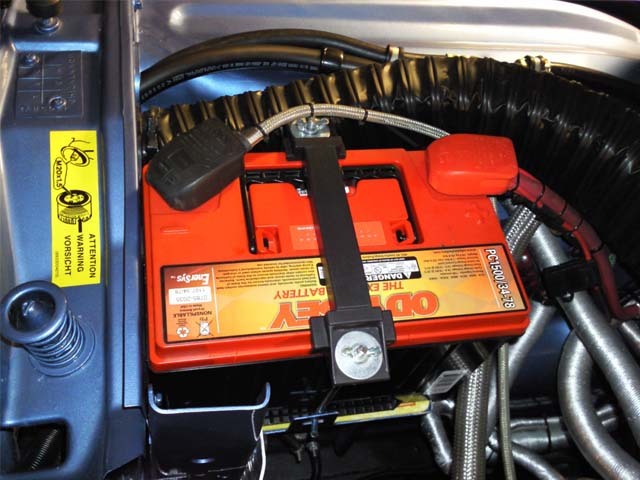 Also it contains a fully functional 110V power inverter that allows you to use appliances and chargers (like laptop chargers) that are made for household electrical outlets and current in your Jeep! 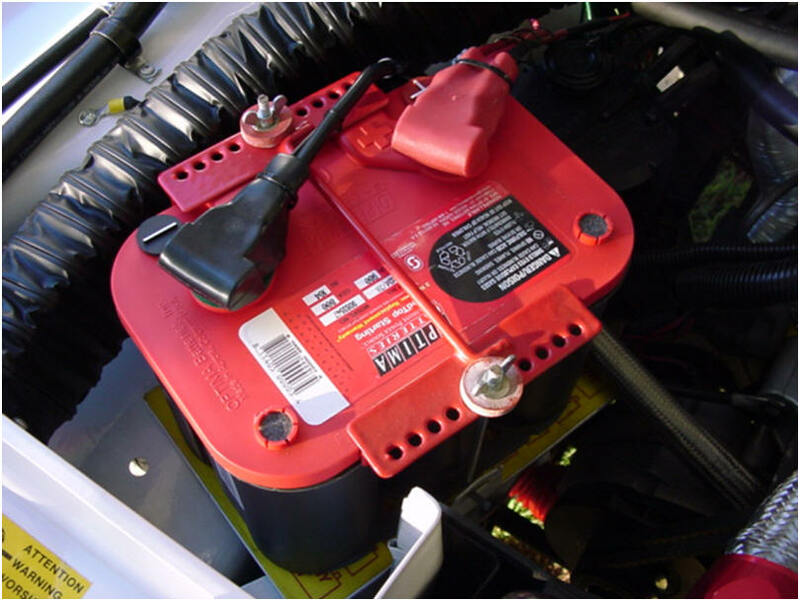 These converters have built in overload protection and an alarm that sounds if you overheat or overuse the inverter. 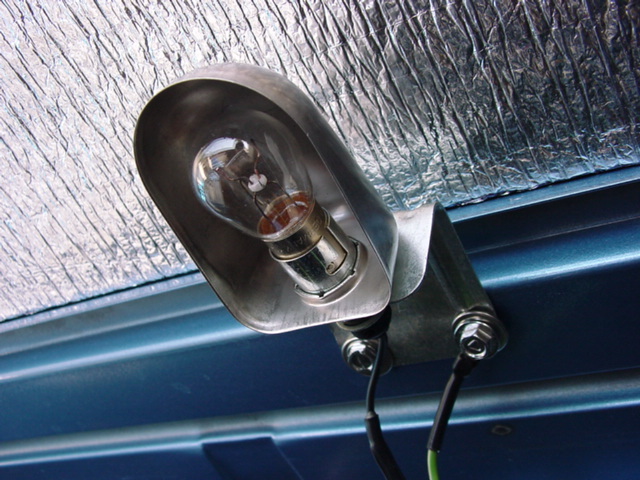 The wiring is of the highest quality and there are multiple fuses and circuit protections applied in the installation. 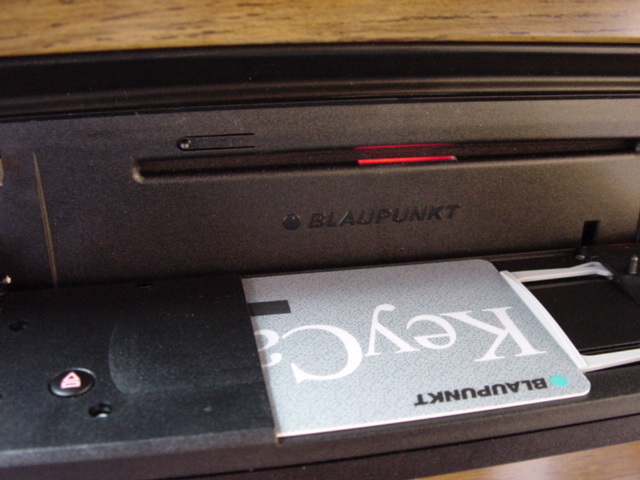 With and without my optional 10 disc CD Changer…. All of that utility is wonderful but not at the cost of cosmetics! 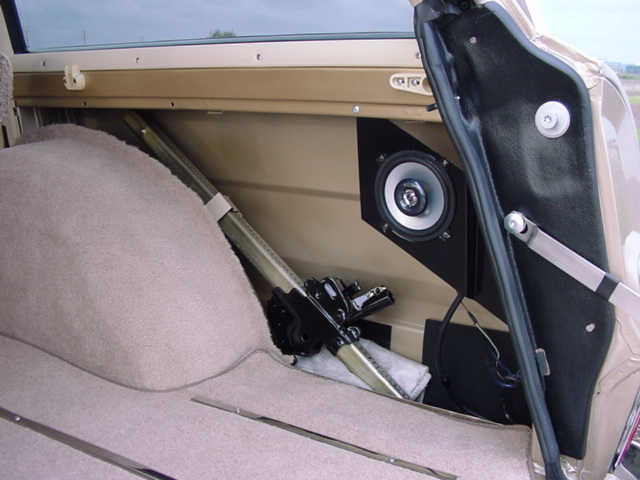 My custom consoles are not only supremely practical but they are custom upholstered in the same ultra high grade, matching leather as the rest of the seat and upholstery work. 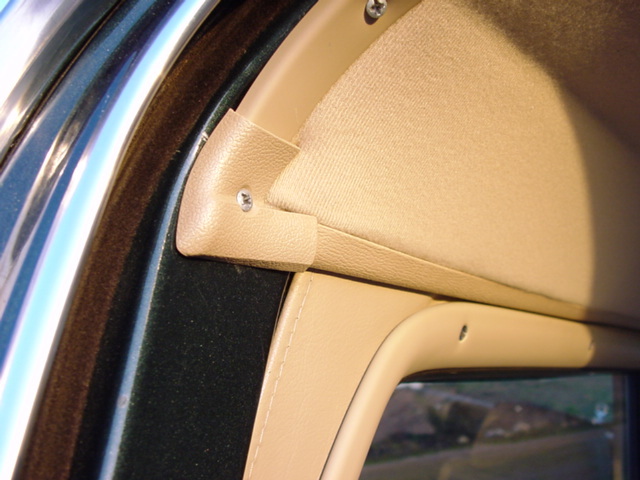 Even the bottom of my console lids are highest grade leather, and the finest quality of workmanship is in evidence throughout. My brand new custom cut and prepared rear side panels. 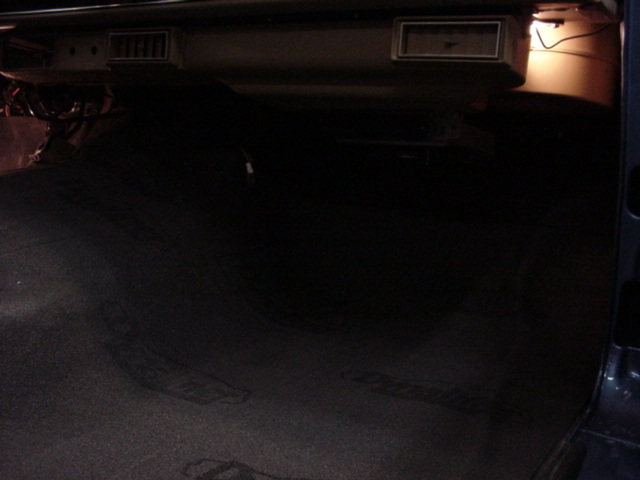 Beautiful new matching cut pile carpeting mounted over better than factory die-cut fiber board. 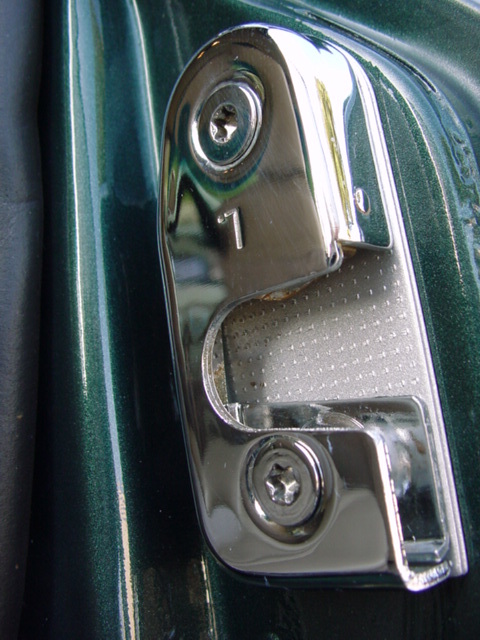 All of the factory retainers, clips and hardware is restored and then mounted using new stainless steel rivets and professional upholstery adhesive. 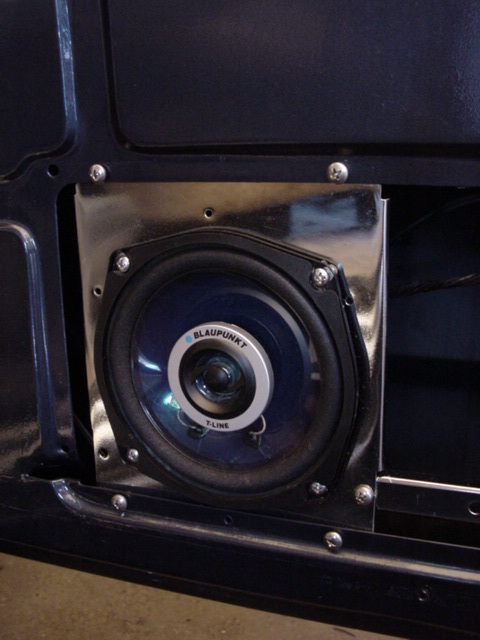 Of course the factory speaker grills are also fully disassembled, repaired, painted and re-installed. 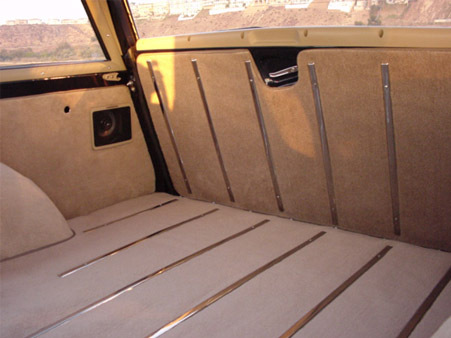 One of the coolest features of these beautiful Grand Wagoneer's new interiors is the fact that all of our restorations come with fully functional, fully restored, factory, retractable CARGO COVERS. 90% or more of the the woodies still on the road are either missing their cargo covers, or their covers are bent and unusable, suffer small rips, tears and discoloration, have broken springs, or no longer retract properly. My covers are fully restored to like-new conditions and functionality. 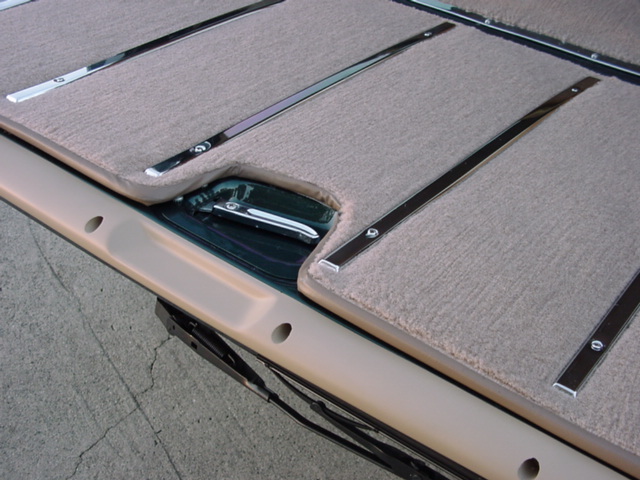 The covers are a very nice feature because they completely conceal the contents of the cargo area and are so easy to use. 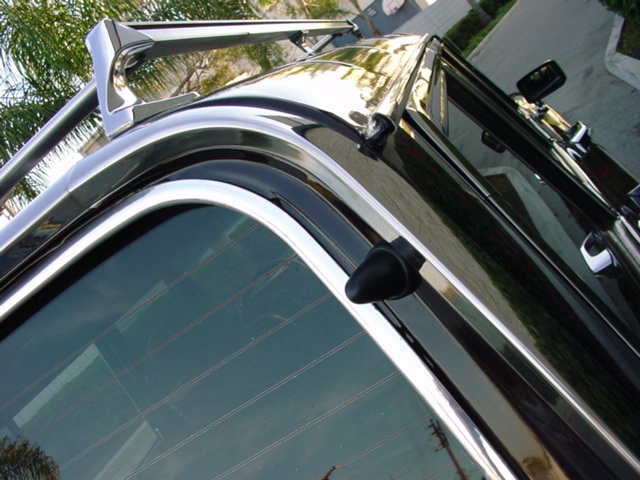 Another upgrade that I offer is beautiful, fully functional modern sunroof/moonroof assemblies. 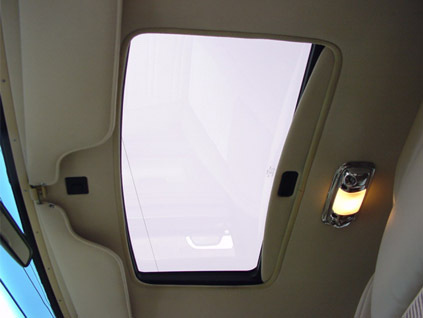 These are superior to the original factory option sunroofs, as they are larger, have better functionality (in terms of vent positions and glass positions), have one touch controls, and have better designed seals. HIGHEST QUALITY FULL Professional REPAINT using the finest paint materials available. Not just the exterior of the Jeep is repaired, prepared and painted. 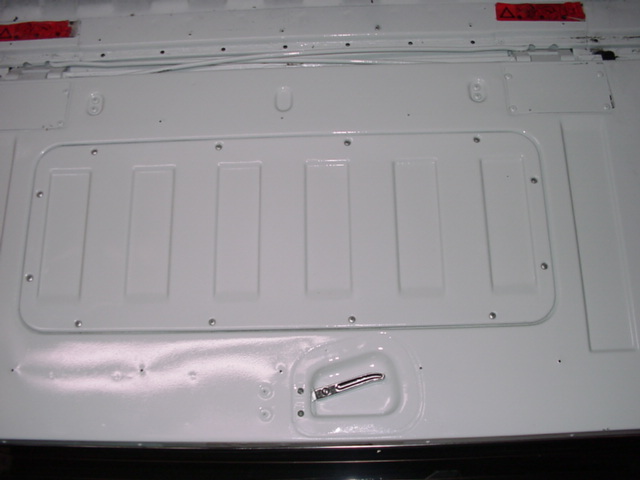 Many surfaces that even the factory did not paint are painted, including the inside of the quarter panels, inside of the tailgate, inside of the doors, the body and chassis floor, the inerior side rails, etc. 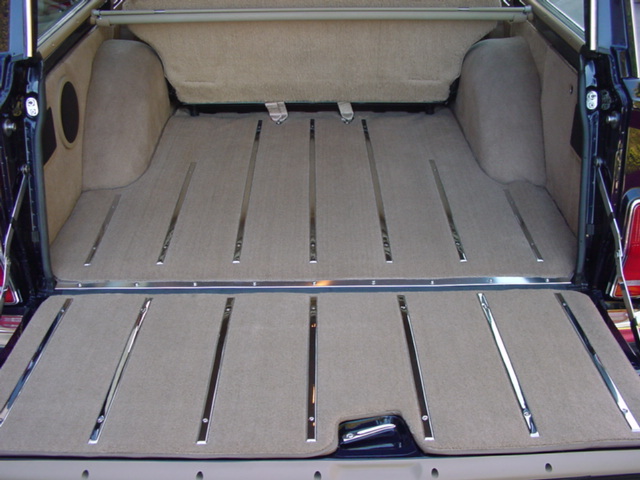 Of course every square inch of the engine bay, the door jambs, the door frames, the doors themselves, the tailgate, etc. are fully painted. After Paint: Complete 5 stage COLOR SANDING. 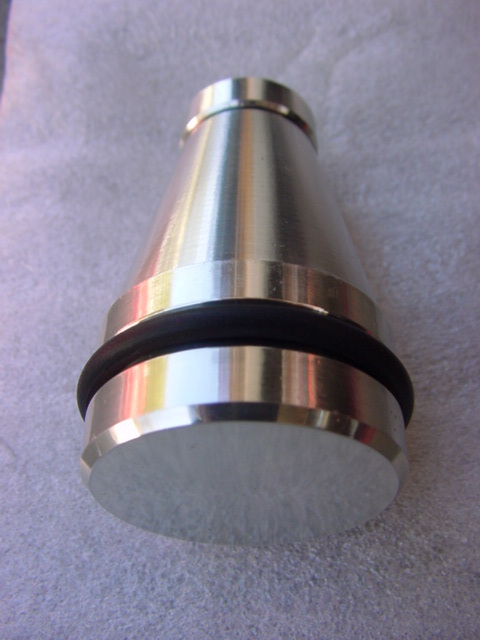 After color sanding is complete, Full Hand COMPOUNDING, Full Hand POLISHING. Full Hand GLAZING, SEALING and WAXING. This process can take over two weeks and is the hardest, most labor intensive and most “delicate” part of the restoration. 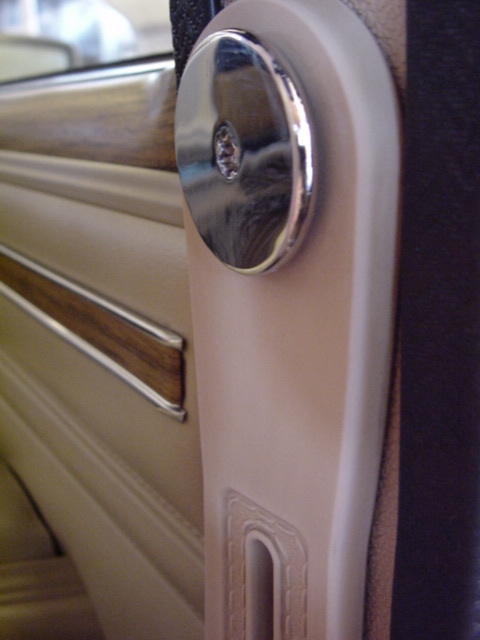 Five step WOODGRAIN SURFACE and WOOD BORDER TRIM RESTORATION. This restores luster, reflectivity and color depth. 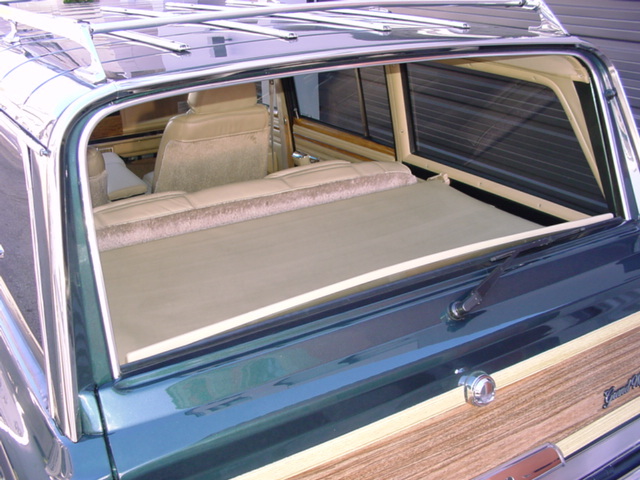 After restoration, woodgrain materials are REPLASTICISED and sealed to regain flexibility and UV protection. 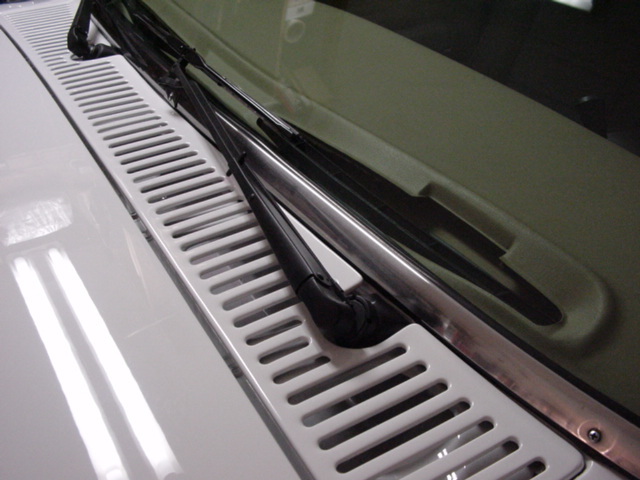 New Rear Wiper Arm CLEAR BODY PROTECTIVE STRIP to prevent rear wiper arm from damaging paint. Better than factory style material and application. SEATS FULLY DISASSEMBLED and REBUILT. Installation of new FOAM CORE and SEATING SURFACE. 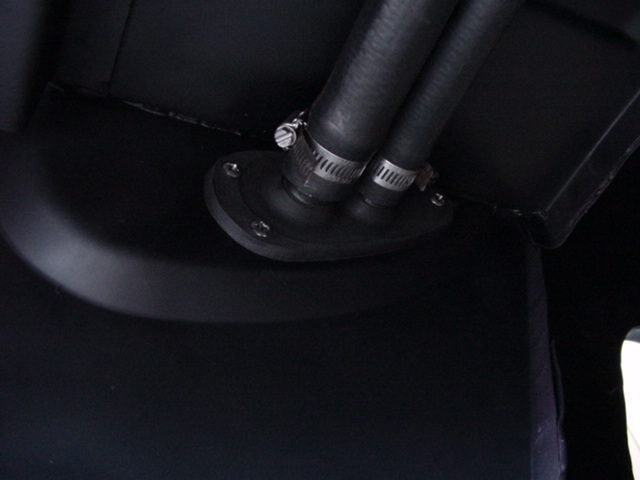 Fully restored SEAT BASES and electrical assemblies. As with the Mechanical Restoration Section, my current 1991 model year Ultra Restorations all have far more extensive cosmetic restorations than the “standard” list of restoration items that you see here. To receive a full “Specification and Build Sheet” for any of the ultra high grade restorations that I currently have in stock, please send an email request to the address at the bottom of the page. NOTE: To keep this website to a manageable length, and also to protect some of my proprietary techniques, the photos in the section below show the various body sections in their finished condition and are not necessarily examples of the techniques and process steps described. 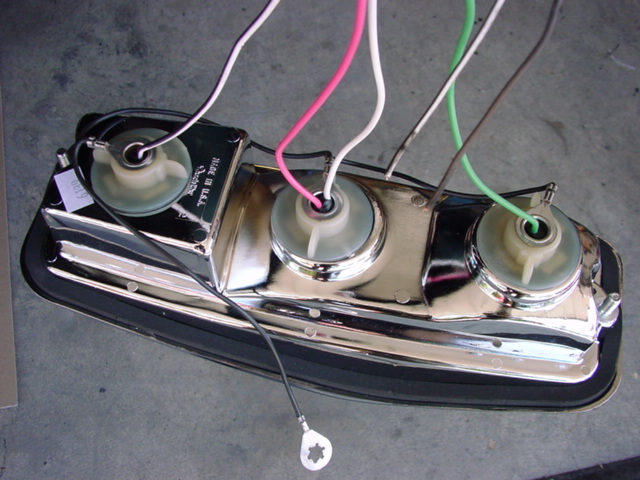 To begin my concourse quality cosmetic restoration process, the body is stripped down to a bare metal shell. 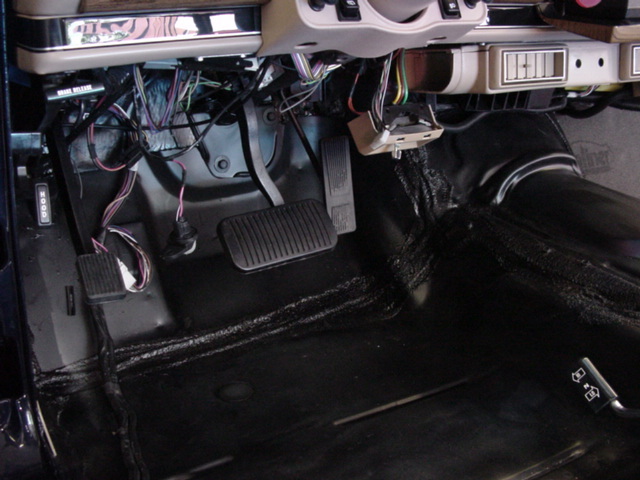 Every piece of the interior, all trim, all rubber and seals, all electrical wiring and harnesses, all glass and all exterior trim is removed. Next, the factory flaws are corrected. Grand Wagoneers were fully hand assembled and welded (no robotic assembly lines as on all modern cars)....unfortunately not always with the greatest care. 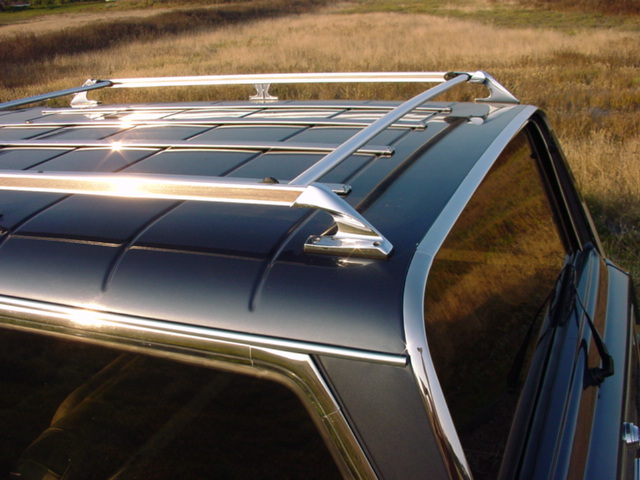 Every Wagoneer that I have ever worked on had areas of poor panel alignment, inaccurate welding or less-than-ideal body lines. 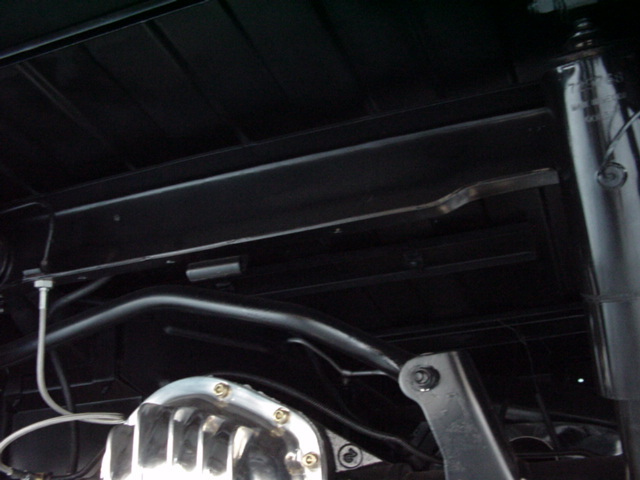 Therefore, this stage is comprised of corrective work including but not limited to, straightening the welding and alignment of the rain gutter rails, the door hinges/strikers/shims and latches for best body seams and door alignment, the tailgate hinges/shim/latches and strikers, the hood hinges pins and hood release bar, the body extensions and fill panels, and repairing the poor alignment and assembly of the fuel filler "cup" to the body that caused the factory wood laminate to always crack and tear around the fuel filler area. 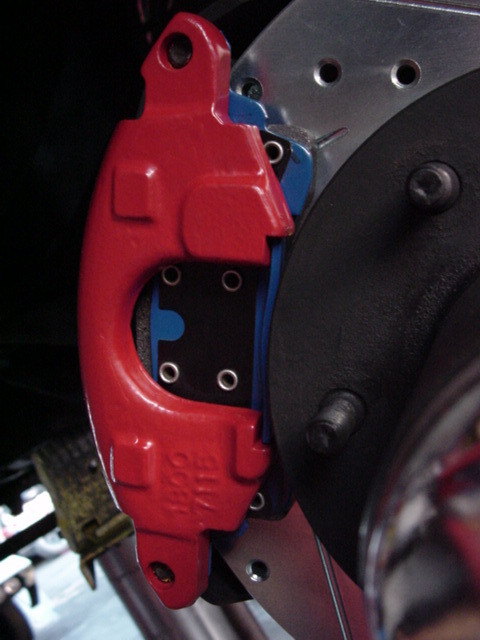 Once these factory flaws are corrected as much as possible, the now-improved alignment of the components is marked and etched into the metal. Then, the entire body is disassembled. 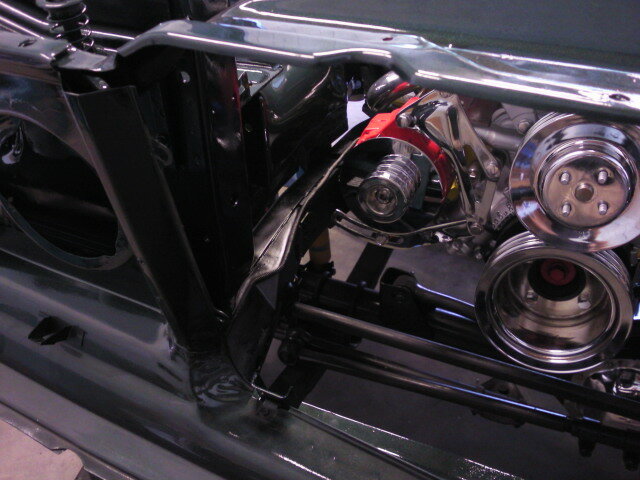 Then once the sheet metal is stripped of old paint and seam sealer, world class body work begins. 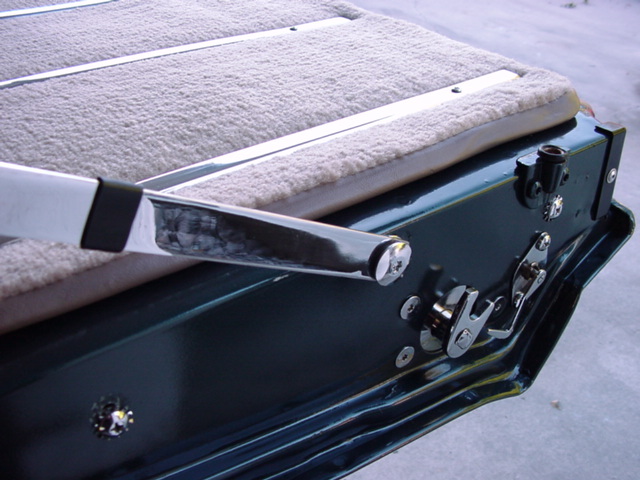 The majority of the body work is completed through PDR (paintless dent repair) , and the long lost art of metal work using dollies/hammers/spoons and picks (tools used to stretch, bend, reshape and shrink the raw metal. 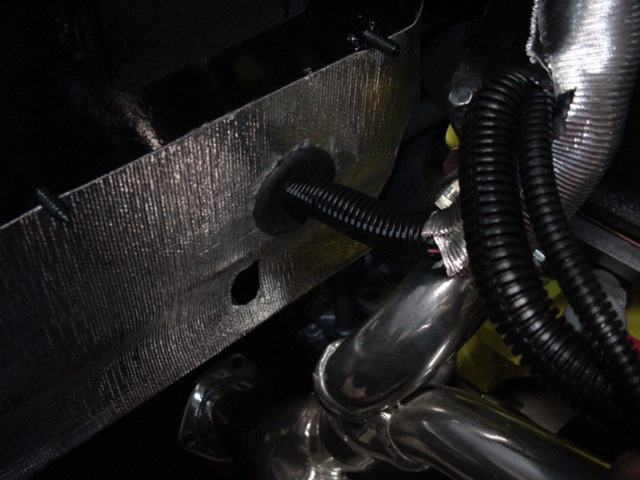 Although this is radically more time consuming than using drills, welding pins, using dent pullers and just applying body filler everywhere, it provides the finest, most durable long-term body integrity. 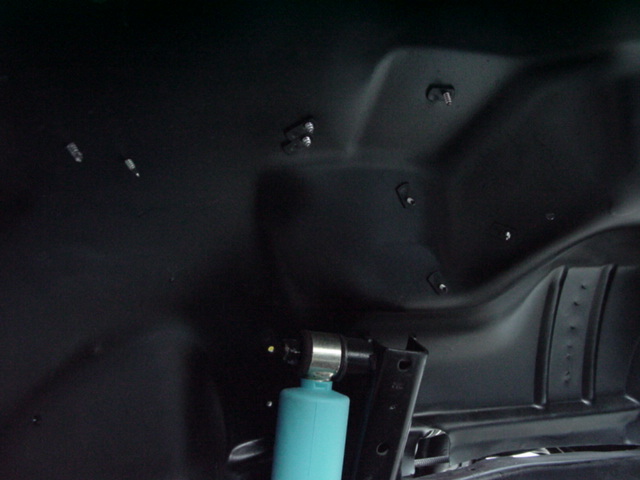 After body work is completed, and zinc is applied to key areas, spray and tube seam sealers are used at factory and custom locations. Then a sealant poly-primer is applied, followed by finishing primer. 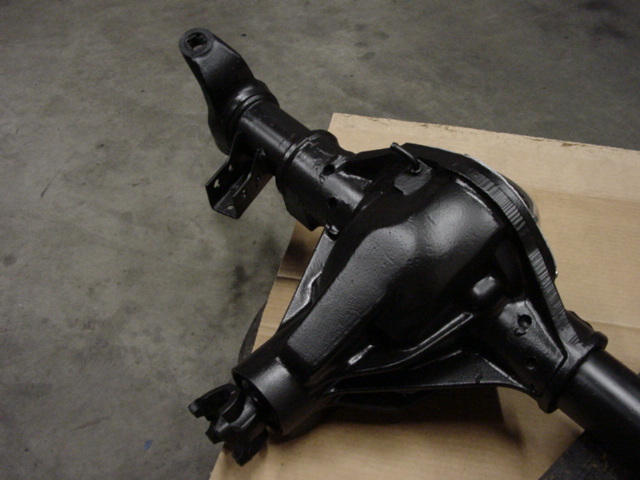 Next, the base coat (color coat) of paint in numerous stages, using different paint guns, is applied to all surfaces of the body and sheet metal components. Finally, the finest multi-coat clearcoat is "shot" over the basecoat, cured, first-stage color sanded and glazed. 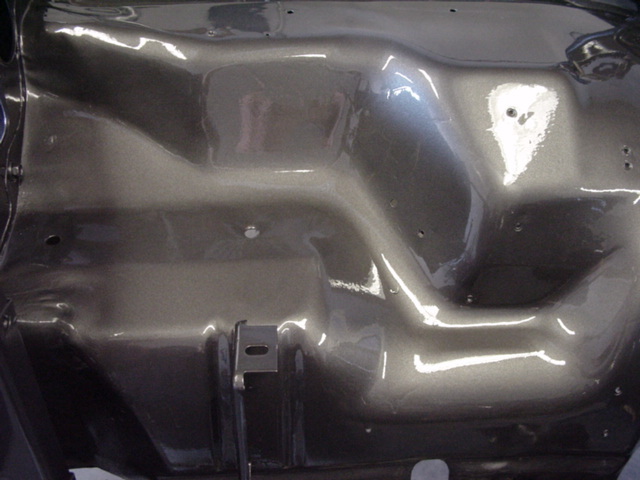 Once the paint/bodycoating has had time to harden, the body is slowly reassembled using the previously marked and annotated mounting positions. Next, the weeks-long and arduous process of meticulous color sanding begins using 5 grades of paper, followed by foam finishing discs. 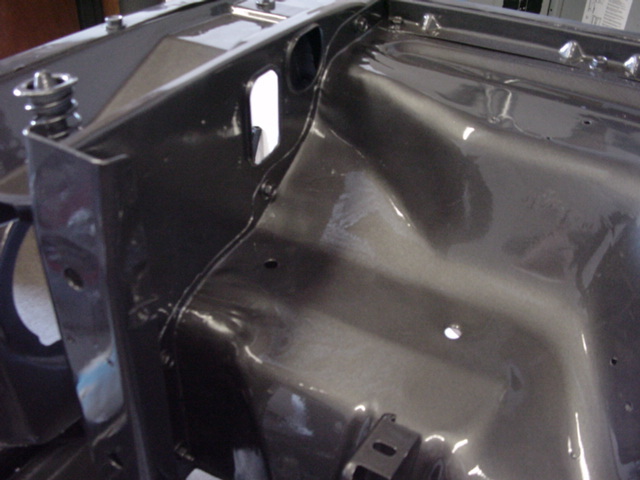 This is the process that is most difficult, most dangerous (it's easy to "cut" through the paint along the dozens of sheet metal breaks and edges on the Grand Wagoneer's angular body) and most labor intensive step. 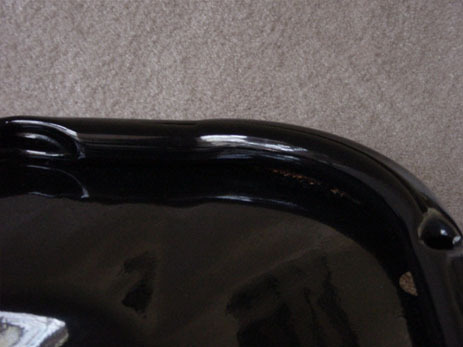 It is also the process that results in the smooth-as-glass, mirror-like paint surface. After color sanding, the compounding stage begins, where the paint is brought to a high luster and spectacular depth. Next, a non-silicone glaze is applied and allowed to harden. Finally, prior to delivery, several coats of carnuba and nut oil waxes are applied to bring out the brilliance and gloss of the finished paint product, and to protect the still-curing clear coat from environmental fallout (including the pollutants that "fall out" of the backside of our feathered friends). 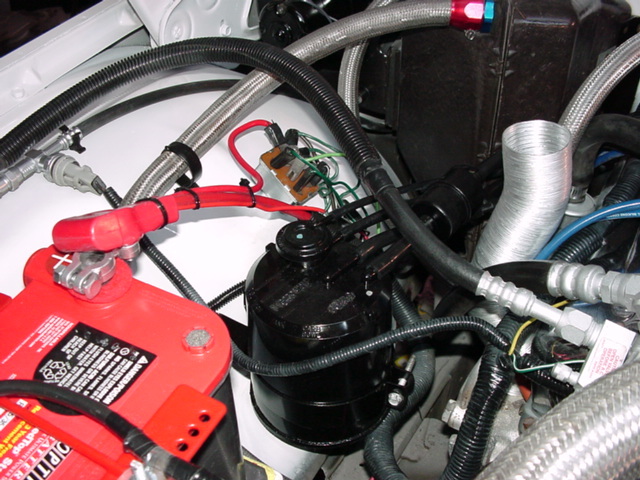 But, even before the exhaustive disassembly and body-stripdown described above can commence, every high quality cosmetic restoration begins with the complete disassembly of the engine bay and removal of the motor/transmission assembly, all of the ancillary mechanical components, all of the wire harnesses, the fire wall mounted components, the A/C lines and condenser, etc. 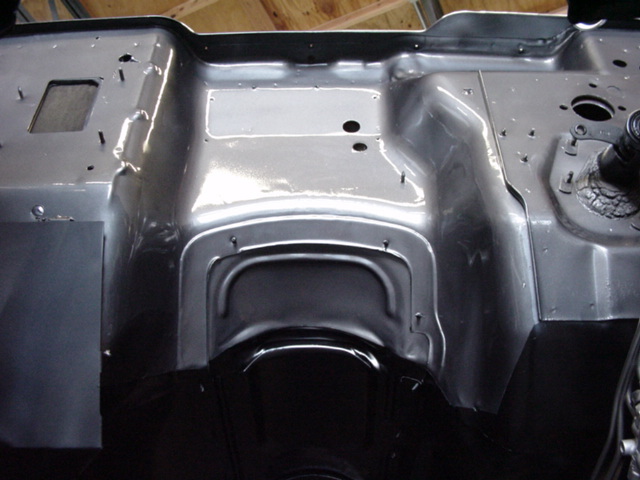 Once the entire chassis is stripped to a metal shell, the engine bay is bead blasted, finish sanded, receives any touch up bodywork, is zinc primed and then painted to the same standards as the rest of the vehicle. 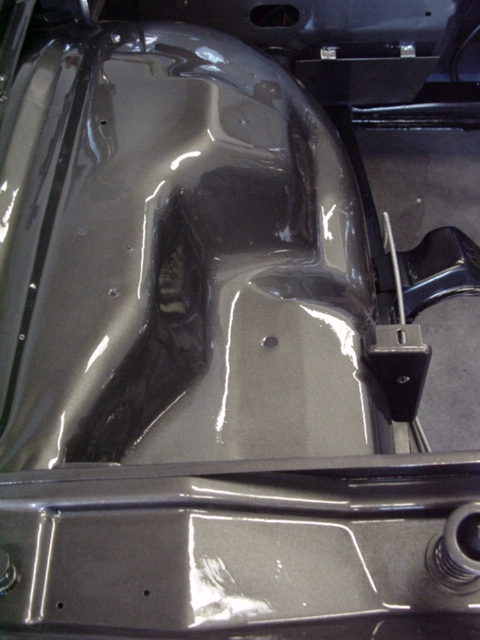 The paint is then color sanded and blended, and finally, the underbody and frame epoxy coat borders are finished. 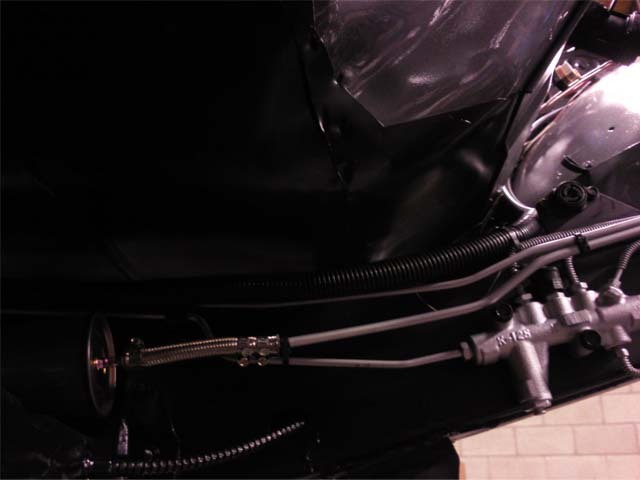 Once every square inch of the engine bay is sealed and painted, the brake lines, new fasteners and brand new Suspension Components and Steering Components are installed. 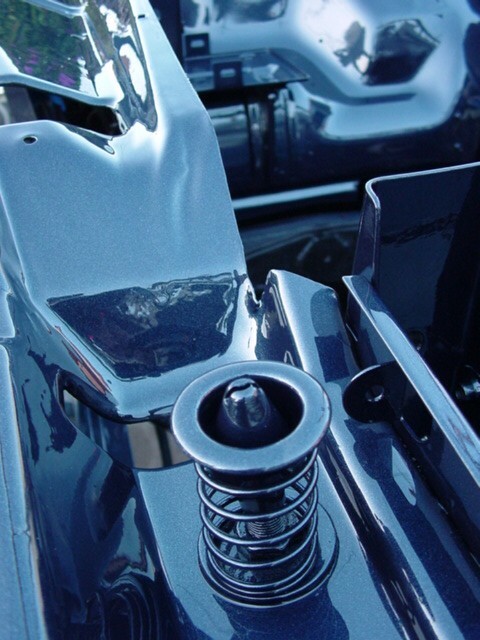 No matter where, how and at what angle you look at any of the sheet metal surfaces you will notice that EVERYTHING is completely primed, rust sealed and professionally painted using the highest grade materials. 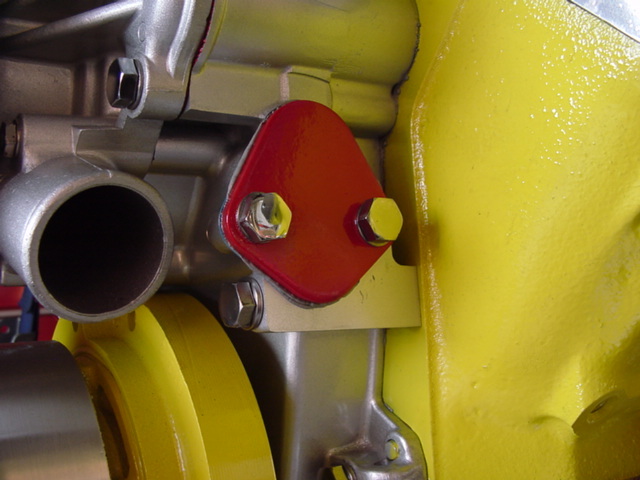 All of the areas that the sub-standard factory paint work neglected (which often led to rust and corrosion) have been addressed. These woodys are built to LAST! 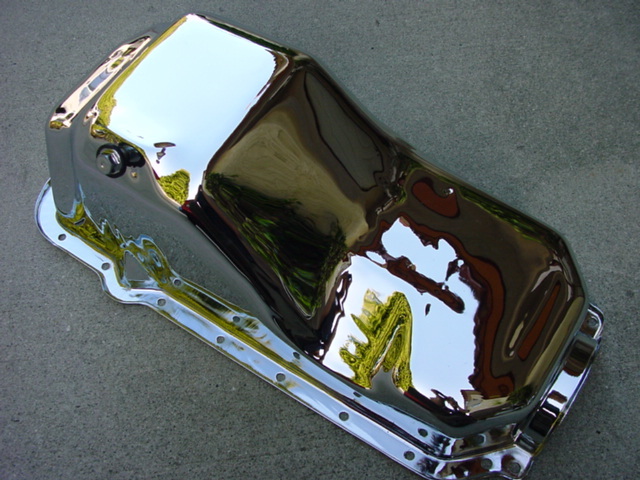 Gorgeous paint with incredible depth and gloss. 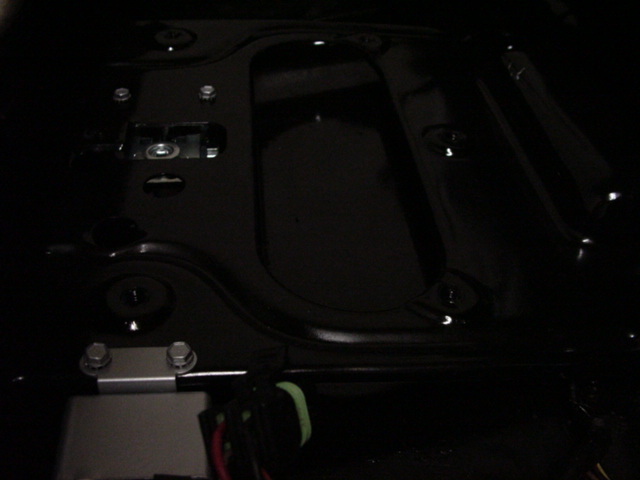 Here you can see the sheetmetal under the factory battery tray…flawless. 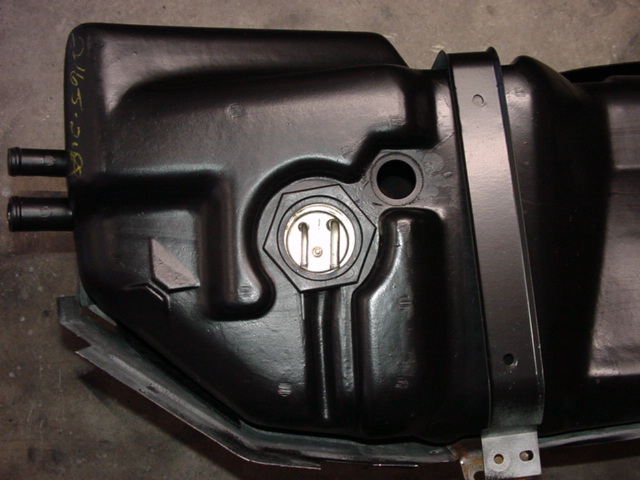 The battery tray was removed, bead blasted, and then received the best protective powder coat prior to reinstallation. And with motors, brake lines, suspension components, axle assembly, steering box and steering shafts back in the engine bay. Every square inch of my restorations (regardless of whether it is visible or not) is completely restored and improved. Here you see a tailgate shell that has just been reinstalled. 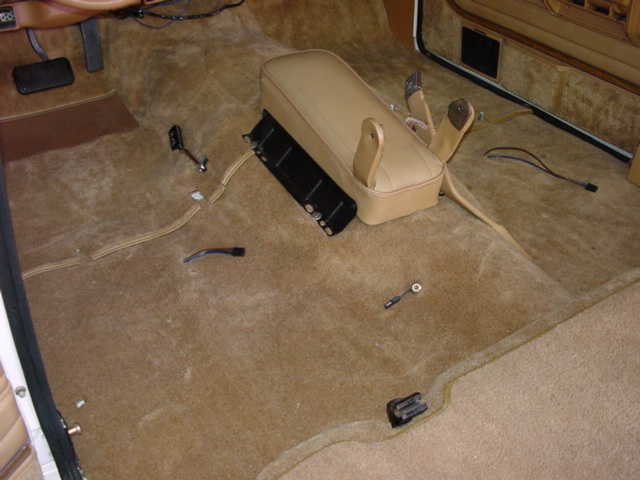 All internal components and external trim were removed. 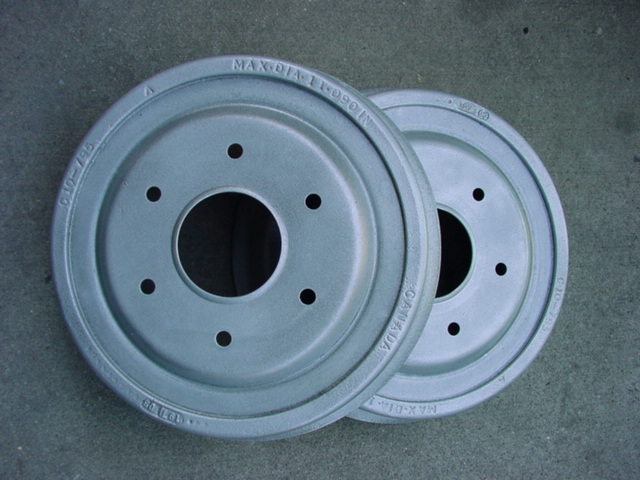 It was completely bead blasted, sanded and then alkaline washed. 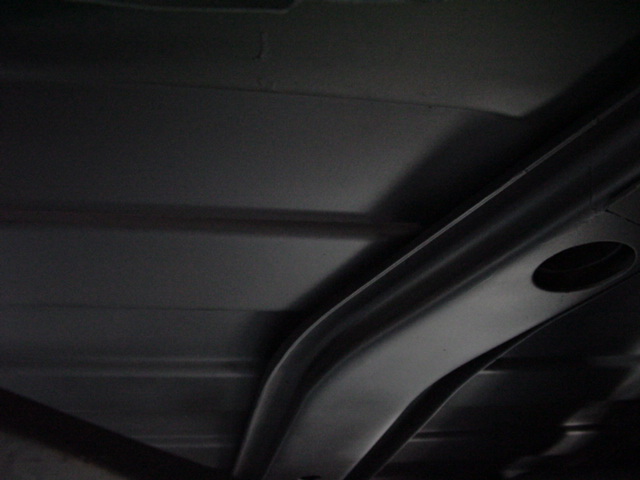 Then the internal sheet metal was completely coated with the best (in my humble opinion) rust proofing and sealing epoxy in order to prevent future corrosion. 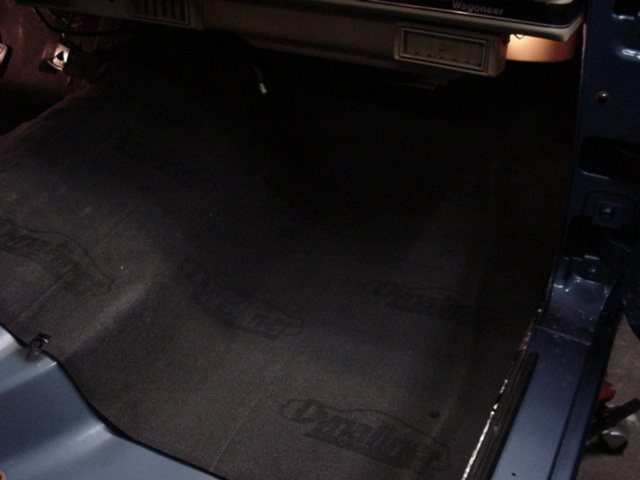 Then it received new sound insulation and anti-vibration insulation pads. 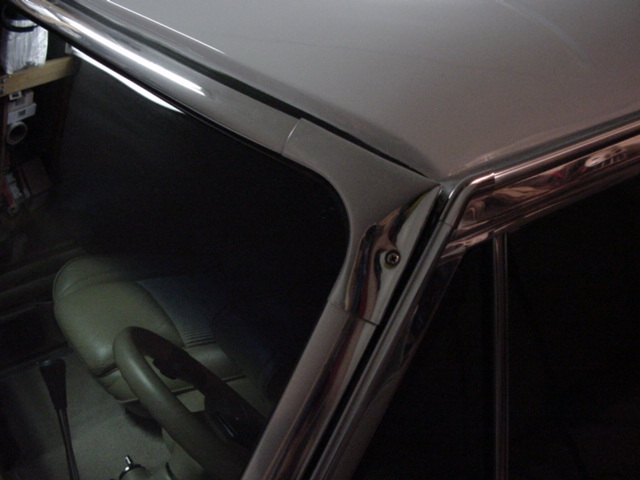 Then the window glass brackets and bumpers were installed. 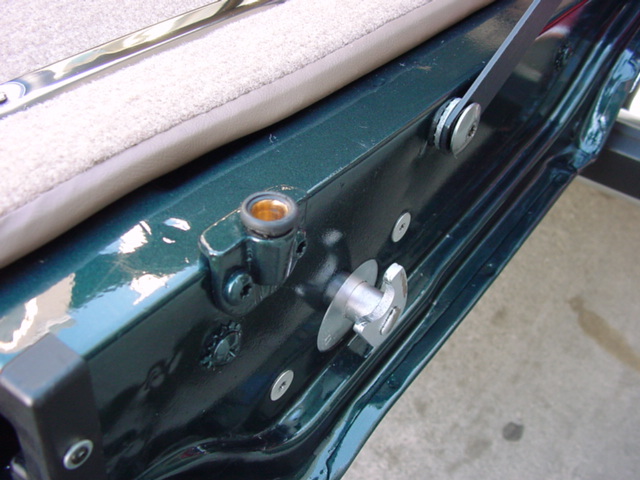 Thereafter, the tailgate latch regulator, new isolation sleeves and a new scratch barrier were installed. 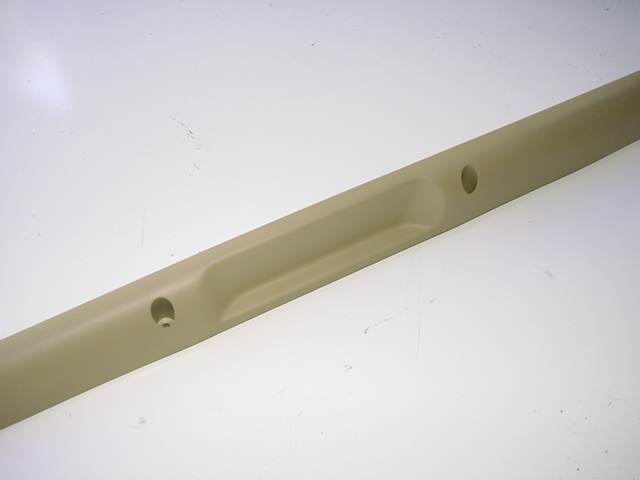 Rear window frame and retainer clip holes are created. 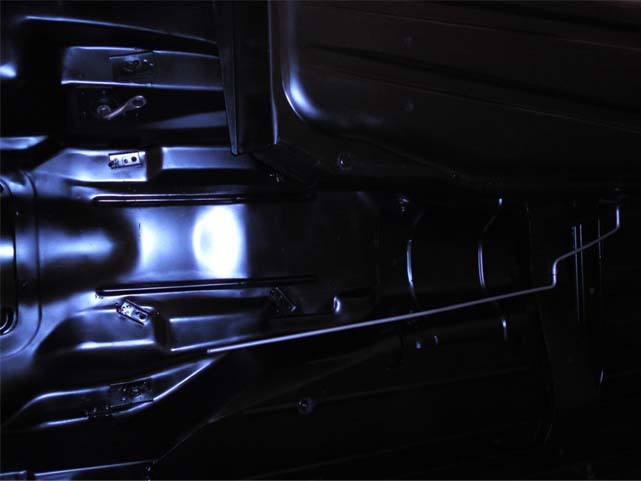 Then the entire tailgate is carefully masked and painted with the same ultra-high quality materials and process used for the rest of the exterior and interior. 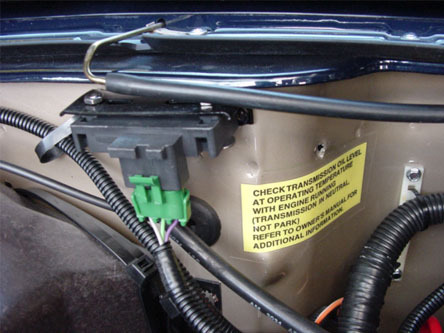 Here you see the same tailgate after installation of the new OEM electrical rear window switch, the new defroster relay assembly, new hardware and new wiper motor wiring harness. 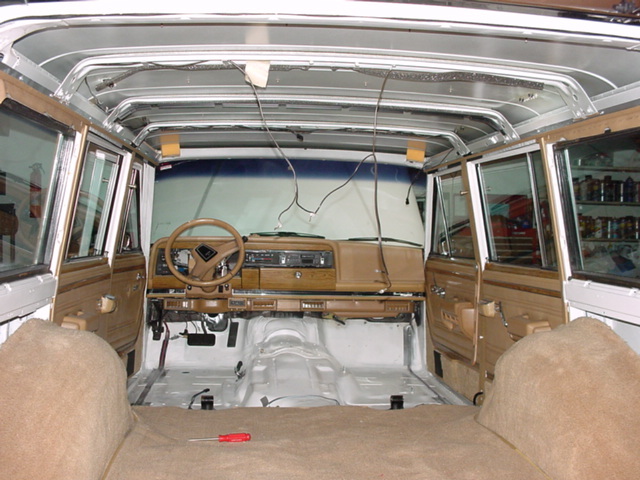 Extensive electrical work is done on all Grand Wagoneers, correcting the original design flaws, replacing the old and failure prone switches and components with brand new OEM factory switches(no longer available), thoroughly cleaning the electrical connections, applying dielectric grease to seal out moisture and prevent any future corrosion, and adding new upgraded electrical accessories. 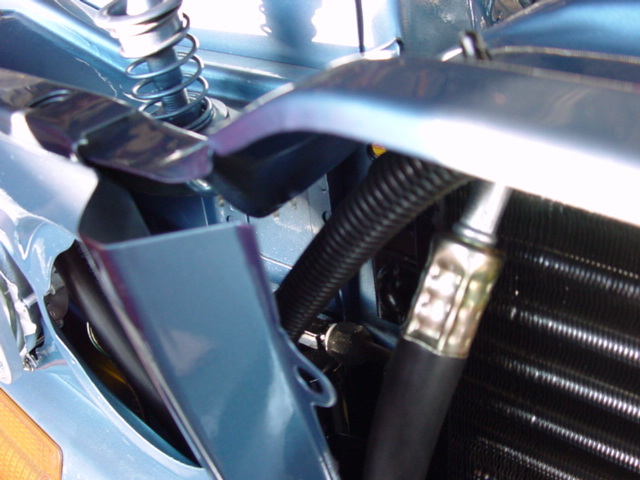 Only the highest standard and quality of electrical work is completed, using 100% moisture sealing heat shrink insulation, top quality connectors and insulators, highest grade, chemical and heat resistant cross-linked multi-strand copper core wire, and very expensive ceramic and mylar heat shields and wire loom insulators. Some upgraded wiring, new heavy duty relays and my wonderful LED fuses. 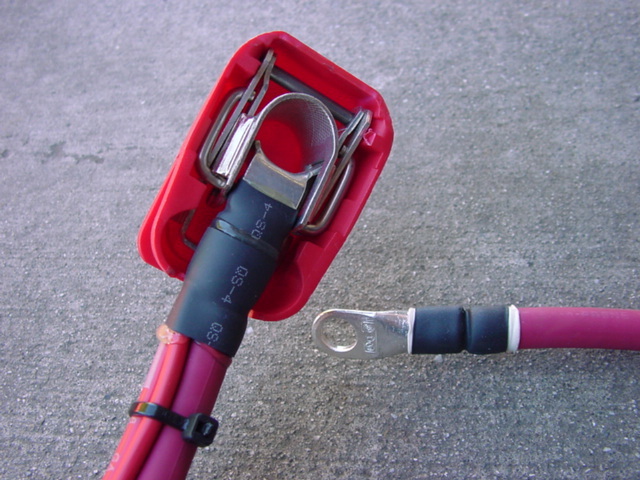 These special fuses have a light that brightly illuminates when the fuse blows, completely eliminating the guesswork of which circuit is blown and needs to be replaced. 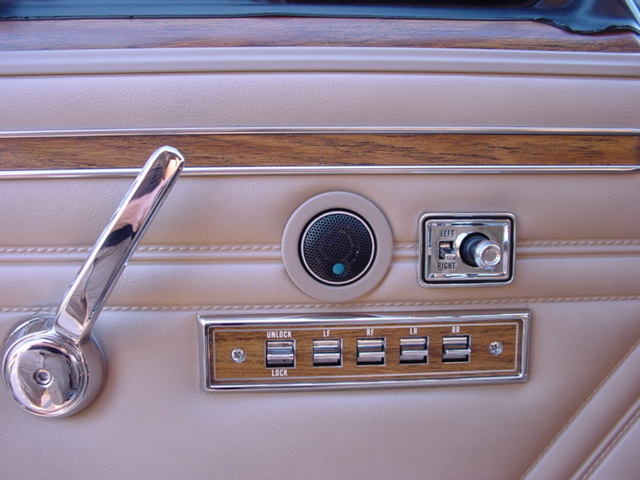 If, in the future, an electrical issue should ever occur, a quick glance under the dash will immediately tell you if a fuse is at fault, and if so, which one. 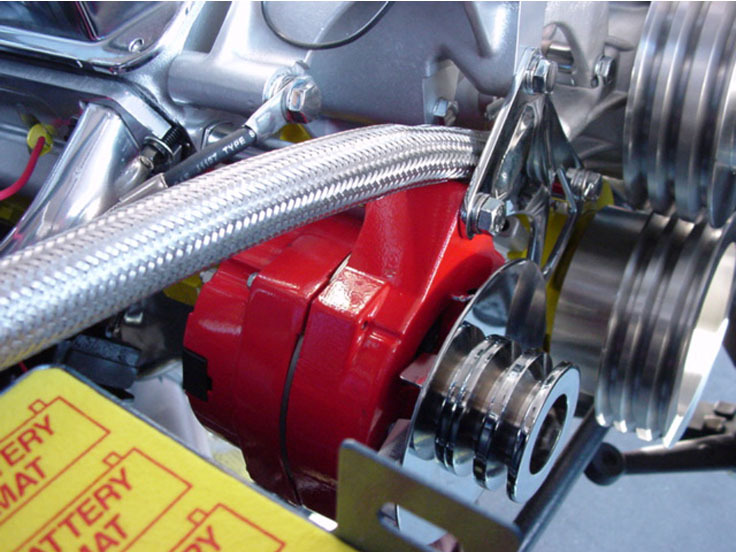 On the left you see a section of the vacuum steel hard lines as well as a new factory transfer case (4x4) vacuum line connector assembly. 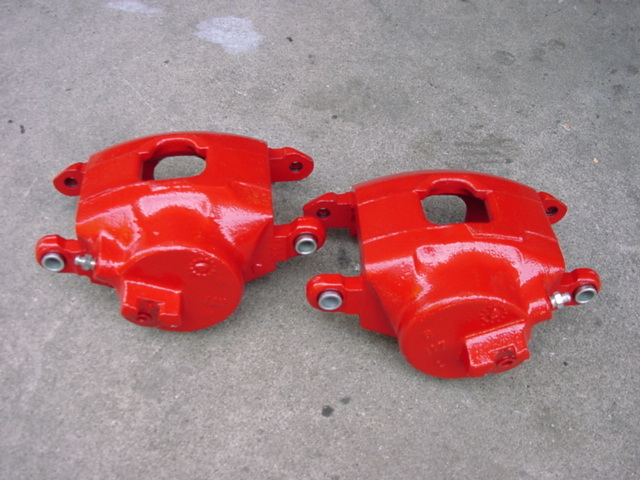 On the right are the various restored motor linkages whose proper adjustment and installation is critical to correct drivetrain function. 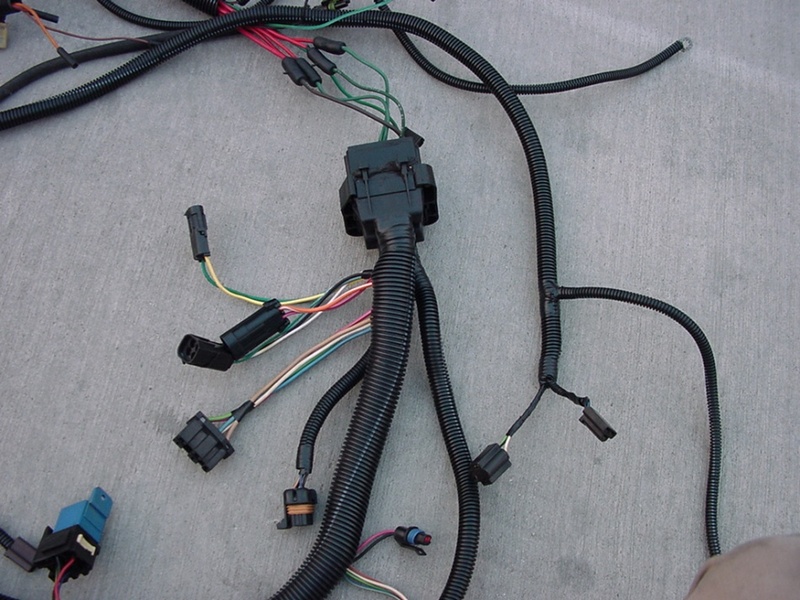 Here you see the new OEM original upper and lower speedometer cable assemblies, hood release cable, heater control cable and transfer case (4x4) control motor vacuum lines that I install in my restorations. 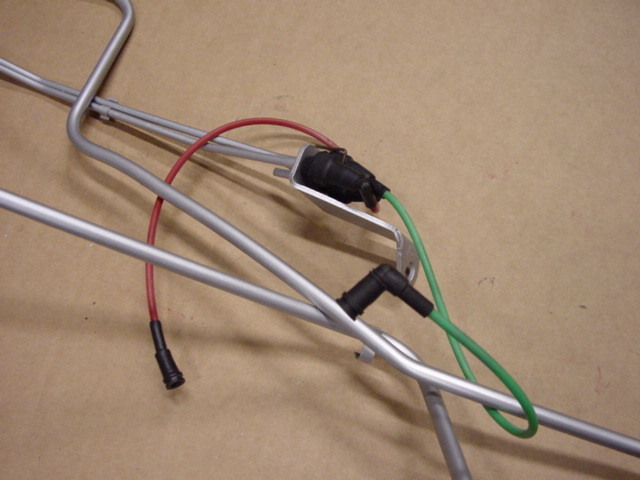 You also see the custom fabricated battery ground cable with custom quick release battery post fitting. None of these parts are still available anywhere!! 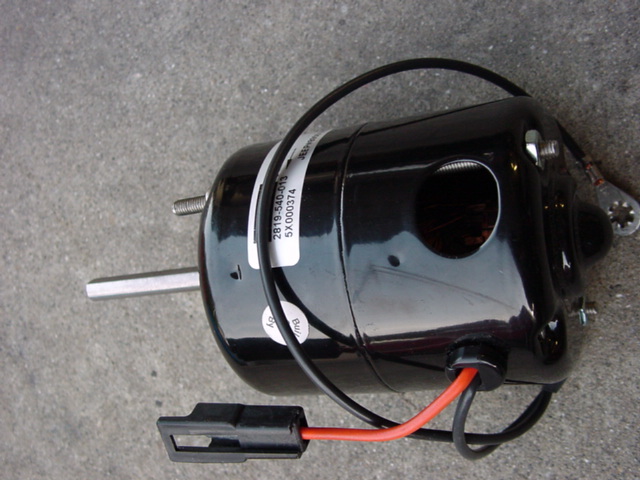 On the left you can see a brand new OEM vacuum motor and the restored mounting bracket…this motor is critical to proper four wheel drive function. 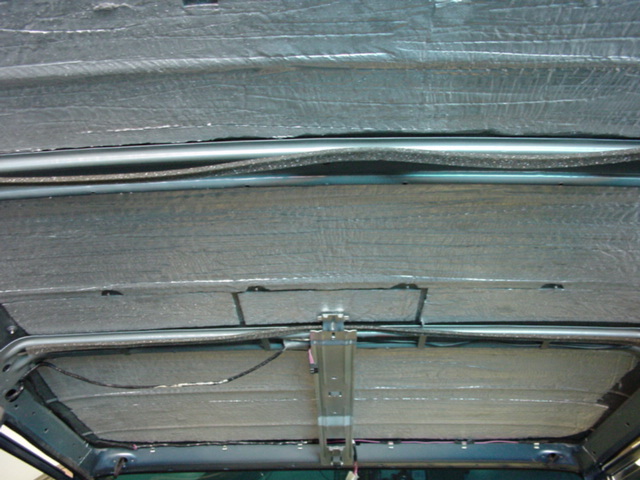 On the right are a collection of body mounted steel “hard lines” for vacuum and fuel. 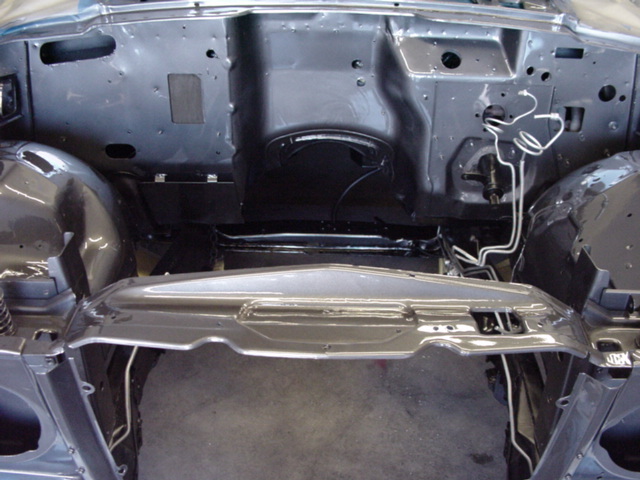 Once the frame and underbody are finished, the engine bay is painted, the motor, drivetrain and all mechanical systems are installed, and the entire body (including inside all doors, body panels, door jambs, floor, roof, and interior exposed sheet metal, the floor is then fully epoxy coated to provide the ultimate in long term rust protection. 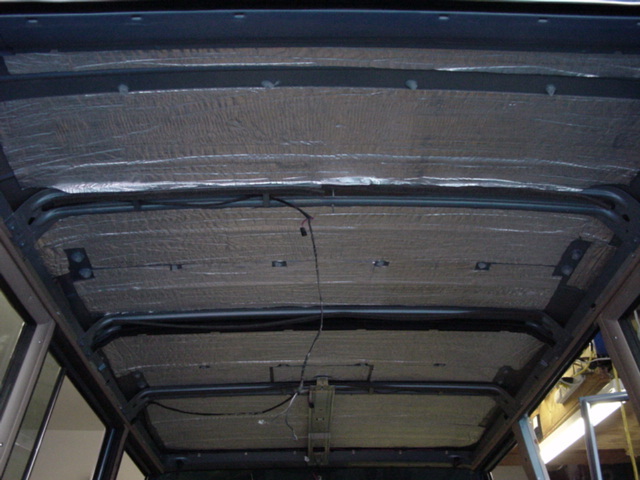 and the ultra high quality Heat, Vibration and Noise attenuating roof insulation applied under the all new Headliner Assembly. If you look carefully you can also see the new Roof Rack well nut Grommets/seals, the new foam insulation, the new wiring and the sealed roof rack rail screws. 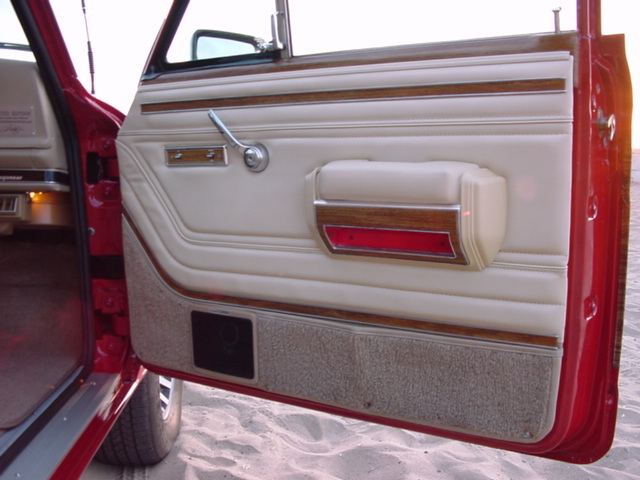 Here you can see the inside of a painted, restored door panel with my custom water and dust shield installed. 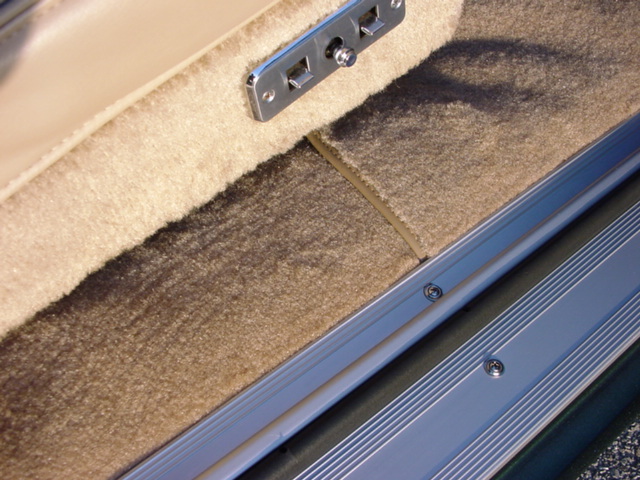 The material that I install has a better adhesive and is superior to the original dust/water shield that is almost always damaged, missing or completely deteriorated (the consequence of which is most of the water leaks that destroy door panels and leech onto interior carpet). 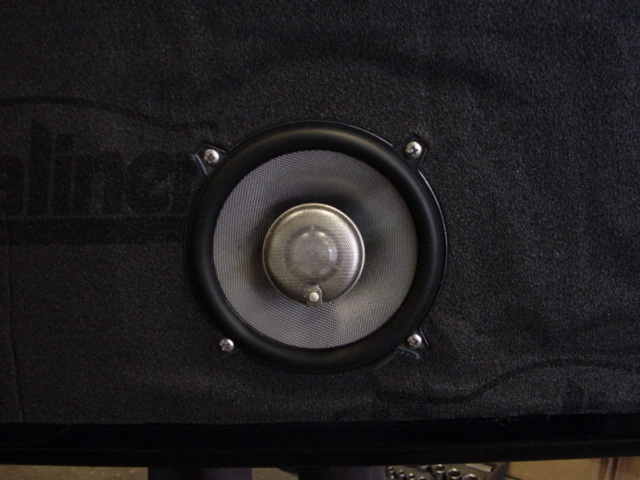 Then, over the new custom one-piece water and dust shields, I install a single, seamless piece of sound and vibration attenuation insulation. 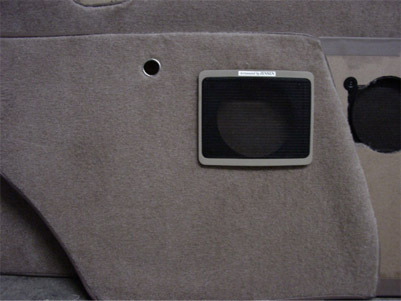 This not only cuts down on unwanted interior noise and is one of the factors why my Jeeps have such outstanding interior noise levels, but the seal and insulation also dramatically improve frequency reproduction in the door mounted speakers. 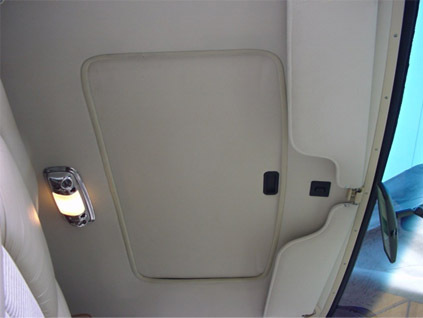 Below, on the left, you have another finished door that has been painted and sealed (exterior and interior sheet metal), has a new window switch molded dust shield with new “window weld” adhesive installed, new cable retention tape, impact bar, door lock actuator motor, window motor and wiring harness. 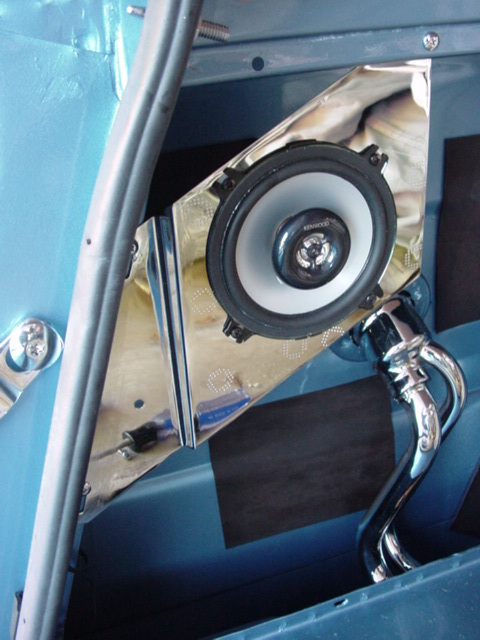 Even the in-door speaker frames and cross bars are chromed and clearcoated. 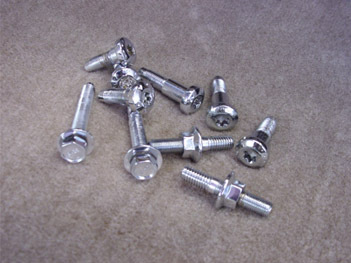 All of the screws and hardware are top quality stainless steel! Be low you see the new chrome tailgate arms the upgraded chrome hardware, the fully restored tailgate opening side trim, the new tailgate threshold seal, the restored speaker mounting plate, the new speaker, the refinished gas tank filler neck, the new quarter panel sound insulation, the new stainless steel and chromed steel fasteners, and the newly painted inside quarters and side rails. Although a bit dusty, you can observe the new paint work, the new carpet, new slide rails, new conical bushings and the refinished tailgate latch, new hardware, the refinished braces and hardware and the refinished tailgate cap....not an inch of our woodys is left untouched! 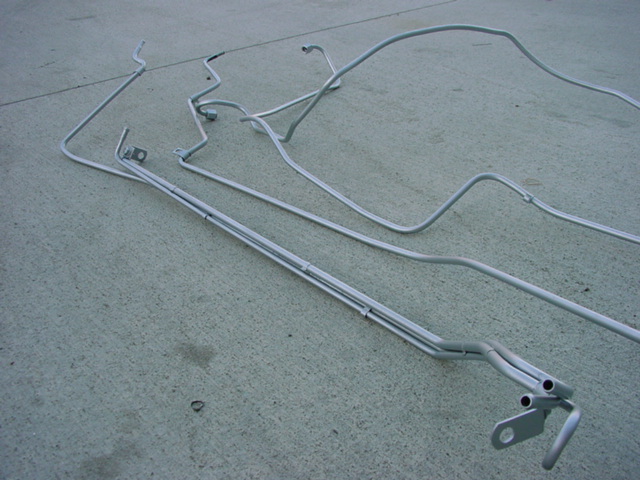 I completely restore the factory roof rack assemblies. 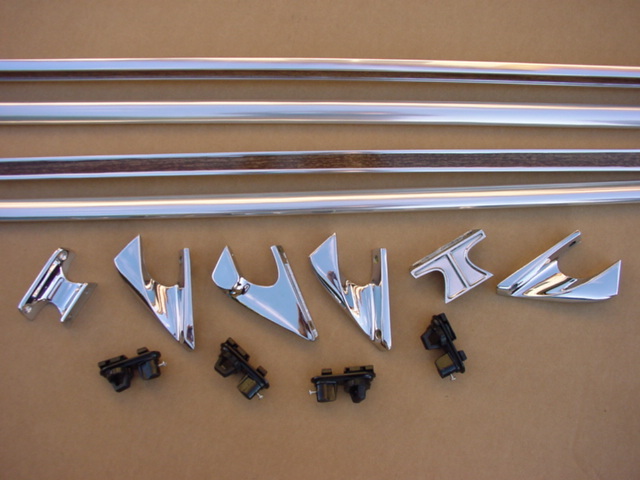 They are disassembled, fully acid stripped, then the aluminum cross bars and side rails have all defects corrected, are polished and then re-anodized (the same process that Jeep used). 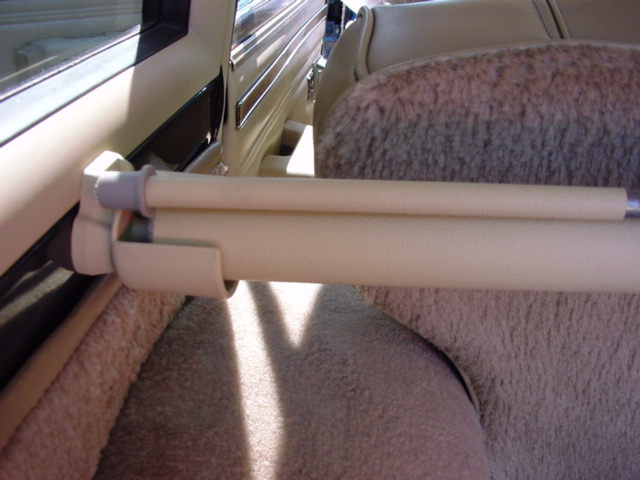 The side rails receive new factory woodgrain laminate strips. 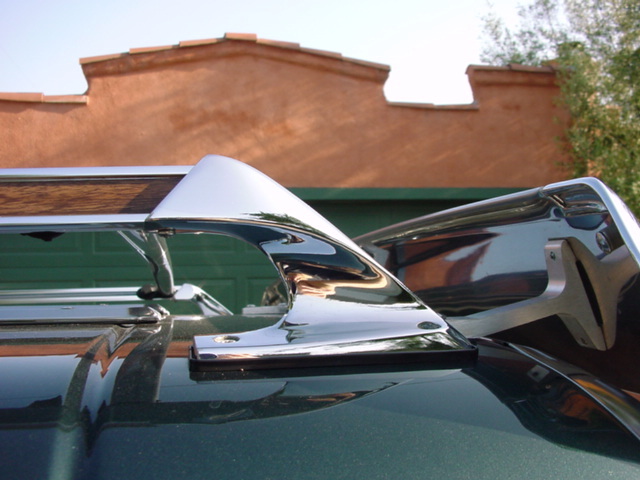 Then the roof rack mounting “feet” are fully multi layer copper coated and high luster chromed and polished. 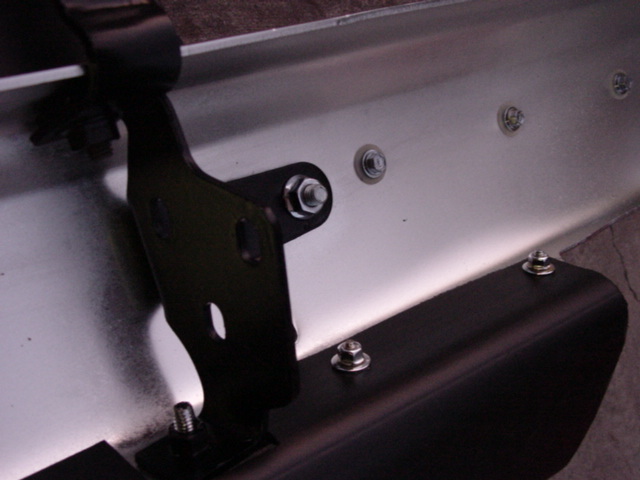 Finally, the restored slider brackets are assembled and the entire assembled rack is then mounted on the roof using all new roofrack well nuts and grommets, new stainless steel hardware and new, superior quality rubber seals. 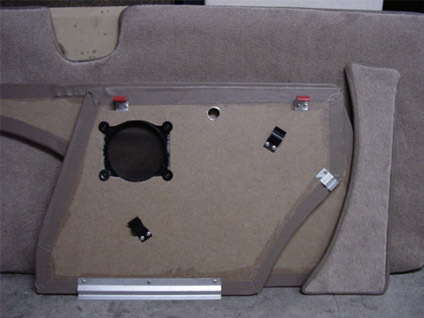 All of the hardware and grommets are then sealed from underneath, prior to roof insulation and new headliner installation, to make sure that there is no chance of water leaks. Note: Unfortunately, this Jeep was quite dusty during the photos. 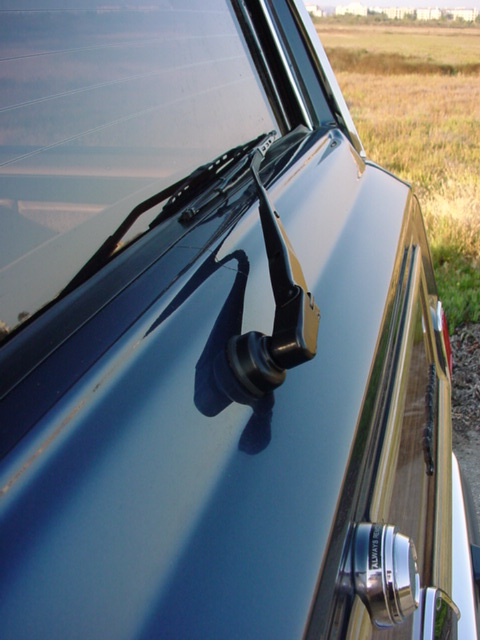 Below, you will find a series of close-up photos that show you some of the areas that you normally don't see or that may not be a point of focus upon initial inspection of a Grand Wagoneer. I include these here to demonstrate I do the same high quality work in ALL aspects of the restoration process. I know that you will never see or examine many of the areas that I painstakingly restore, and much of my work will go unnoticed. However, in order to achieve my goal of creating the highest quality, most durable LONGEST LASTING and most reliable Grand Wagoneers possible, the restoration process must include the entire vehicle....not just the readily visible areas! 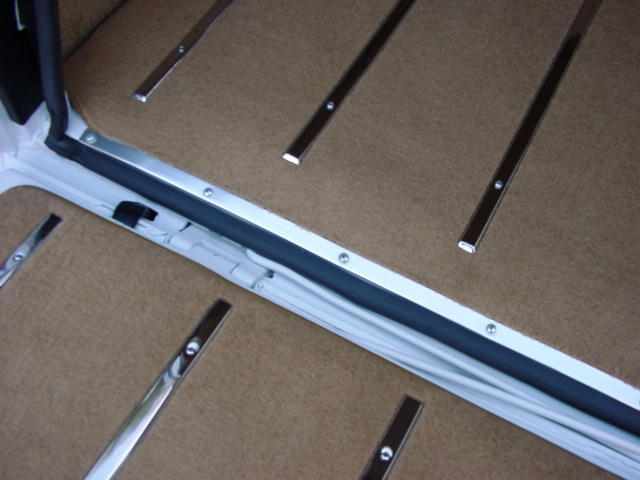 My new optional polished Stainless Steel Slide Rails and Carpet Bar. A stunning optical improvement over the factory pieces. 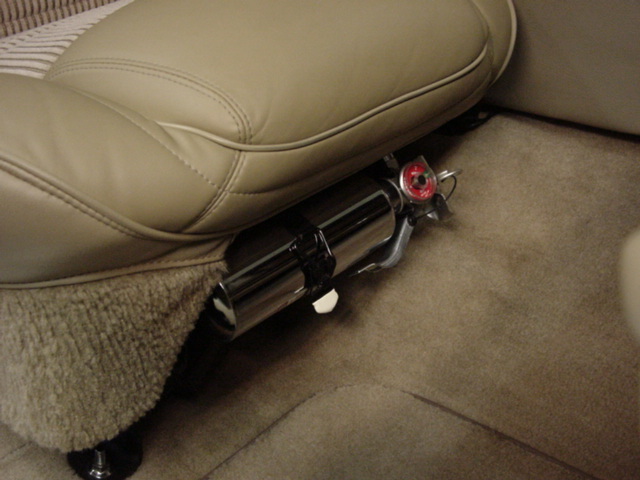 You will see this upgrade on many of the interior photos on the site. 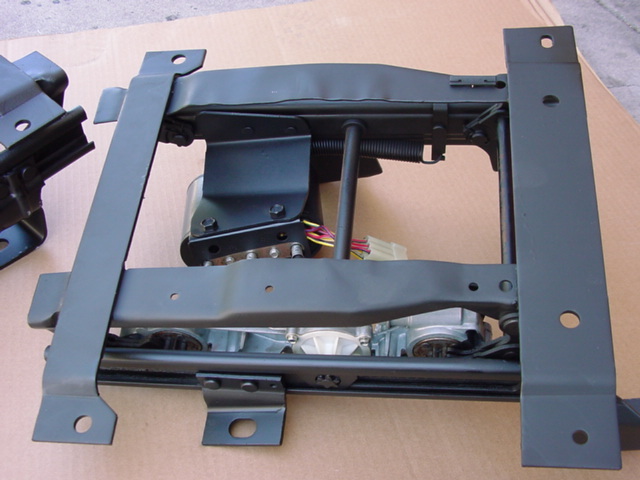 Below you can observe the all new grill components, turn signal assemblies, side markers, gaskets, bumpers, bumper impact strips, bumper bolts, and fog lights (almost all of these factory pieces are no longer available anywhere else). Here you see the new tailgate window seal, the new tailgate chrome surround strip, the new stainless steel tailgate/body trim, the fully stripped and refinished headliner retainer strips, the new quarter window color matched trim frames, the new headliner, the refinished corner retainers, the new screws and the newly painted interior "D" pillar. 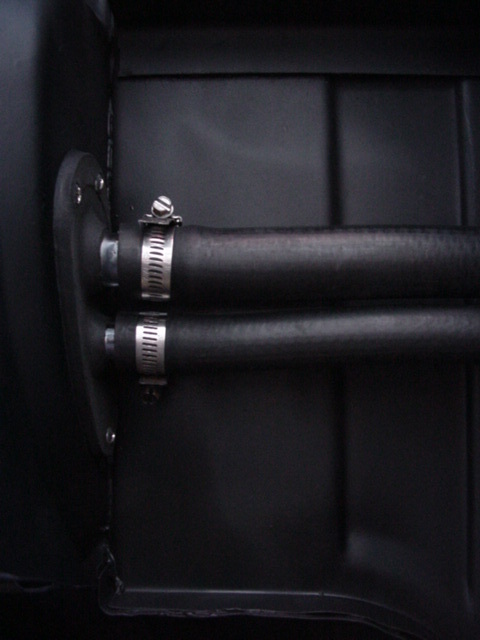 An example of one of my padded, extra thick and luxurious, buttery soft leather wrapped steering wheels. 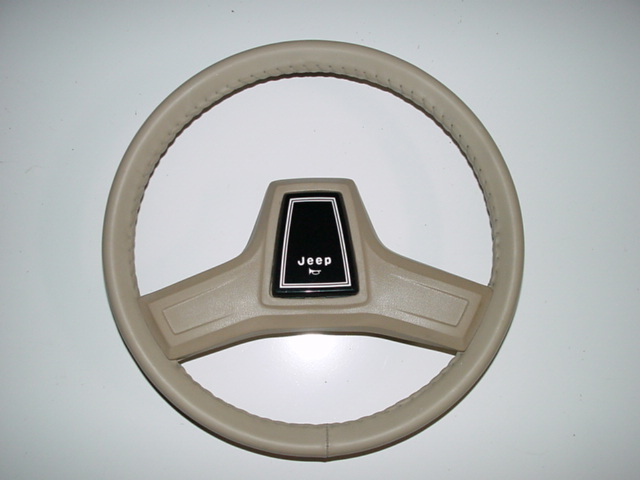 Although a bit dusty, you can catch a glimpse of the brand new soft and luxurious steering wheel leather, the new turn signal/cruise control stalk/switch, some of the other new switches in the background, the new dash bezel, the new gage cluster, the refinished steering column, and bits and pieces of the all new interior. Stunning under hood paintwork, chrome assembly hardware, fully restored hood release bar, new factory release cable, new factory hood ornament, all new factory stickers/emblems and my wonderful custom made single piece hood insulation will be visible every time you open your hood and show off your one-in-a-million Grand Wagoneer to a friend. 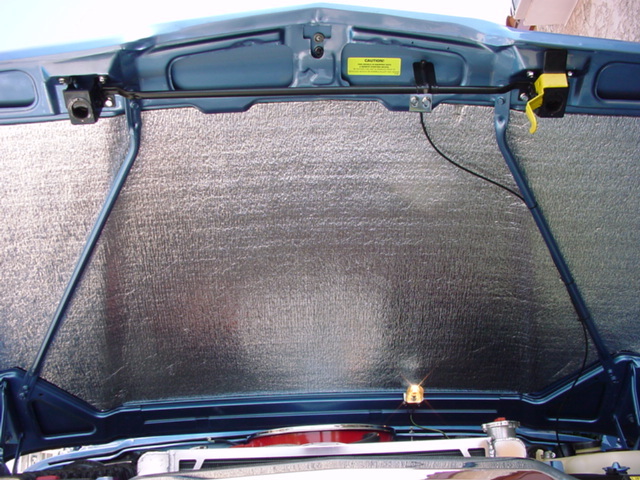 The hood insulation that I use is a huge improvement over the factory original. First it is one piece and not segmented. 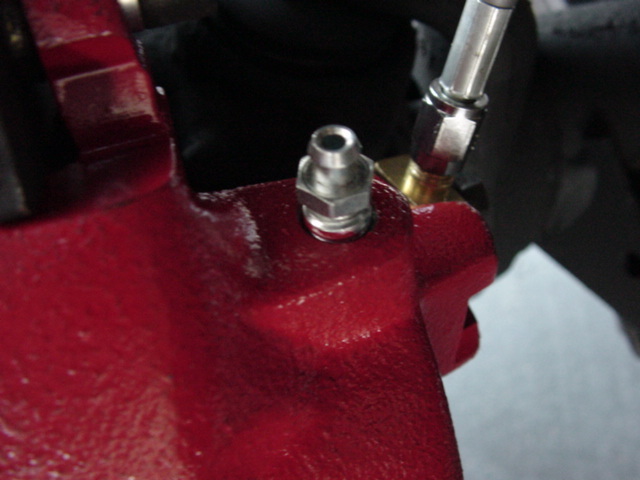 Second it is bonded to the hood and will not sag, loosen and come down over time. 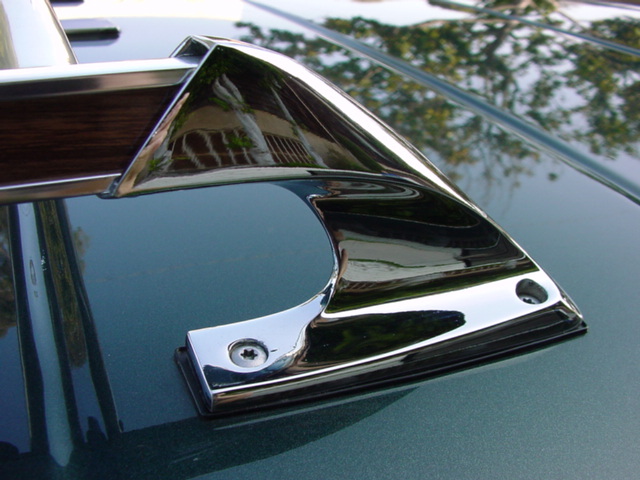 Third, it has better heat reflection properties that protect your precious hood paint. 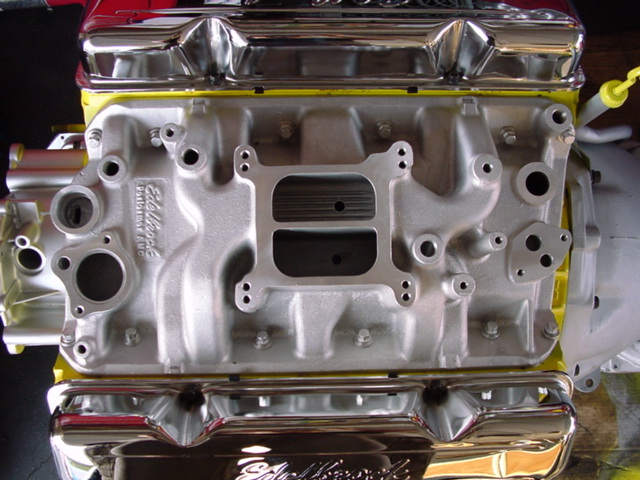 Fourth, it is soooo much cleaner than the filthy factory insulation that absorbed every vapor, very bit of oil, ever splash of dirty water and efficiently deposited this grime in your hair every time you worked on the motor or inspected the engine bay. 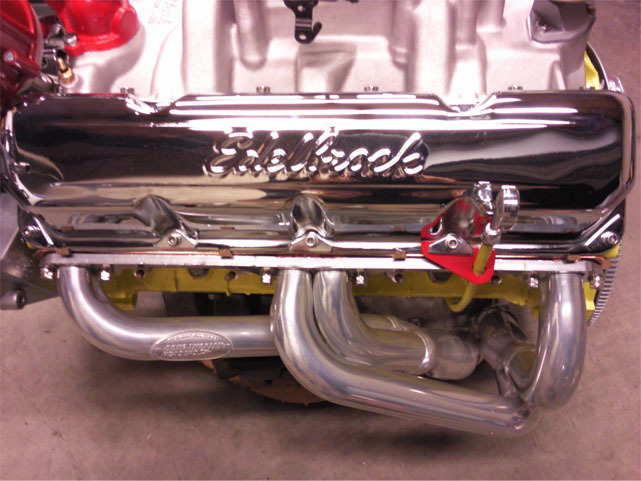 Lastly, it looks absolutely stunning and aids in reflecting light into the engine bay. 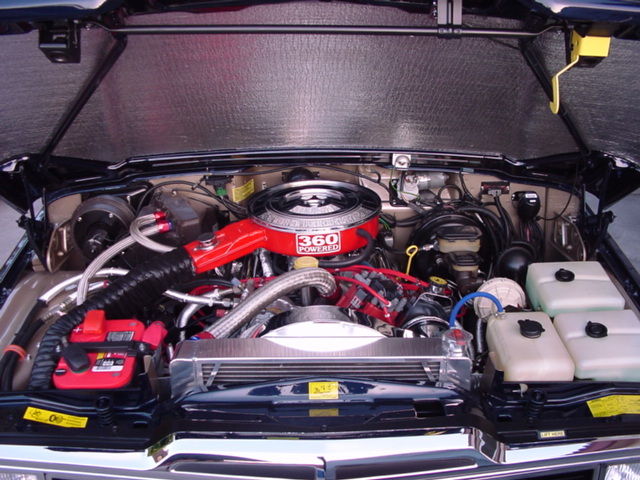 NOTE: If you think that the appearance of your engine bay, motor and motor accessories do not influence how much care and effort any mechanic that will ever work on your “woody” takes, you are mistaken. Mechanics are only human. 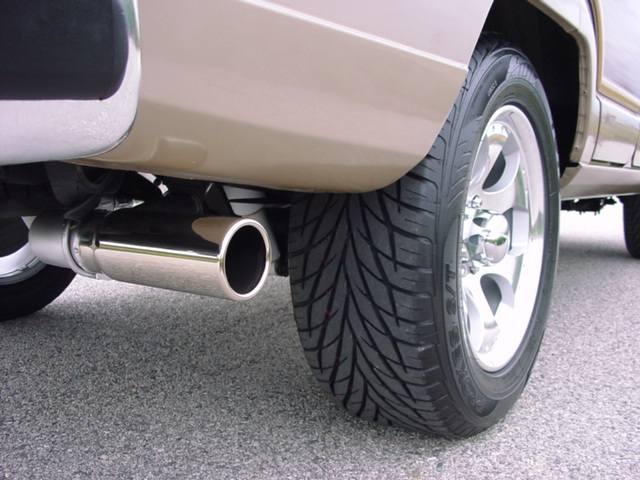 They are often tired and overworked and will, like many of us, cut corners if they work on a vehicle that is filthy and looks like the owner does not care about or properly maintain it. 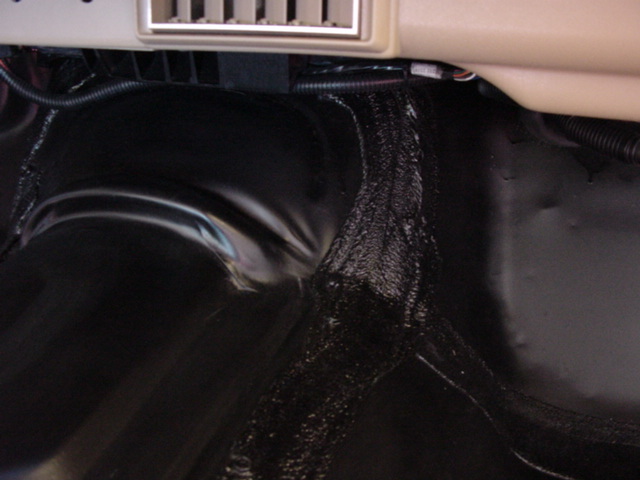 When you open the hood of your new www.grandwagoneer.com restoration, every mechanic that works on it will be in awe, will respect and care for the vehicle much more than an ordinary car and will treat it like the very special machine that it is. 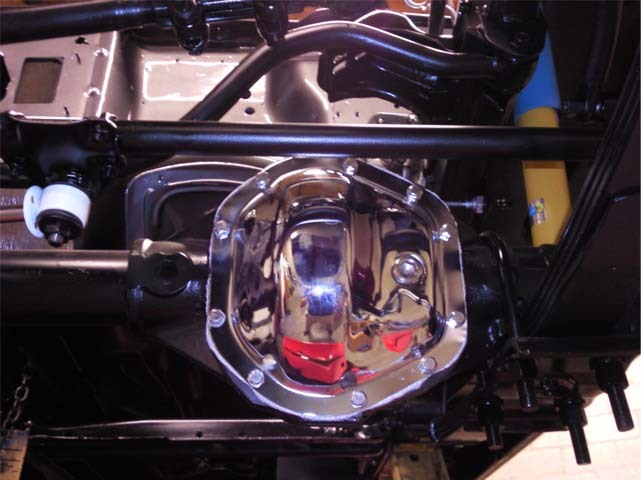 The time, workmanship and quality put into the less noticed areas of each Jeep we produce is a direct reflection of the extremely high standards and perfectionism which are the hallmark of my work. 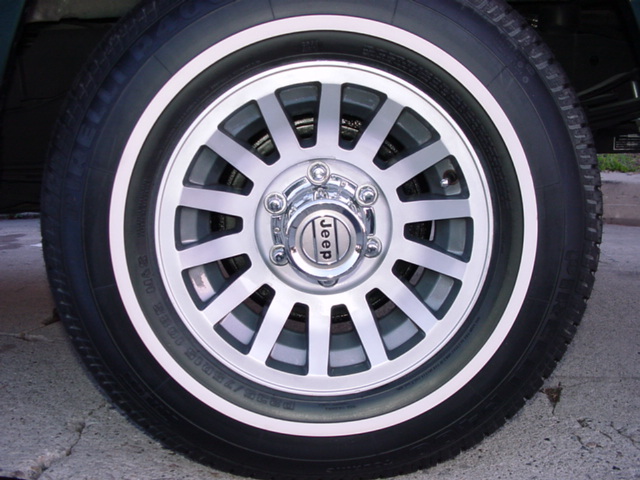 On the left, you see a brand new, matching spare tire on a fully restored steel rim. On the right, another new matching tire and restored wheel plus a full bead blasted, zinc primed and epoxy coated spare tire carrier bracket. Here you have a brand new, factory taillight assembly, wiring and bulb harnesses, upgraded bulbs and new seal, prior to installation. 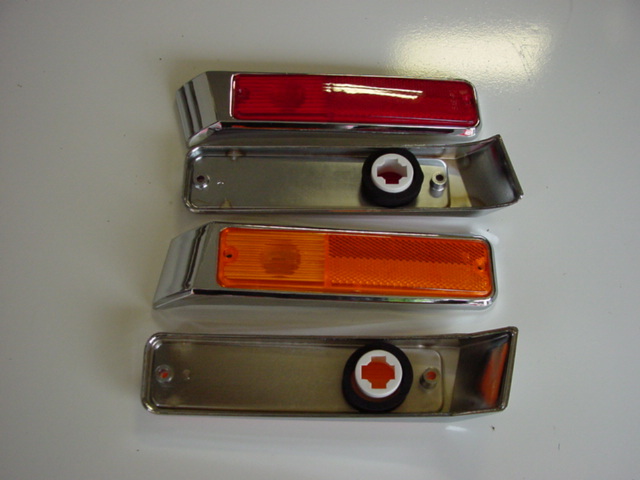 The new OEM taillight assembly installed. Notice the incredible color and gloss of the wood borders and wood laminate! 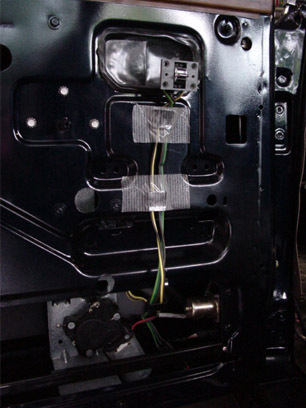 Every original tailgate glass has scratches, chips or other cosmetic flaws, not to mention that one or both of the defroster connectors are broken/corroded and that the defroster strips are almost never intact over the surface of the full glass. 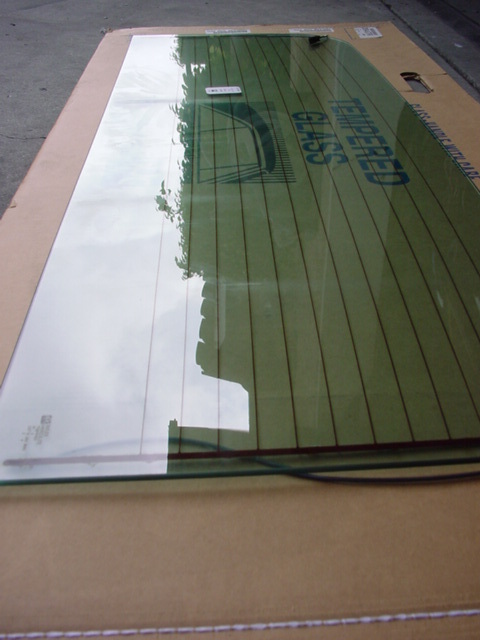 Here is a photo of the brand new Tailgate Glass that every one of my restorations receives (these tailgate glass assemblies are no longer available anywhere in the US). 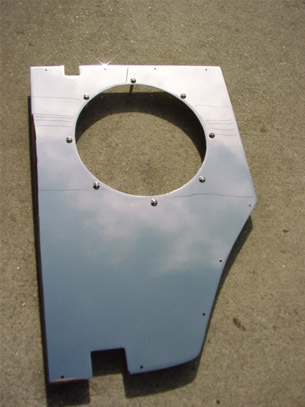 Also below you see a brand new, factory fuel tank skid plate (the first piece of underbody steel to begin to rust)…again, these pieces have been sold out and have not been available for years. 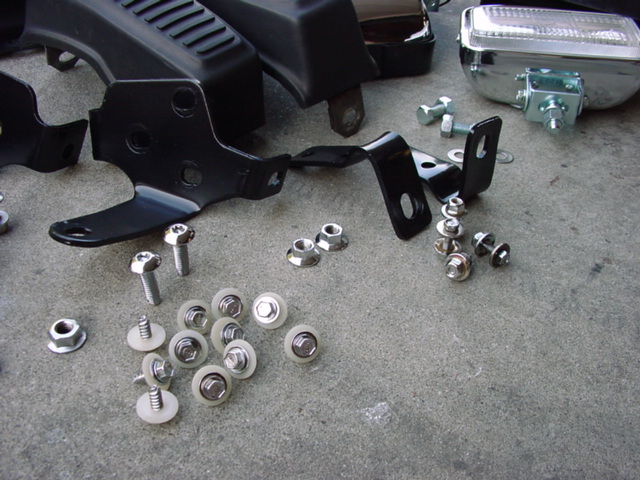 Below you can see all of the components of an entire front bumper assembly. 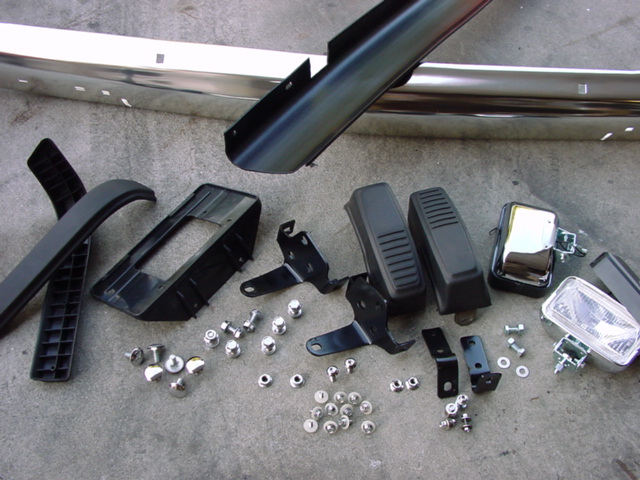 The new polished and anodized aluminum bumper, fasteners, plastic nerf impact strips, air dam, mounting brackets, fog light assemblies (custom modified for OEM wiring harnesses), fog light brackets, OEM license plate frame, rubber bumper bars, etc. As far as I know NONE of these parts are still available anywhere in the US! 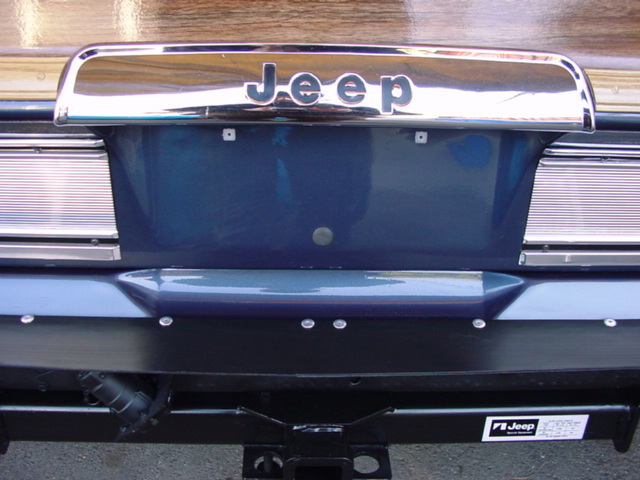 Here you can see a fully restored chrome “Jeep” License Plate Light housing with custom cut “Jeep” lettering inserts…the most prominent and visible cosmetic component on the back of the Wagoneer. 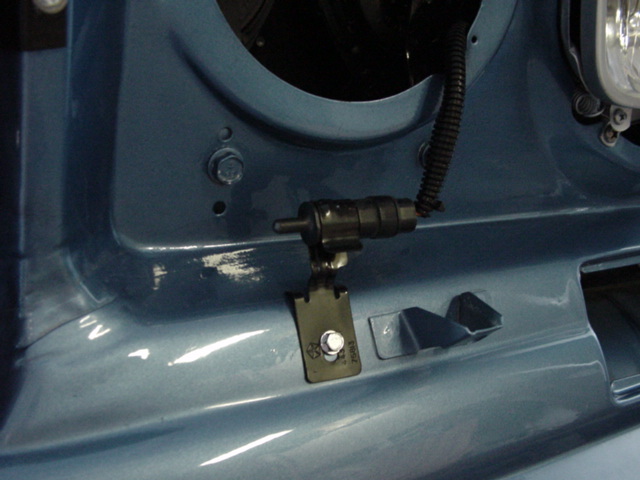 You can also see the new OEM license plate housing lamp, seal, clips and hardware. 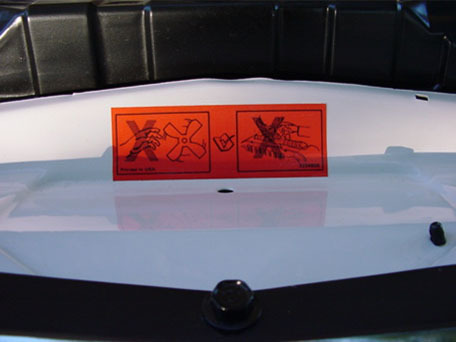 And, yes, that includes even hidden labels that serve important safety functions! 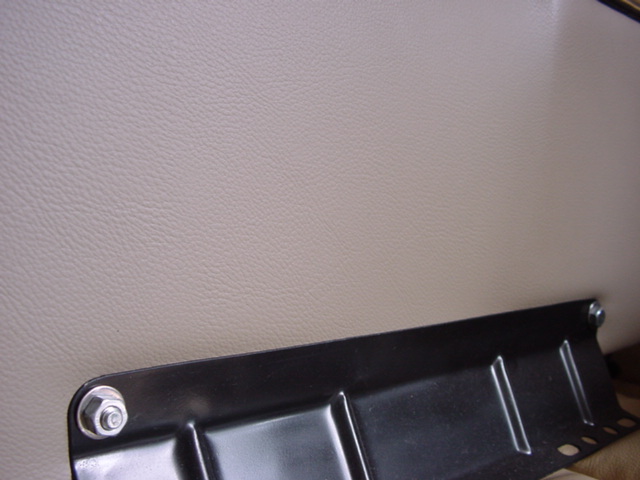 On the left are a partial set of new chromed steel seat belt mounting and front seat bolts. 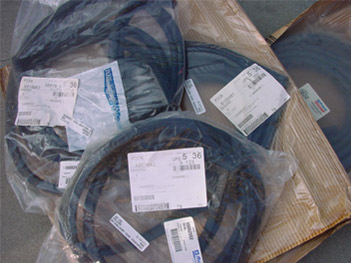 To the right is a set of brand new OEM (not cheap and inferior aftermarket) primary Door Seals. 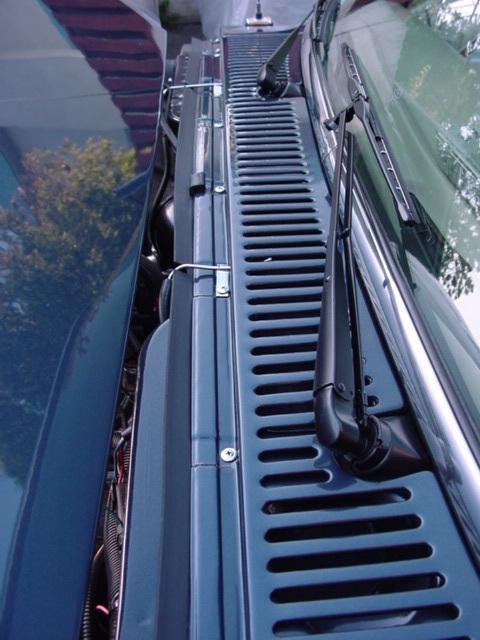 New factory tailgate window washer nozzle, new tailgate window trim, new stainless body molding and fully restored interior trim. 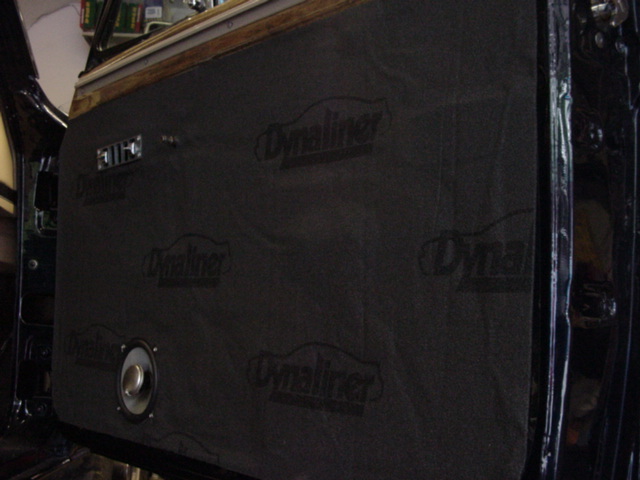 New, better-than-factory grill insulating "welt strips"
New, factory chromed plastic "headlight doors"
One of my custom high-performance transmission coolers with custom designed brackets and mounting system...a great upgrade for Wagoneers that will be towing big trailers and heavy loads! 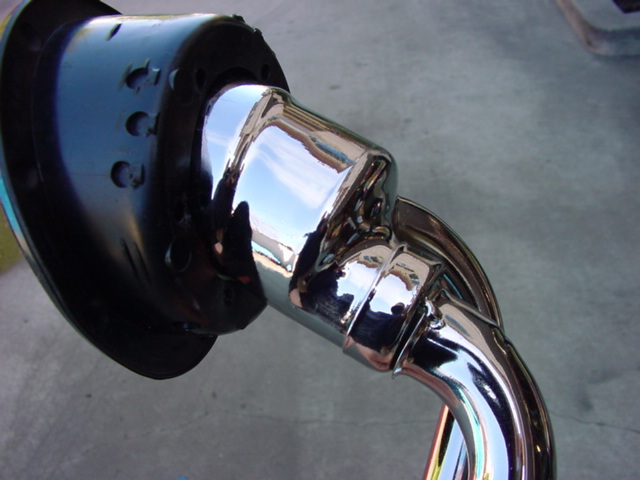 The front portion of my header-back 100% stainless steel exhaust system. 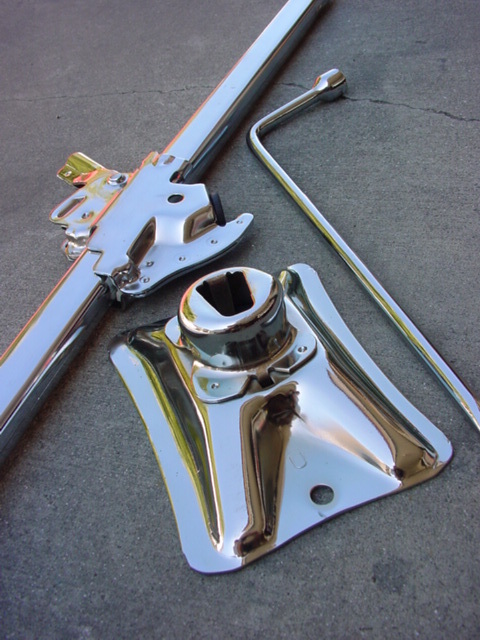 Even the custom hangers and clamps are polished stainless! 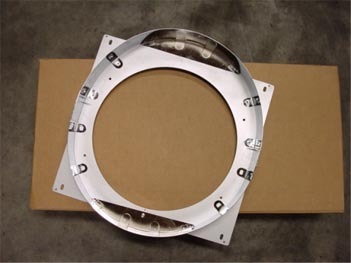 And flange seals are ultra-durable, malleable and reusable 100% copper. 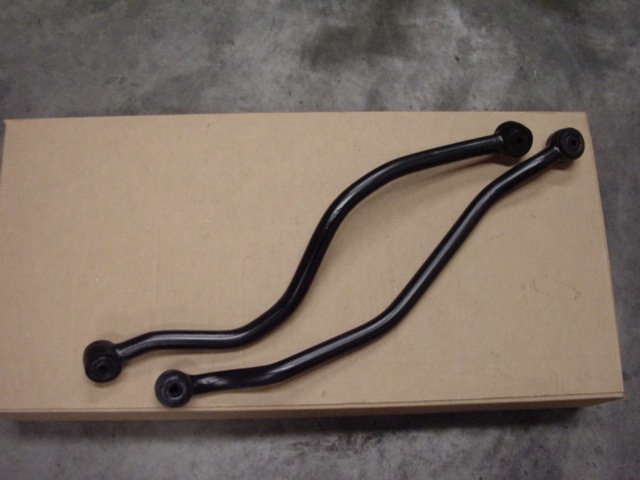 On the left you can see the sand blasted and fully restored front and rear sway bars. 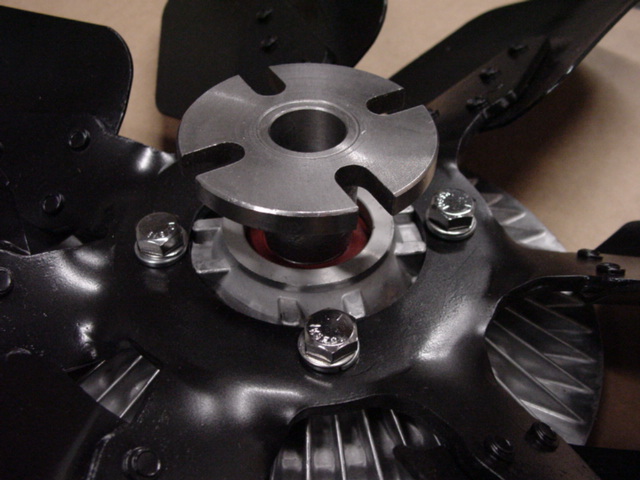 On the right we have a high performance thermal fan clutch with all new stainless steel hardware and 7 blade fan. 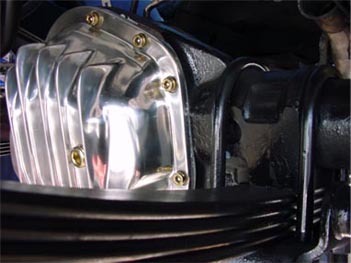 All new front end components highlighted by a full restored OEM foglight assembly that has received upgraded wiring, light element and has been custom sealed and modified to avoid future water penetration (as the originals were prone to). I ask you to please look at all of the “hidden” areas that you normally never get to see or gain access to when purchasing a so called “restoration” from any of the inferior quality restoration and renewal shops in the US. 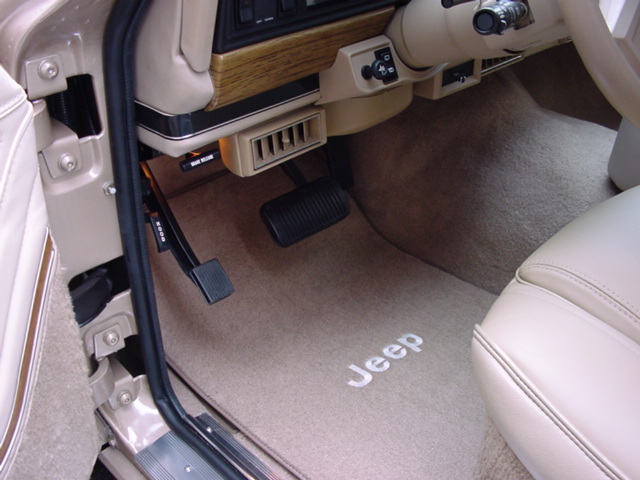 Without really examining all of the areas of the Jeep that are not readily noticeable or immediately apparent to the naked eye, you will miss much of my painstaking work and months of labor hours spent trying to provide you, our client, with the ultimate Grand Wagoneer. 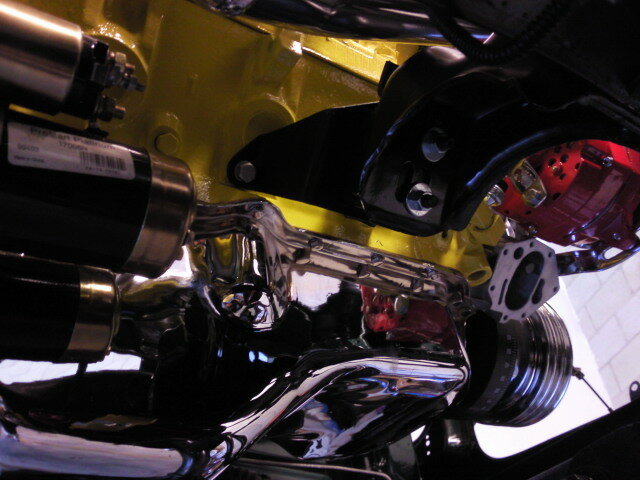 My Jeeps are designed not only to look good from 10 feet away, but to look amazing even under a microscope! 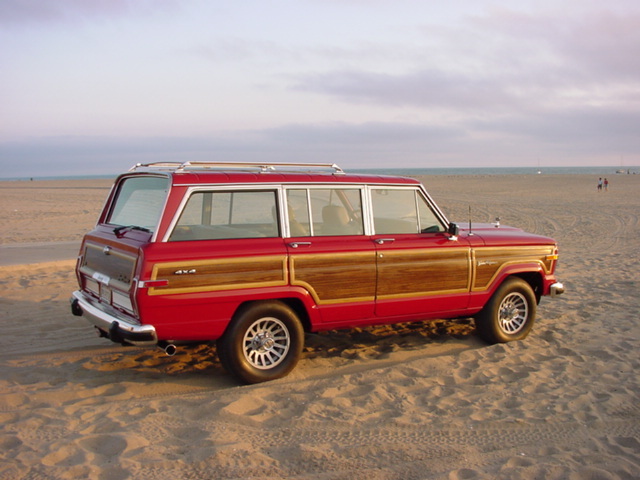 Equally important is the fact that I build my Wagoneers to not only look great on the day they are sold, but to look stunning 10 years later as well! 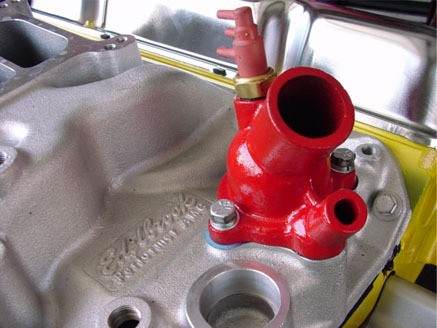 This is accomplished by many means not least of which is proper protection of all new, installed parts (painting, sealing, powdercoating, epoxy coating, etc) and using the highest quality components and parts available. 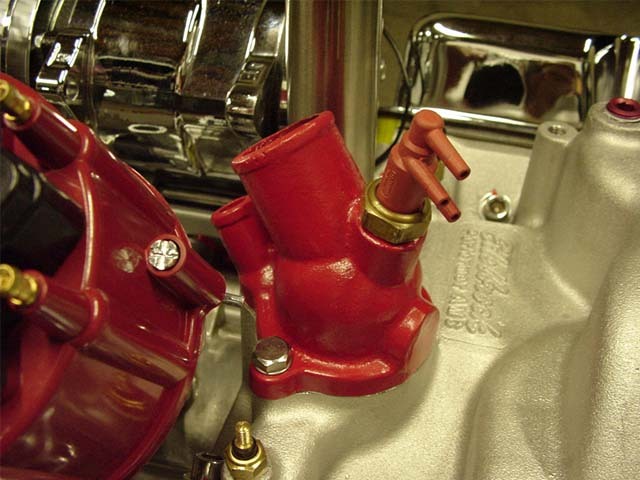 Several hundred parts that are installed on my restorations are custom made and fabricated in-house or are modified, improved or re-engineered in-house to address factory weaknesses or design flaws that have become apparent over the last few decades. 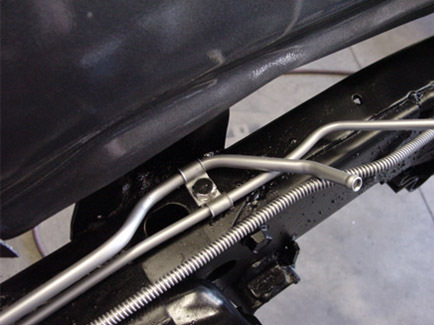 Other modifications protect the components from damage or corrosion. 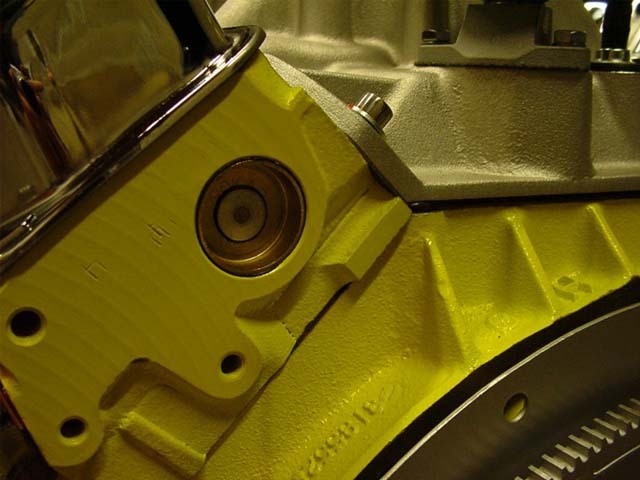 And, whenever possible, higher quality, improved, or better performing components are installed in place of original parts that were prone to failure or premature deterioration. 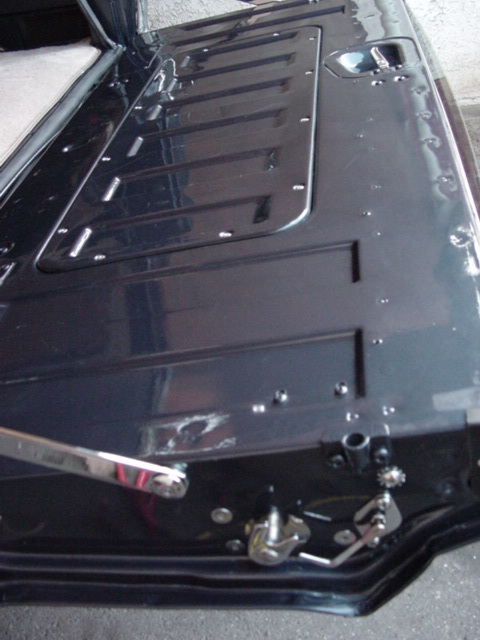 Not only is the factory battery tray removed, acid dipped, bead blasted and then epoxy coated or powder coated prior to painting, but an acid absorbing Battery Mat is placed under the battery to prevent any future rust problems in this highly vulnerable area. In addition, I only install leak-free Gel batteries, or Dry-Cell batteries to make sure that no battery acid leaks onto the engine bay, frame and suspension below it. Highest possible quality, professional paint work is a priority on my Jeeps. 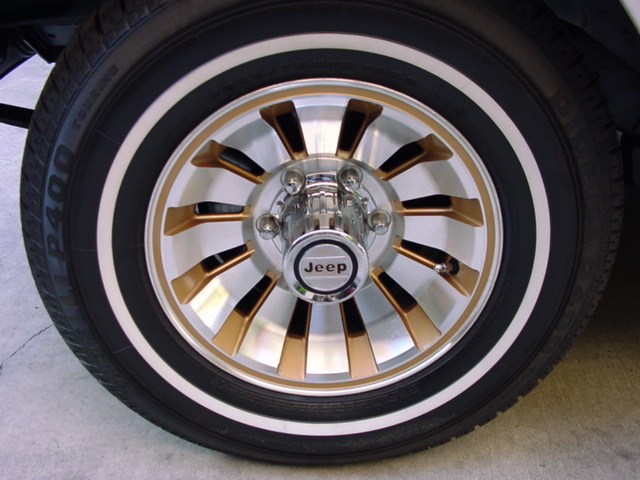 The photo below is of a customer's own Jeep that was originally BLACK, who desired a color change to WHITE. 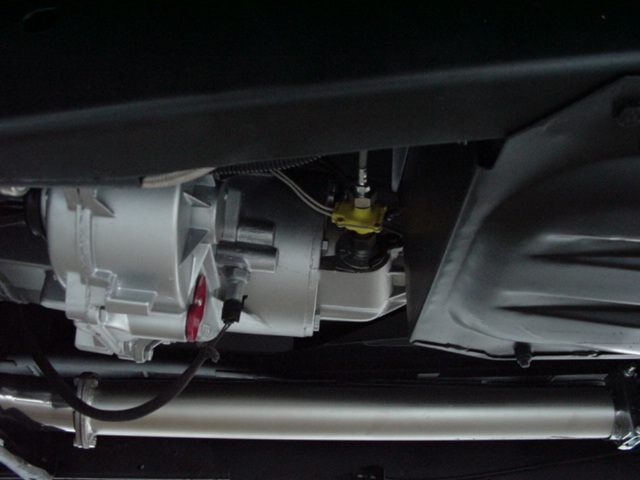 Notice that everything is removed from the firewall (and that the entire chassis, engine bay and body of the vehicle are stripped down to a bare metal chassis) prior to painting and that there is absolutely no overspray and no sign that this Jeep was ever any other color but white. 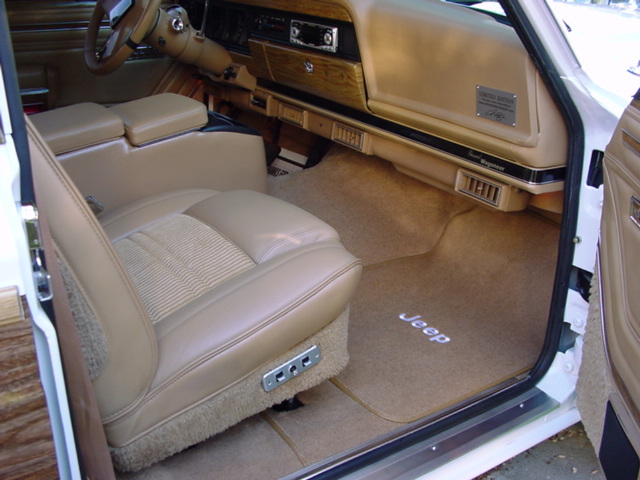 Even a true expert's careful inspection of the areas where no one usually looks (under the carpet and insulation, inside door panels, etc), would not be able to discern that this vehicle was not a factory original white Grand Wagoneer. This is simply a reflection of the attention to detail, perfectionism and quality standards that go into every aspect of my restoration work. 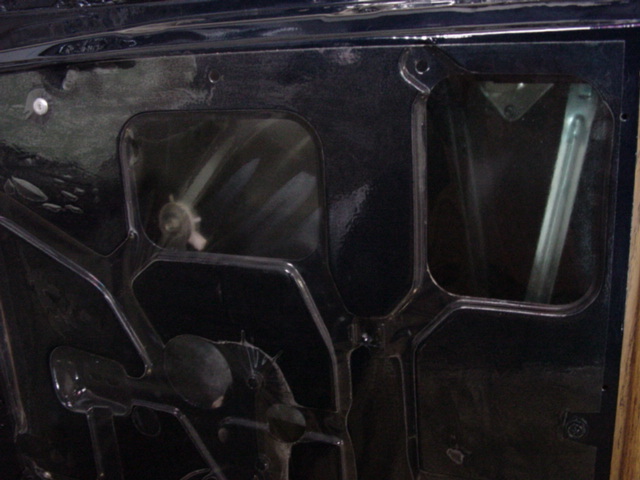 The following photo demonstrates how far more thorough, and how far above the factory’s quality levels, my restoration work is compared to the original, factory-new quality standards that Jeep used in producing the Grand Wagoneer. 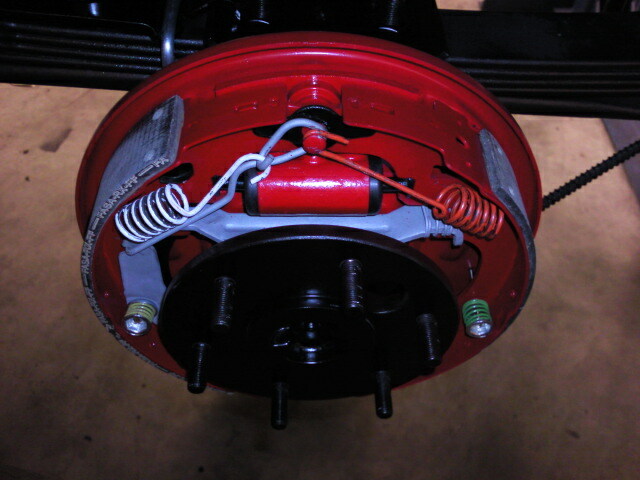 Here you see the fully blasted, sealed and epoxy coated front axel assembly, the new leaf springs, the new leaf spring retainer u-bolts and hardware, the disassembled and independently refinished and coated bearing and bushing assembly, the full restored and painted brake caliper backing plate, the new performance shock, the new shock hardware, the new upper and lower suspension bushings, etc. 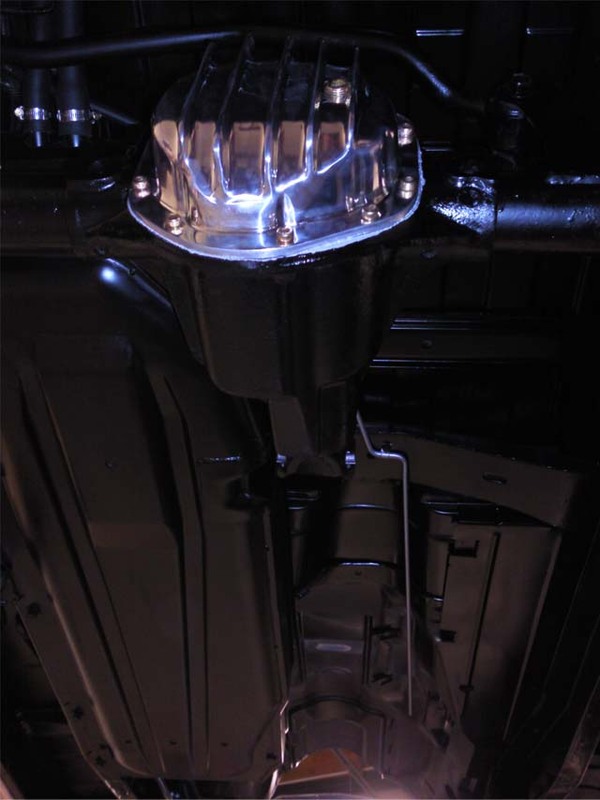 Here you see a few photos of the brand new upgraded H4 Headlight assemblies, the new stainless steel headlight brackets and hardware, the restored headlight “buckets” and the custom HID wiring assemblies. 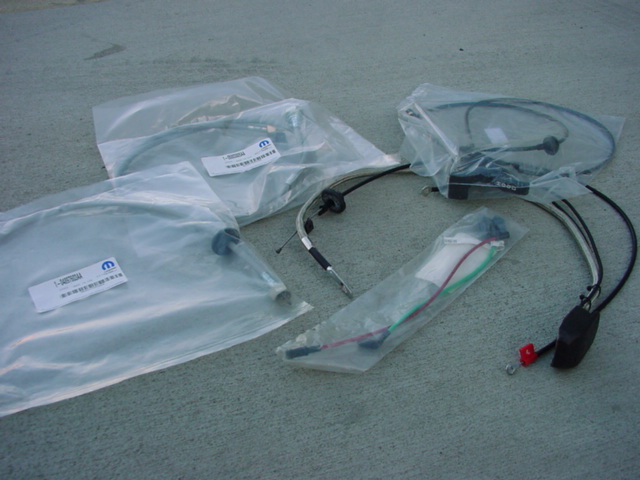 The custom in-house built H4 light assemblies, customized seals, HID bulbs and custom wiring harness from the rear. 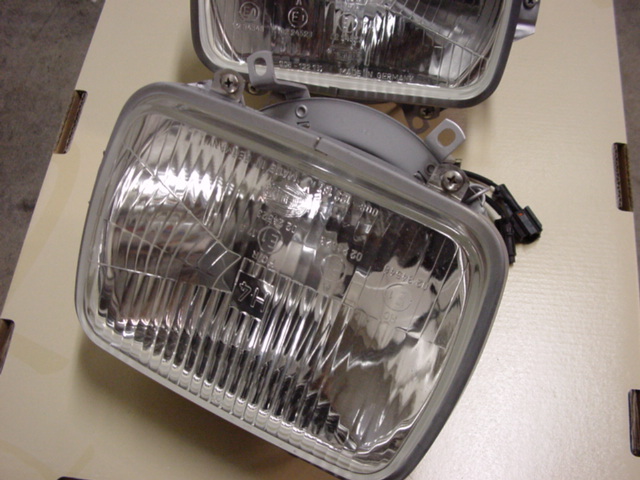 A high quality custom HID lighting installation ballast and relay for my optional high output HID Headlight System. 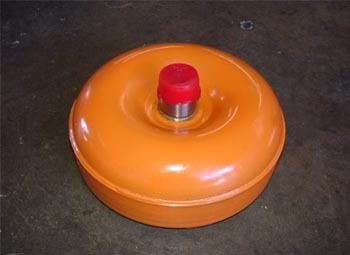 A custom fuel cap for a Grand Wagoneer with a high compression 401 c.i. 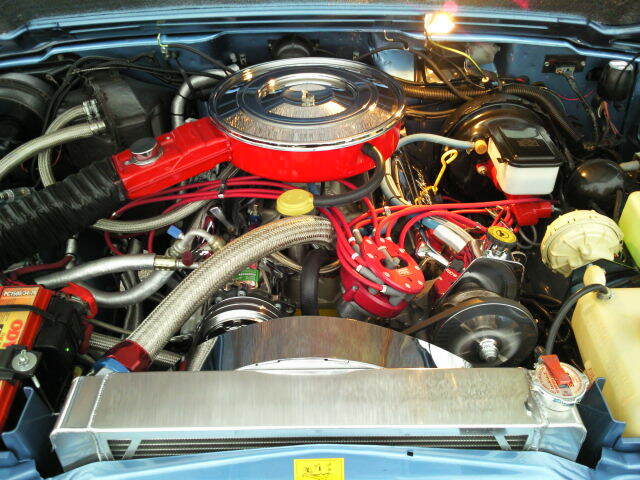 super motor, putting out over 400hp and 410 ft lbs of torque, reminding the owner and any gas station attendant that this high performance super-woody takes premium, high octane fuel only (almost all of my restorations run perfectly on regular, 87 octane unleaded). 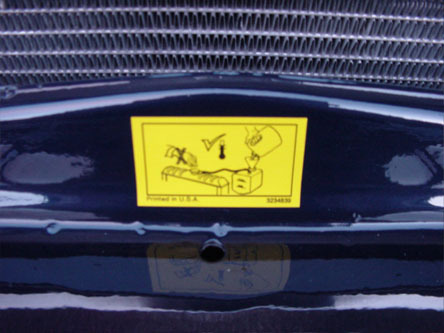 Whenever a higher octane is required (only in my ultra-high performance, high output modified motors) I also adhere professional fuel octane requirement stickers in the glove box along with other custom service specification stickers. 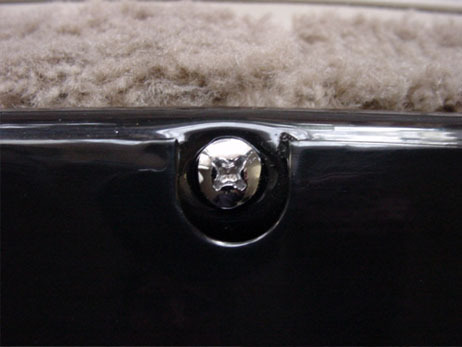 A new OEM factory tailgate key assembly and cover along with new factory seal. 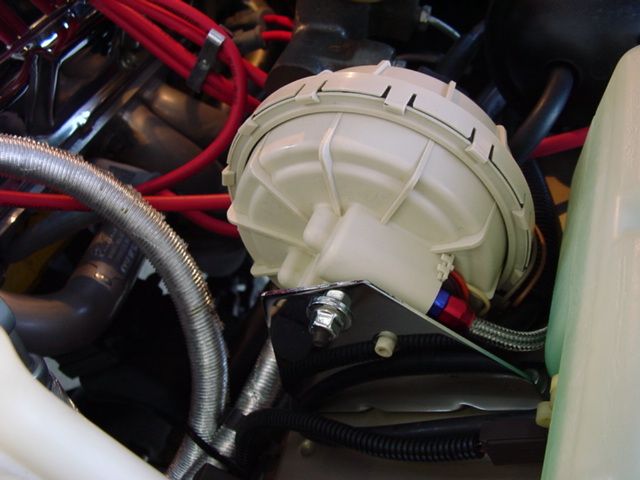 A close-up view of the new Heater Motor and a fully restored heater housing assembly. 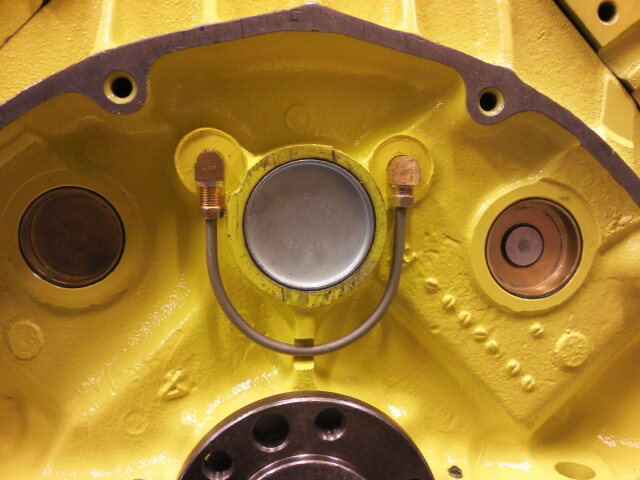 Here you see one of my custom made Air Cleaner Assemblies. 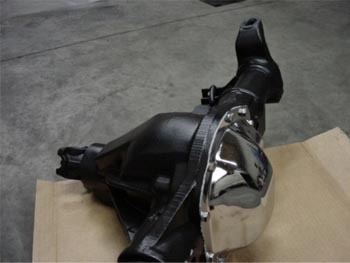 In order to maintain proper fit, factory appearance and, more importantly, so that the cold air intake snorkel can be utilized, I disassemble and strip down a factory air cleaner housing and modify the shell and internal components. 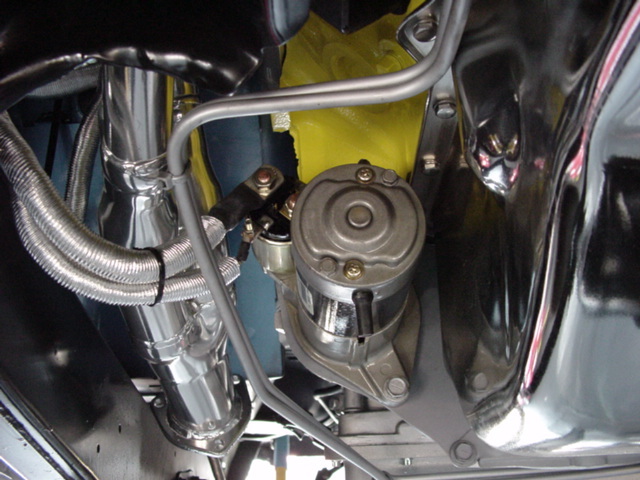 These modifications include removing the dual vacuum activated “trap doors” utilized by the original carburetor, sealing off the vacuum ports and carburetor check valve ports, and adding the air temperature sending unit required by the new Fuel Injection system. Then the entire assembly is zinc primed, the interior receives solvent resistant paint and the exterior is painted in a beautiful high quality engine enamel. 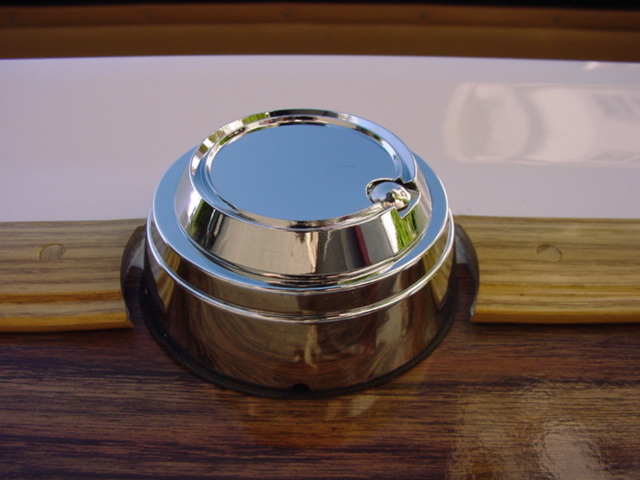 Finally the new, gorgeous chrome air cleaner lid is installed with a new mounting post and wing nut. The ultra-high quality in-house paintwork and the new, OEM rear bumper deflector/seal with new custom black mounting rivets. 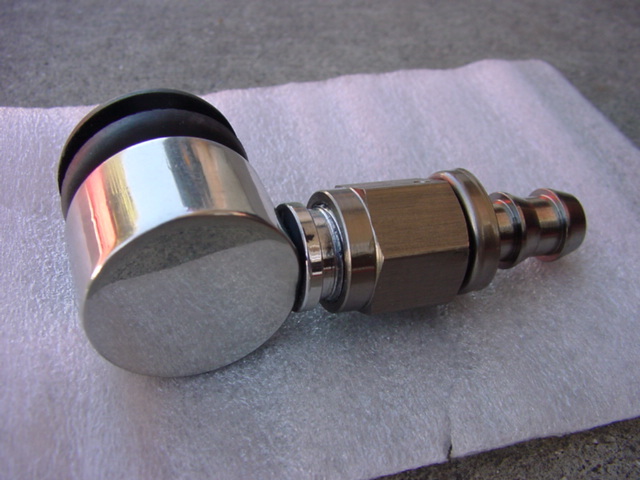 One of my custom made polished aluminum shift knobs. I machine these beautiful knobs with a staggered 3 diameter mounting hole so that they precisely and tightly fit the restored original shift lever. 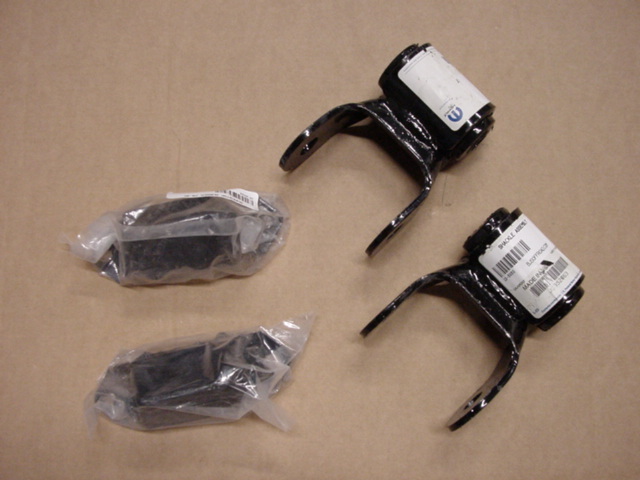 They also receive a rubber grip ring and are fully sealed to prevent oxidation. 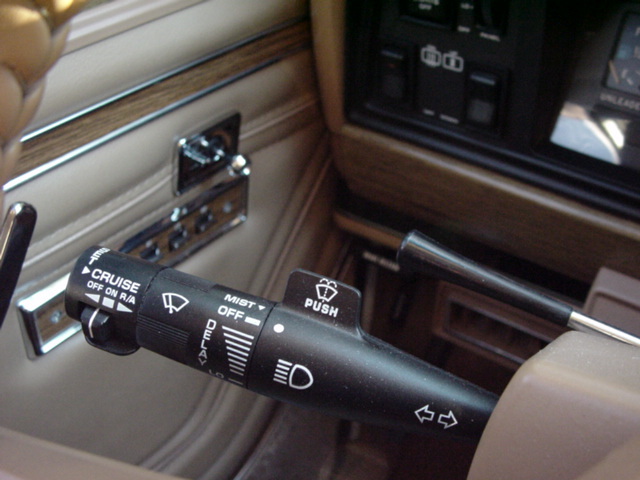 When the Grand Wagoneer was built by AMC and Chrysler, they only installed a $1 ugly plastic shift knob that had the propensity to constantly fall off or slip off the shift lever. In my restorations, no opportunity to improve on the factory design is overlooked. 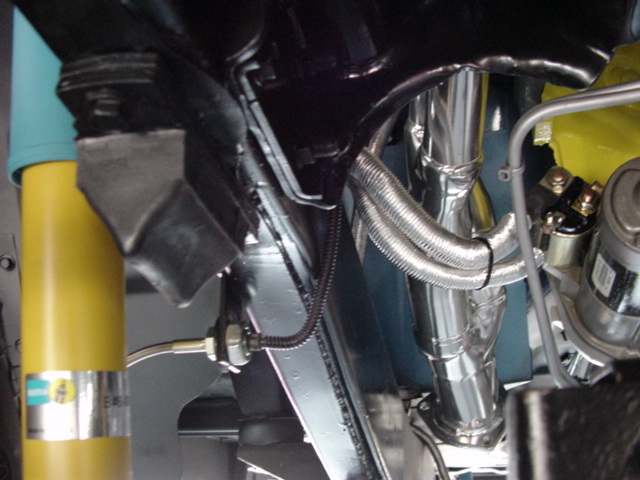 A photo of the bead blasted, alkaline washed, then zinc primed and fully Epoxy coated Underbody, and the NEW custom molded Fuel Lines/Hoses, stainless steel clamps, fuel filler neck grommet assembly and new stainless steel hardware. 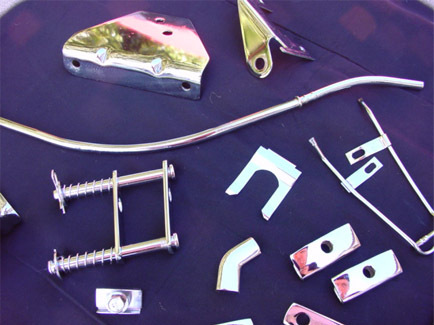 Here is a look at some of the bead blasted, alkaline washed, then primed, painted or fully Epoxy Coated motor brackets, transmission bracket, motor mount brackets as well as my custom-made chrome motor ancillary component mounts, brackets and slide-adjusters. 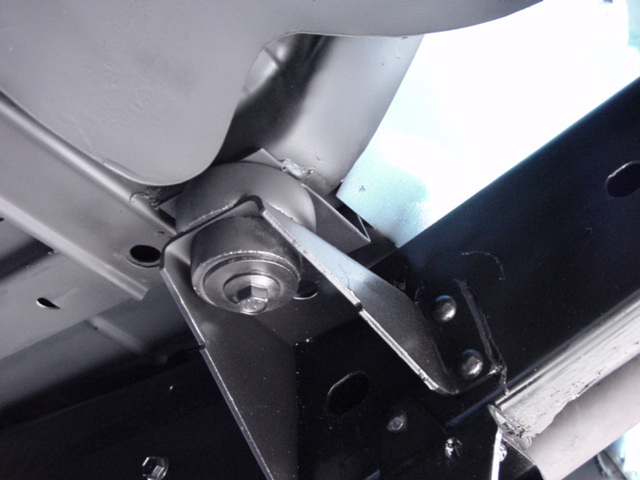 A new OEM rear bench seat Retainer Strap along with a new custom chrome retainer bolt. My brand new ultra-high performance hydraulic braking assembly with customized billet machined aluminum mounting plate, custom firewall mount, all new stainless steel hardware, new hydraulic pump, new custom stainless steel and Teflon hydraulic lines, new stainless fittings, billet aluminum hose bracket and brand new brake master cylinder, seals and plastic reservoir assembly. 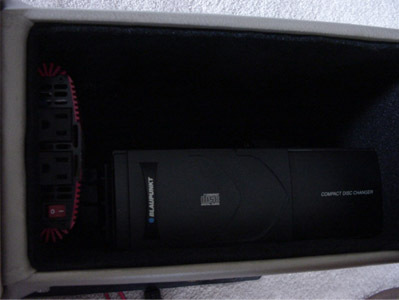 Here you see a custom auxiliary transmission and power steering cooling system with separate high output electric fan. 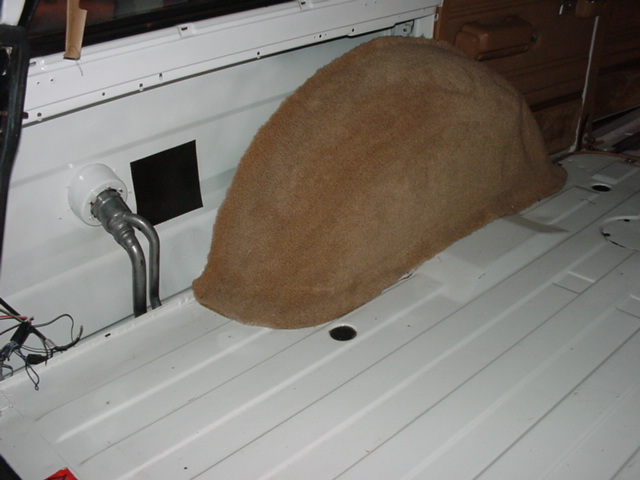 This setup was installed for a customer that used his fully restored Grand Wagoneer to pull a large horse trailer to competitions. 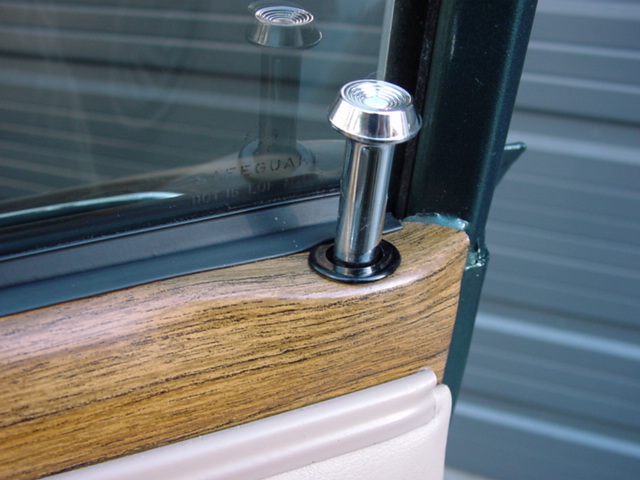 The new OEM exterior and interior window seals, new factory door knobs, door knob grommets (to prevent the all too common splitting and cracking of the door-top wood trim), the stripped and refinished door panel retainer, and the restored door panel. 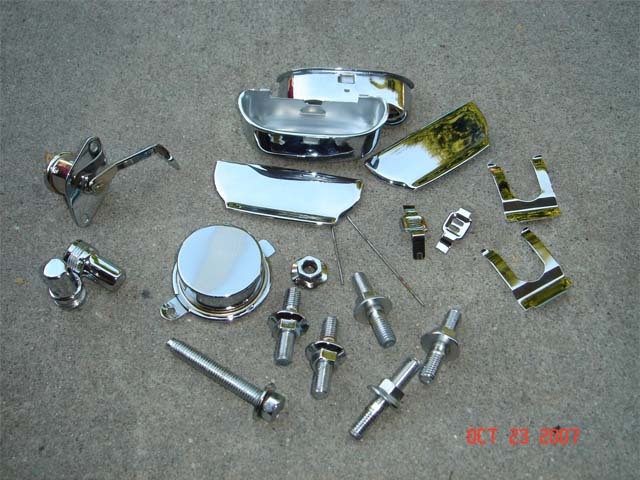 Compare my beautiful multi-layer chrome Door Latch Striker Assemblies, Chrome Bolts, Spacers and Hardware, refinished shims and fully cleaned, aligned and lubricated spring buffers to an ugly factory original piece. 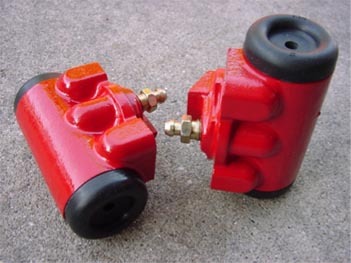 Compare this stripped, chromed and sealed Jack assembly to the rusted, deteriorated and corroded jacks that you have seen on Grand Wagoneers before. 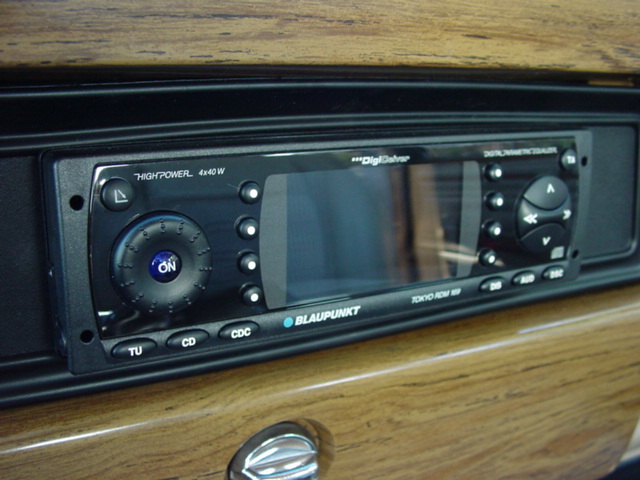 * ULTRA HIGH END STEREO SYSTEM including: - Top of the line $500 BLAUPUNKT "Skyline" CD HEAD UNITS with digital receiver, anti-theft system, adaptive tuner, radio station and CD naming, RDS station call sign and song information receiver, adjustable and adaptive Equalizer, fold-down face plate, high power amplifier, adjustable angle display, etc. etc. 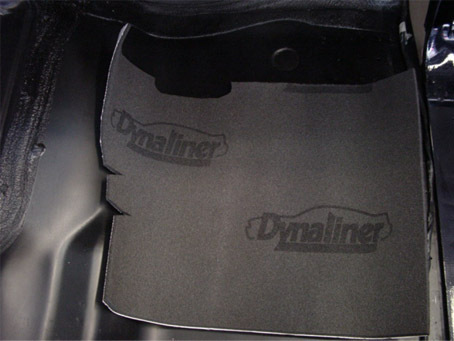 One of the best features of the skyline headunits is their "Credit Card" security system. 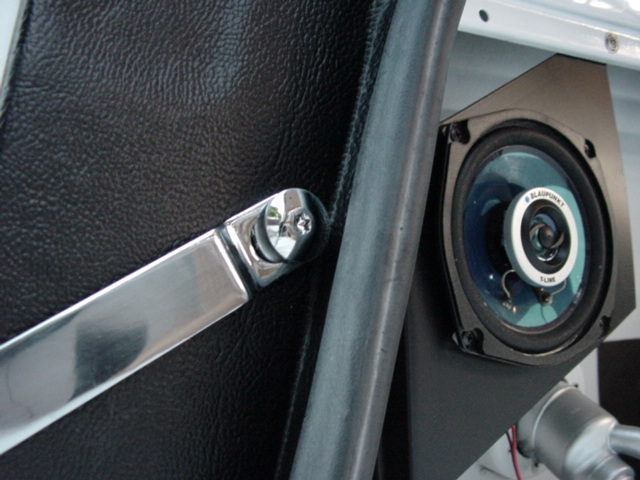 In order to incapacitate the stereo you do not have to remove the entire unit or the face, you just have to press a button and remove the security card (with embedded electronic microchip) and place it in your wallet or purse. This is by far the most convenient, classy and effective theft deterrent system that we have seen. - WIRELESS STEERING WHEEL REMOTE that lets you control your stereo and/or media player and Navigation system WITHOUT TAKING YOUR HANDS OFF OF THE STEERING WHEEL, and, more importantly, without looking at the radio and having to take your eyes off of the road. 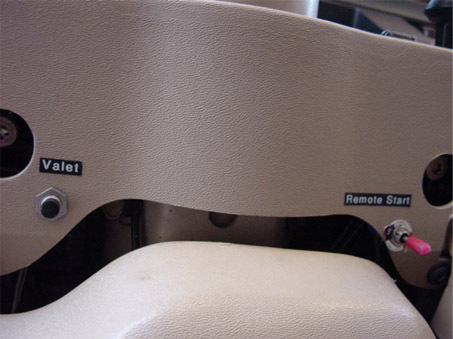 This feature may seem insignificant to those that have never owned a Grand Wagoneer. 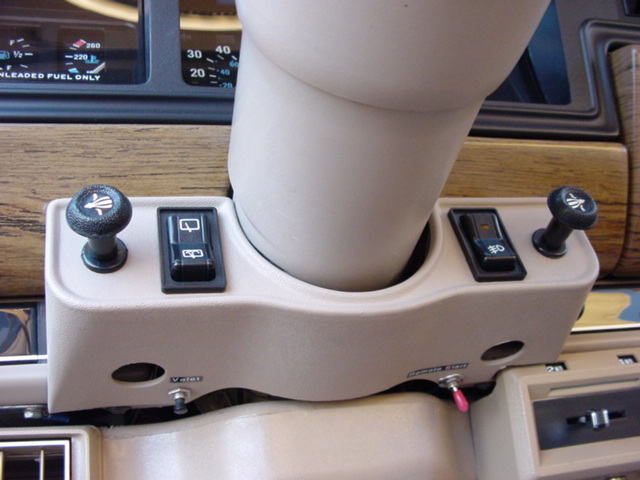 However, due to the fact that the GrandWagoneer's hood is so long, the dash so wide and the radio offset so far towards the right of the driver, this is an essential safety feature, and not just a very cool convenience upgrade. * Custom, ultra-high-end, fully programmable ALARM SYSTEM with starter and engine disable. 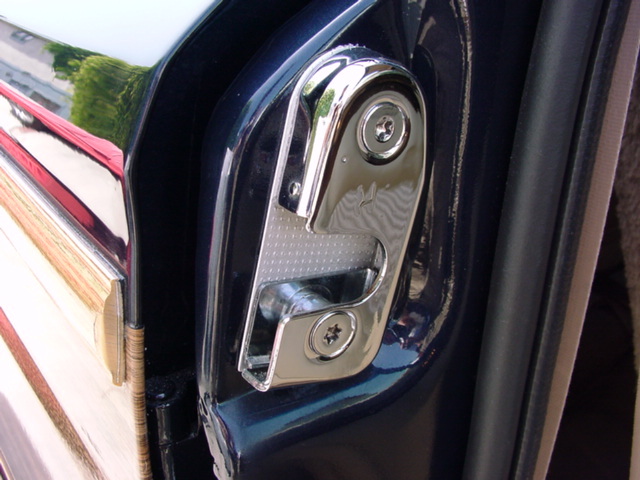 * KEYLESS ENTRY SYSTEM allowing you to lock and unlock your Jeeps doors without use of the keys. 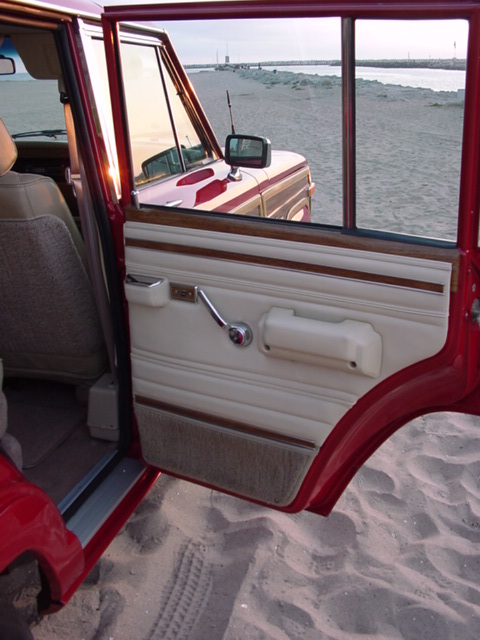 * REMOTE REAR WINDOW OPERATION which allows you to lower and raise the rear glass in the Wagoneer's tailgate, allowing you to store or remove objects from the cargo area (and open the tailgate), without using the sometimes difficult tailgate key switch and without having to open the Jeep's driver's door, place your key in the ignition and then manually operate the dash mounted rear glass switch. * Integrated, modern DOME LIGHT SUPERVISION which turns on the interior dome lights of the Jeep whenever you unlock the vehicle using the Keyless Entry system. 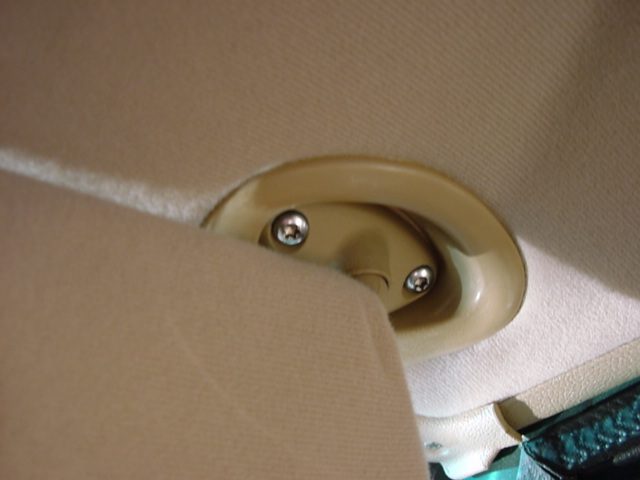 This increases security and safety as you can immediately see if someone has broken into the vehicle or is still inside the vehicle. 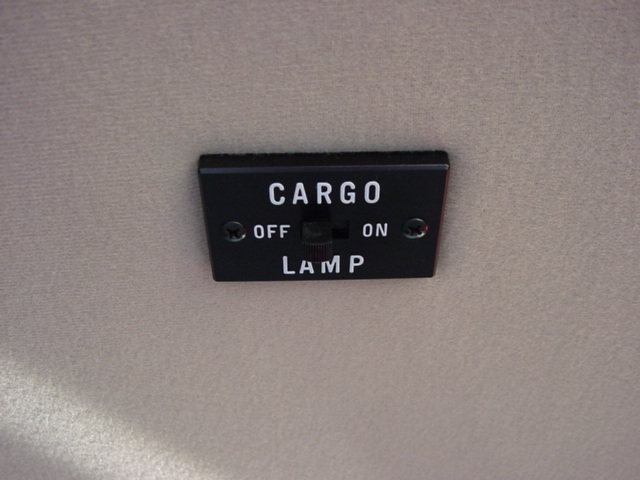 It also lets you locate the vehicle from a distance in the dark or in a dim parking lot. A photo of a recent ultra-restoration. 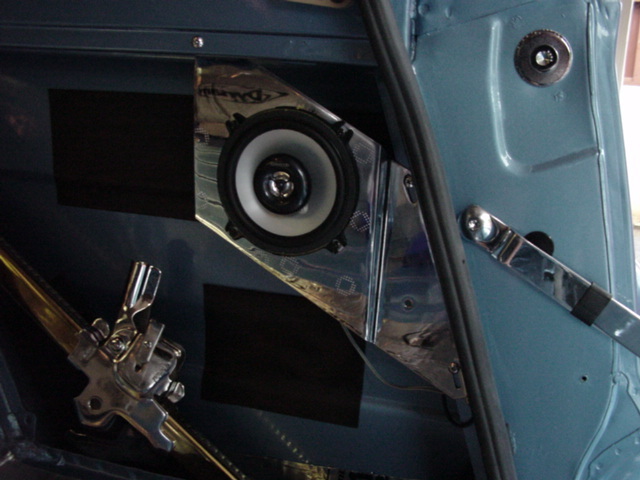 You can see the custom made chrome and clearcoated speaker frame assemblies, the audiophile speakers, the custom chromed jack and jack baseplate, the new sound isolation and anti-vibration insulation, the new tailgate seal, the new chrome tailgate latch striker and shim, the chrome tailgate arm, hardware and tension spring, some new stainless steel hardware, and the new insulator. 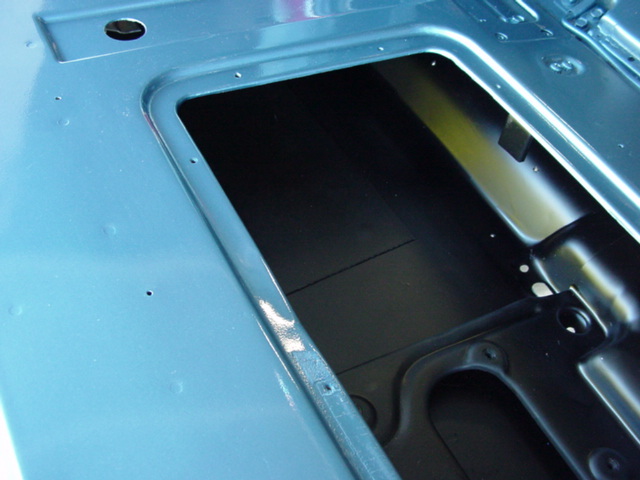 I also have to point out that the paintwork inside the quarter panels, inside the doors, on the floorboard and roof sheetmetal, etc. 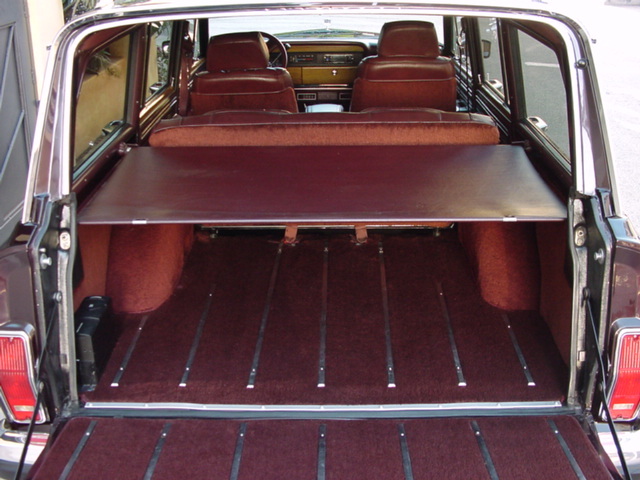 is far more complete, of higher quality and uses better materials than the factory produced when Grand Wagoneers were new. All of this extra work and attention to detail assures much better long term rust/corrosion protection and ensures ultra high end cosmetic appearance. As an added bonus, I create a luxury, custom made “OWNERSHIP BINDER” for every client. 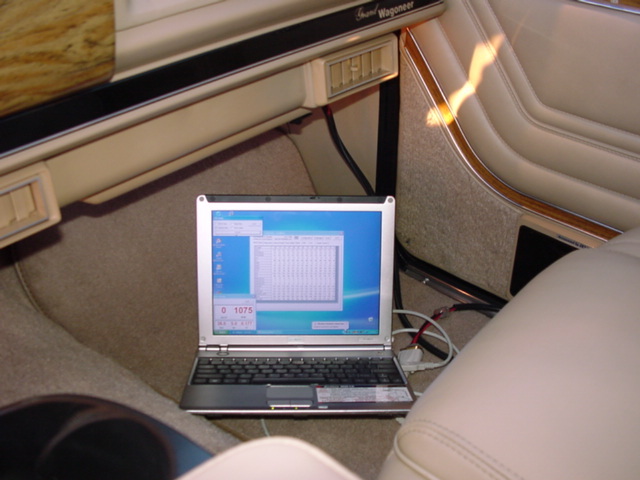 It contains all of the specific information that you will need to optimally maintain, service, operate and enjoy your new Grand Wagoneer. 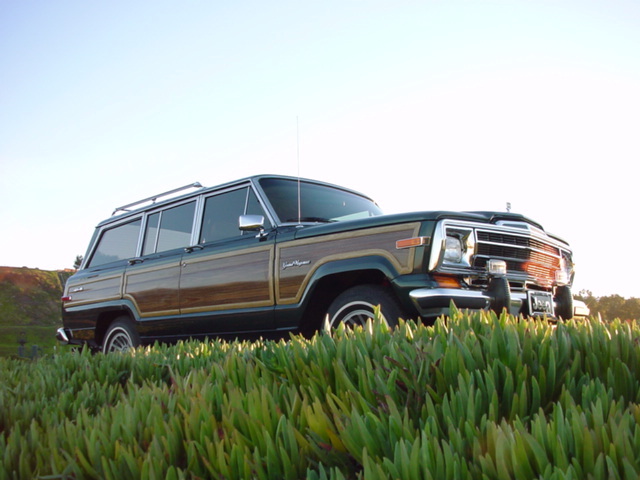 For each vehicle and owner, I create a special "GRAND WAGONEER MAINTENANCE CHECKLIST" which will show you exactly how to keep your new Jeep in the best possible condition and give you important information, details, and, most importantly, operation instructions on all of the newly installed components. It also contains around 12 PAGES OF TIPS on how to maximize the longevity and mechanical and cosmetic condition of your fully restored “woody”. 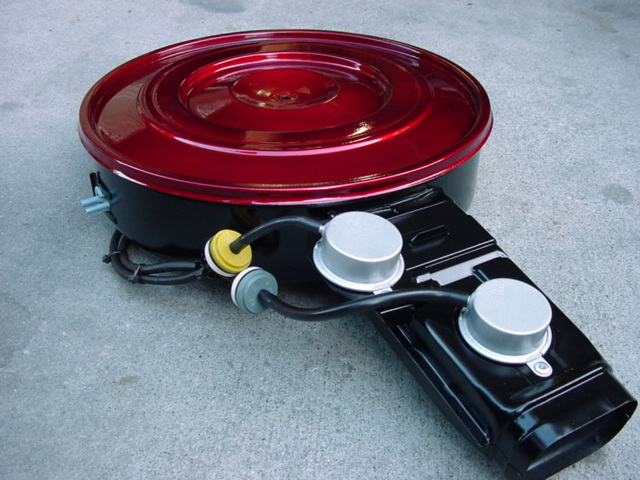 In this beautiful Ownership Binder, you will also find a DIAGNOSTIC AND SERVICE MANUAL for your new Fuel Injection and new electronic engine management system (which can be shared with your local mechanic), the PAINT CODES and materials list used, the INTERIOR COLOR CODES and material names, the OPERATING INSTRUCTIONS for your custom Alarm and Remote functions (door locks, window, engine start, etc), Engine Break in instructions, general service and upgrade guidelines, and SOURCES of how and where to find certain replacement components if you lose something. Your ownership binder will also contain a PHOTO CD with up to 800 highly detailed, sharp, beautiful photos of your Grand Wagoneer during various stages of its restorations. 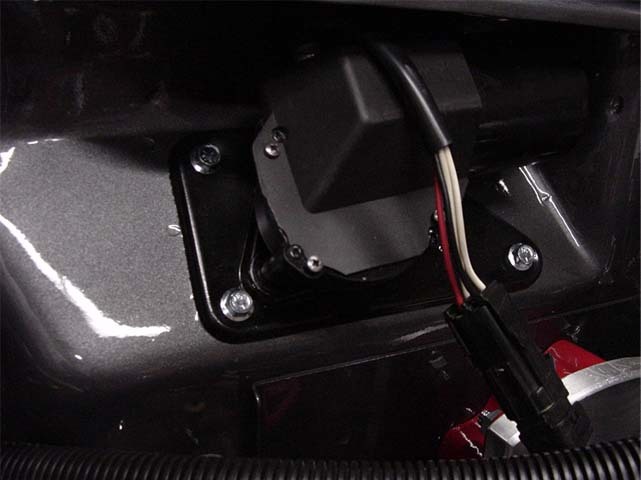 There will be photos of the individual mechanical and cosmetic components prior to installation and hundreds of pictures of the areas on the Jeep that you will likely never see or inspect personally….everything is visually documented for you. 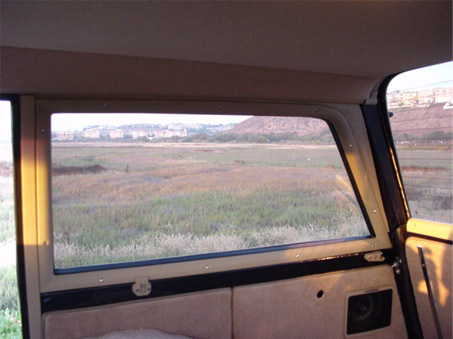 These photos will not only function as a record of the extremely extensive restoration that your Jeep has undergone, it will also offer years of pleasurable viewing that you can share with family and friends. Another fantastic addition to the Ownership Binder is a copy of the impossible to find, ORIGINAL NEW OWNER INTRODUCTORY AUDIO RECORDING issued to new Grand Wagoneer buyers from Jeep, in limited numbers, as an audio cassette in the late 80’s and until 1991. 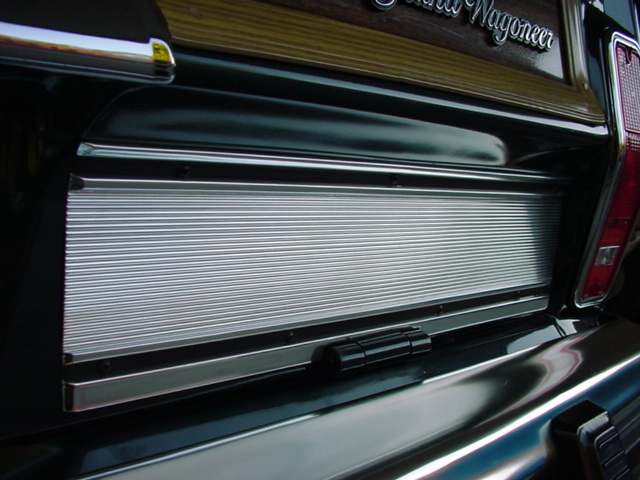 It is a fun and nostalgic professional recording that lists all of the Wagoneer's features, how to use them and is a wonderful collector's item that you are sure to enjoy. 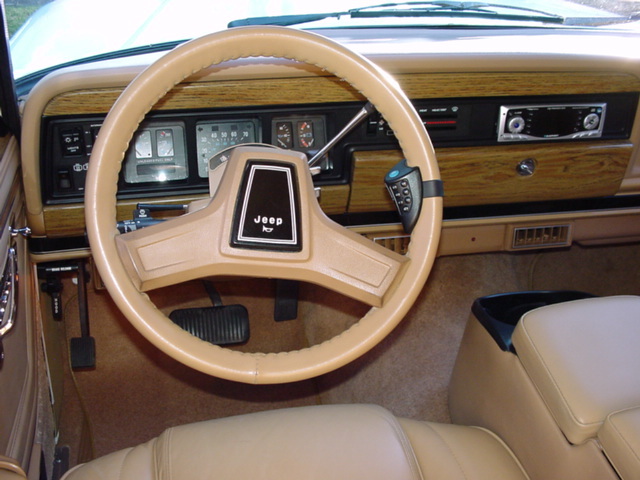 Also included in the Ownership Binder are all of the USER, INSTALLATION, AND OWNER’S MANUALS for the upgrades and electronics that have been installed, a custom key fob and a BRAND NEW FACTORY GRAND WAGONEER OWNER's MANUAL for the specific model year of your new Jeep (long out of print and no longer available). 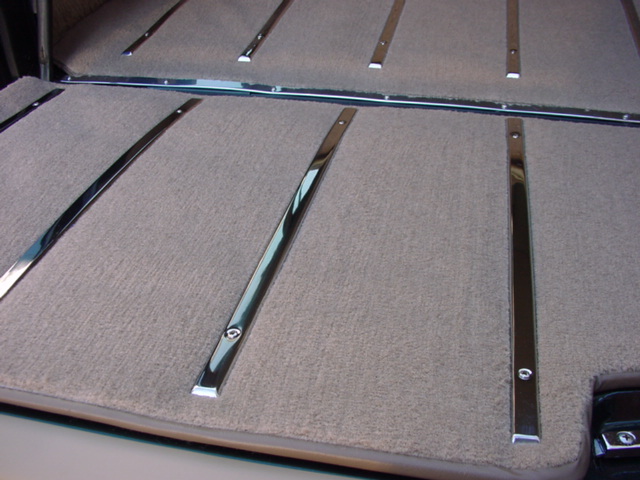 Depending on the upgrades that your Wagoneer has received, there can be quite a number of additional items included in the binder. Finally, I provide you with what I consider to be the best REPAIR AND MAINTENANCE BOOK available, written in layman’s terms with hundreds of high quality photos and images. If you have the inclination, and the time, you will enjoy looking through this book to gain a deeper understanding or how your Wagoneer was designed. 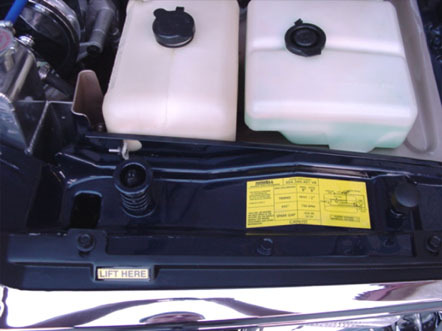 Along with this manual, you will receive several MAINTENANCE SUPPLIES like wax, leather care products, lubricant, engine additive, or other items that I believe will come in handy. Lastly, and very importantly, I include a substantial amount of EXTRA PAINT that exactly matches the color code and mix of the paint that was used on your Jeep. 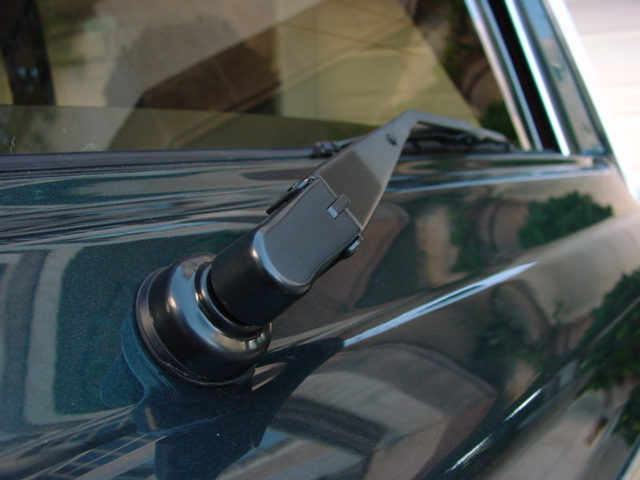 This can be a real savior as it is quite difficult for body shops to accurately match the existing paint on a car during repairs. 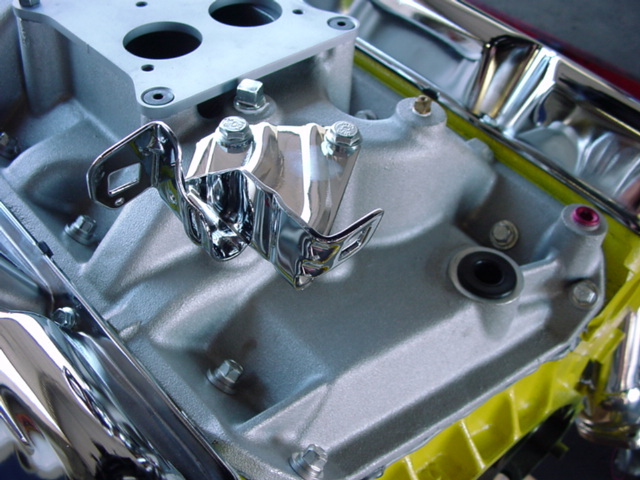 Modern metallic and pearl coat paints are exacting formulas of up to two dozen tints and metallic additives in precise quantities, making correct matching very difficult. The extra paint that I provide you will allow you to have several body panel repaired if you ever get in an accident, fender bender, or just want to have a large ding or dent removed. 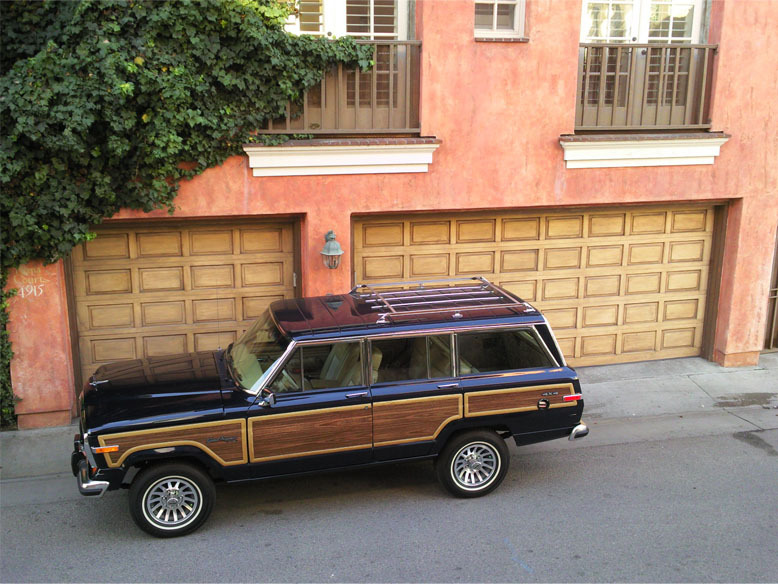 So, even if some body and paint work becomes necessary, the exact matching paint will help to assure that your Wagoneer will stay as beautiful as it was when you first received it, and no one but you knows that a repair was ever made. NEW BONUS: As of a month ago I began providing my customers with a beautiful digital picture frame that contains a handpicked selection of around 200 of the best photos that I have taken of their magnificent new Grand Wagoneer. The photos show close up details from all stages of the restoration and plenty of stunning shots of the exterior with gorgeous backgrounds. You will be proud to display this frame at home or at the office…it will be sure to stoke your love and passion for your woody and impress your family members and coworkers with the beauty, features and quality of your new Jeep. However, more valuable than all of these wonderful bonuses, records, guides, supplies and other custom “support” literature, is my personal promise of lifetime support for each and every one of my customers. For as long as you own your Jeep, I will “be there for you”. You can email or call me anytime with troubleshooting questions, repair or maintenance instructions, assistance and guidance for your local mechanic, help sourcing parts, insurance claim assistance, as well as help with any other issues or questions that you may have. 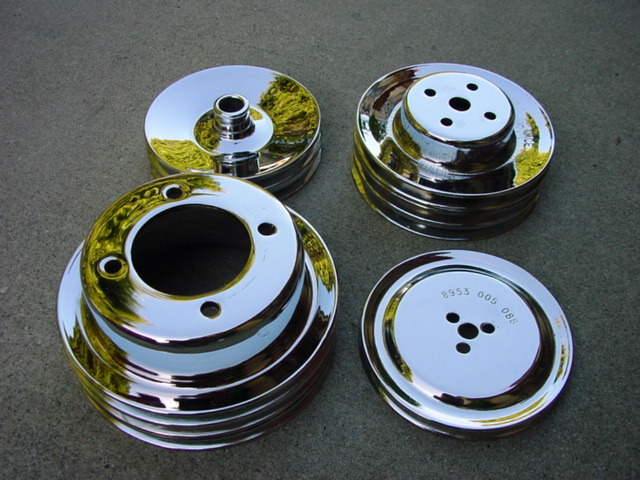 I will also maintain a very extensive inventory of OEM parts that are no longer available anywhere else on earth, for my loyal, existing customers. 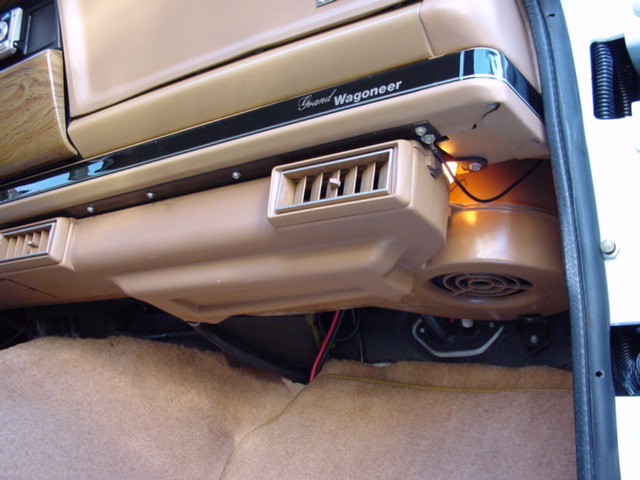 This comprehensive support is simply invaluable and should be a wonderful asset, and added sense of security, for each and every www.grandwagoneer.com client. You could go out and buy yourself a brand new, “cookie-cutter” $70,000 to $120,000 high-end SUV (Range Rovers, Mercedes “G Wagons”, Porsche Cayennes, Hummer H1s, fully loaded Cadillac Escalades, etc.) that can be seen on every street corner in big cities. If you do decide to purchase one of these vehicles, you may forget to factor in that you will pay luxury taxes, exorbitant registration fees for the first 5 years (in most states), and super expensive insurance premiums on these new “luxury” vehicles. As an alternative, you could buy an ultra-exclusive and rare full restoration of the ORIGINAL SUV and enjoy low taxes, cheaper registration and much less expensive insurance. 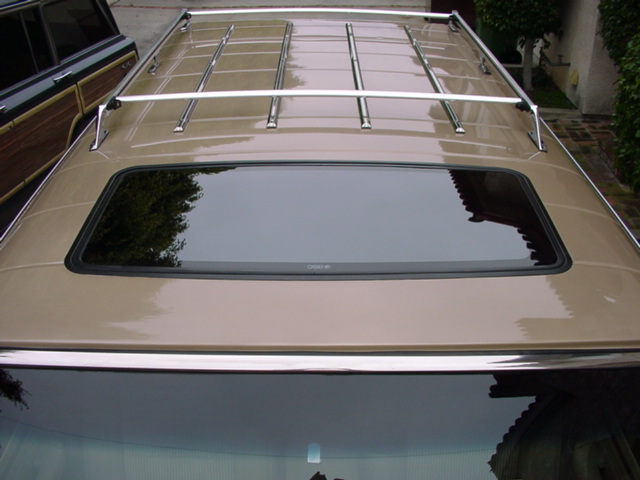 After receiving the www.grandwagoneer.com highest-available-quality, full, professional, ground up restoration, our Grand Wagoneers arguably look as good and drive as nicely as anything on the market today. 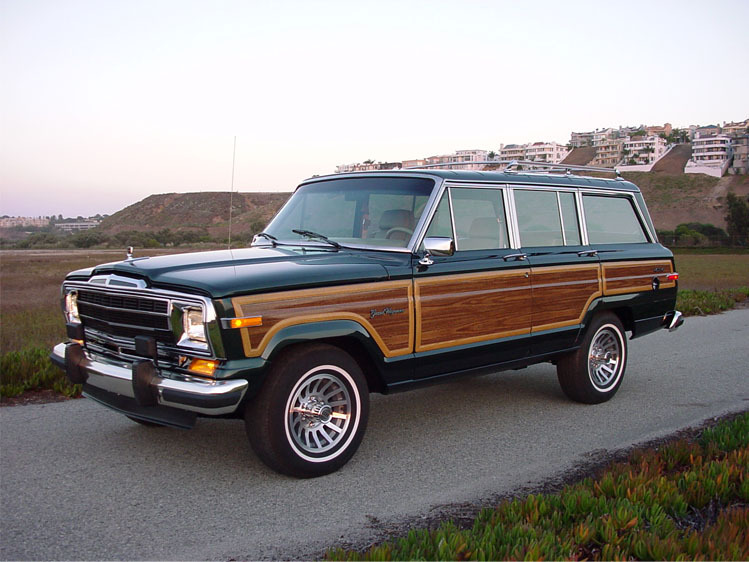 And the Grand Wagoneer’s timeless, classic styling will never blend in with the look-alike, generic designs that seem to make every modern vehicle look alike. Even my very wealthy customers that own all manner of supercars and the highest priced vehicles made, tell me that they get more “thumbs up”, approving nods, smiles of appreciation and compliments on their Grand Wagoneers than from any of their “supercars”. These “American Icons” tend to draw more looks and attention than any of the new look-alike high priced SUVs that anyone with enough money, or the credit to finance, can walk into a showroom and buy. Also, keep in mind that when purchasing any new, expensive SUV, they can lose as much as 50% of their value in the first 3 years (in many cases, over 15% the moment you drive them home). New vehicles are a “dime-a-dozen” and you will always lose a lot of money in resale because there is plenty of supply in the used market. 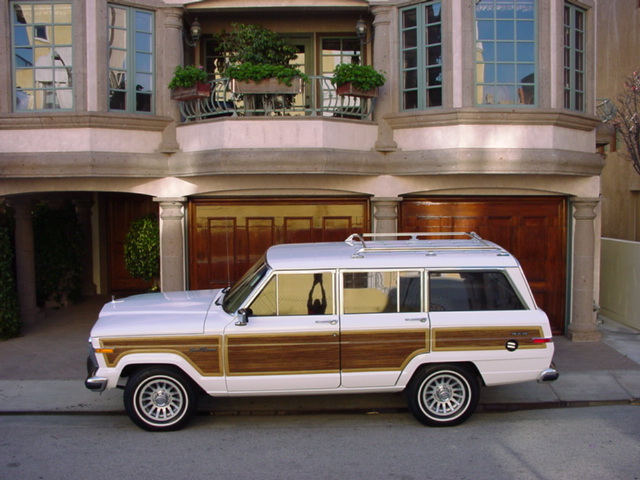 In contrast, Grand Wagoneers are, due to aforementioned factors, classic, collectible, historically important, increasingly rare, one-of-a-kind vehicles. That rarity and superfluous condition should help them to maintain their value better over time. If well maintained and cared for, they will not only be a pleasure to drive and own, but, in the long run, may also appreciate*. In fact, I found it very interesting that the Wall Street Journal recently wrote an article highlighting the growing trend of people purchasing classic, restored cars and turning them into useable, fun investments, as an alternative to the volatile financial markets. Nationally published economists and economic advisers (like John Kamin of “the Forecaster” fame) have been advocating this method of capital preservation and useable, fun investment for decades. After the events of the past few years and the growing unease with paper investments, the trend is definitely towards tangible, physical assets in investing! 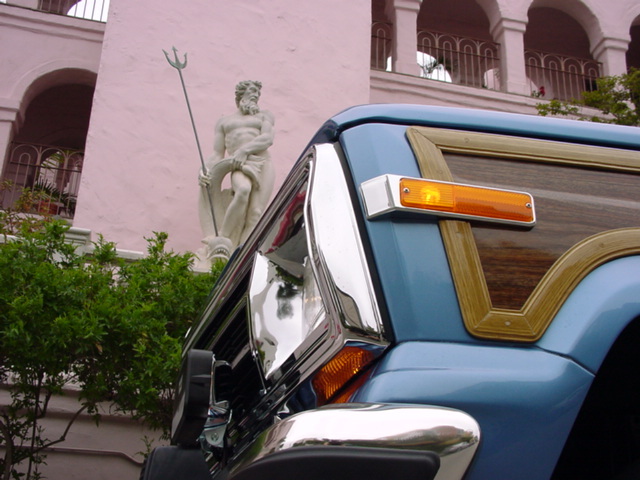 In fact the Wall Street Journal specifically chose the Grand Wagoneer as a prime example of this phenomenon. 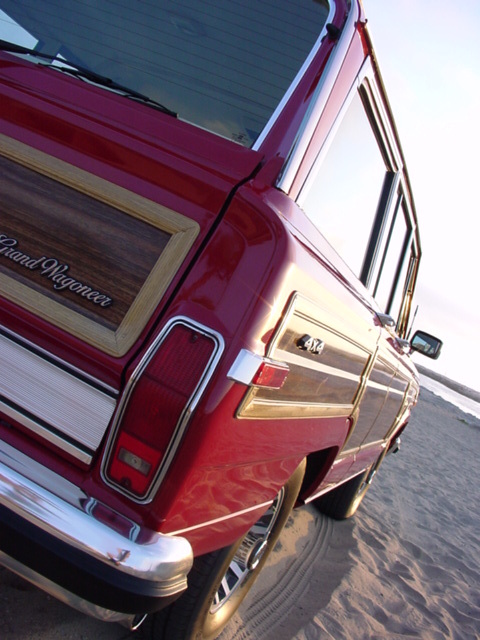 When the Grand Wagoneer was designed, it was one-of-a-kind and an innovator in its field. In fact, it was the very first SUV in the modern meaning of the term. It was THE pioneer and innovator on which the SUV's of the future were based. 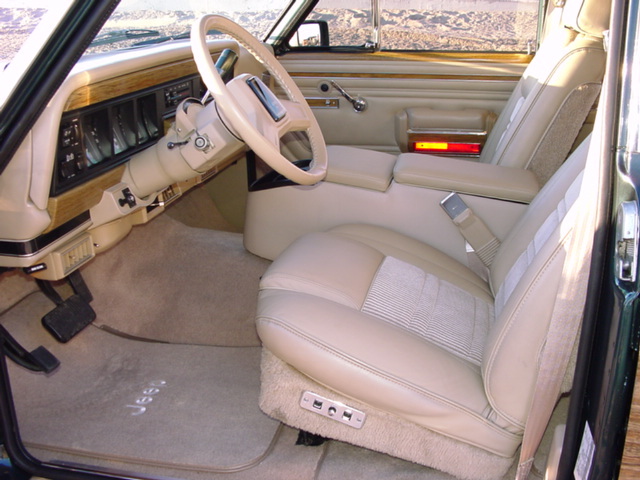 It was the first vehicle to combine rugged suspension, steering and the low center of gravity of “body on frame”-designed construction with full time 4-wheel drive, an automatic transmission, luxury car smoothness and ride, and all of the power accessories and luxury amenities of a Cadillac. Every SUV since the Grand Wagoneer’s introduction has been modeled after it to some degree. 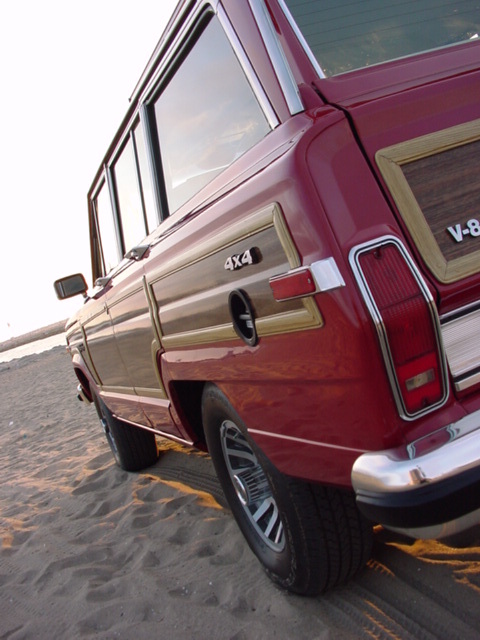 None however, have been able to capture the Grand Wagoneer’s immediately identifiable and unique style, its timeless, classic lines and trim, and its iconic status. 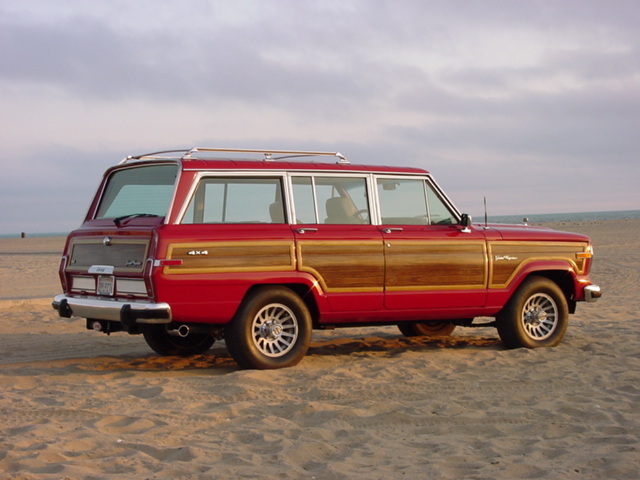 When Jeep first sold Grand Wagoneers, their marketing materials boasted that the Grand Wagoneer had the highest buyer financial demographics of any American vehicle sold (the average Grand Wagoneer buyer in 1991 had a reported individual income of $102,000). Purchased by the affluent, the quality minded, and the image conscious, Grand Wagoneers could hold their own in a venue populated by Mercedes, BMWs and its cousin the Range Rover. 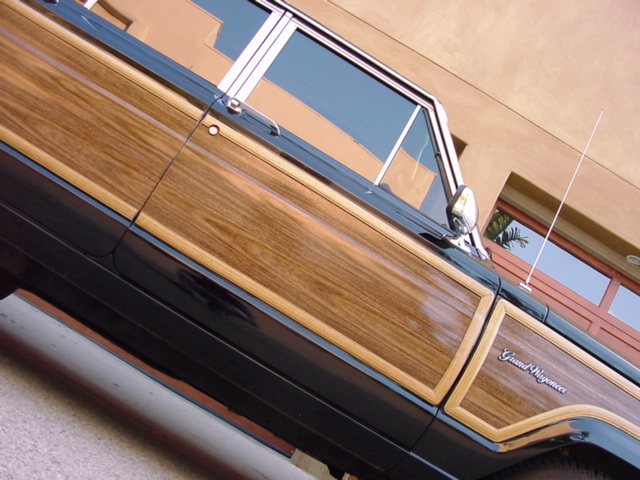 Although our trusty “woodys” don’t have airbags or ABS brakes, there are four design elements of the Grand Wagoneer that, in combination, can make it a safer vehicle (for driver and passengers) than the majority of brand new cars on the road*. 1. 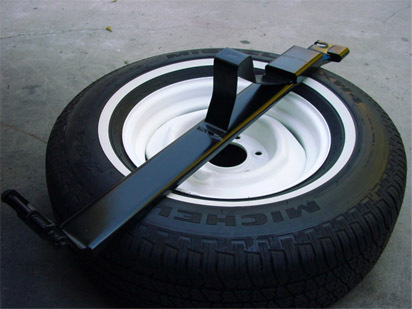 Weight: Grand Wagoneers are pretty heavy and mass (weight) is a critical factor in determining the outcome of any accident. All things being equal, the heavier and bigger your vehicle is compared to the vehicle you are in a collision with, the safer you are. 2. 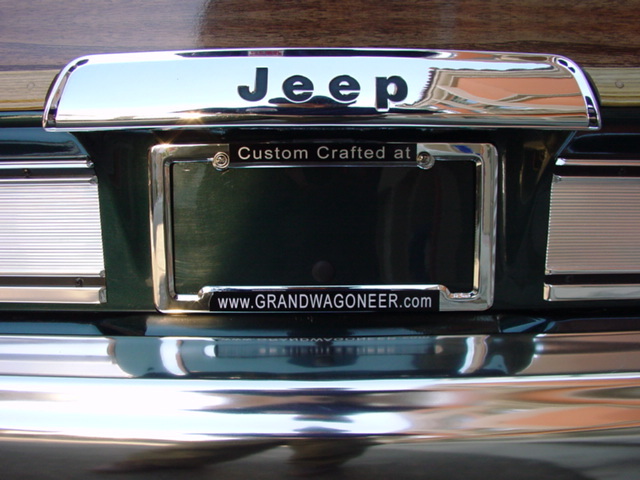 Design and Construction: - Grand Wagoneers are made of very heavy gauge steel (much thicker than modern cars and trucks). 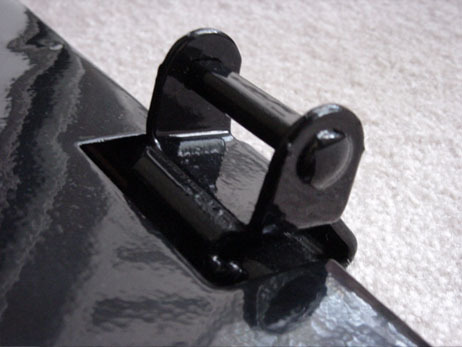 No urethane or plastic panels, no riveted construction, no foam and plastic underclading and support structures, no fiberglass and no 18 gauge sheet metal. 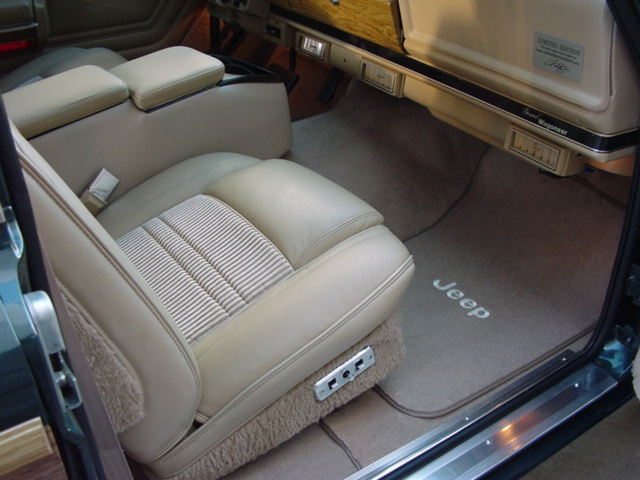 - They offer a high seating position and a higher suspension than passenger cars which results in a Grand Wagoneer tending to travel “over” a passenger car that it has a collision with, while the smaller and lower passenger car gets forced “under the higher suspended Jeep. - The Wagoneer has a very long hood, a massive engine, and, equally important, a long cargo area between the rear bumper and the backseat. 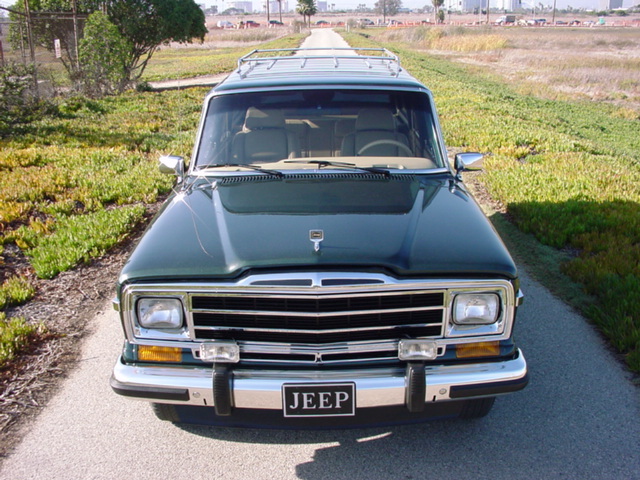 Unlike modern vehicles with shorter hoods, small motors and small cargo spaces that are just a foot or two from the rear passengers, a Jeep Grand Wagoneer offers lots of heavy steel and plenty of “space” between you and the other vehicle in a head-on or rear-end collision. 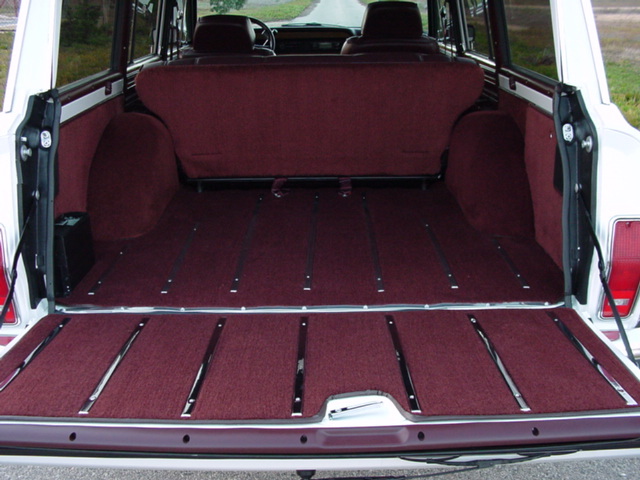 - Last, another Grand Wagoneer design feature that contributes to safety is its relatively wide “stance”. 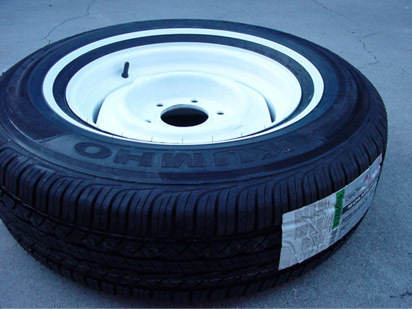 The wider the “track” of a vehicle, or the distance between the right and left tires, the less prone it is to rolling over (all other things being equal). 3. 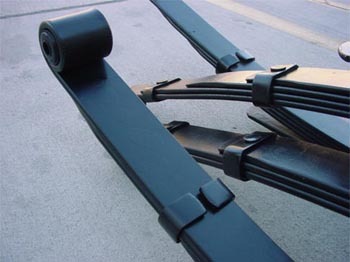 Subframe**: The full perimeter subframe design (or, more accurately, the “body on frame” design) provides a low-center of gravity (formidable roll-over resistance), excellent off-road capability, safety, stability, and a virtual “safety cage” of heavy gauge steel surrounding the passenger area, full time. Most of us already realize that, in an accident or collision, the physics of mass and energy(speed) dictate the outcome and consequences for both car and driver. Therefore, the Wagoneer’s weight, the huge engine and the long engine bay already offer more protection in a head-on collision than almost any normal passenger vehicle. However, there are a number of modern full-sized SUVs that offer this same benefit. 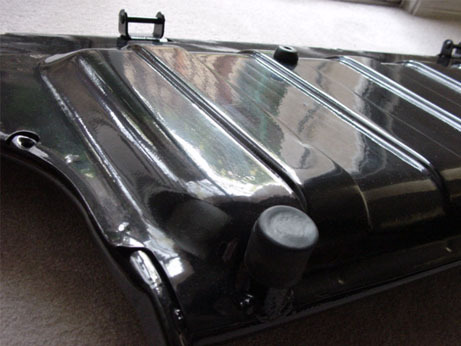 What those other unibody SUVs do not have, is the barrier protection of a separate subframe. 4. 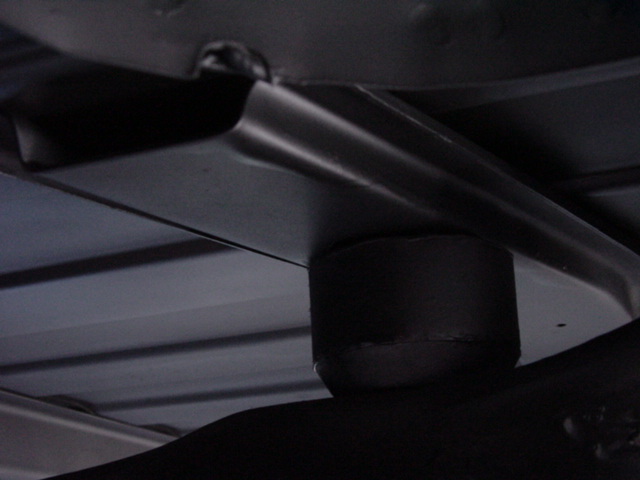 Lower Center of Gravity: What most other SUVs offer in protection in the way of mass and weight, they lose due to their greater propensity to roll over under certain conditions. The primary factor that makes SUVs more likely to roll over than a passenger car is their higher center of gravity (more weight, further from the ground). 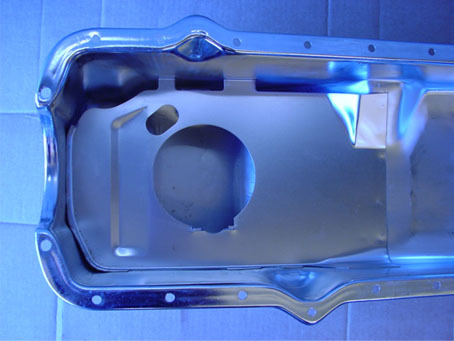 The reason that most of today’s SUVS suffer from this flaw is that they are built on unibody (or “unit body), pinch welded chassis that do NOT have a heavy, thick, separate frame assembly that is very low to the ground. 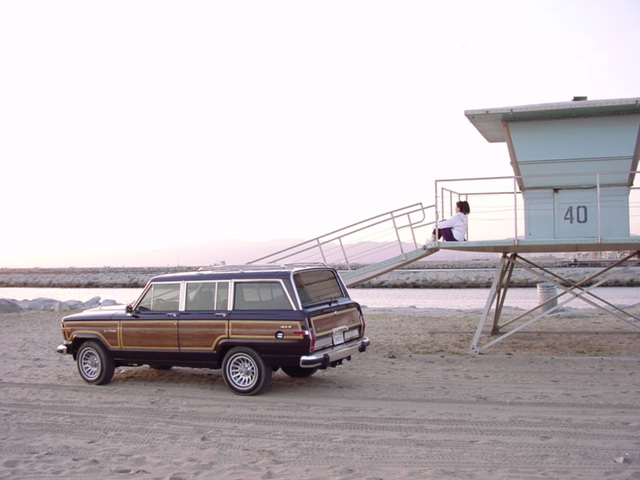 The Grand Wagoneer has much greater roll over protection simply because its center of gravity is so much lower due to that massive frame, the heavy one-piece axel assemblies (both front and rear), and the very thick heavy leaf springs that almost every modern SUV, and certainly, all modern cars lack. 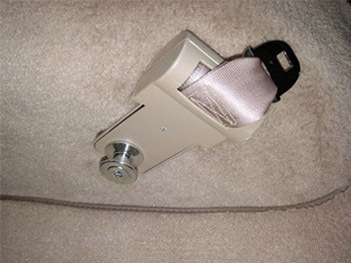 *Of course, even though you may consider your woody a “tank”, you must still ALWAYS wear your seatbelt. 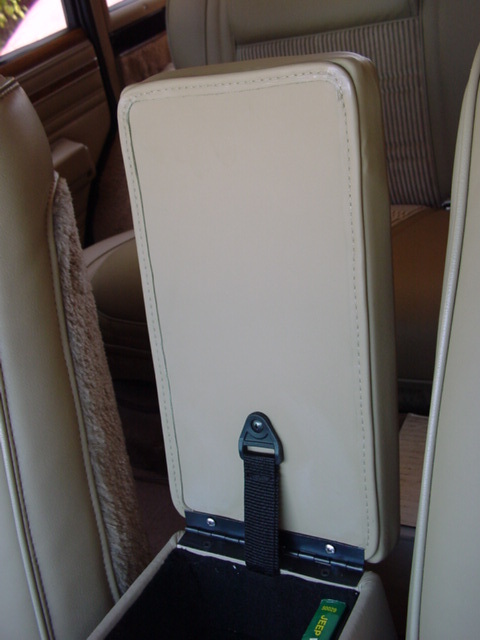 Even if your Jeep can survive the worst accident and the seating areas of the Wagoneer are not compromised, you will NOT stay safe if you are not wearing a seatbelt and are thrown from the vehicle. 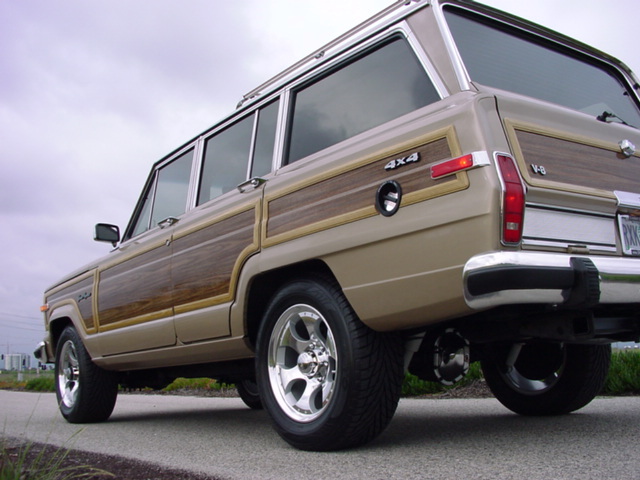 In addition, this argument assumes that you are driving a fully restored Grand Wagoneer that has the type of optimized suspension, better brakes & handling, and better visibility, along with all mechanical systems in proper working order, that my full restorations have. 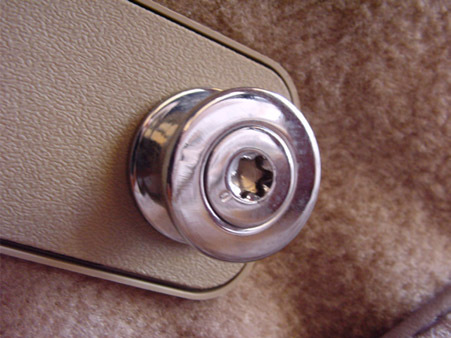 If things are old, worn out and don’t work, such deficiencies cause their own safety problems. 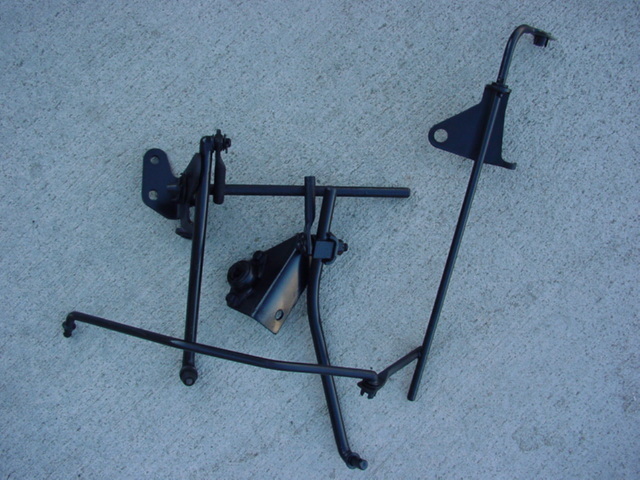 **What is a subframe? 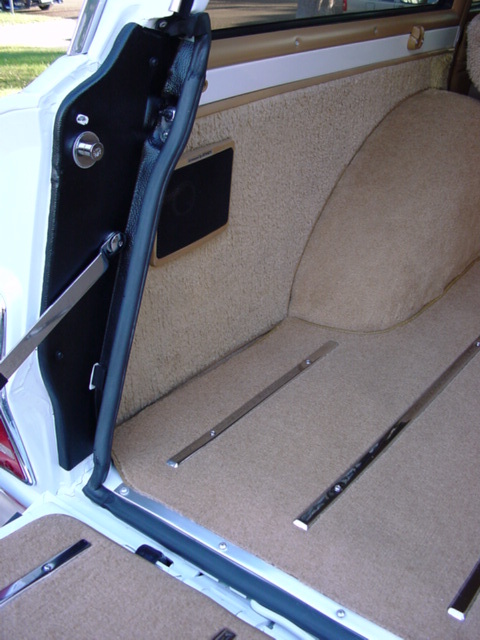 A subframe is the heavy, solid steel, thick-gauge metal “box” or “perimeter frame” that the body/chassis of the Grand Wagoneer is bolted to. It is the foundation that the vehicle is built on. 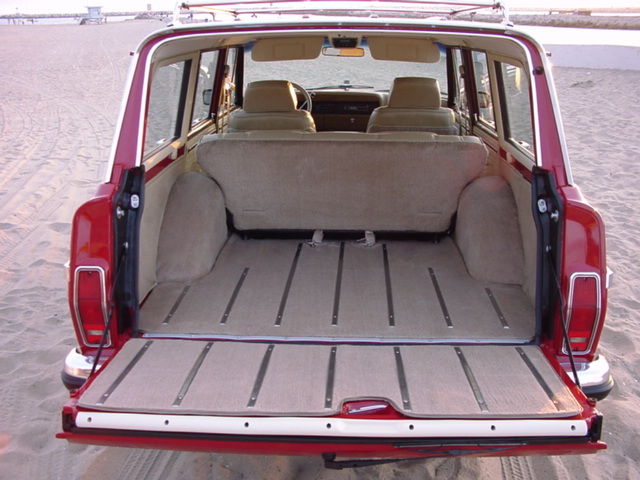 You can imagine that this super heavy duty steel “cage” is like a protective shield that surrounds the passenger seating area and can greatly mitigate or minimalize the chance and degree of injury to the driver or passengers during front, rear and especially, side impacts between the Grand Wagoneer and other automobiles. 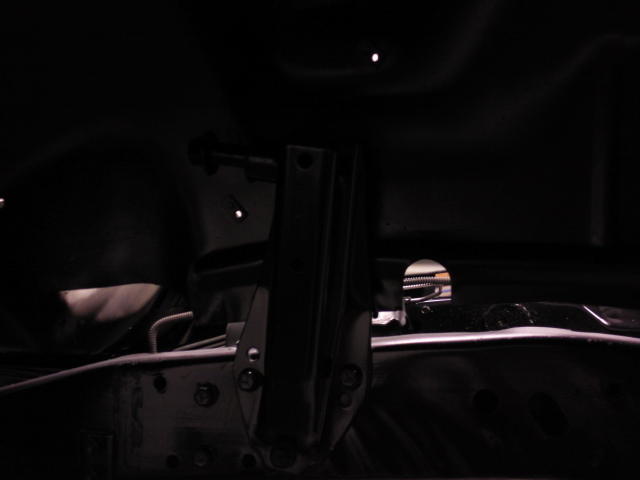 Although this photo is poorly lit and does not show the entire frame, axel tubes and leaf springs, you can see how low the bulk of the weight of the frame is (the thick, black metal sections you see in the photo). 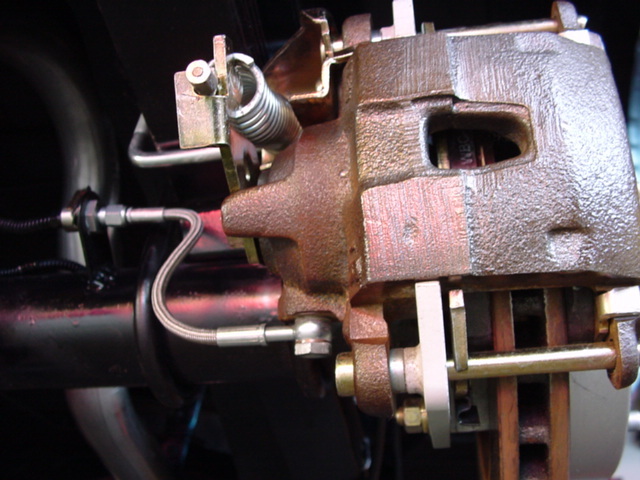 In fact, the frame, axels and leaf springs are substantially below the center of mass of the motor. 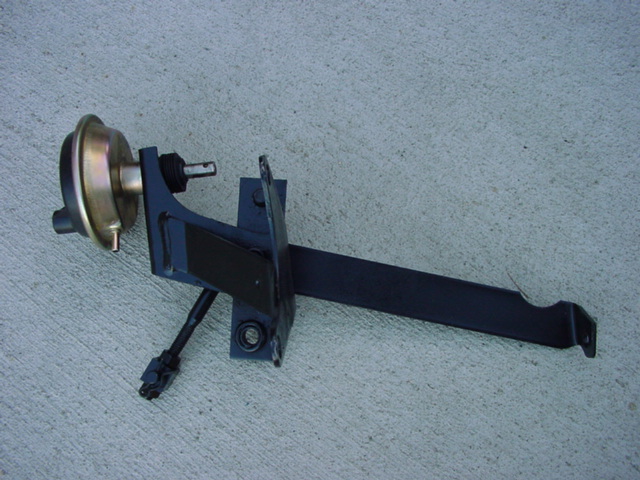 Here are some photos of the other, very heavy components of the Grand Wagoneer’s design that also help to stiffen the frame and contribute to the low center of gravity that gives the Grand Wagoneer very good roll over resistance compared to other modern SUVs. 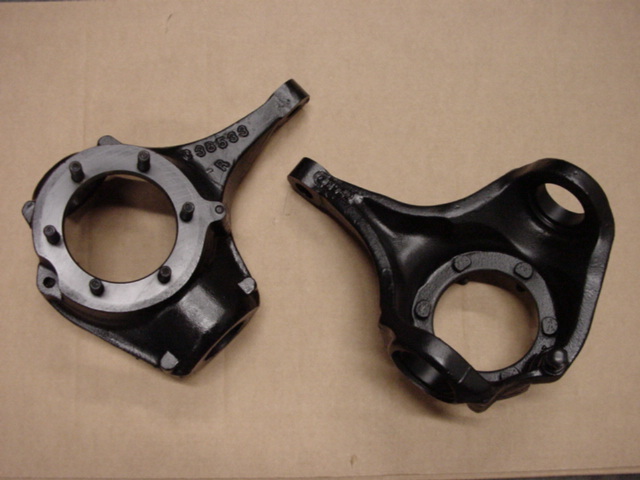 On the left you can see one of the massive fixed axel assemblies (the front axel), which contains the differential. An equally super-heavy, massive axel sits low between the rear wheels. 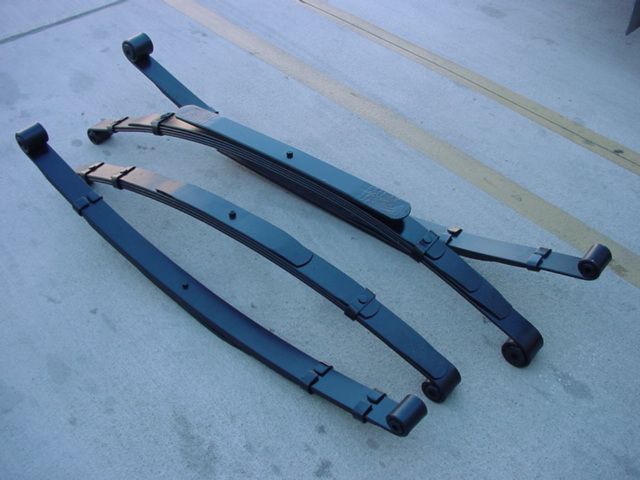 On the right you see the thick, solid steel leaf springs that are absent on modern SUVs. 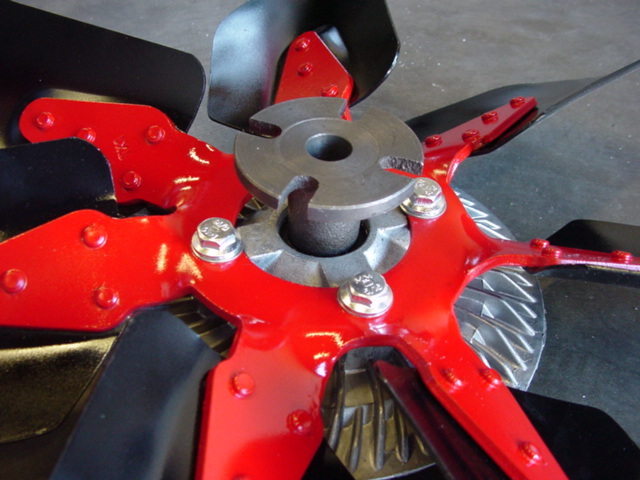 These components alone put over 600 lbs of weight within a foot of the ground. 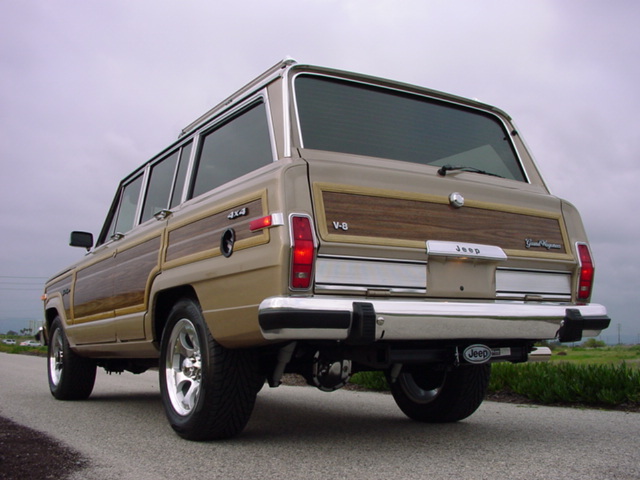 Add the massive frame weight to that total and you have a significant percentage of the Grand Wagoneer’s total weight very close to the road surface, producing a significantly lower center of gravity than almost any modern SUV on the road. This center of gravity not only offers better off-road performance, better weight distribution during cornering and aggressive handling, but, most importantly, better roll over protection! But What about Fuel Economy? 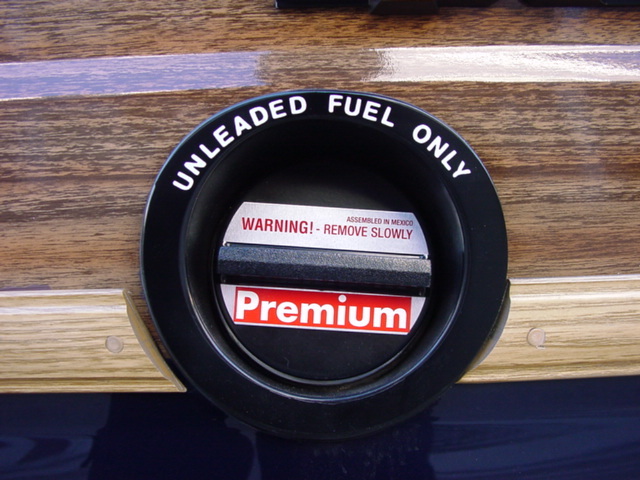 A quick note about fuel economy and gas prices: Many folks fret and worry that their new “woody” will be a bit of a gas glutton and will cost them too much at the pump. To this let me say that not only do fuel injected Grand Wagoneers get similar mileage to many modern SUVs of similar weight that were just built a year or two ago, but, more importantly, fuel economy is only a minor factor in the overall ownership cost of a vehicle! Let me provide an example. 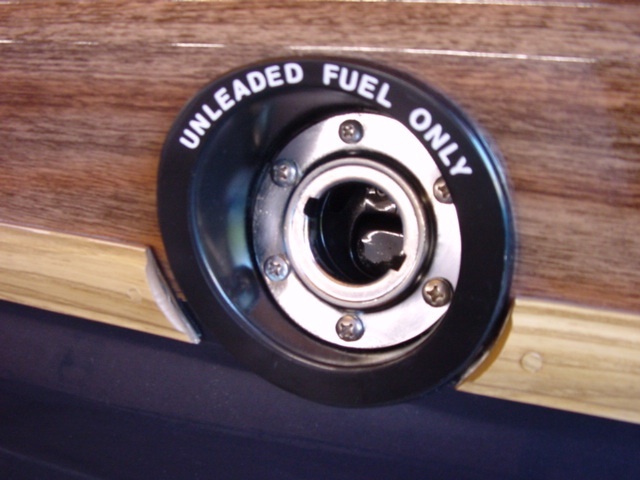 Let’s say you plan on driving your new Grand Wagoneer 5000 miles per year (if you have another car for commuting or have a short commute), regular unleaded costs $3.00 per gallon and your new fuel injected Jeep gets just 13 miles to the gallon (during normal driving and after the motor and drivetrain are over their break-in period). That would come out to an annual fuel expense of $1153 per year. If you purchase a modern, newly designed SUV that looks like every other vehicle on the road, has no style or panache, has no exclusive status, but gets a seemingly much better 18 miles per gallon, you will spend exactly $833 per year on gas. 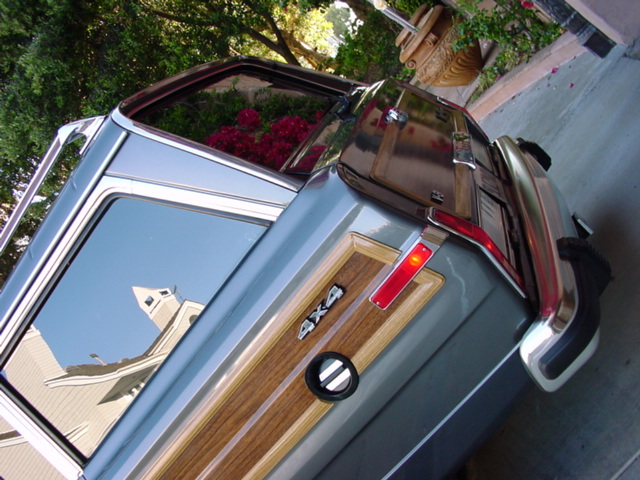 So the difference in cost between being able to drive a unique, eminently stylish, ultra distinctive and stunningly beautiful Grand Wagoneer and driving a new tin-metal, dime-a-dozen “econo-SUV” is only $350 per year!! 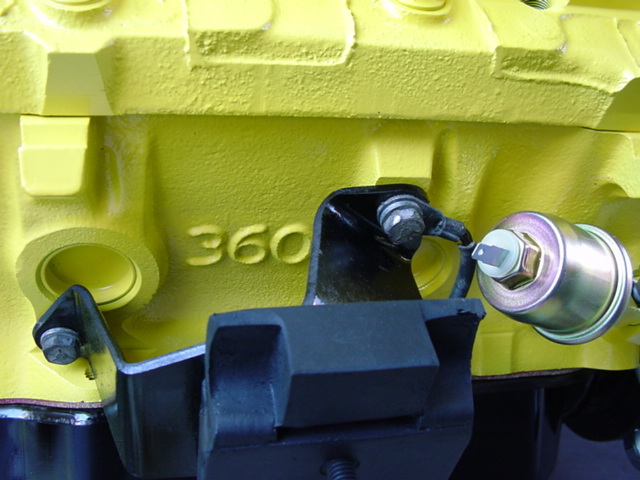 Okay, I know you are thinking, $350 is $350….that’s nothing to laugh at. I agree, until you factor in the far higher registration costs, road taxes, insurance and dealer only parts and service that the new “economy” SUV requires! 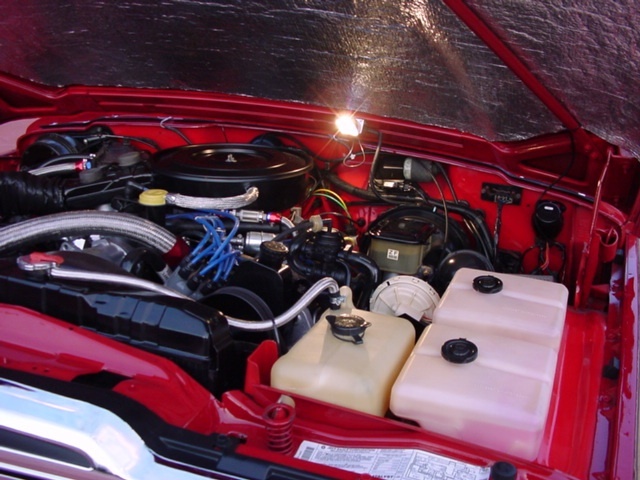 Once taking these factors into consideration, depending on the state you live in, your so-called “inefficient” Jeep can actually cost you thousands of dollars less than a new, far more fuel efficient, smaller and BORING SUV. To give you an example of the fuel economy of some of the brand new, modern, but very bland and SMALL (much smaller and lighter than a Grand Wagoneer) SUVs, the following models have a rated fuel economy of 18mpg that I used in the example above: Hyundai Tucson, Kia Sportage, Chevy Equinox, Pontiac Torrent and the Suzuki Grand Vitera. All of these vehicles are much smaller and have far less “utlility” than a Grand Wagoneer and some can only be seen as mid sized passenger cars with a slight suspension lift. 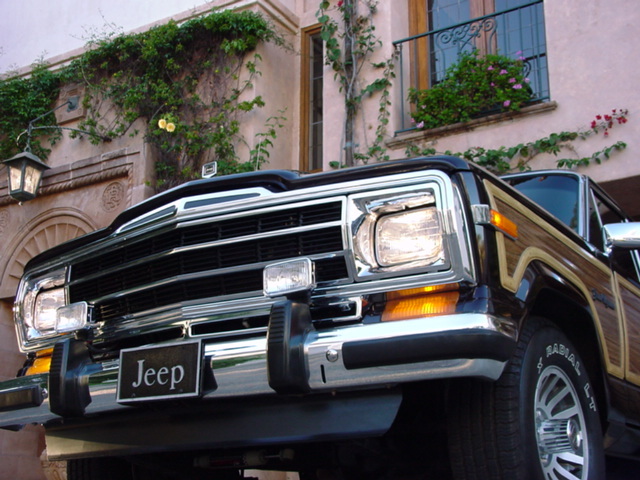 The modern FULL SIZED SUVs that are more comparable to the Grand Wagoneer have far lower average mileage ratings and are much closer in fuel efficiency to the Grand Wagoneer: Chevy Tahoe V8 (14mpg); Ford Explorer V8 (14mpg); GMC Yukon (14mpg); Mercury Mountaineer (14mpg); the mid sized Landrover LR3 (13mpg); the Jeep Commander (13mpg); both the Ford Durango and Ford Expedition (13mpg); Chrysler Aspen (13mpg); Nissan Armada (13mpg) and the Cadillac Escalade (13mpg). Then there are the modern gas-guzzlers like the Hummer H2 with an average rating of 9mpg. 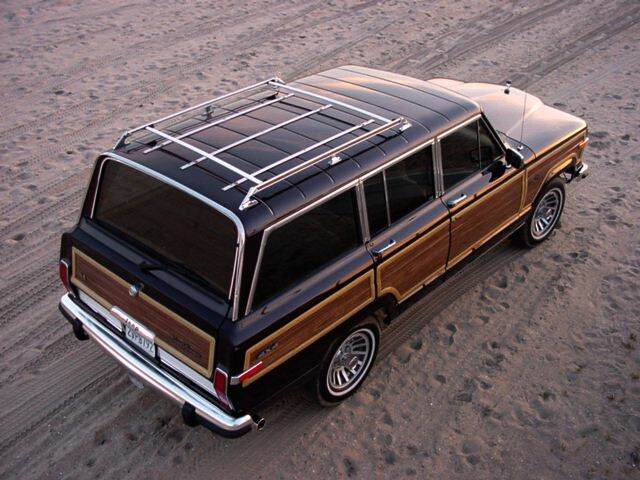 Grand Wagoneer is the One! Classic, beautiful appearance; fully loaded with luxury features; upgraded at www.grandwagoneer.com with all of the modern bells and whistles; ultra-smooth and comfortable ride; versatile go-anywhere performance; superior safety; luxury car status; inexpensive to maintain and operate; and true exclusivity.....for all of these reasons, a fully professionally restored Jeep Grand Wagoneer is not only the ultimate SUV, but also a wise and “sensible” purchase. 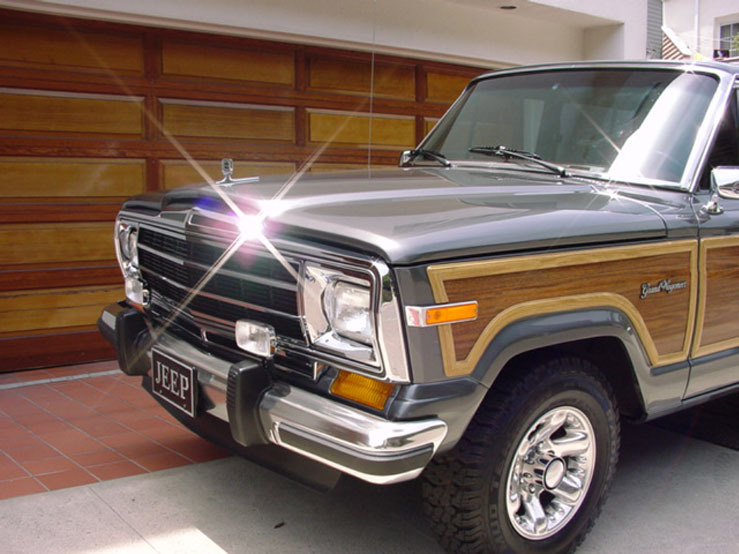 If you are a true Jeep aficionado, can recognize exceptional quality, and can appreciate meticulous, painstaking professional restoration then you have found the Wagoneer you're looking for. 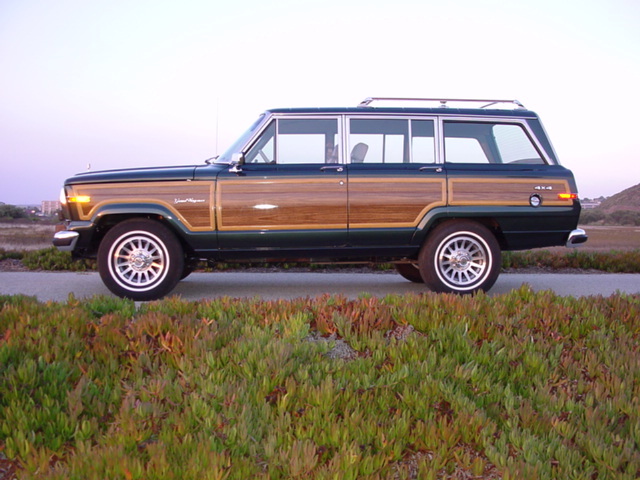 Our Jeeps represent a wonderful opportunity for those among you who love Wagoneers, would really, REALLY love to buy and own one, but don't want an old, "used" Grand Wagoneer with all of its original design flaws, and the lack of reliability and cosmetic flaws that come with a 19+ year old car. You want a new one, that looks flawless, is durable, reliable and gives you all of the luxury amenities of a modern SUV!! All of my Jeeps are as cosmetically close to a new one that you will likely ever see, and have had the original design flaws and weaknesses addressed. They have also been modernized and have been given the power and performance that a large displacement V8 should have had from the factory! 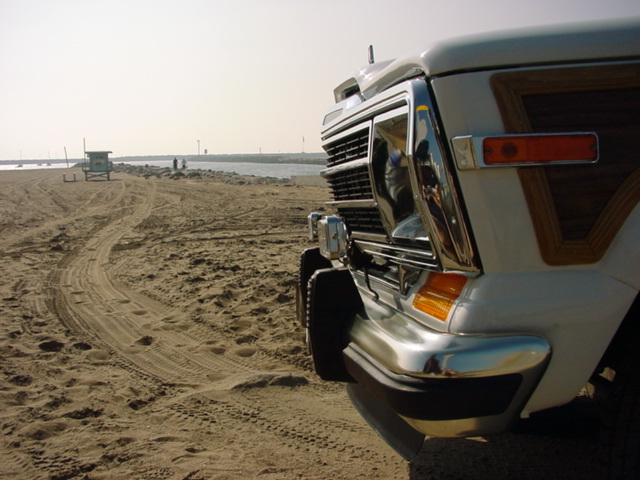 My Grand Wagoneers have had ALL of the cosmetic and mechanical work necessary to bring a used Wagoneer up to "like brand new" condition, drivability, reliability and performance already completed for you. 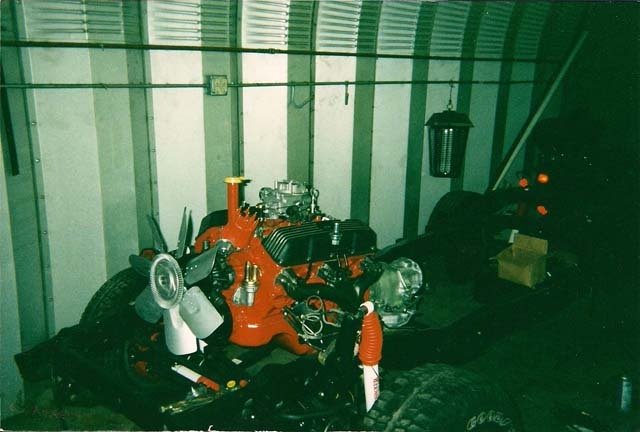 If a normal person were to attempt to undertake this level of restoration on their own, it would cost between $90,000 and $120,000 (dealer or professional shop prices) PLUS the price of the original, clean, well-maintained Jeep, in addition to ALOT of stress and a year or two of personal involvement and time. 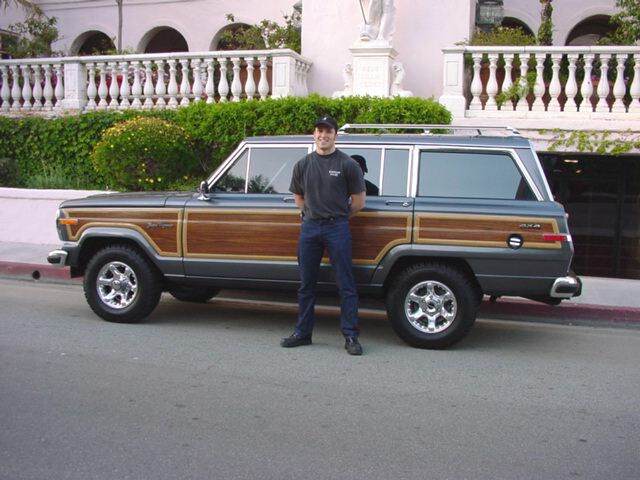 And, it would still be highly unlikely that you would ever be able to end up with a Grand Wagoneer of the quality level that I, after almost 23 years of experience working only on Grand Wagoneers, can produce. For me, performing full, frame-up restorations of what I consider to be the most beautiful automobile ever made, is a way to express my continuing love for these wonderful, classic vehicles that are an indelible part of American Automotive History!! 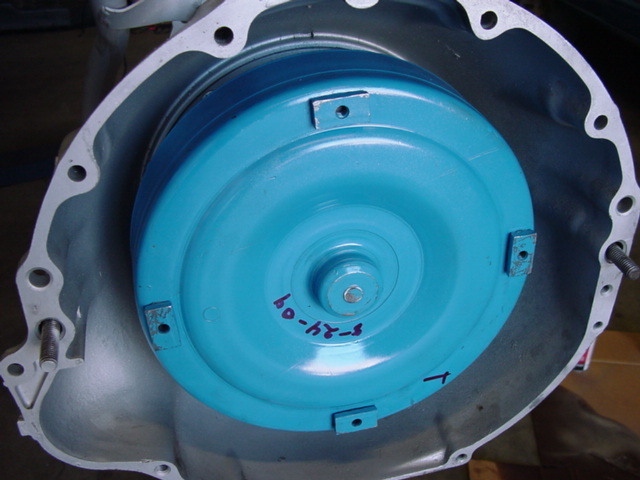 Of course, as I mentioned so many times on this website, it is important to keep in mind that restorations of this quality level, and that are this complete, cannot be build anywhere else, and will never be available again, because the necessary cosmetic parts and components are simply no longer available. The fact that these restorations are irreplaceable should also be a major factor in value retention and potential future appreciation. 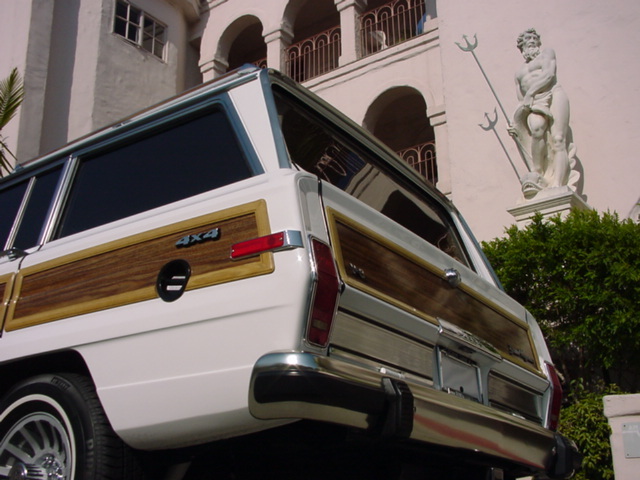 What makes a www.GrandWagoneer.com ultra- restoration a one-in-a-million Supercar? 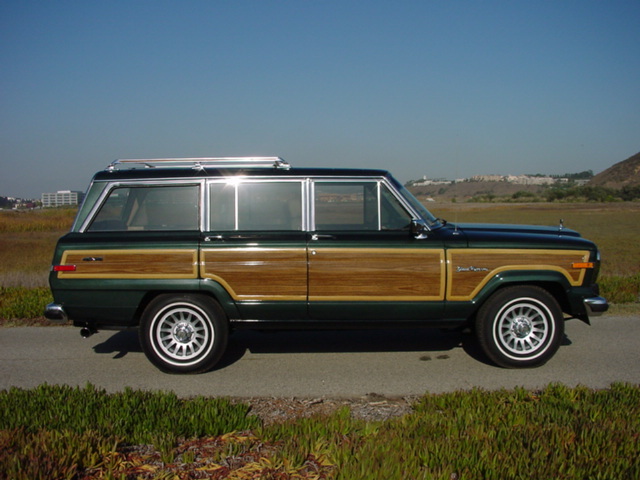 Environmentally Responsible and “Green” All www.grandwagoneer.com Jeeps are upgraded to efficient and clean fuel injection, more efficient ignition systems, simpler and more reliable emissions control systems, brand new high efficiency catalysts and exhaust systems, and brand new modern engine control sensors. 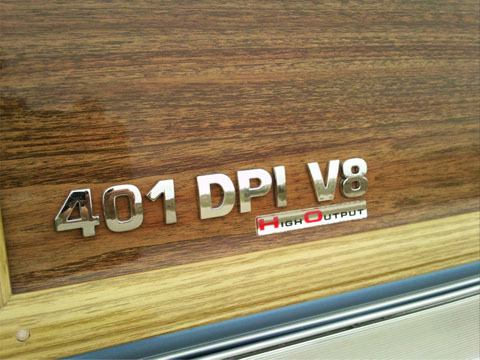 These changes result in a radical reduction in emissions, up to 6x the efficiency, and significantly improved fuel economy compared to the original design, providing verifiably guilt-free enjoyment of our wonderful and beloved "woodies"
100% ALL-AMERICAN! Seldom has it been so pleasureable and rewarding to be patriotic and support U.S. manufacturing than to drive one of the all time greatest Icons of the golden age of American automotive design! 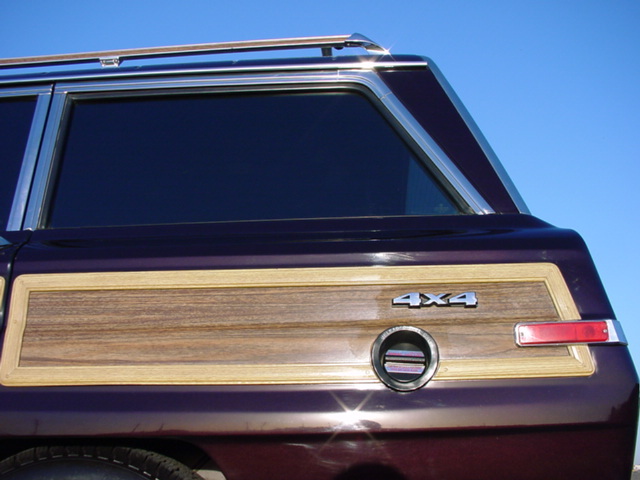 If you would like occasional (a few times yearly) updates on available inventory and pricing, special promotions and breaking Grand Wagoneer news, or if you would simply like to participate in some email surveys that I plan to send out in order to pole Wagoneer fans on their favorite color combinations, what options and updates you would like to see added to my restorations, and how I can improve my product and service to you, please add your email to my mailing list. Also, although I do NOT currently sell any parts (please do not ask), if I ever decide to liquidate my very extensive inventory of discontinued/obsoleted parts that are no longer available anywhere else, I will send you notification of what I am selling along with prices. Anyone that signs up for this list will be notified and sales will be first-come, first-served. I will never share or sell this information and you will likely get two or fewer emails from me yearly….no SPAM, you have my word. Also, if you ever want to remove your name from my list, I will do so immediately. 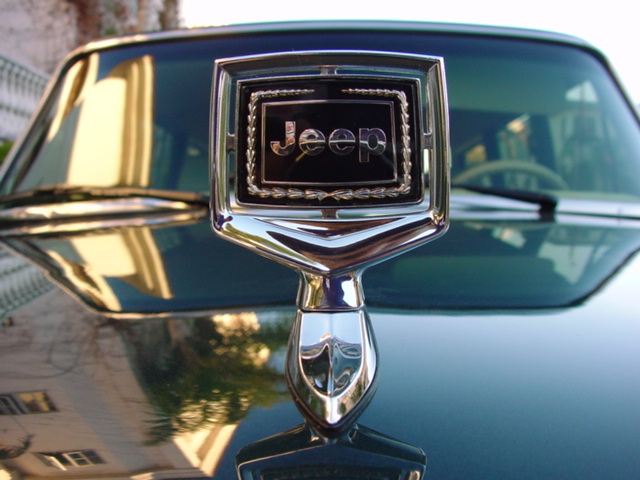 In summary, it has been my mission to produce the finest quality, full, professional, ground up restorations of Jeep Grand Wagoneers in the world, for over 15 years. 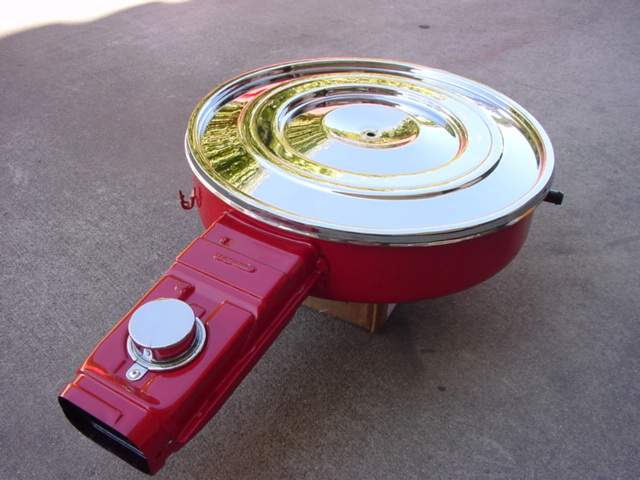 I always have several model years and color combinations in various stages of completion available. 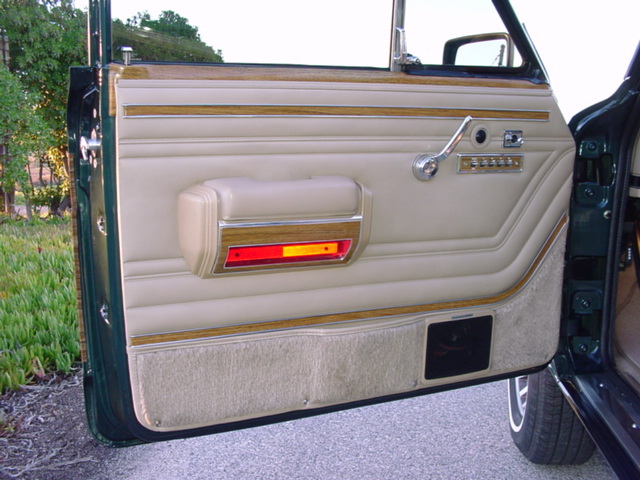 All of my Grand Wagoneers are restored to the same exacting, ultra-high-end professional standards, using the same top-quality components. 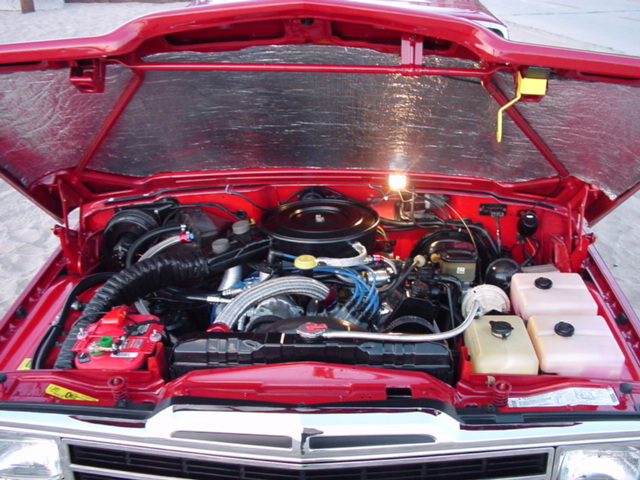 For the truly selective client, there are over 100 additional upgrades available, beyond what is listed in the mechanical and cosmetic restoration sections of this website. I rarely have a fully completed, ready-to-ship Jeep available and most of my woodys are pre-sold and contracted long before completion. Generally, the sooner you order your Jeep (in the model year and color combination that you want), the better. 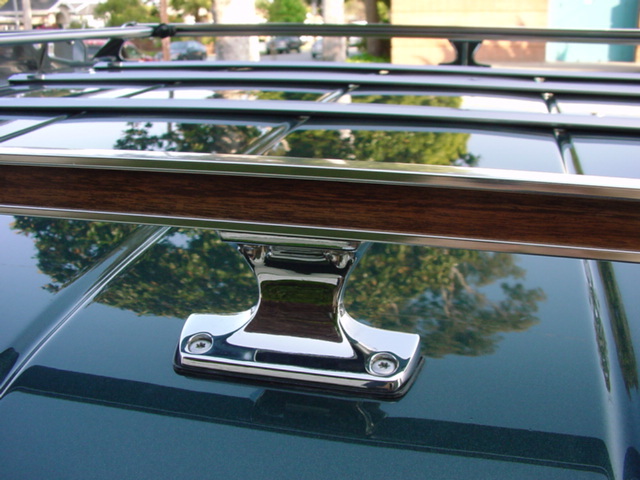 When purchasing from me, you will get the highest quality Grand Wagoneer, that is as close as possible to factory-new, available in the world, but you may have to have a bit of patience for your "dream machine" to be finished. 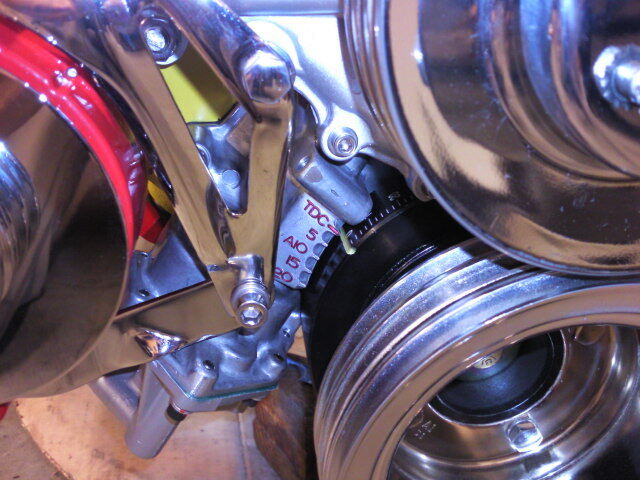 I will not cut corners and compromise quality for "rush jobs", and even when a restoration is completely "finished", I spend, on average, between two and three weeks road testing, inspecting, driving and adjusting all mechanical components prior to shipping. I can assist you in arranging insured door to door shipping at the best rates to anywhere in the US and overseas. Due to the fact that my vehicles are sold out of state and to other countries, I cannot provide a warranty to my customers, since I only have one domestic location and cannot inspect my Jeeps once they have been shipped, and cannot perform warranty work myself unless the vehicle were brought back to my shop. 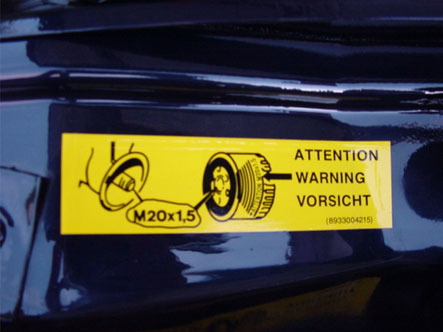 So, as with any non-local or out of state/out of the country dealer, my Jeeps are sold As-Is, with no warranties implied or given, primarily because of my inability to service and inspect Jeeps that are not local to my location. 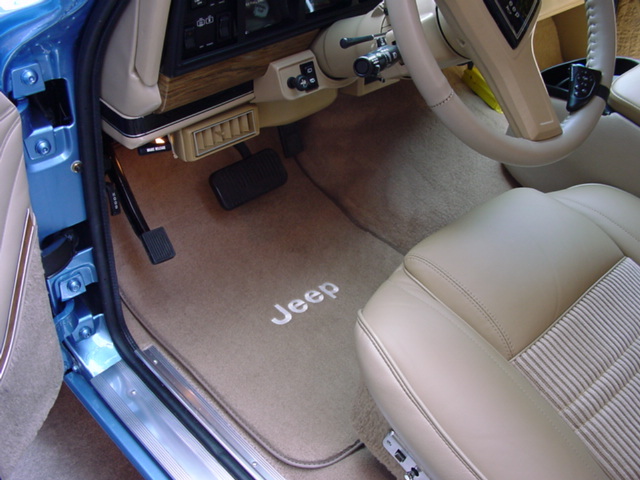 However, please rest assured that only exceptionally qualified and extremely quality-conscious Grand Wagoneer experts with many years of experience working either exclusively, or extensively on these specific vehicles, have performed the work on your Jeep. 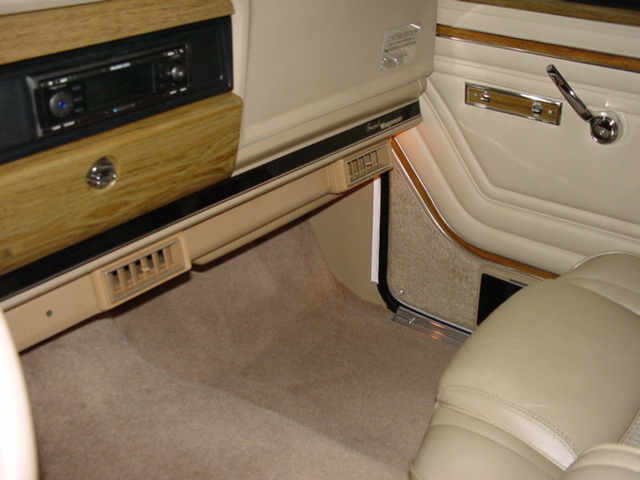 In addition, you can take comfort that each Grand Wagoneer I produce has been equipped with the best parts money can buy. 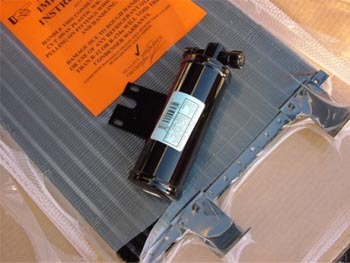 For those US customers that, for additional peace of mind alone, are interested in a warranty, I can recommend or arrange for the purchase of a national aftermarket warranty, that will cover repairs in any state in the US, at any qualified repair facility of your choice. 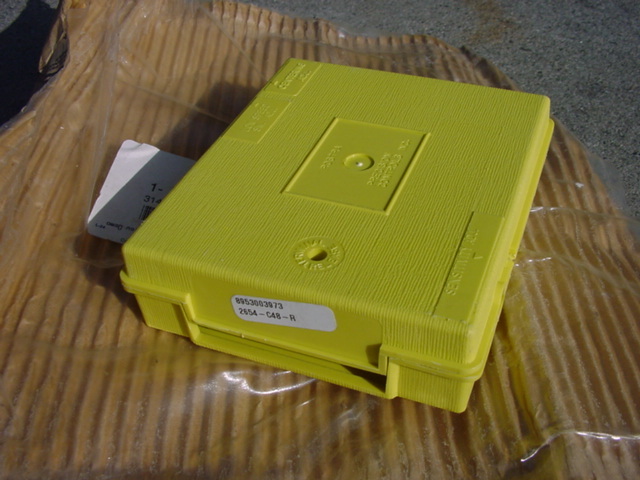 These are the same inexpensive warranties offered by other retailers and dealers. If you have any further questions, please do not hesitate to send me a quick email at the above address. I will be more than happy to help you further. 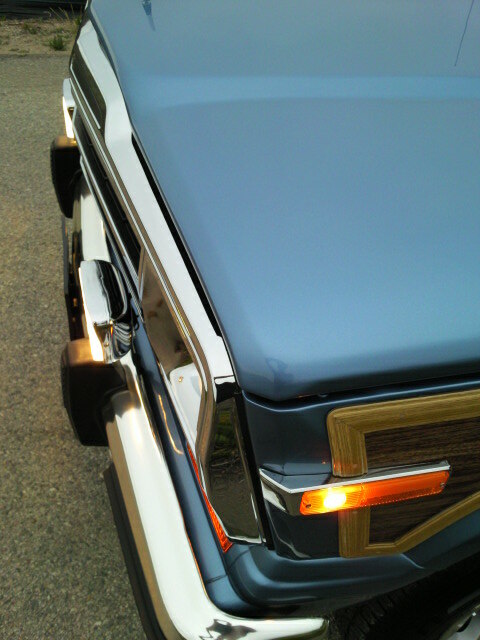 I also BUY high quality, clean, 100% rust free 1991 model year Wagoneers (clear title only!) with good wood borders. If you have a cosmetically well maintained Grand Wagoneer with a completely rust free frame and chassis with outstanding wood borders (not faded, rippled, lifting, damaged, etc) RUNNING OR NOT, or has major mechanical problems, I can offer you the best price to purchase it. 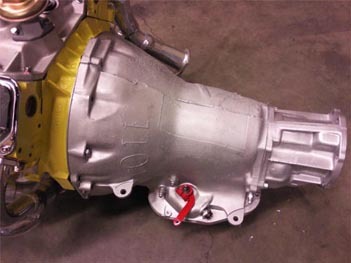 Since I perform complete mechanical restorations and install new drivetrains and mechanical components, I can pay you a higher price than anyone else for your non-running Grand Wagoneer with motor/transmission/transfer case problems. 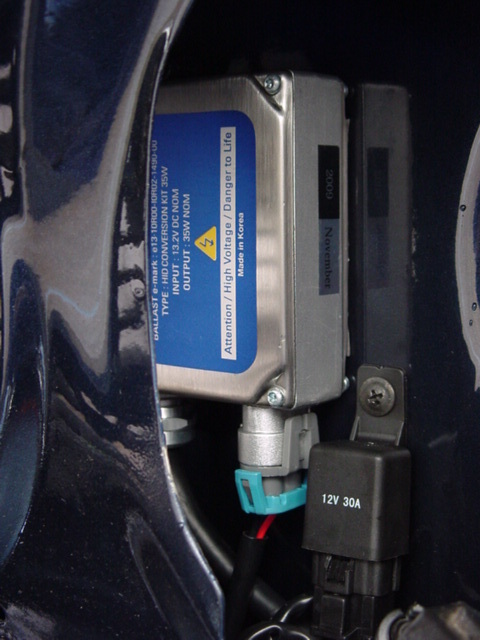 Please email your vehicle information for a purchase quote. 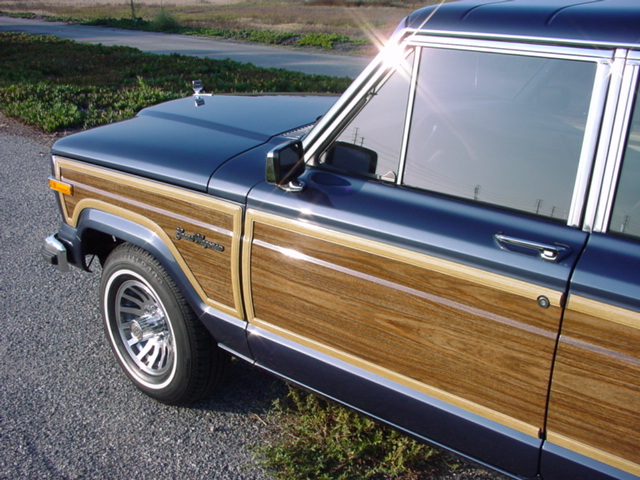 I do also purchase earlier model year Wagoneers (1986-1991) if they have absolutely no rust, have outstanding wood borders and a clean, accident frame body and frame (small dents are OK). Again, they do not have to be in running condition. There are now several hundred parts that are critical to a full restoration that are obsolete, sold-out and no longer available anywhere. I get a large number of part request emails weekly. 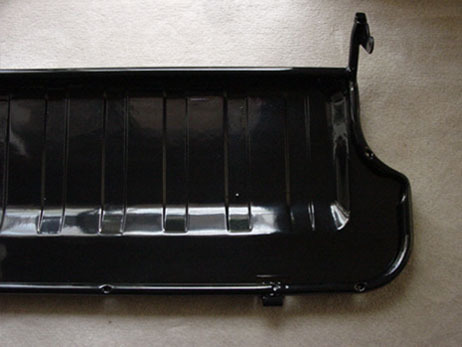 If you can’t find it from the Grand Wagoneer parts retailers on the web, I can’t sell it to you. I need all of the parts in my extensive inventory for my own restorations and to service my existing and past customers. 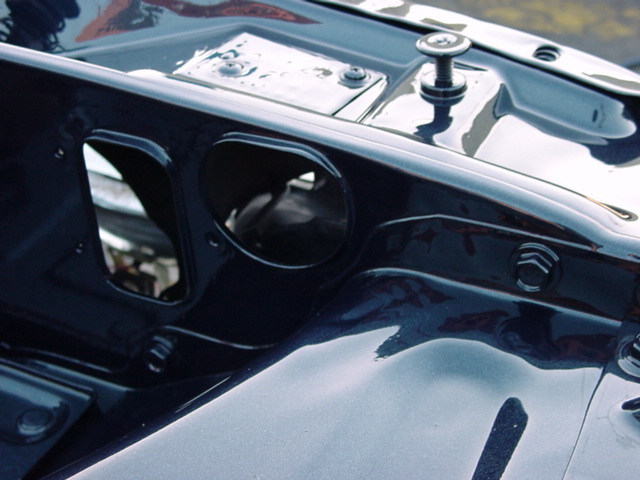 All of the parts that I do not use in my own restorations will be kept for my existing full-restoration clients so that I can provide them with the replacement parts that no one on earth has, for many years to come. 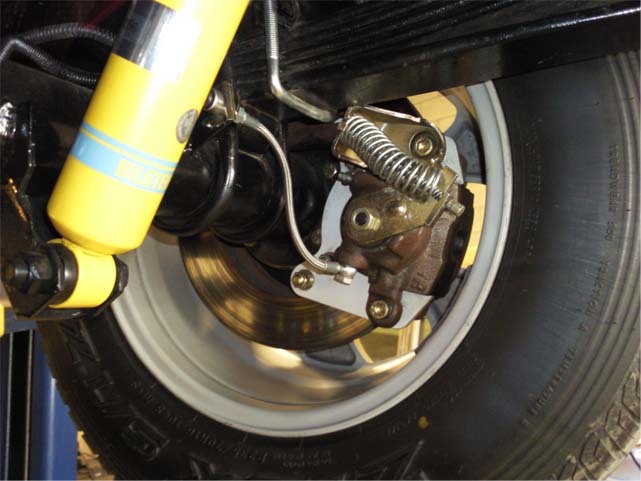 *All of my Jeeps include the "standard upgrades" listed in the "STANDARD CONVENIENCE/COMFORT/SOUND UPGRADES" section of the website (along with all of the work listed in the Mechanical Restoration/ Cosmetic Restoration/ Interior Restoration sections of the website). The other non-standard performance and convenience upgrades, listed near the top of the page, are available at an additional charge. There are also several dozen more options that are available, that are not listed on this website. Please inquire for a complete listing. Question : What improvements or modern features would you most like to see made available? 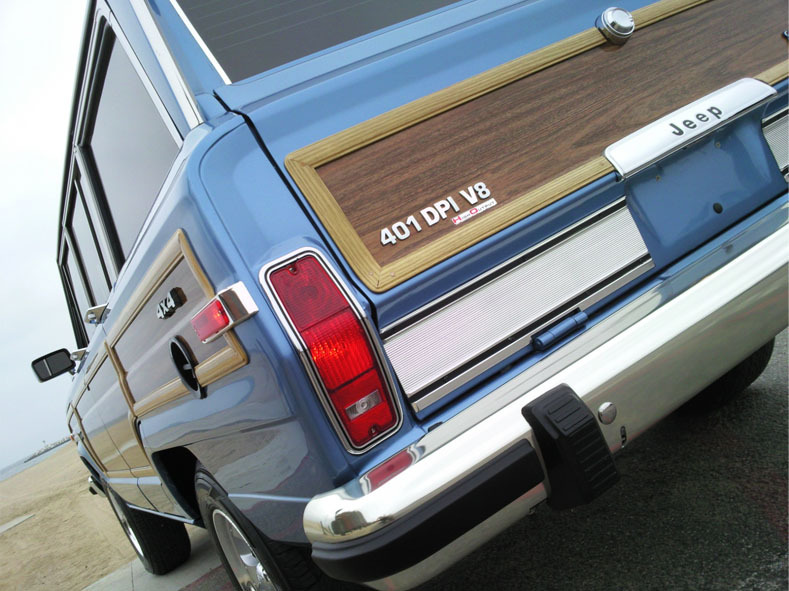 Previous Survey Question : What is your favorite color combination for the Grand Wagoneer?